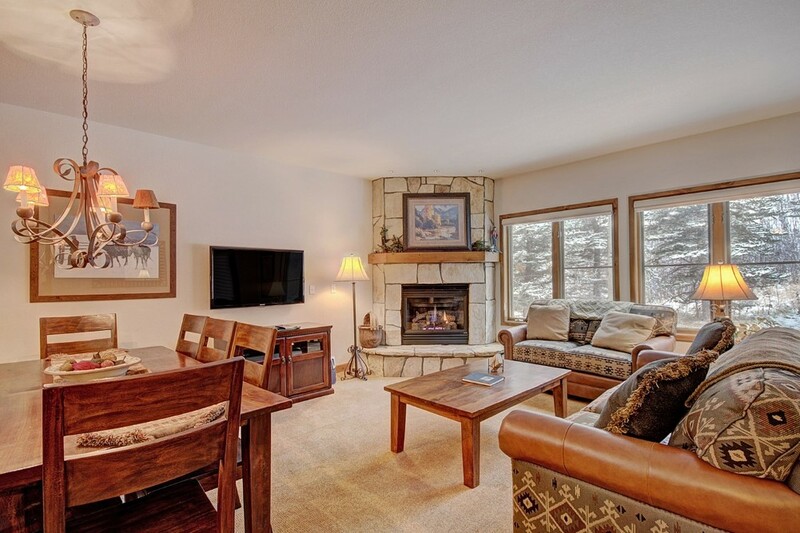 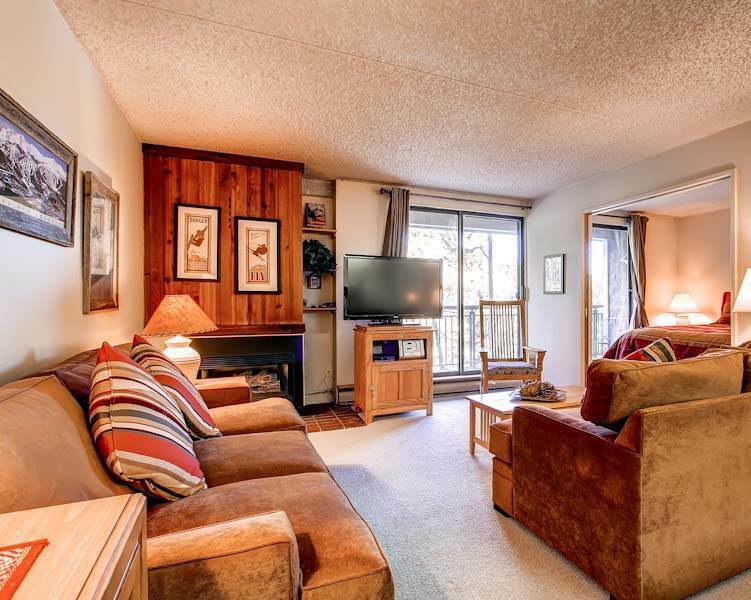 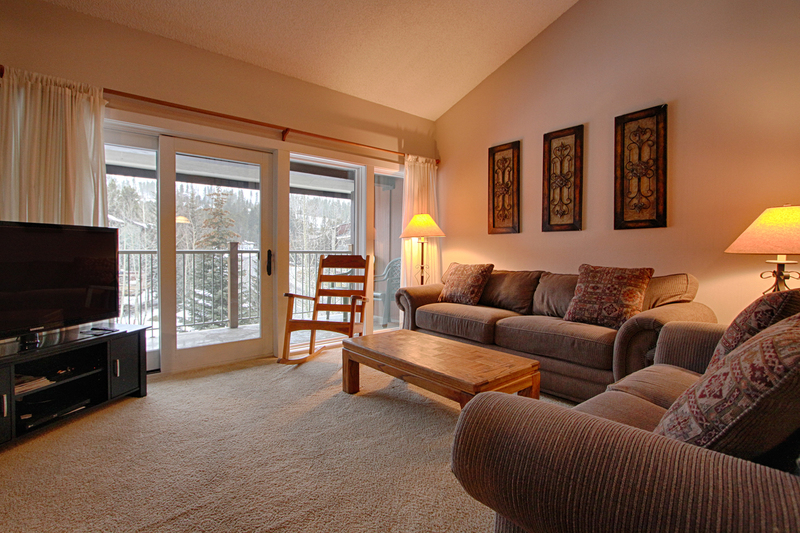 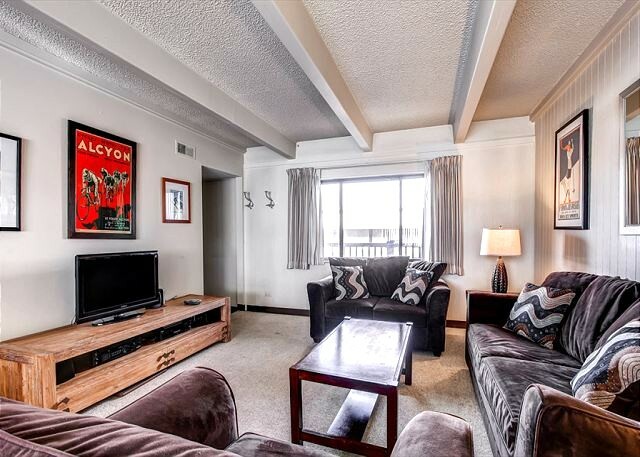 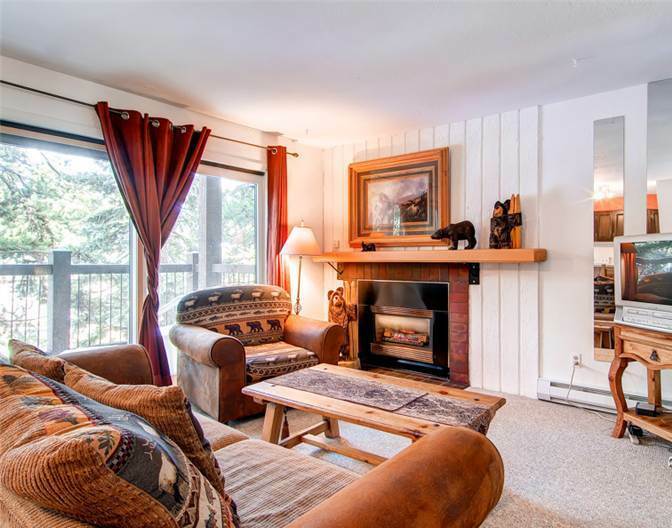 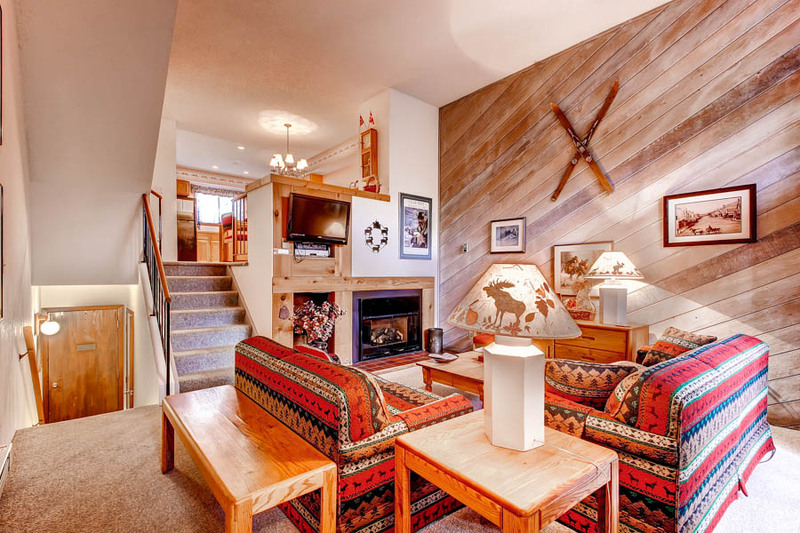 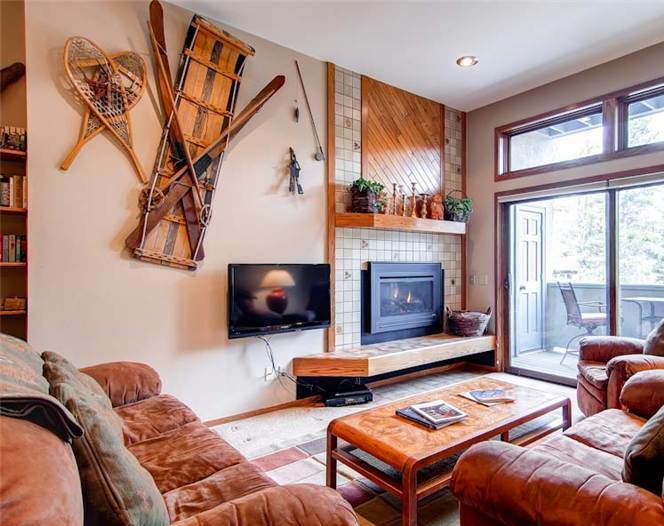 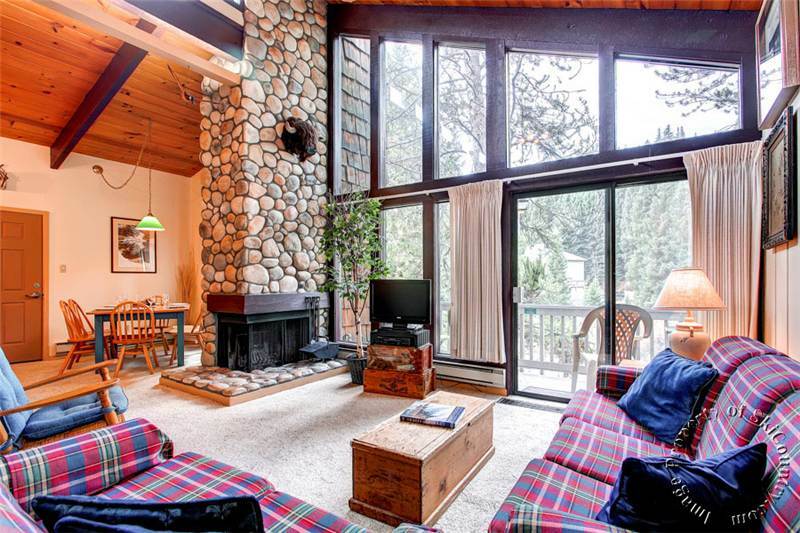 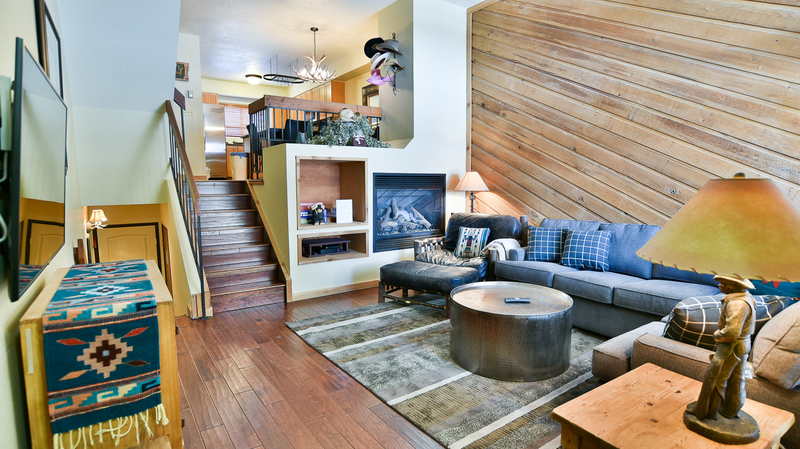 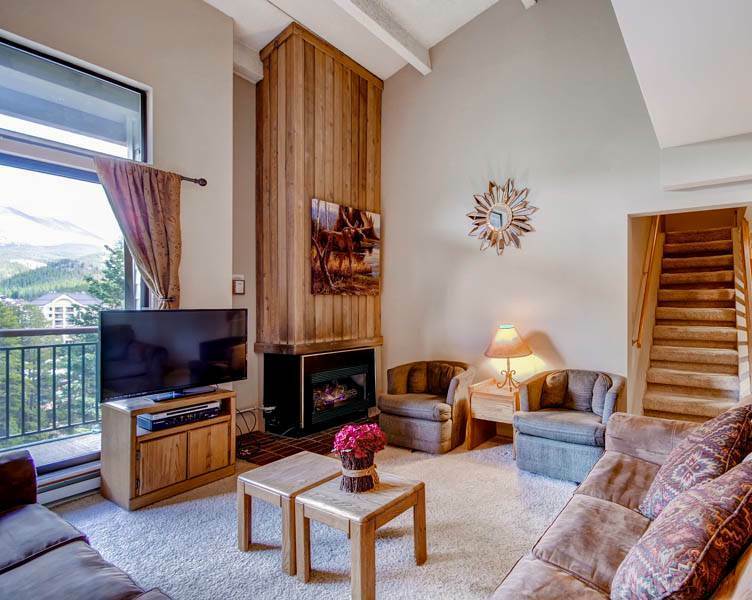 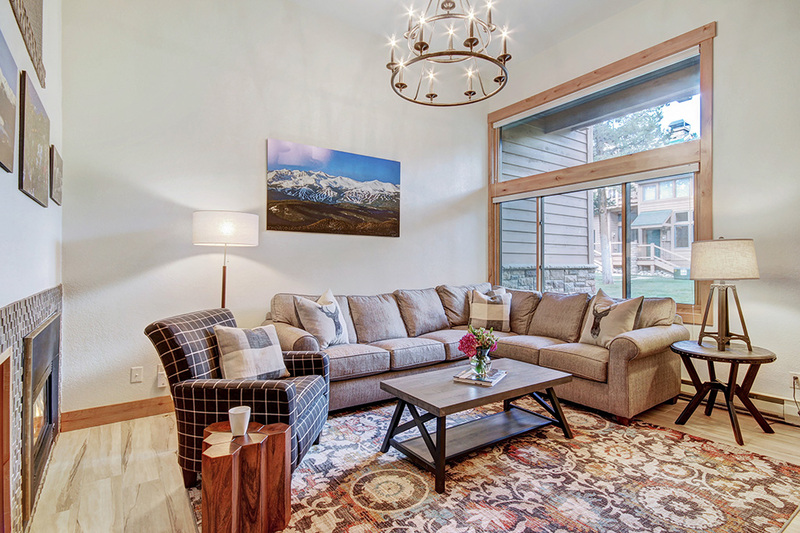 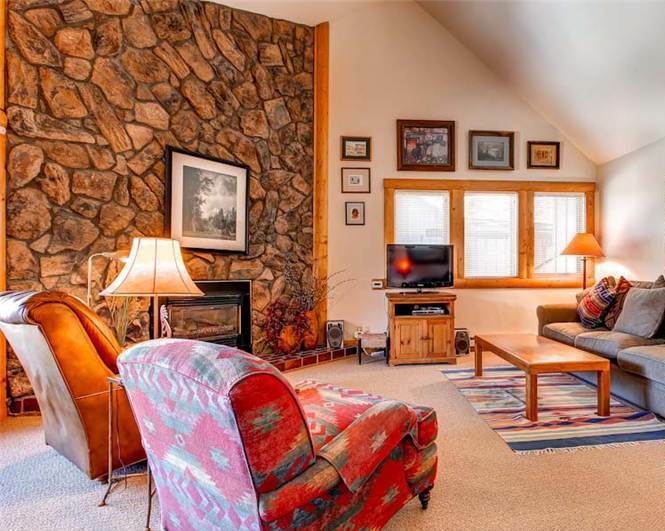 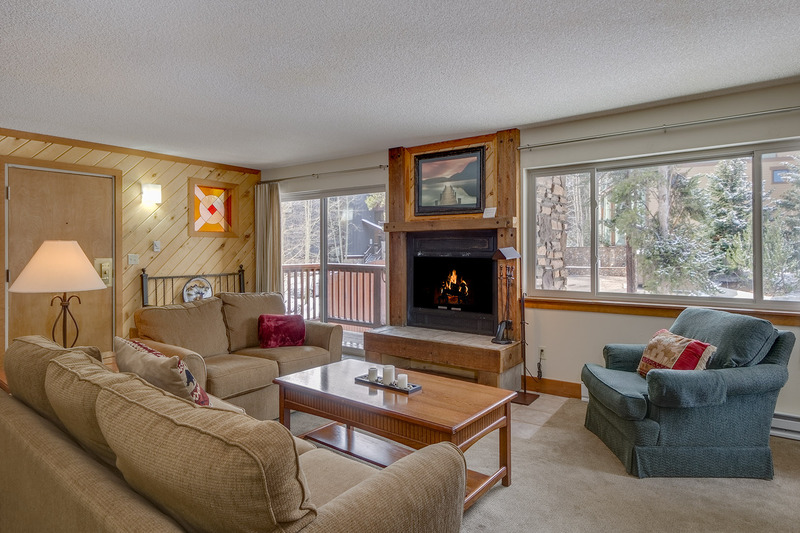 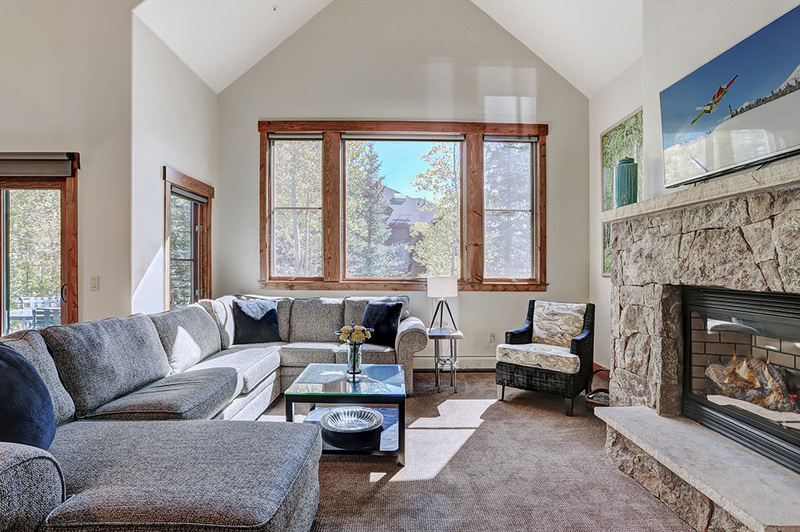 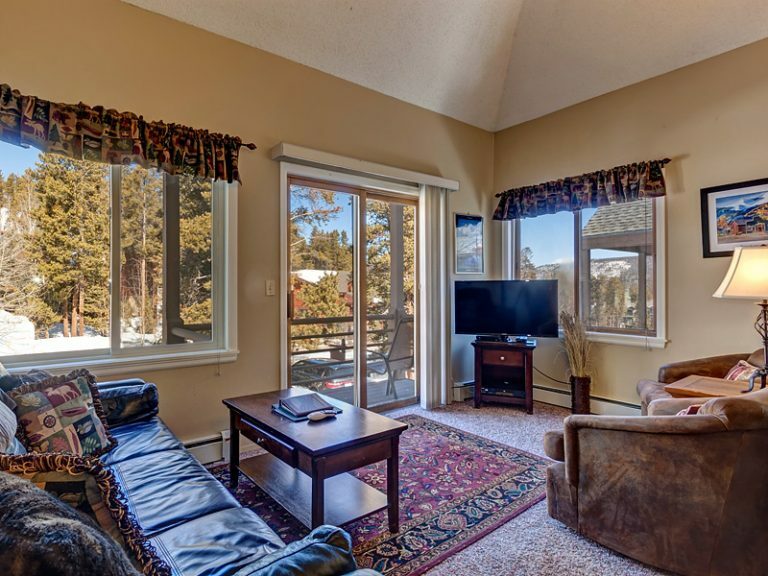 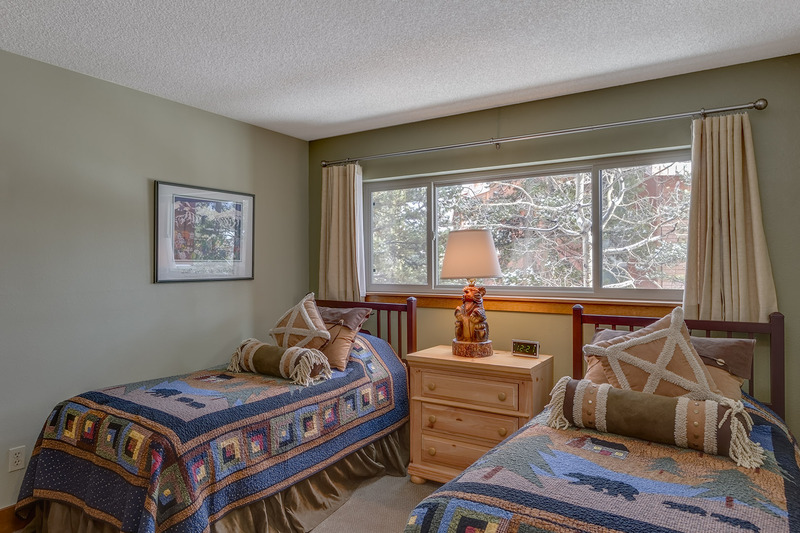 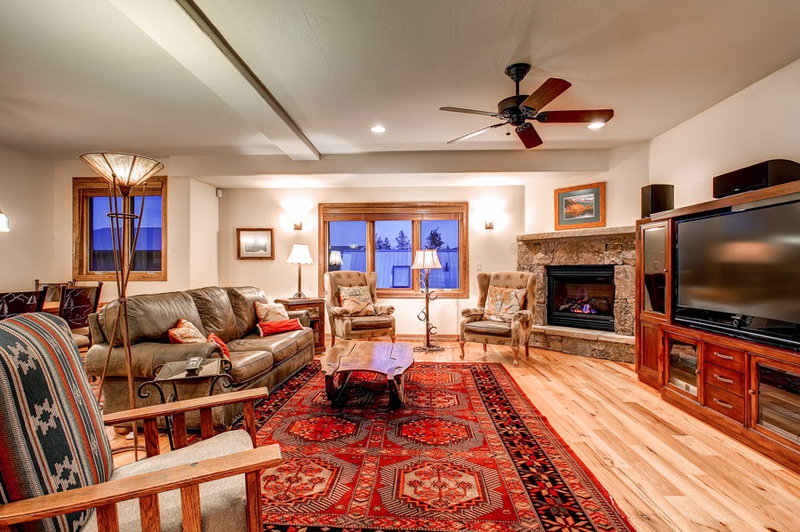 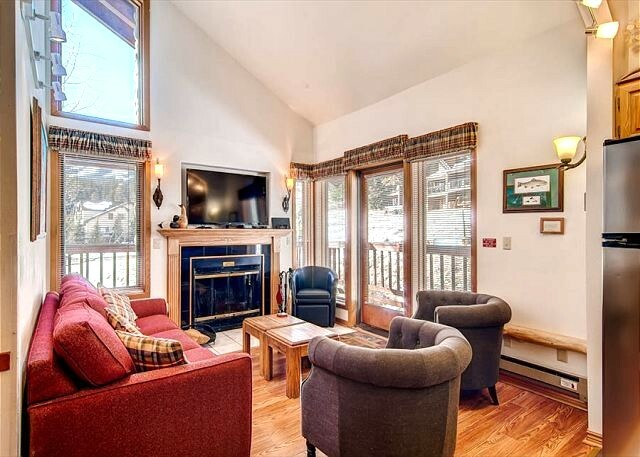 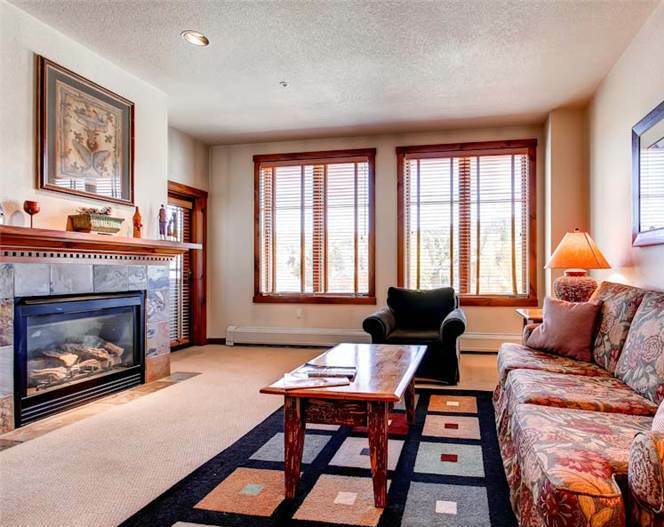 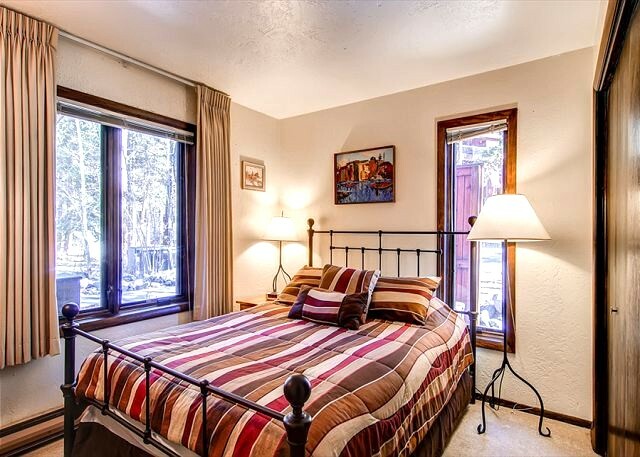 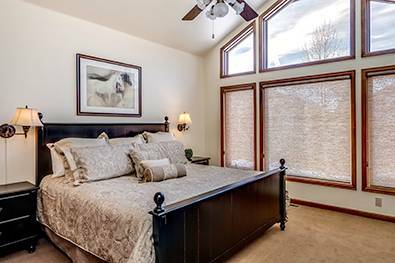 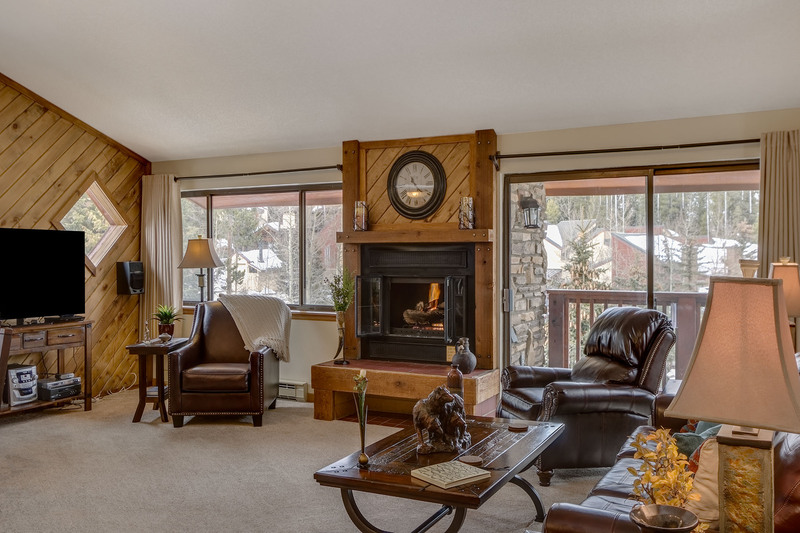 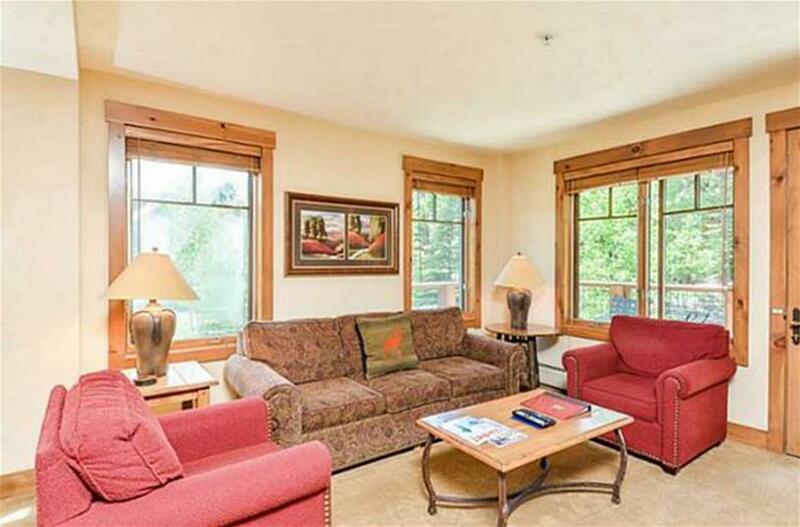 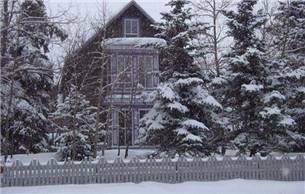 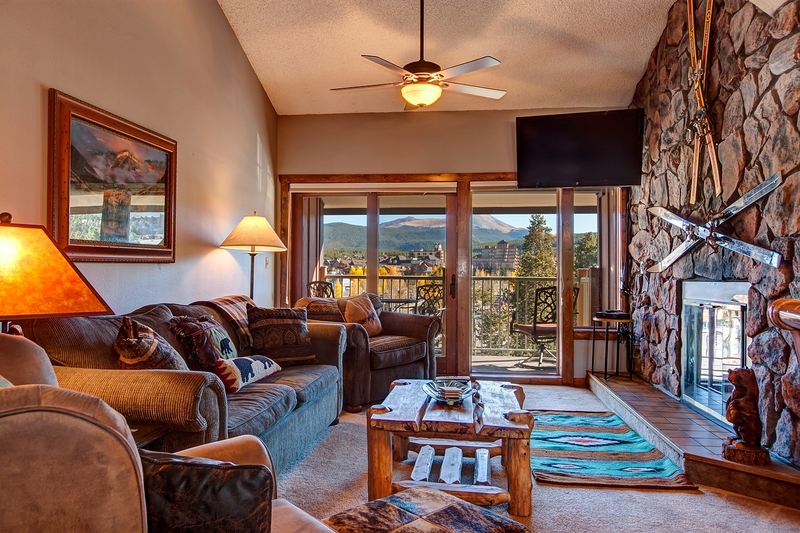 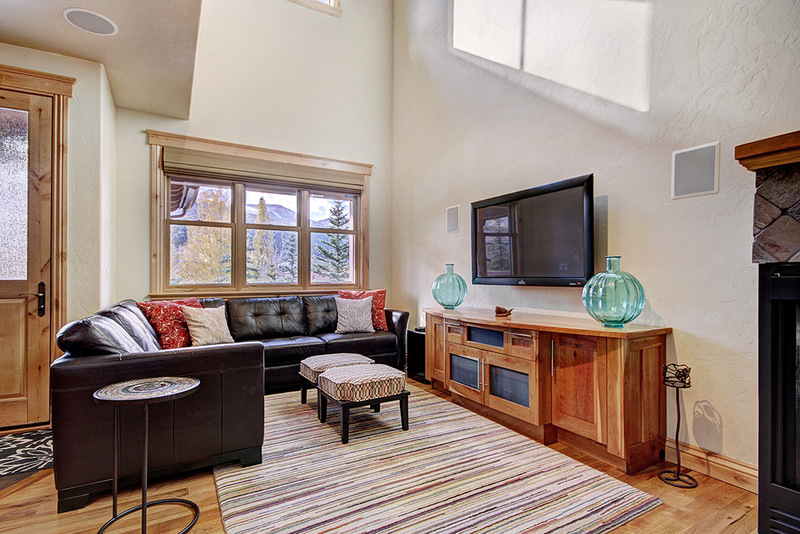 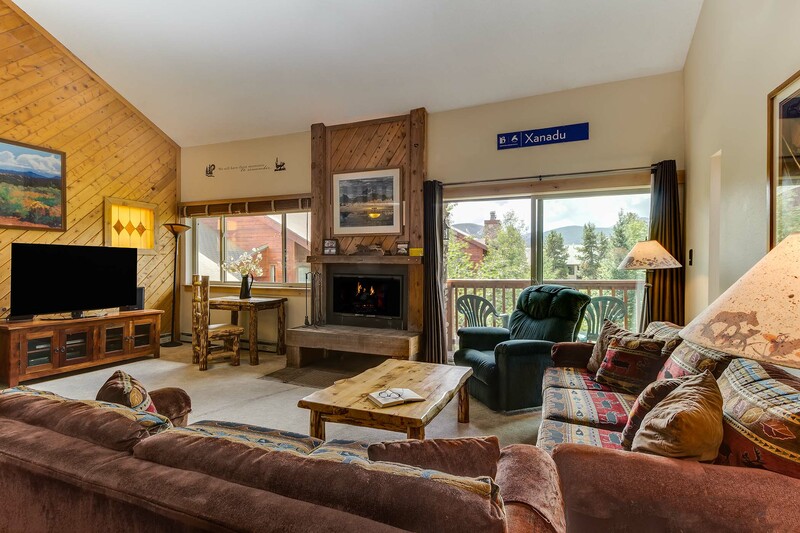 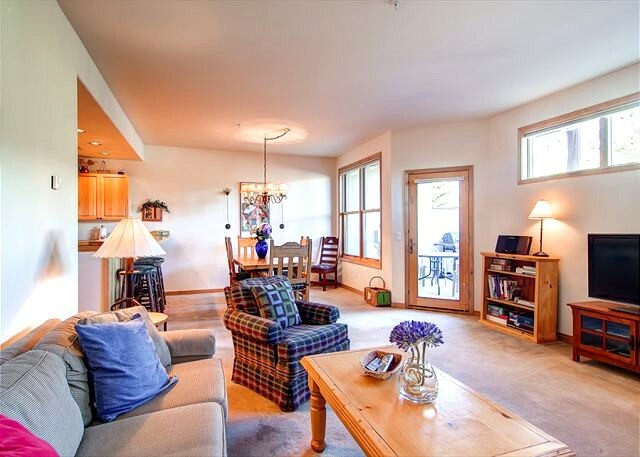 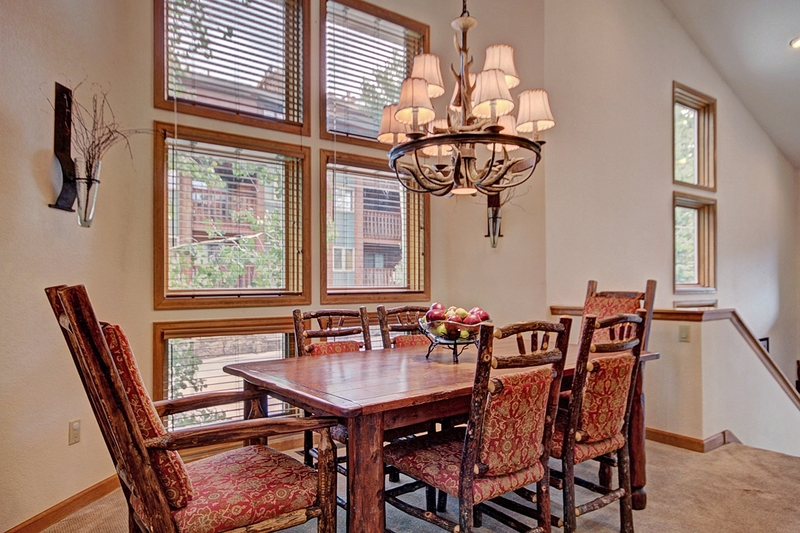 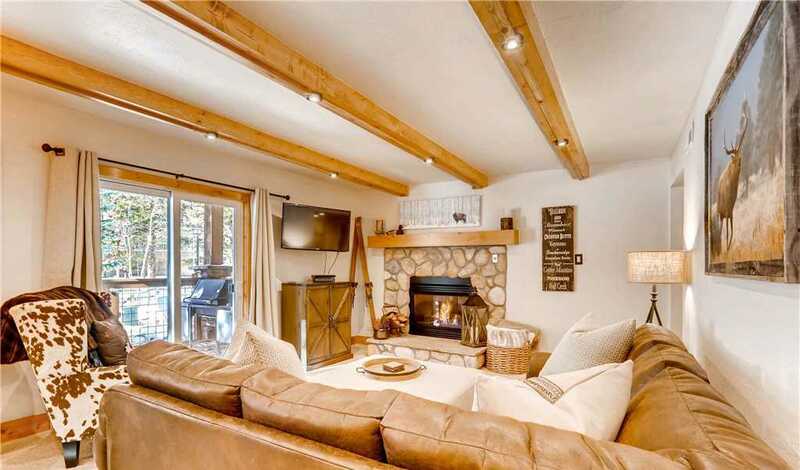 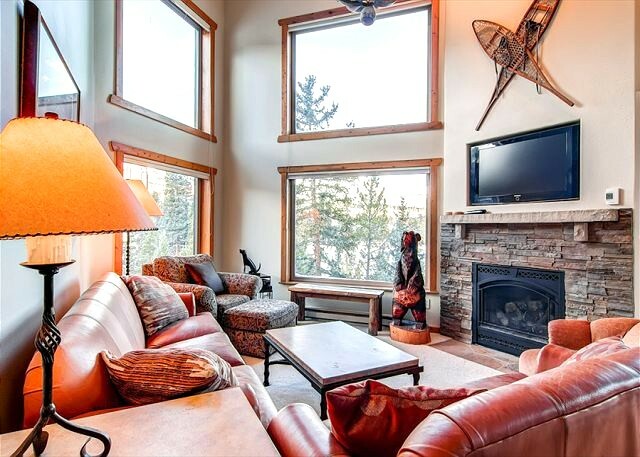 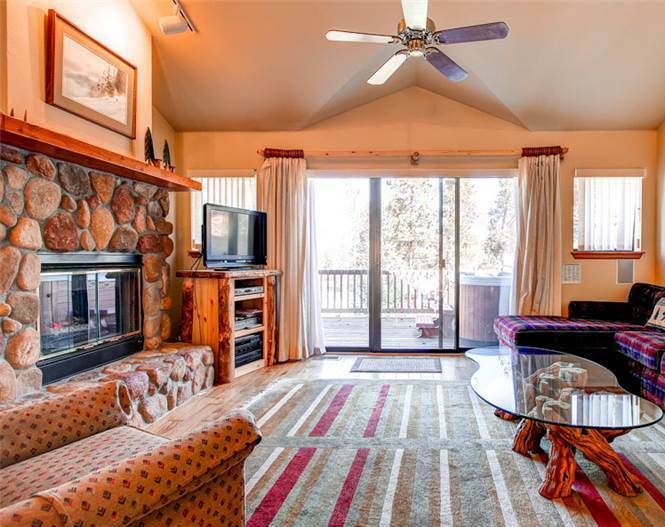 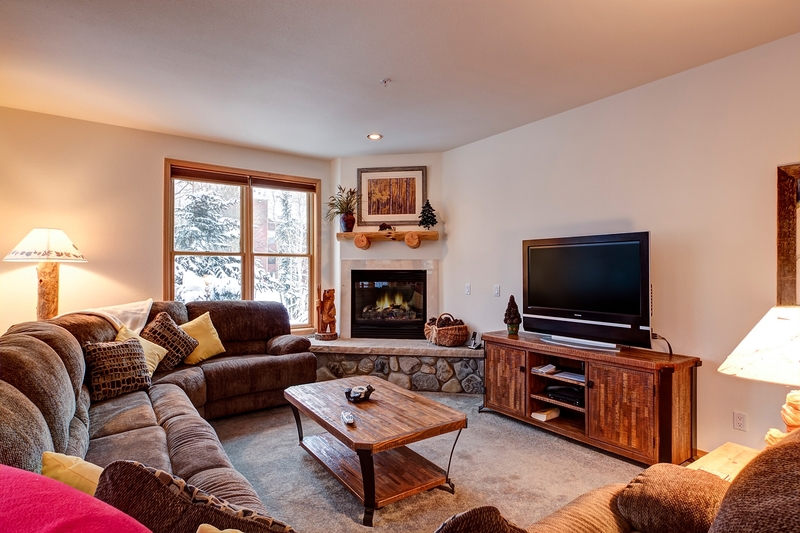 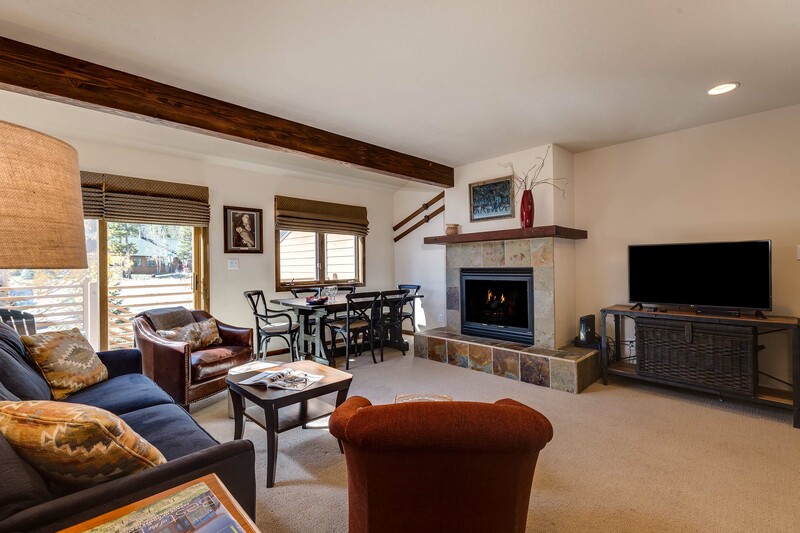 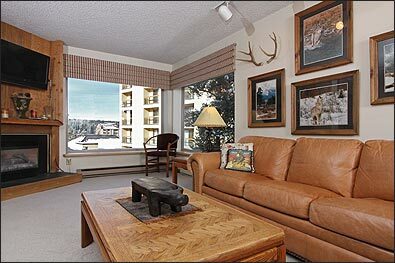 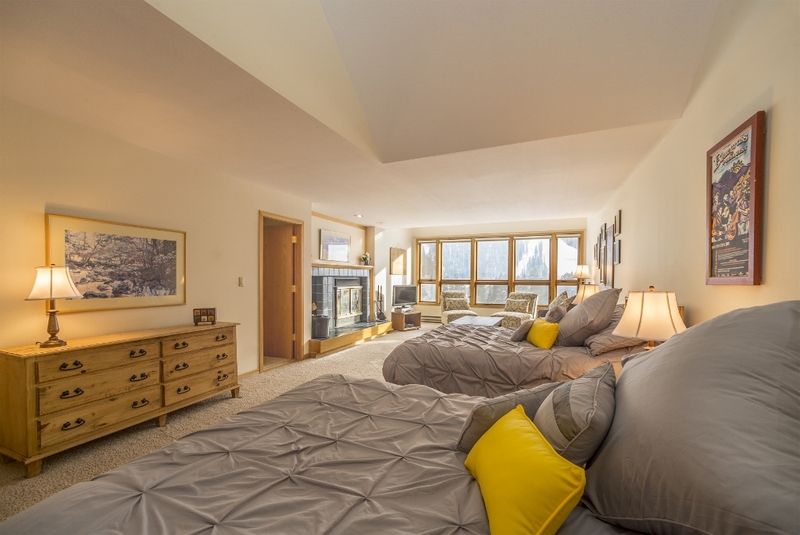 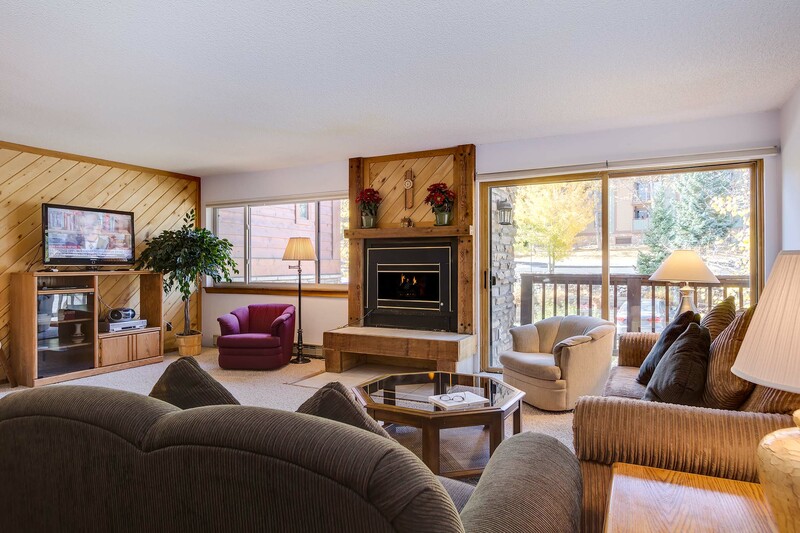 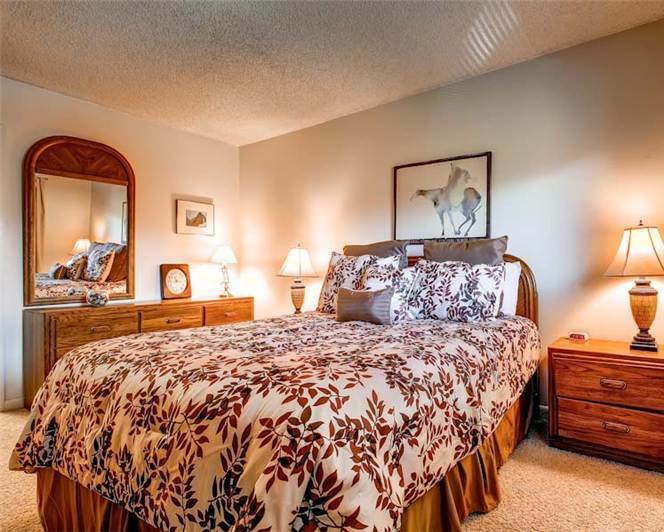 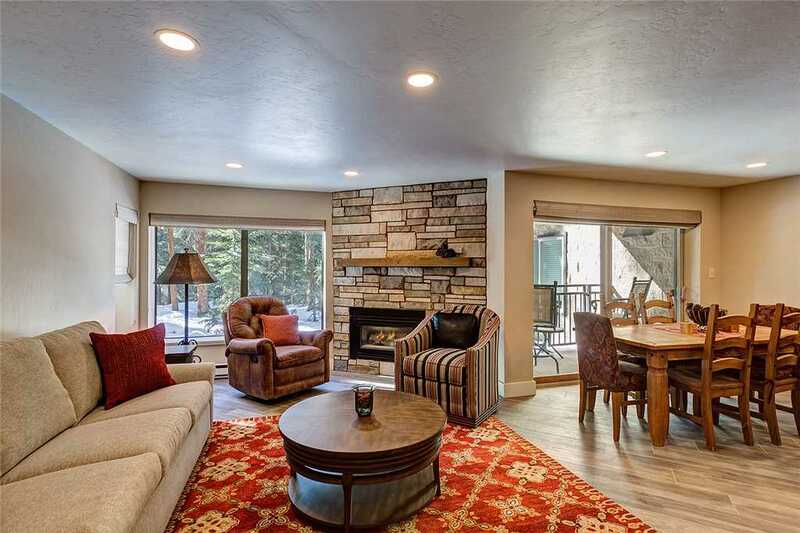 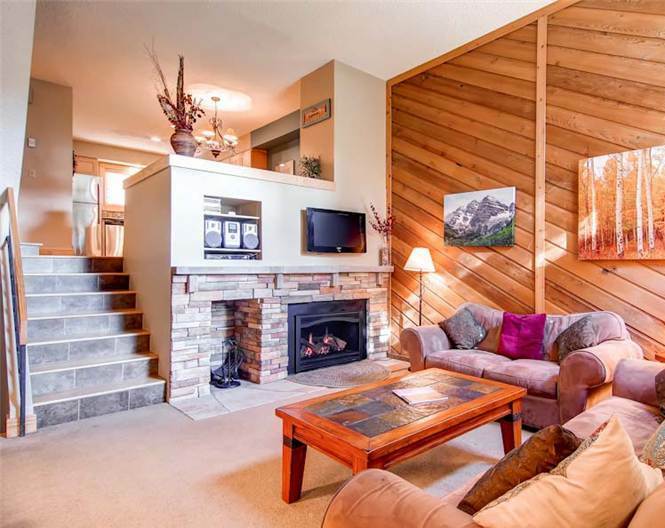 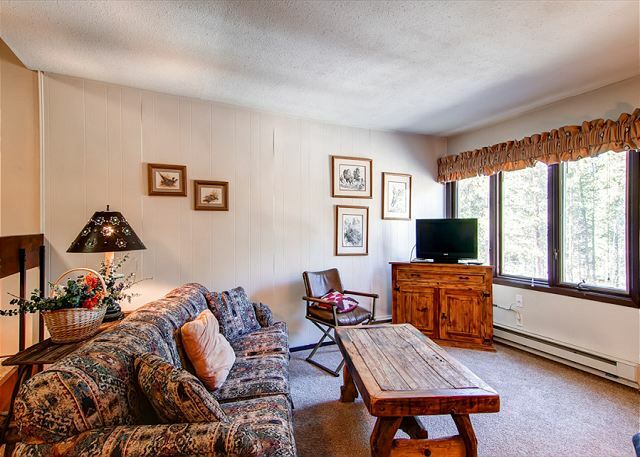 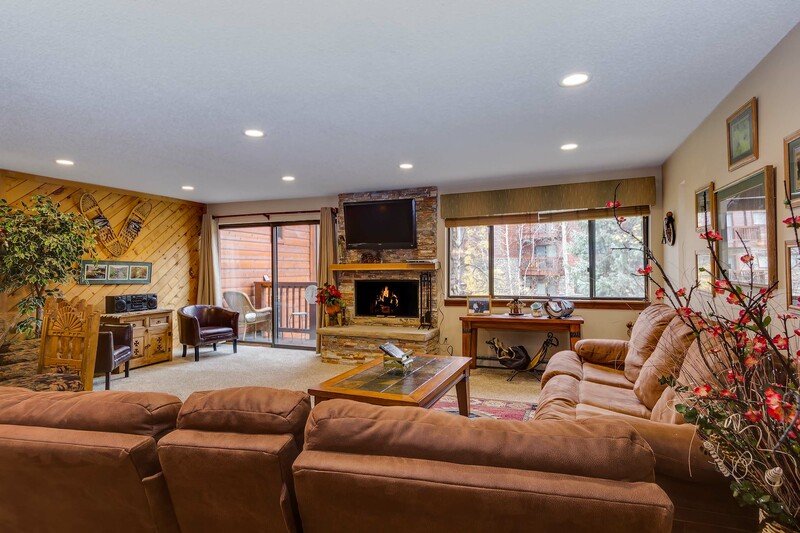 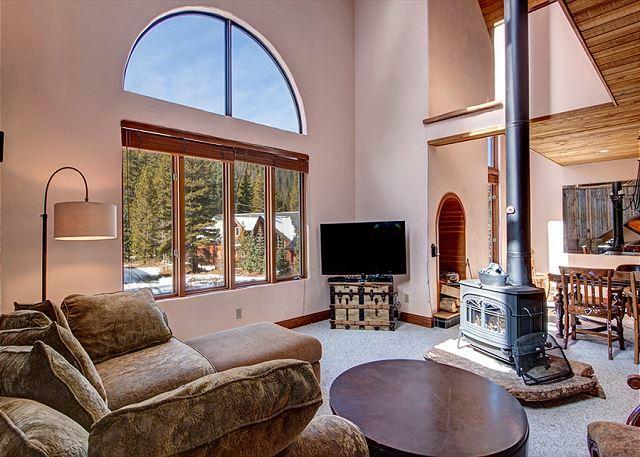 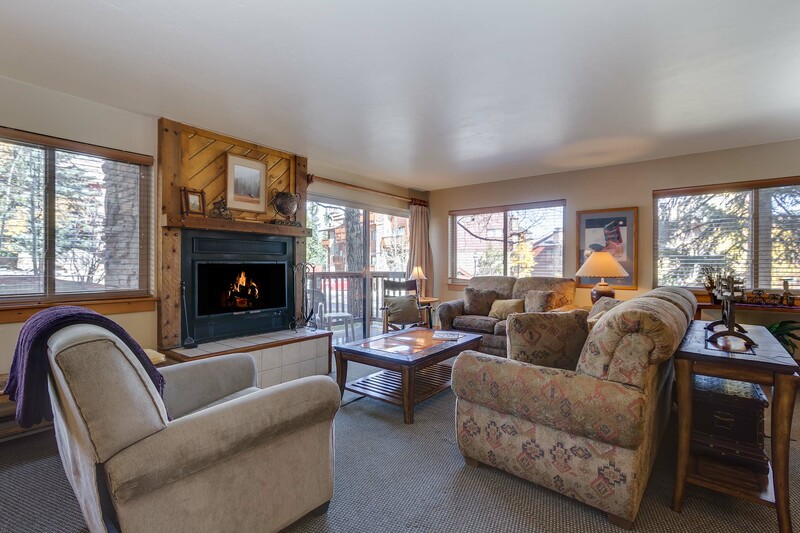 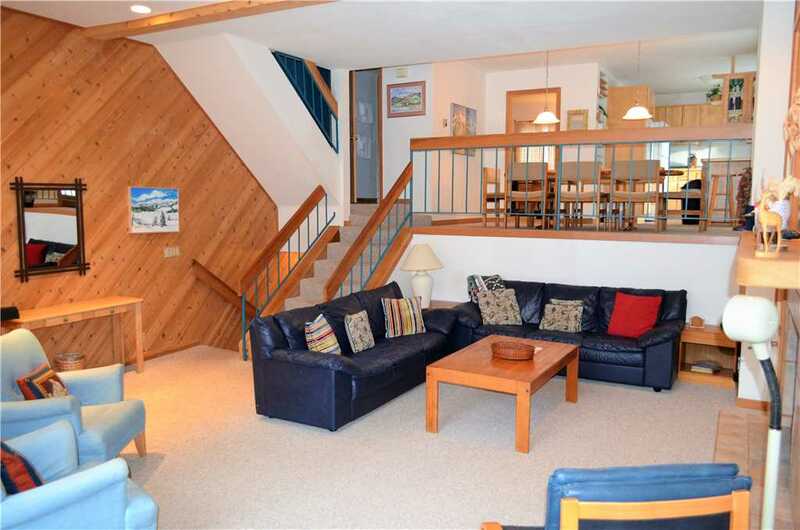 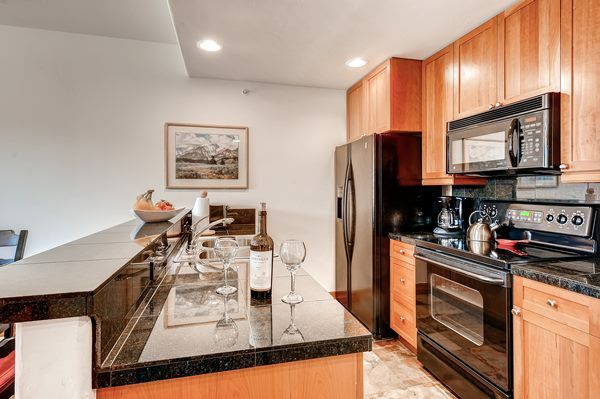 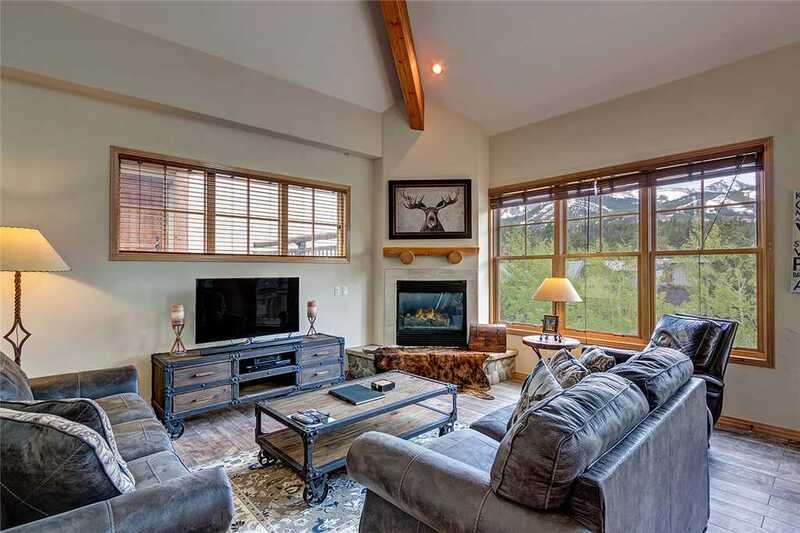 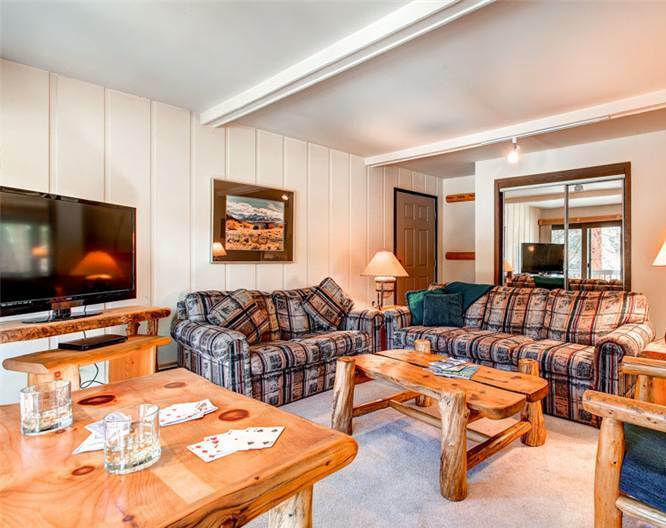 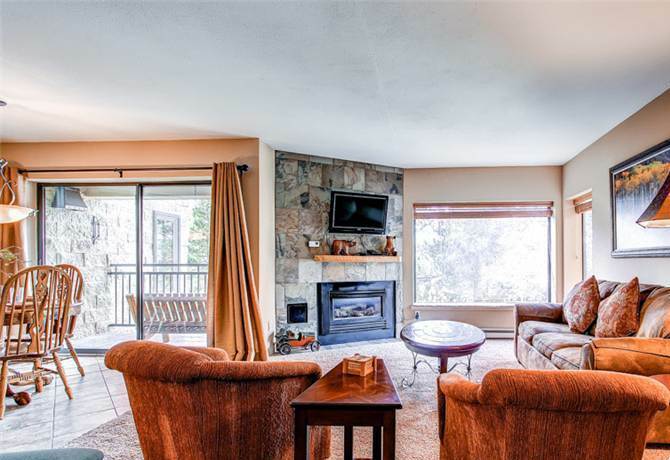 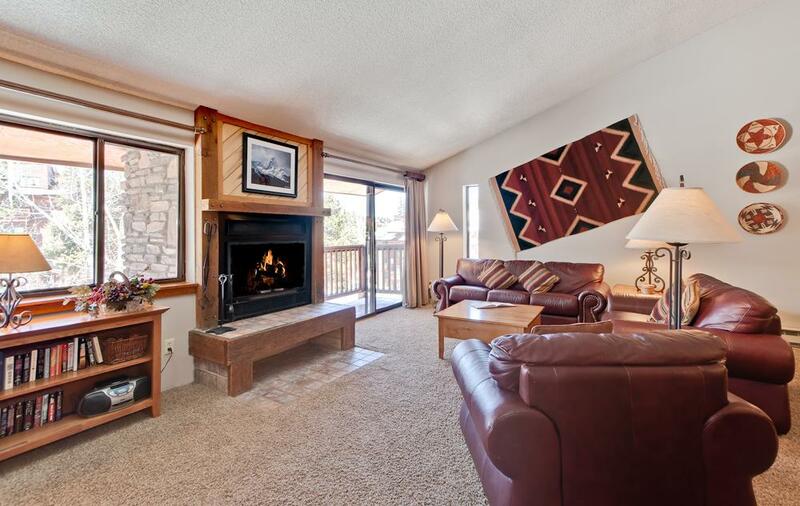 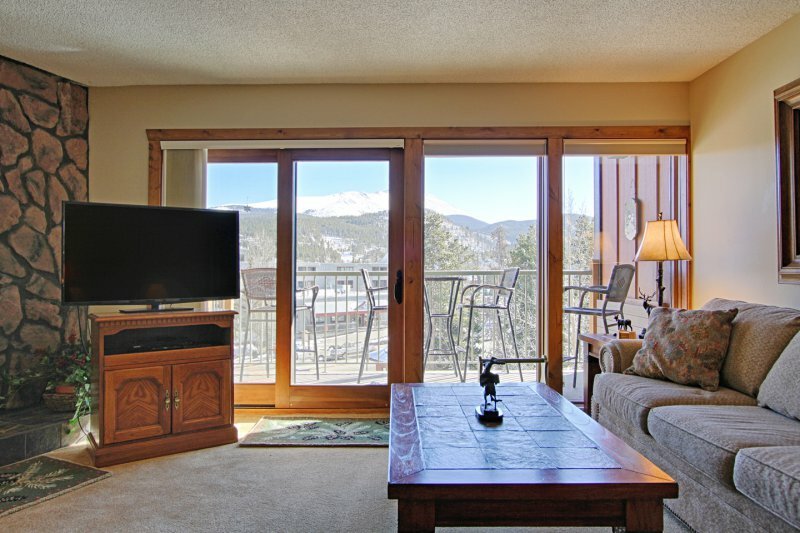 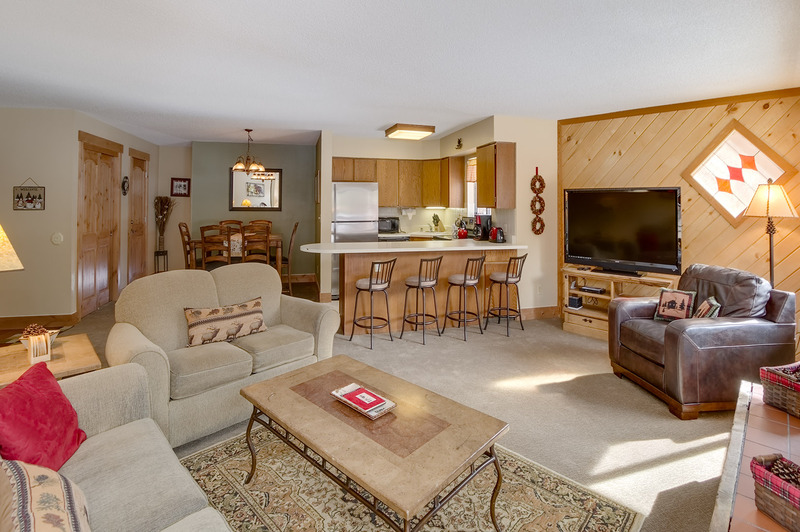 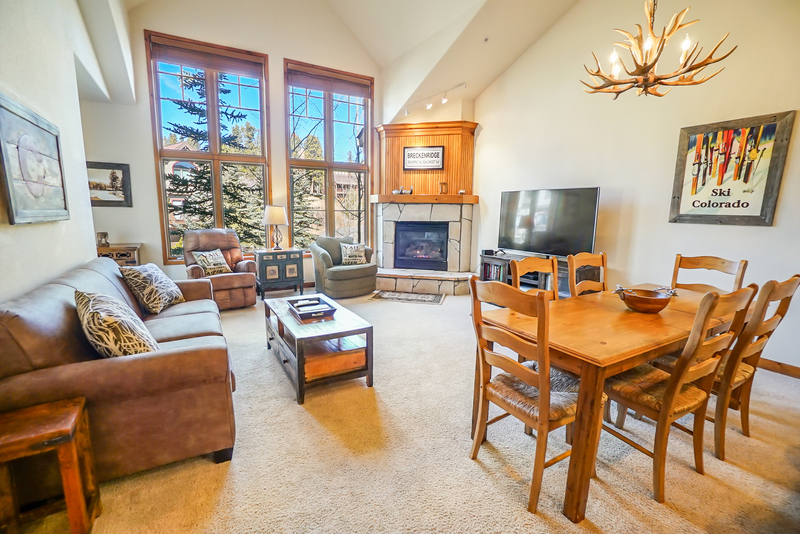 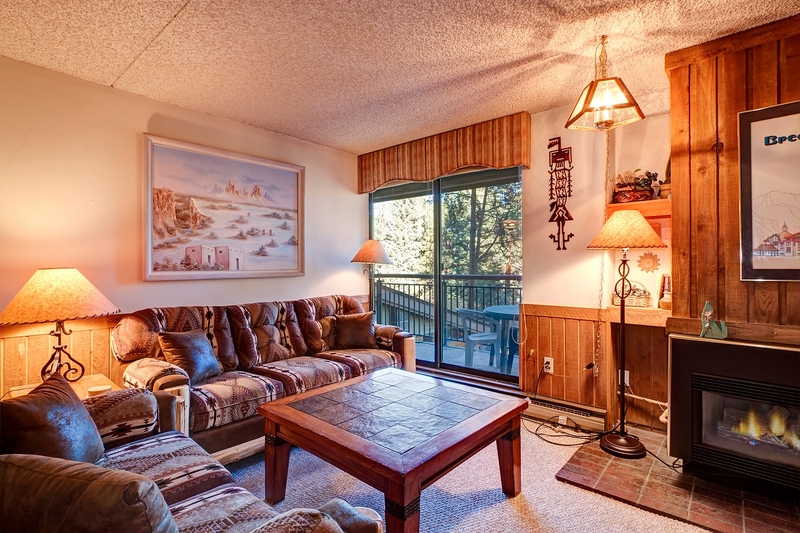 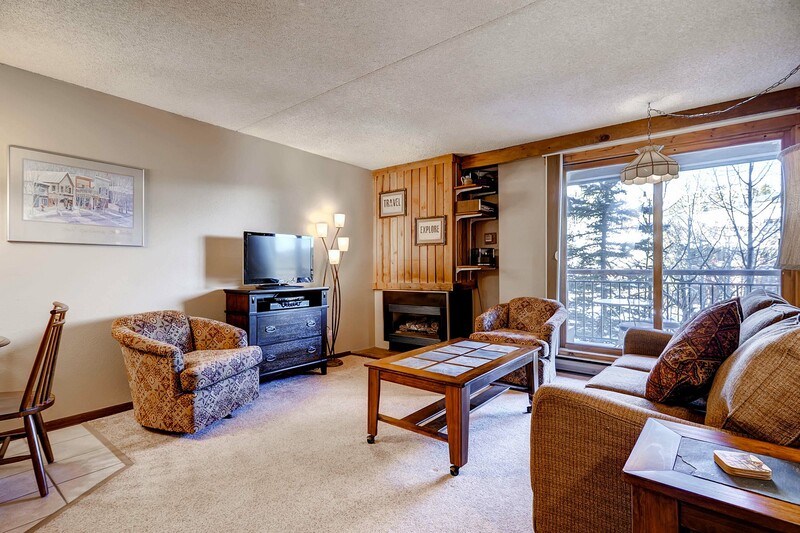 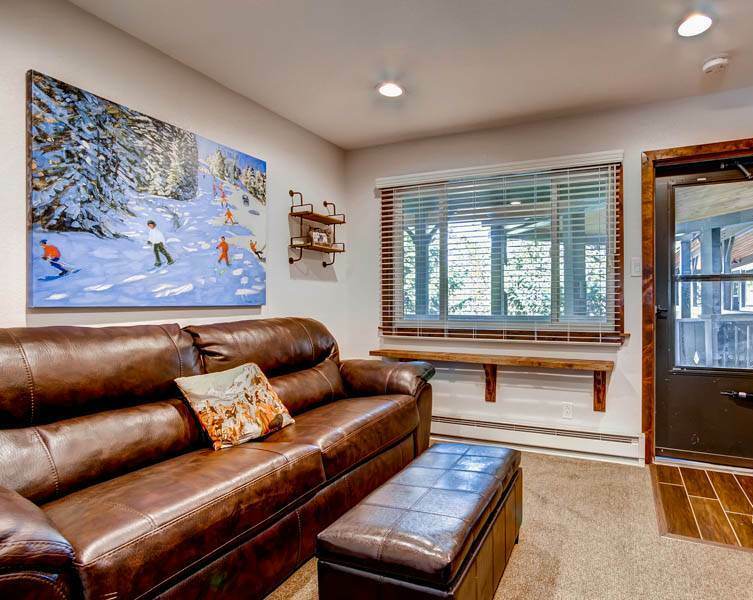 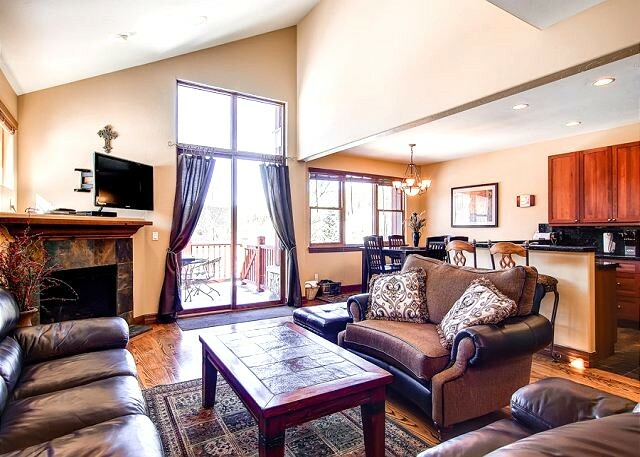 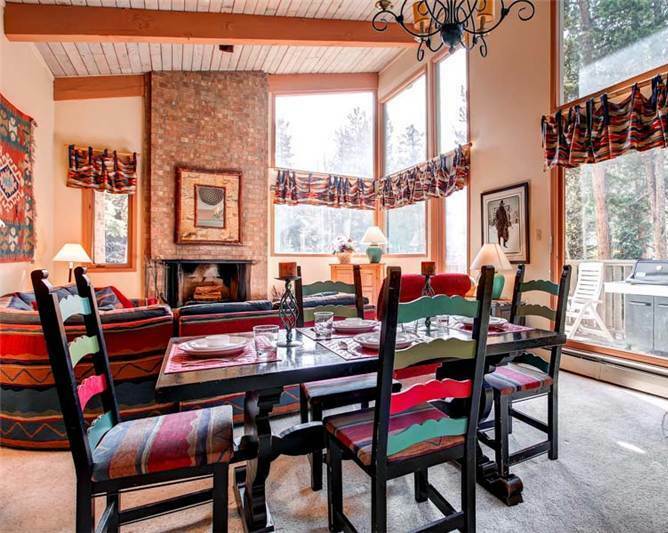 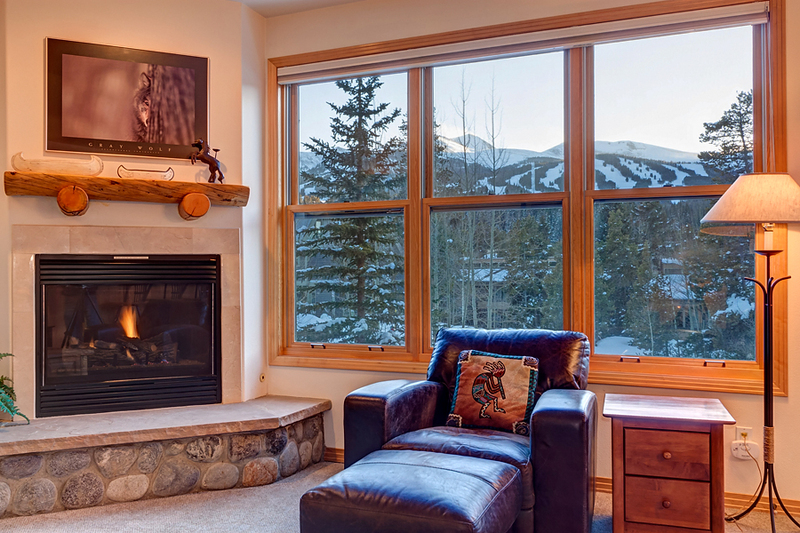 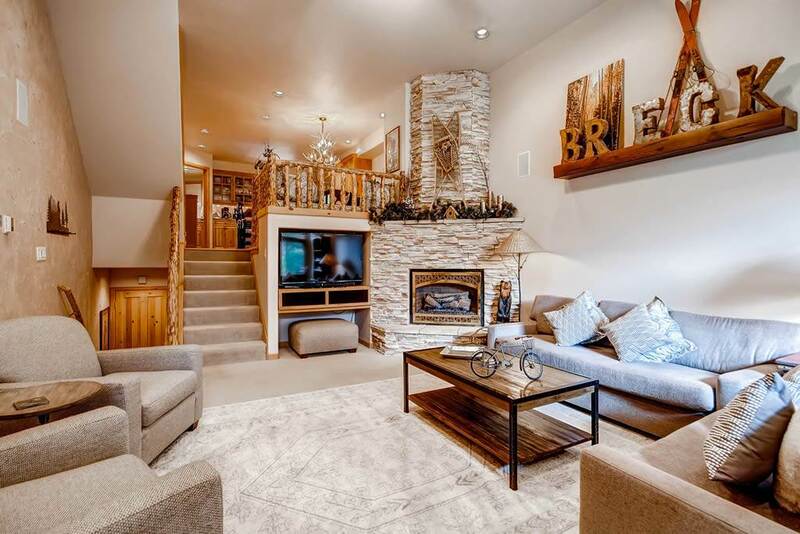 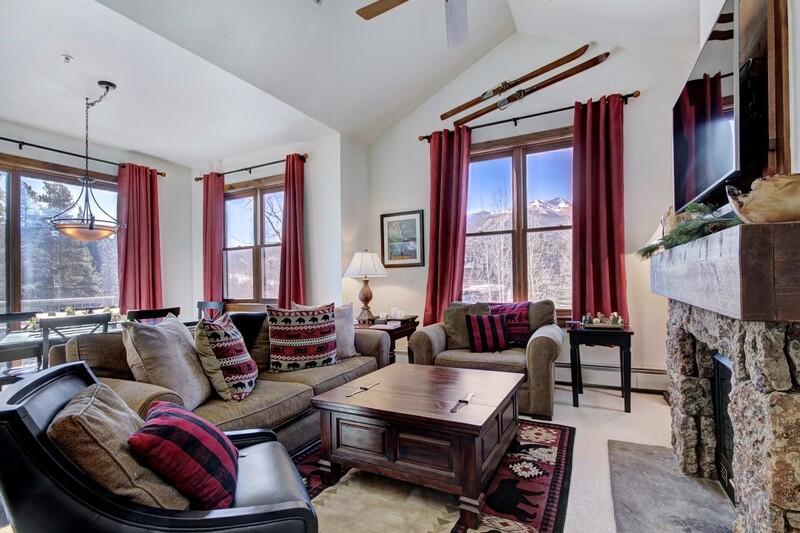 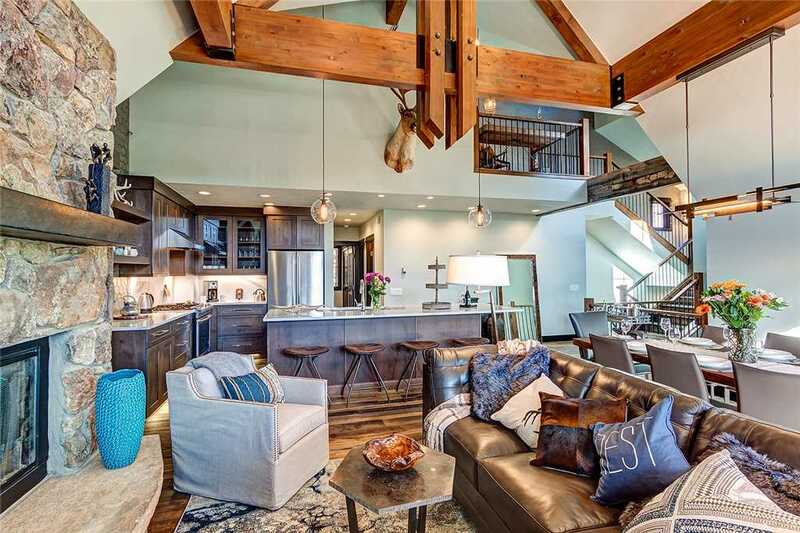 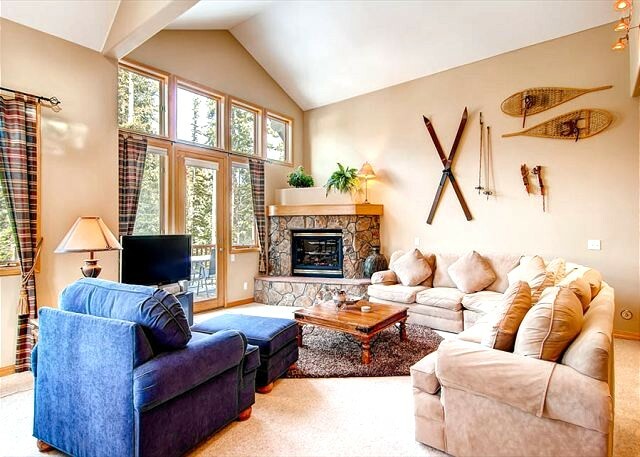 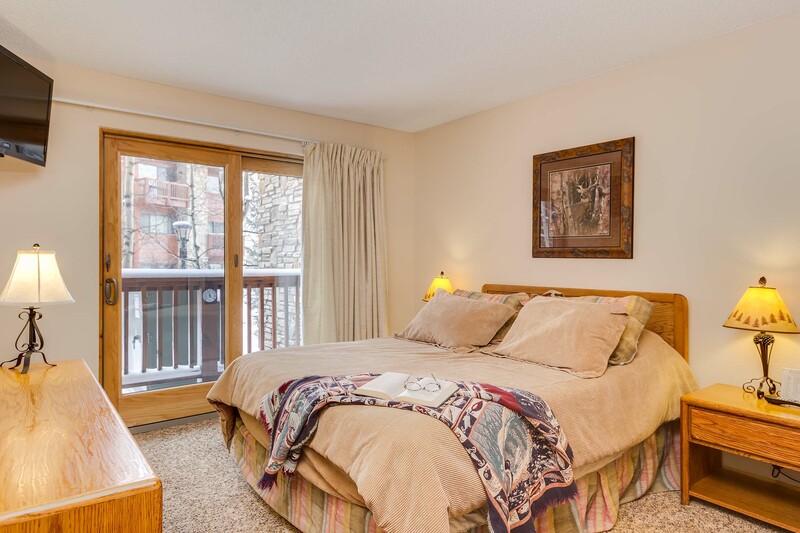 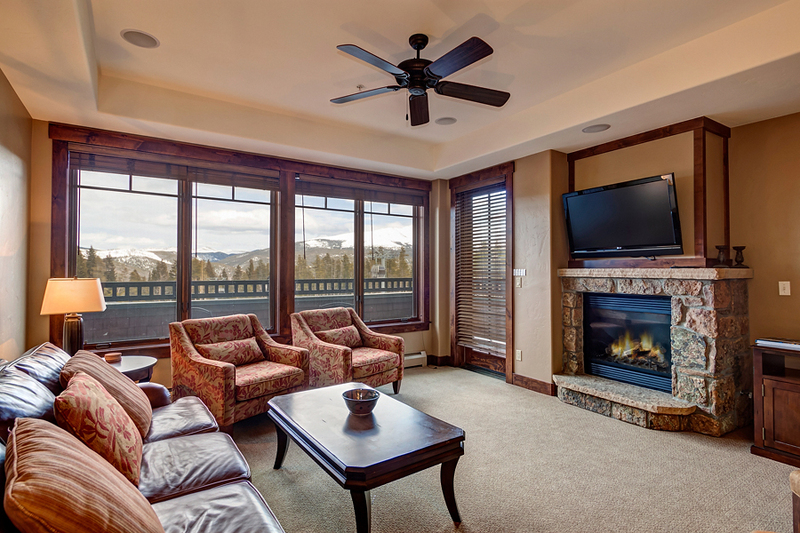 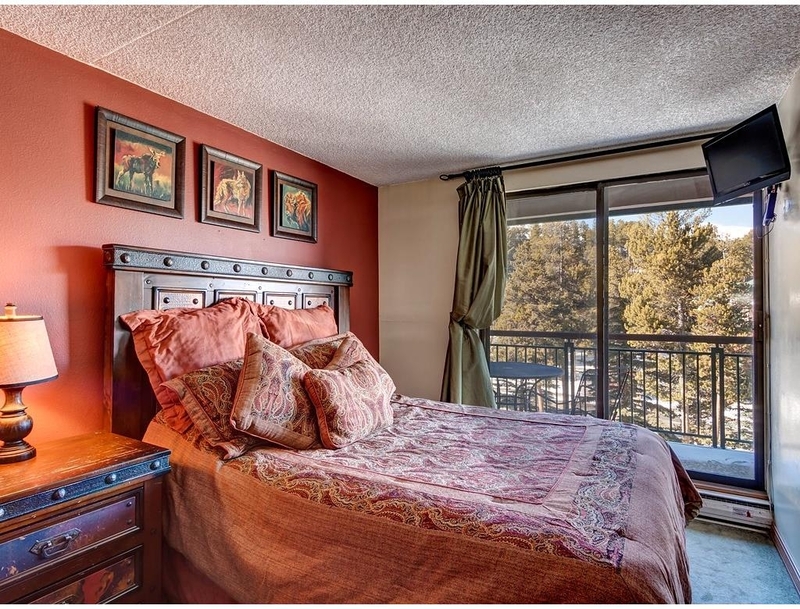 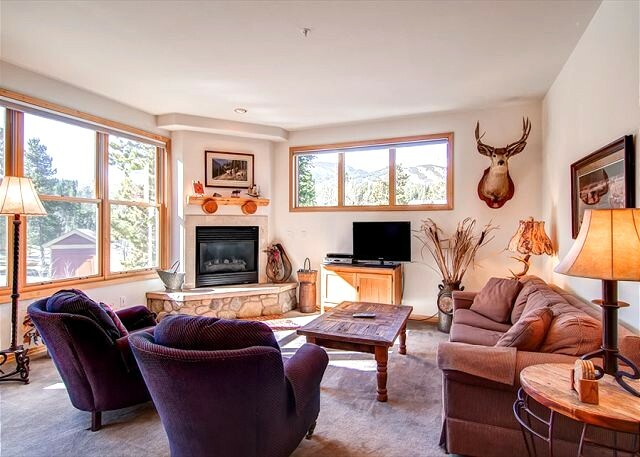 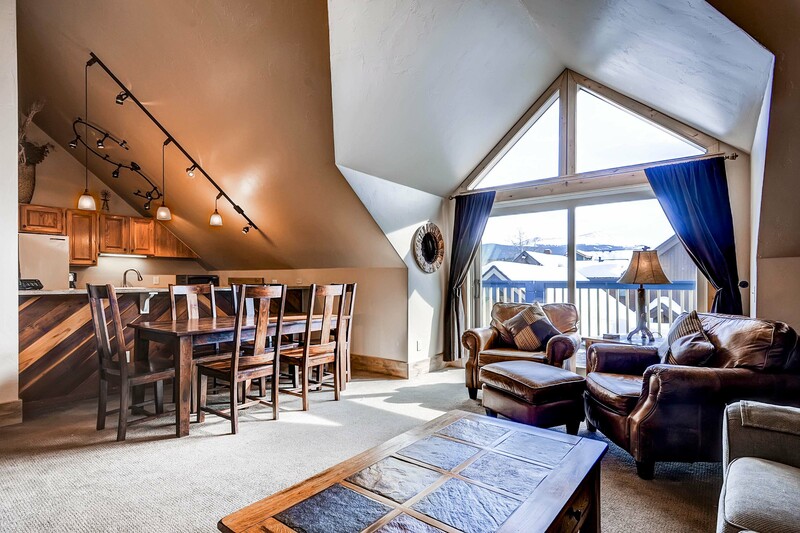 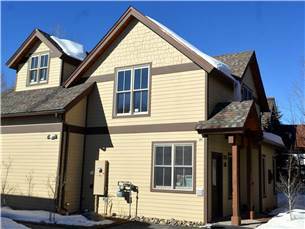 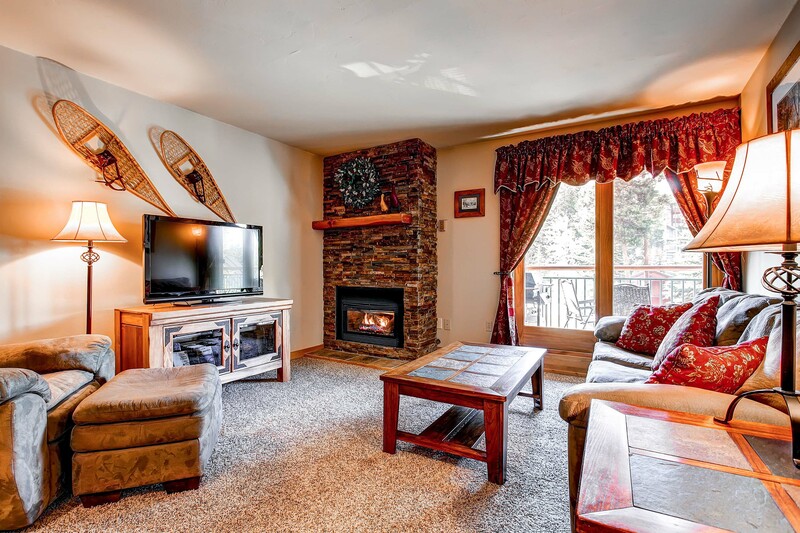 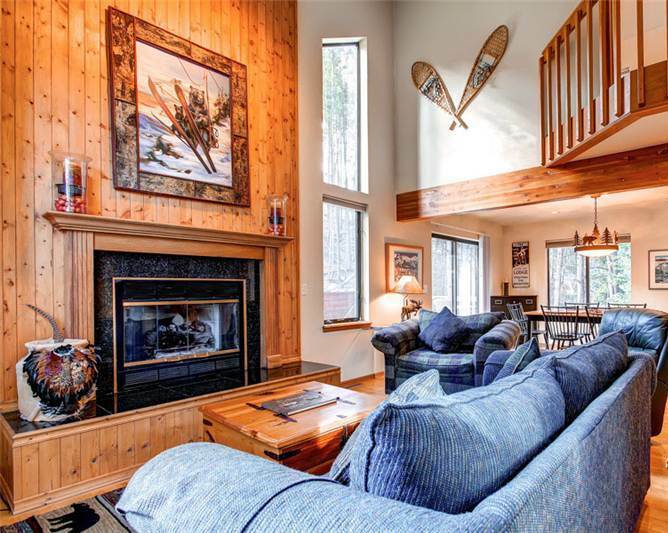 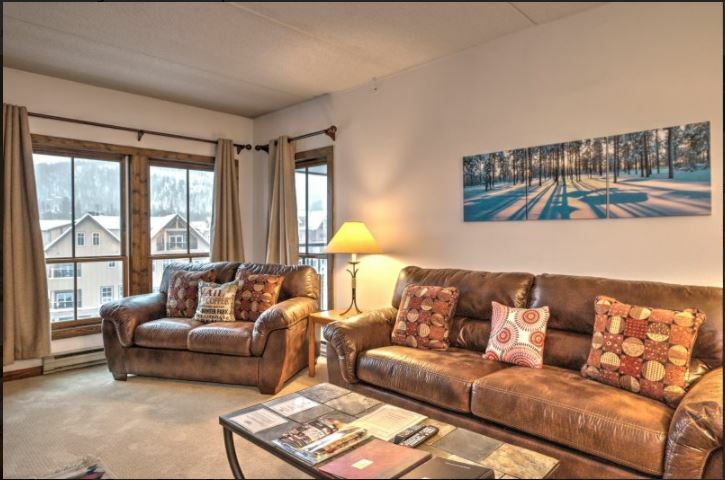 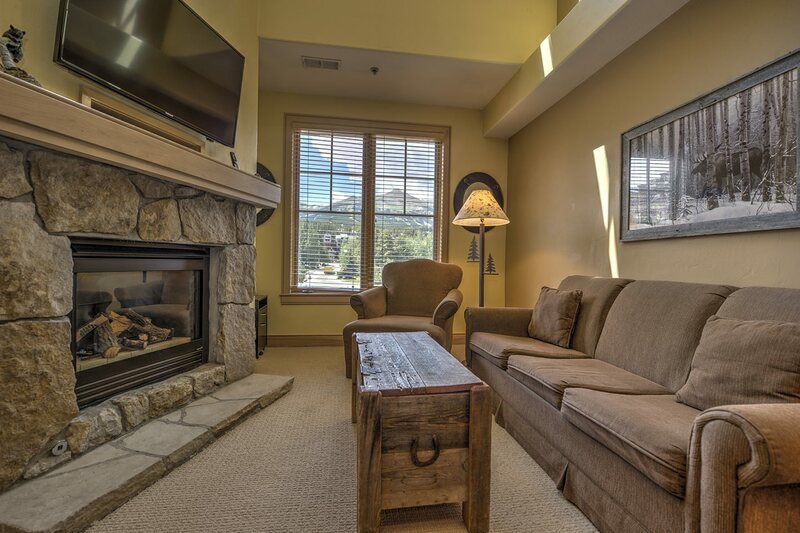 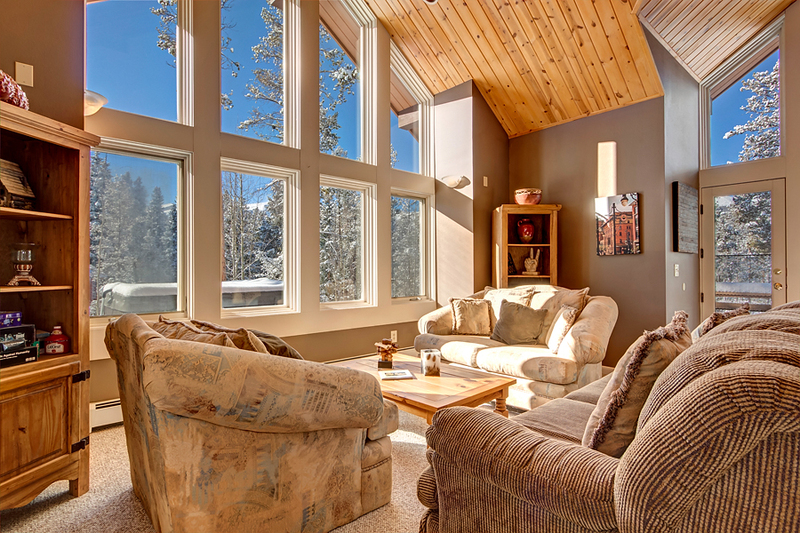 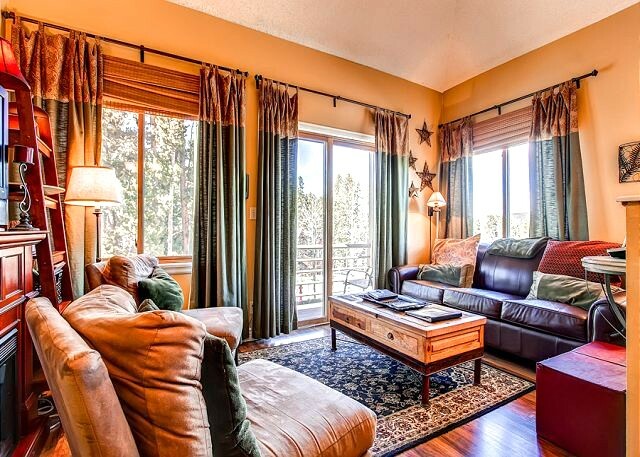 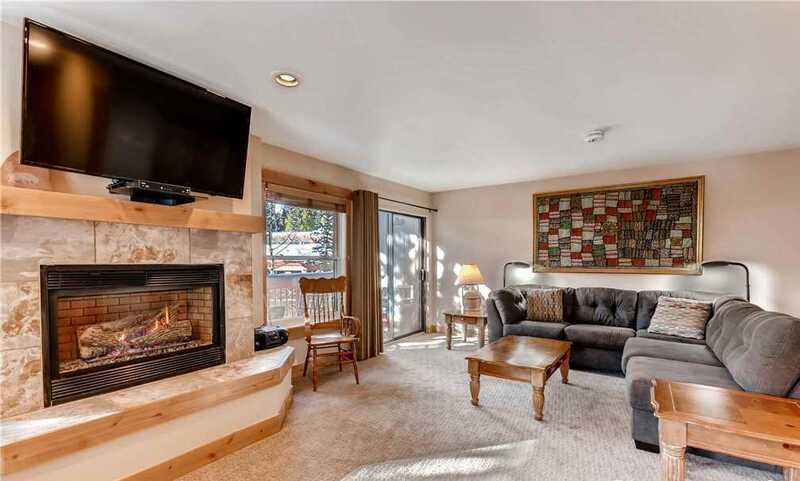 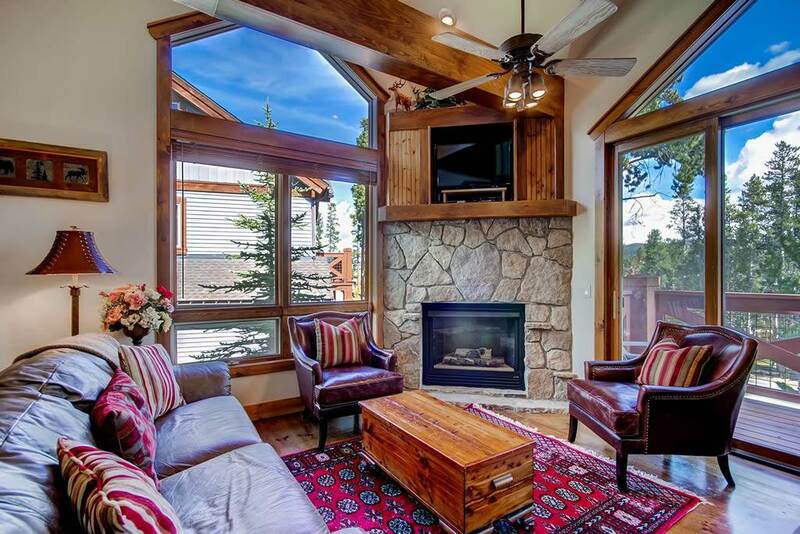 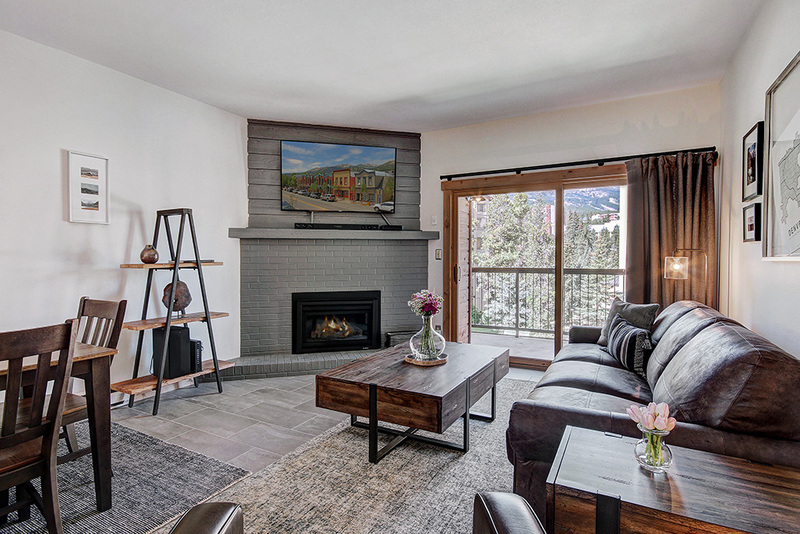 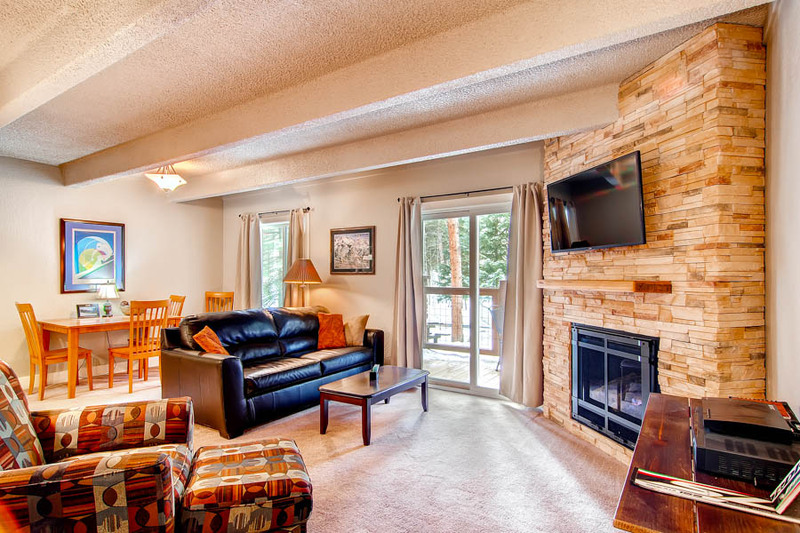 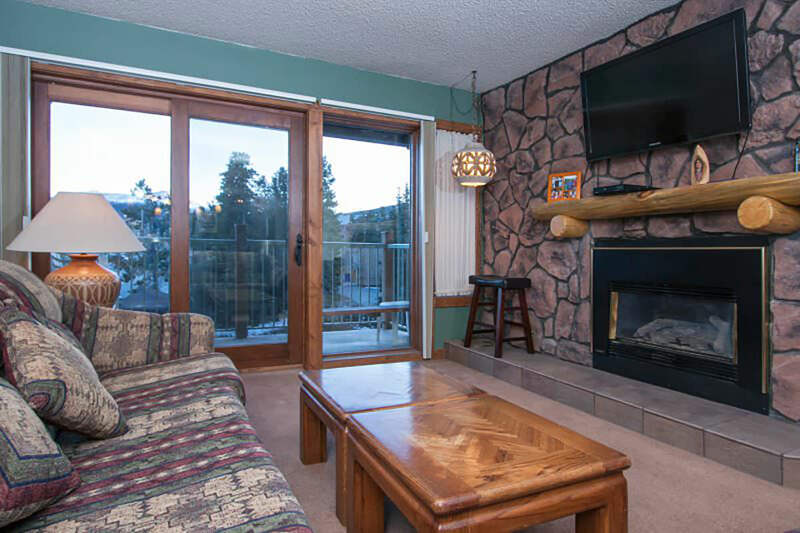 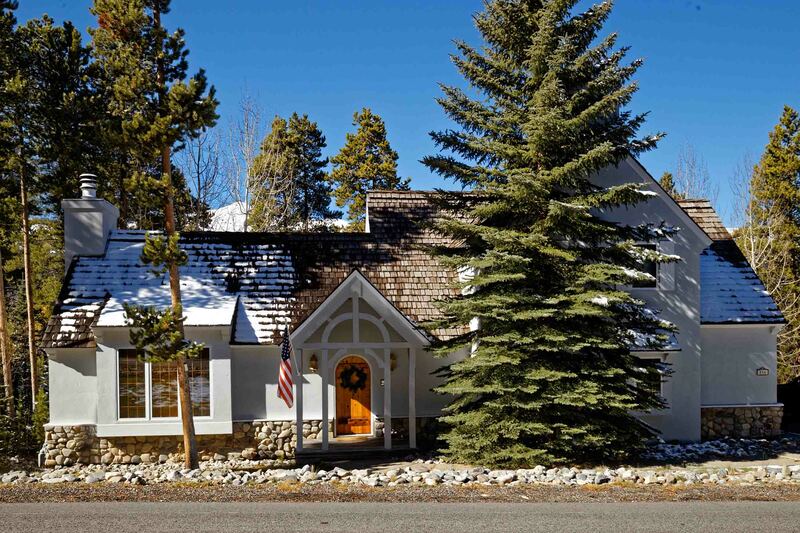 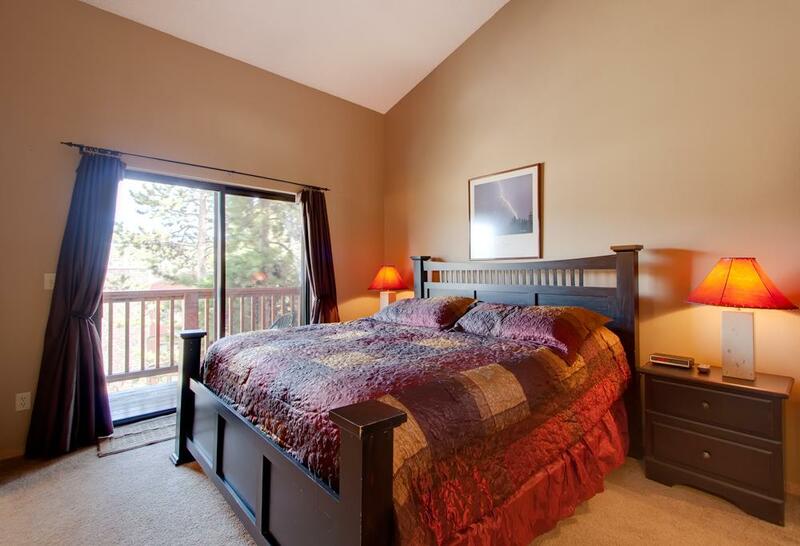 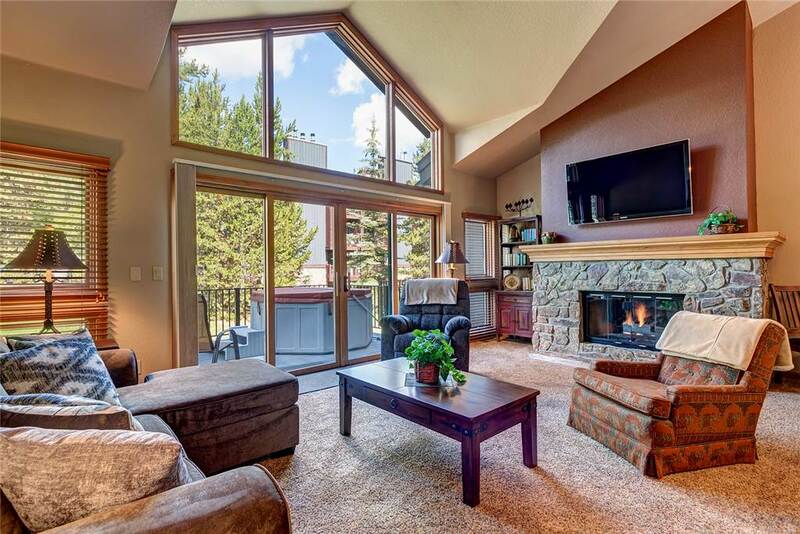 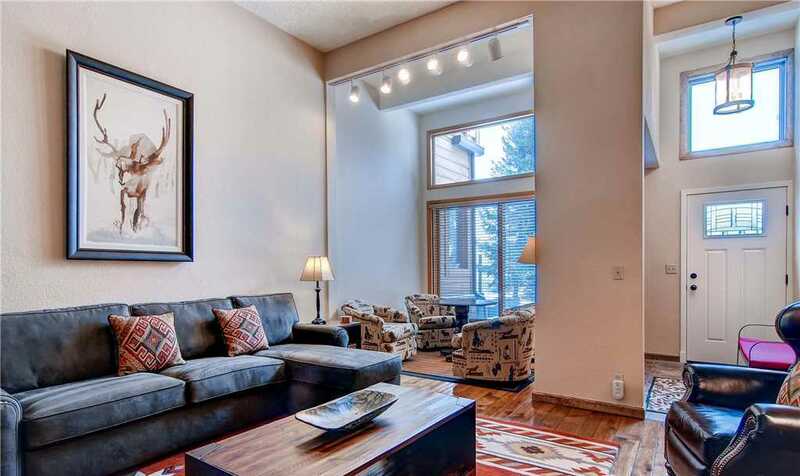 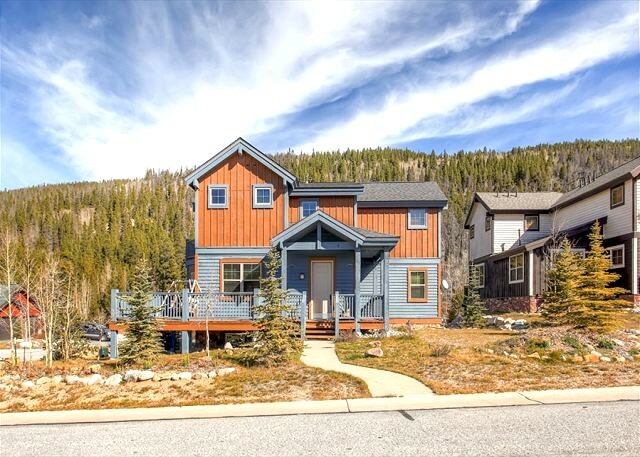 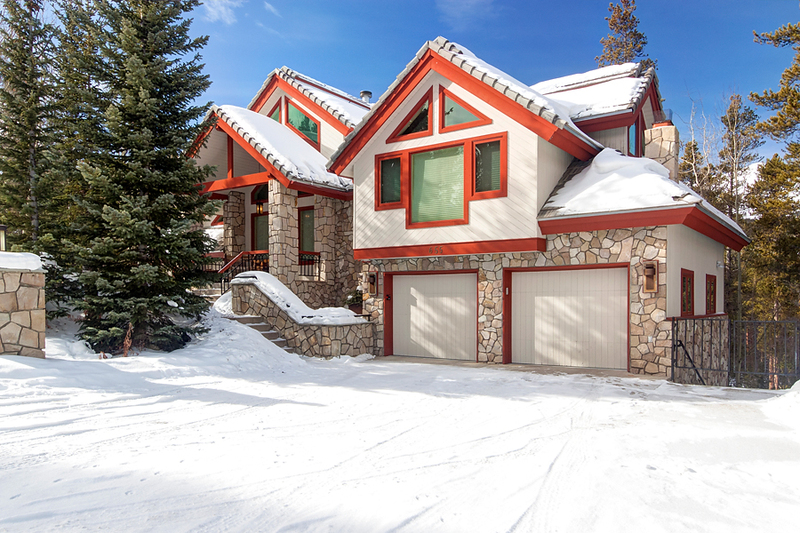 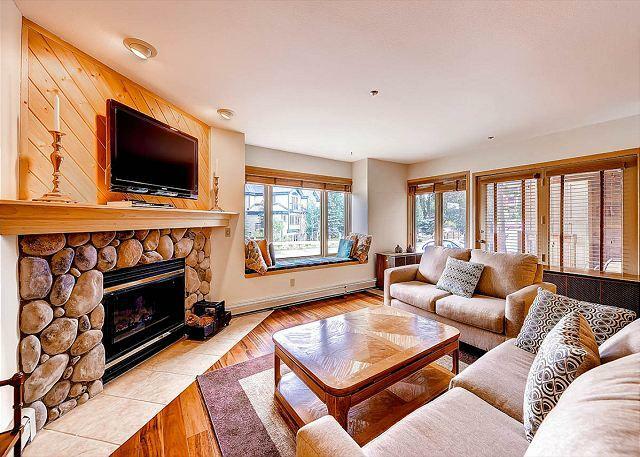 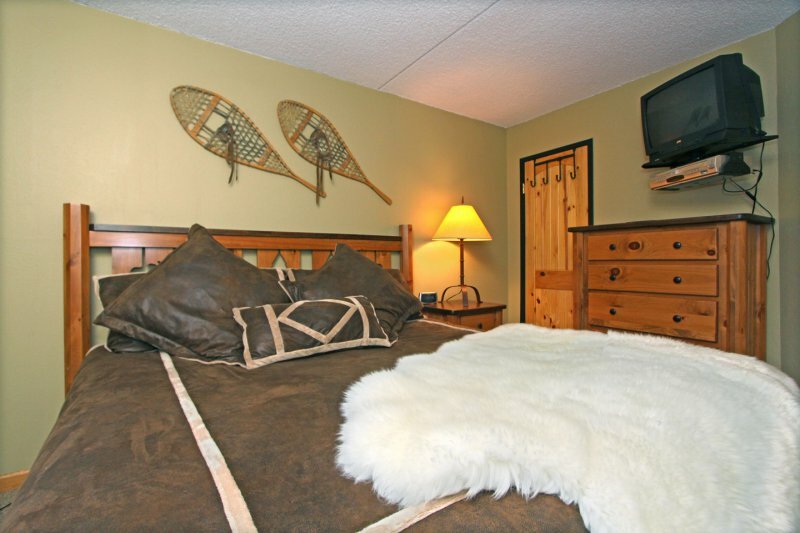 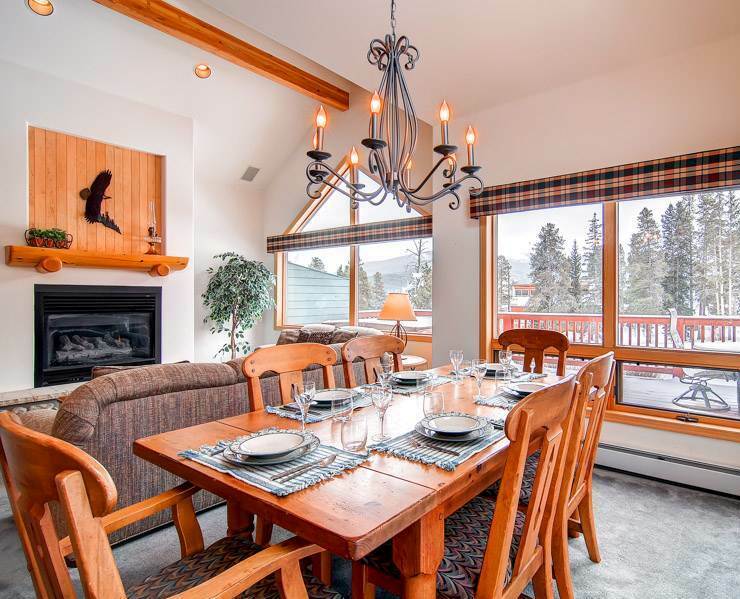 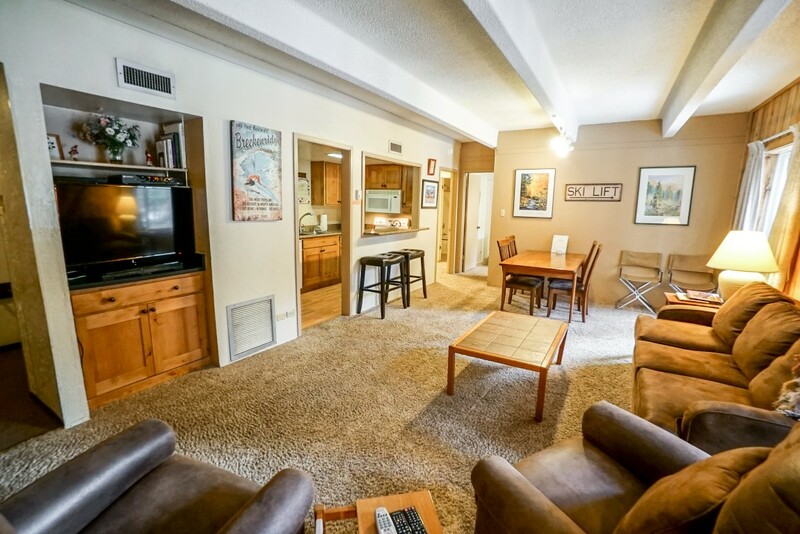 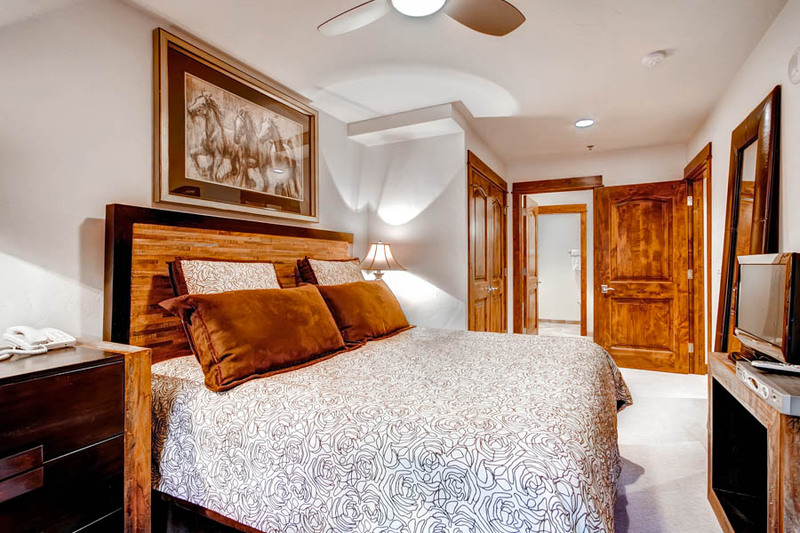 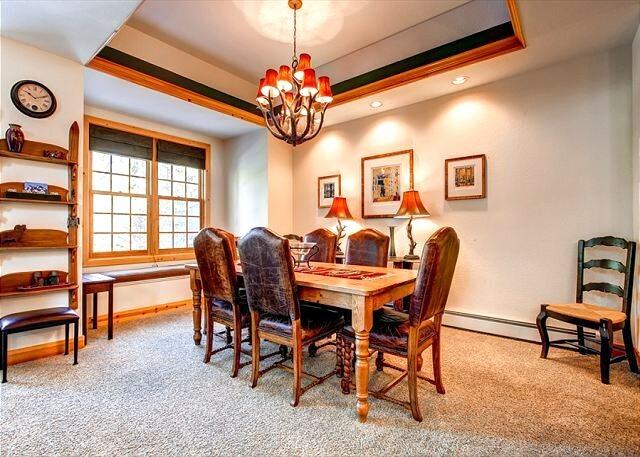 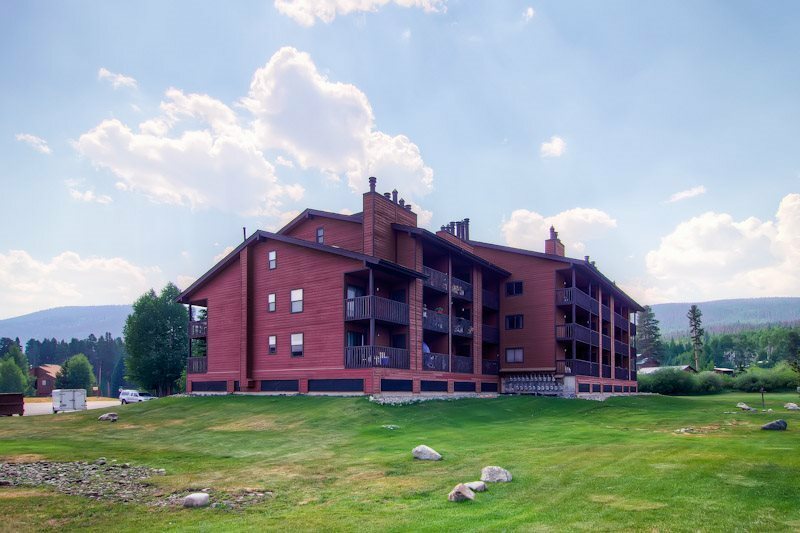 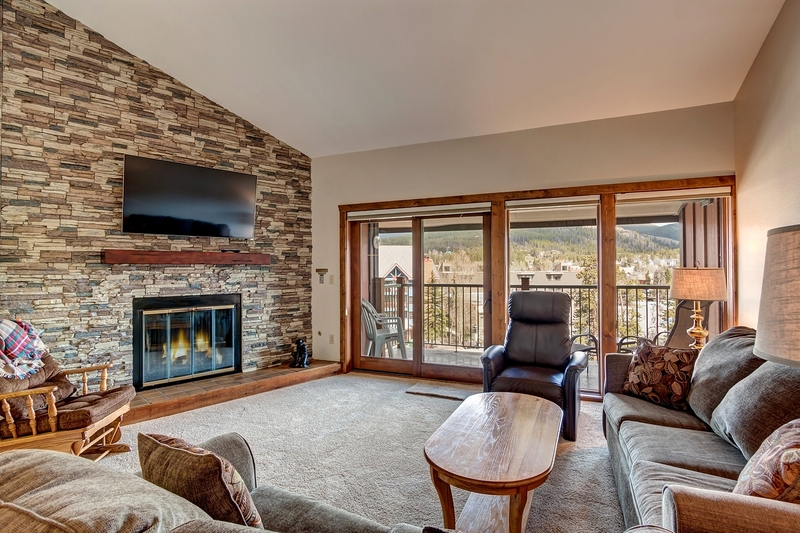 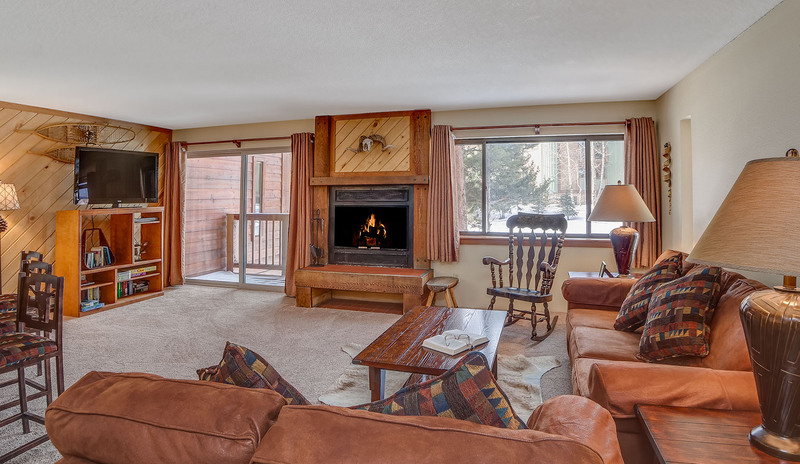 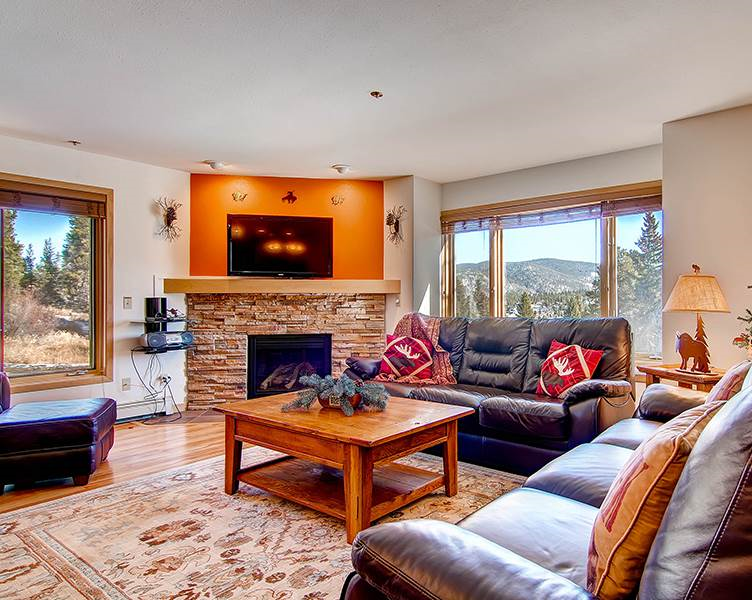 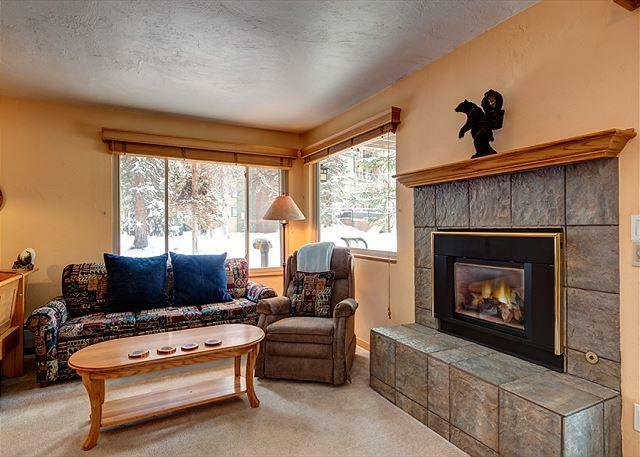 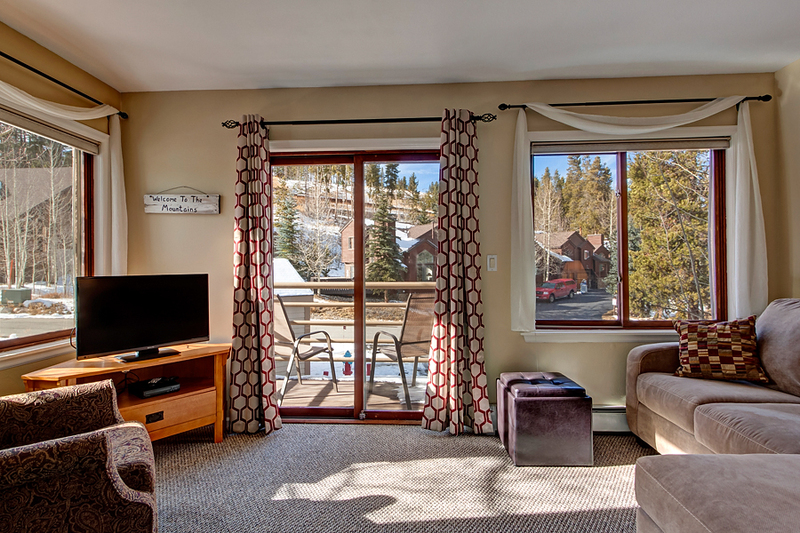 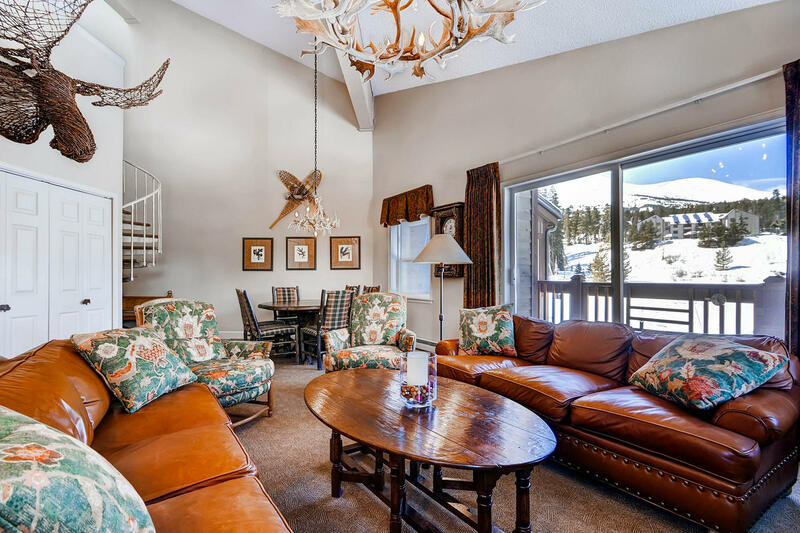 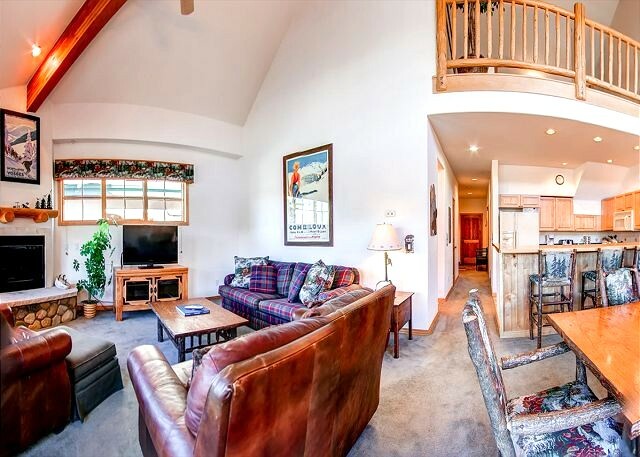 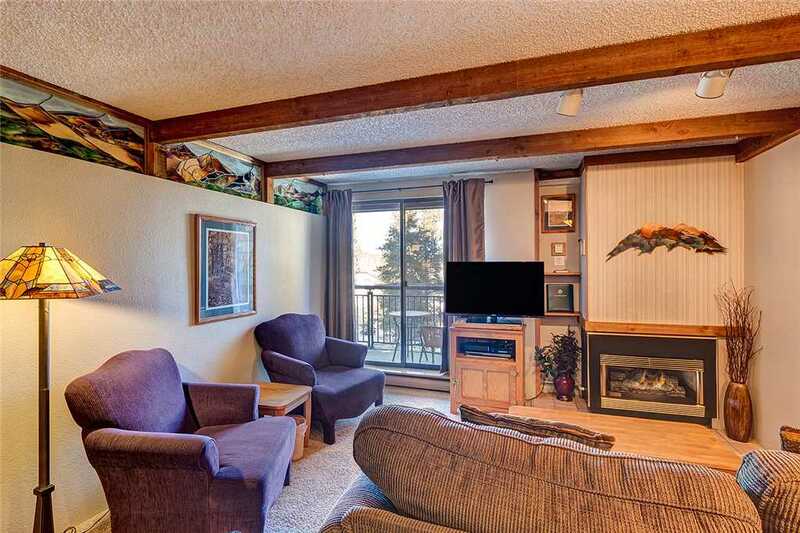 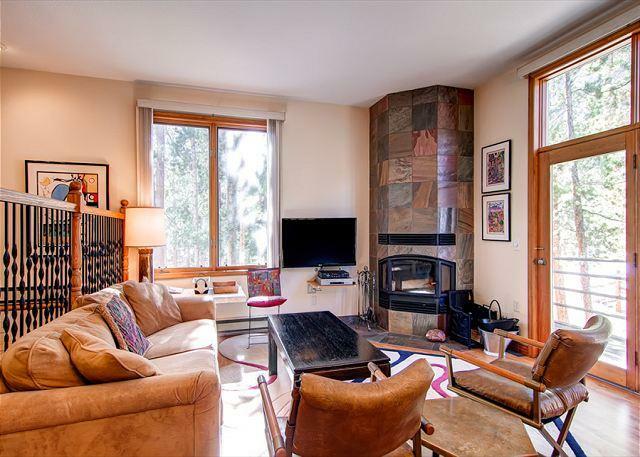 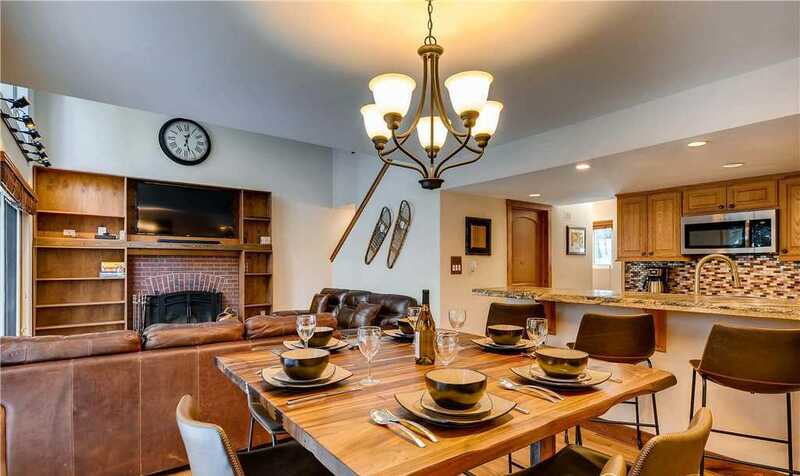 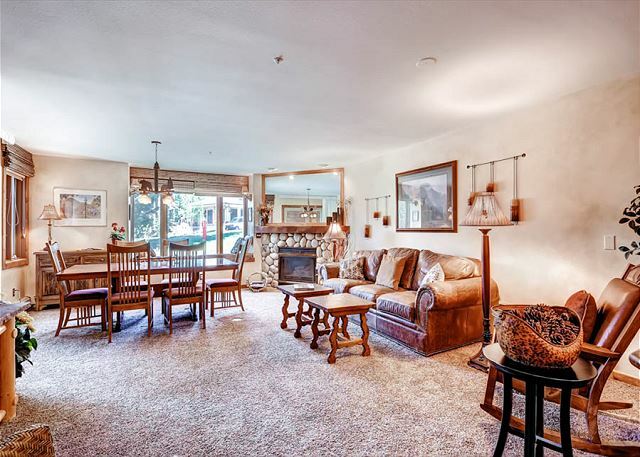 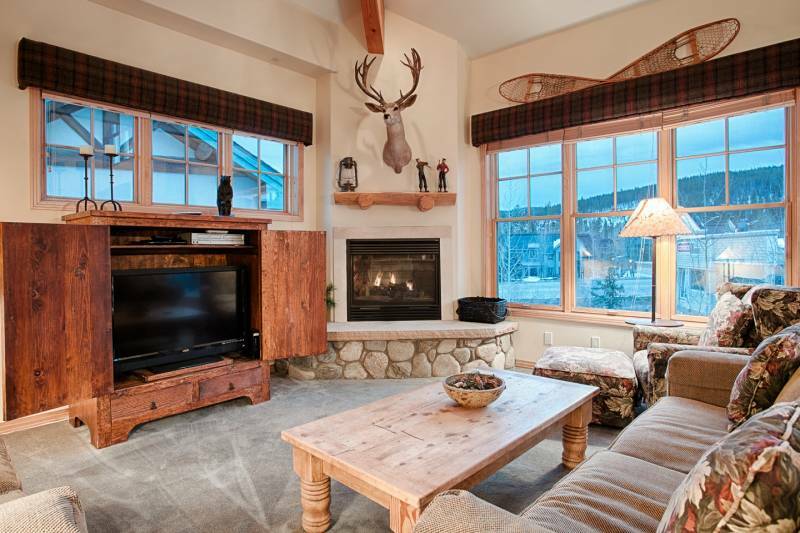 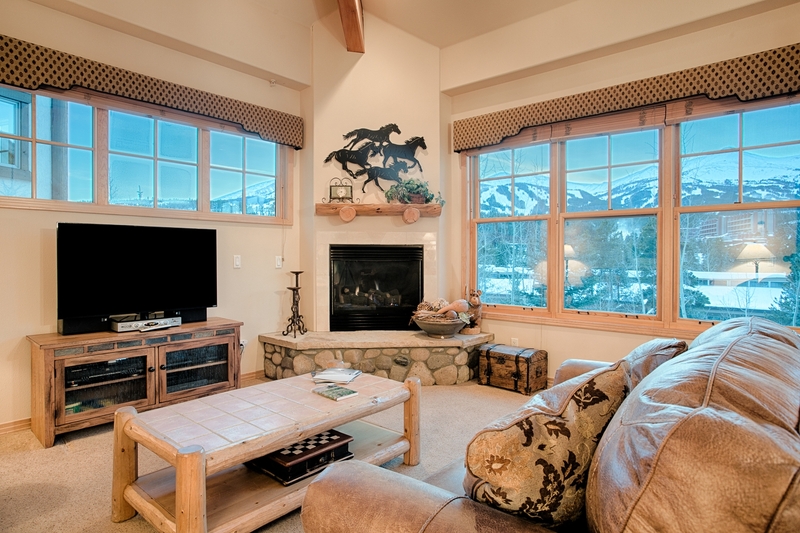 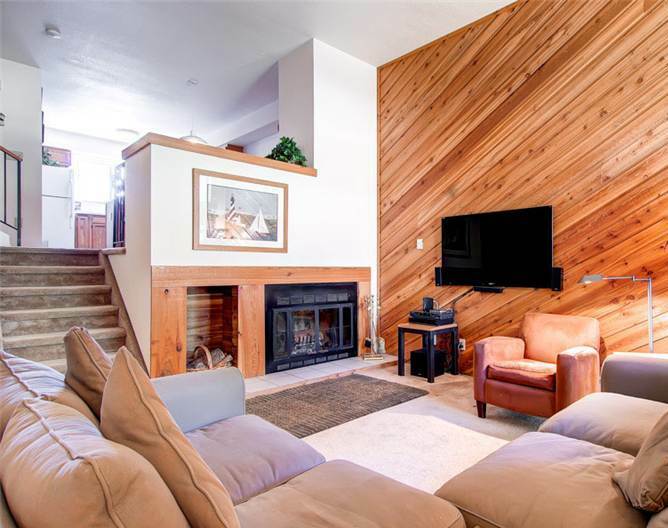 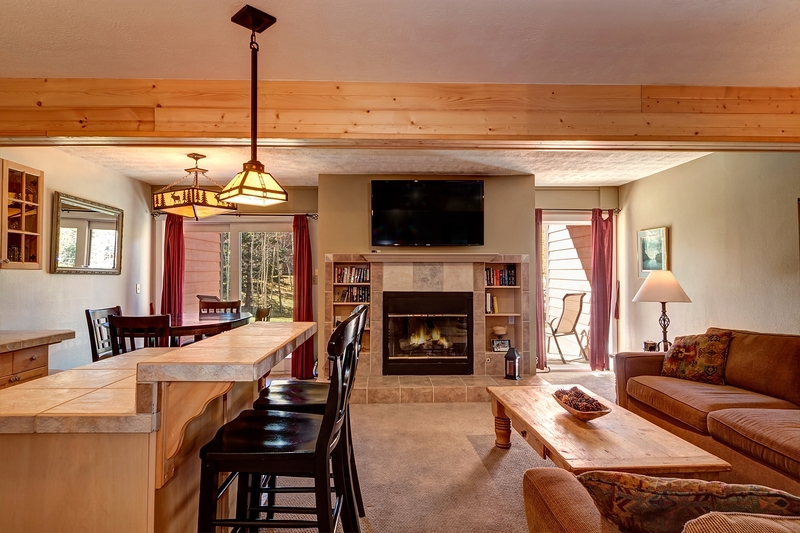 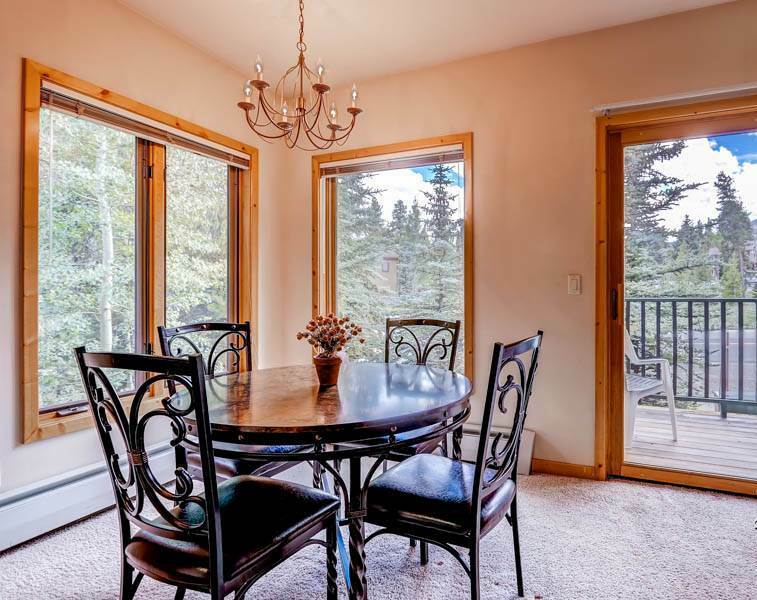 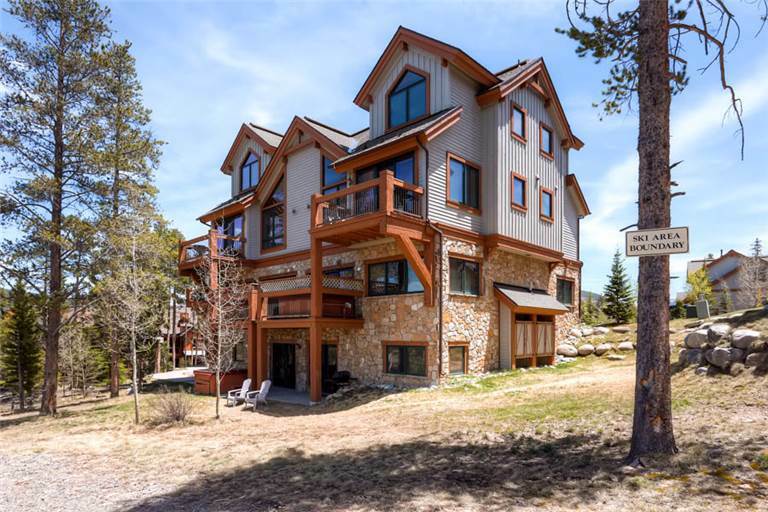 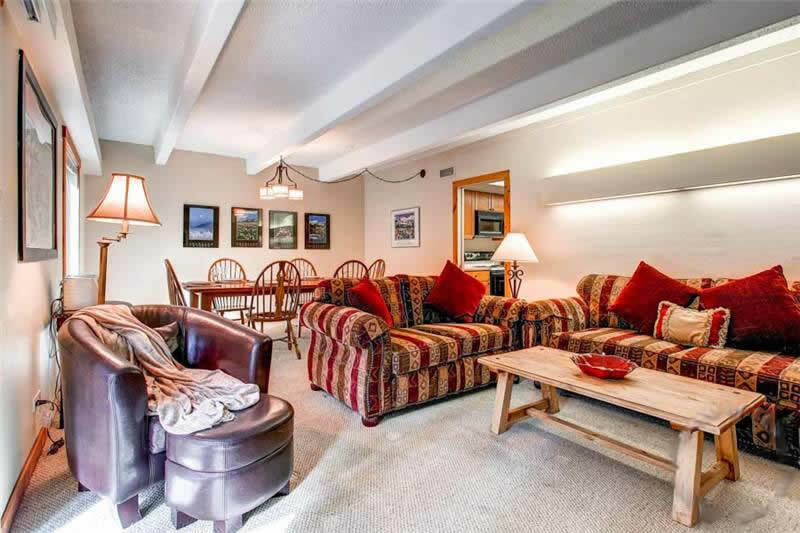 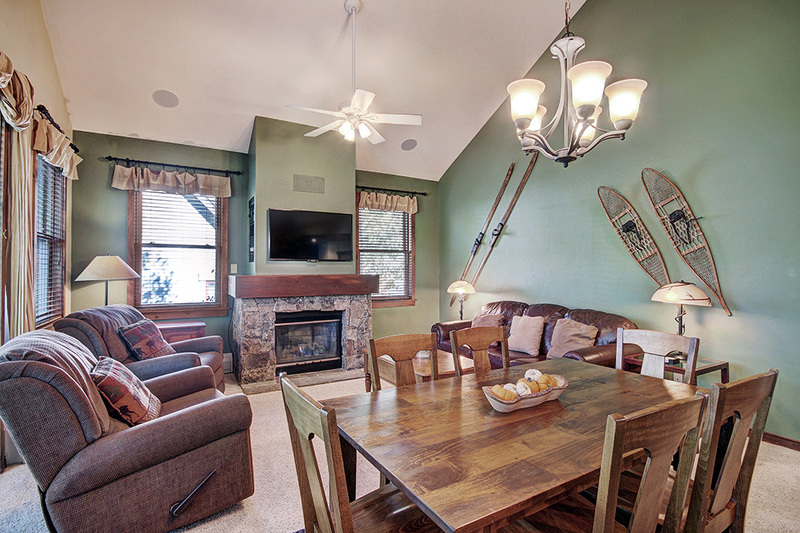 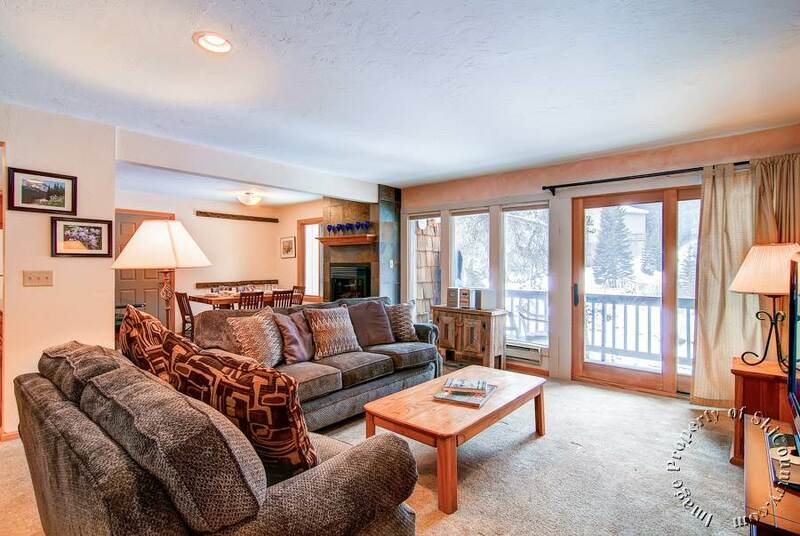 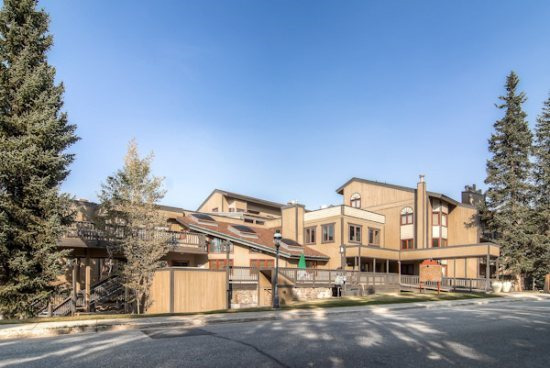 The newly renovated Double Eagle Condominiums are great if you want to be close to the slopes and close to town — all at a moderate price! 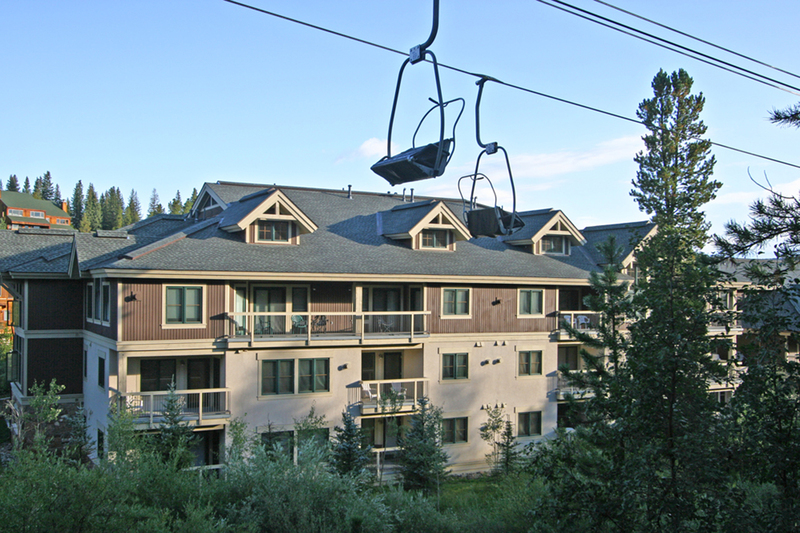 You’re just a short (half a block) walk from the Snowflake lift, and at the end of the day, ski the 4 O’Clock Run back to the property. 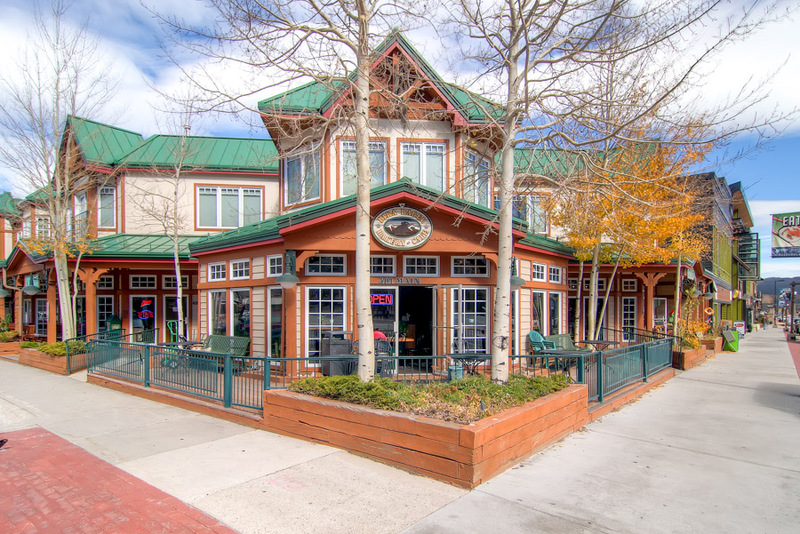 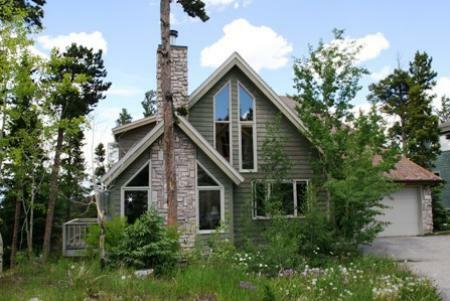 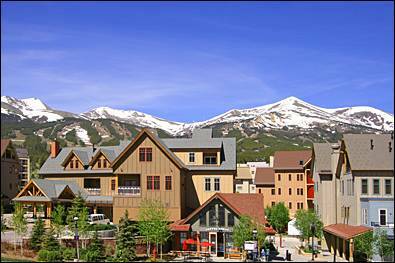 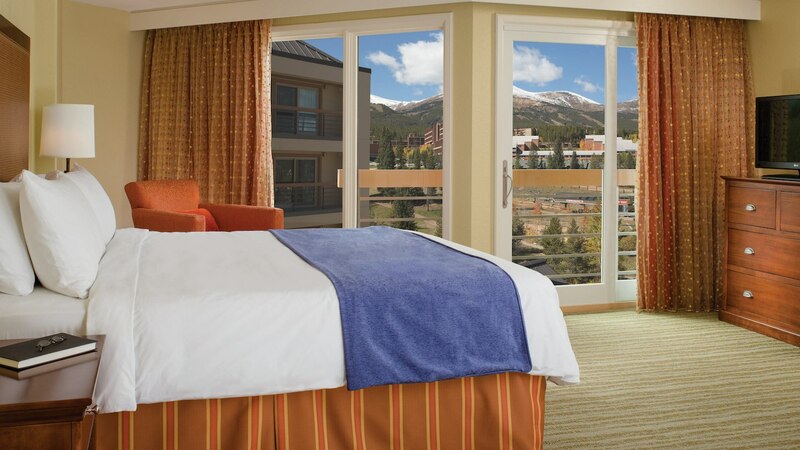 Breckenridge’s Main Street is just a couple of blocks away or a quick ride on the free shuttle. 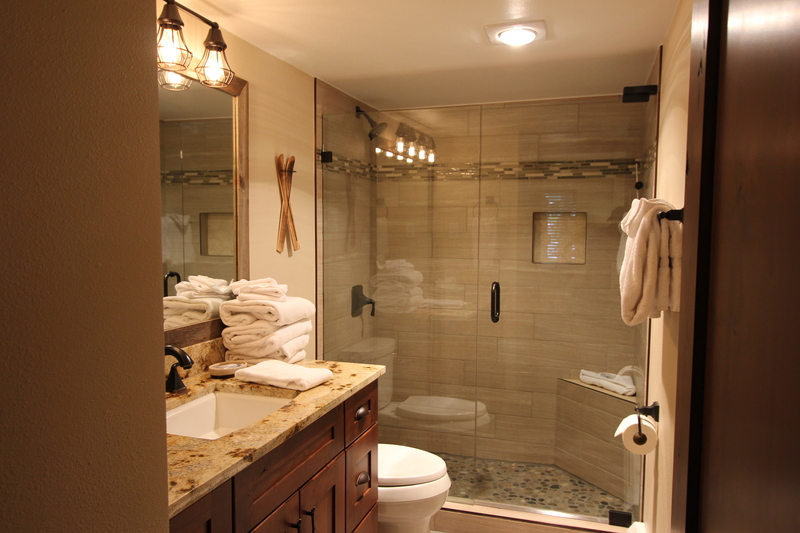 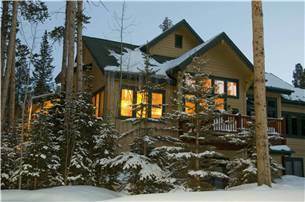 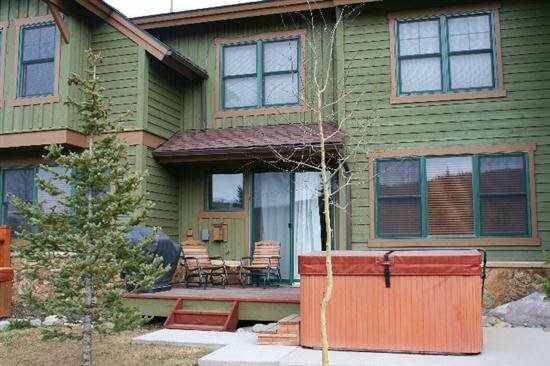 You’ll also enjoy the outdoor hot tub on the property, as well as access to the Upper Village Pool. 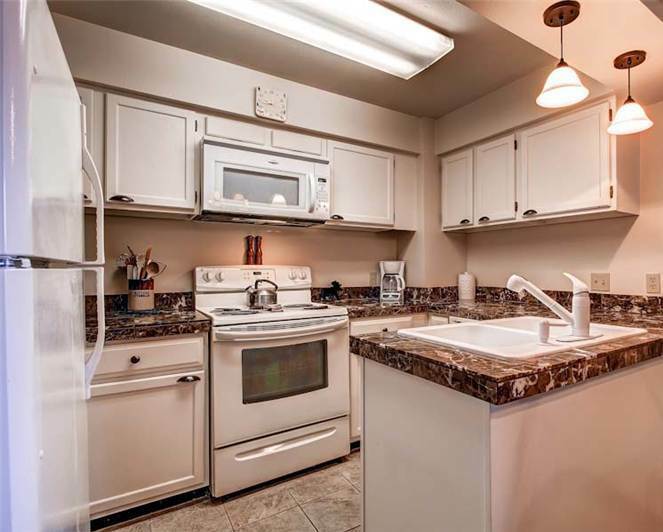 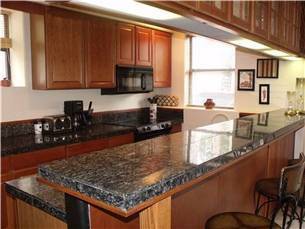 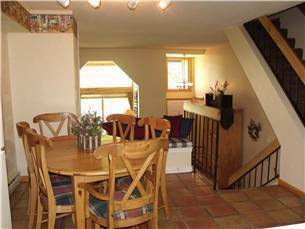 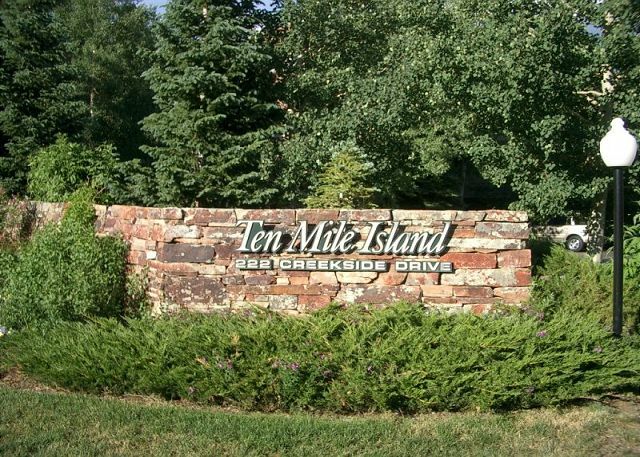 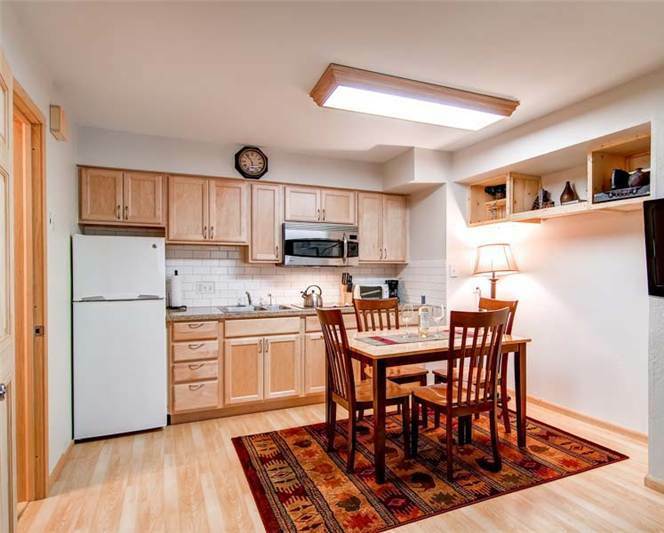 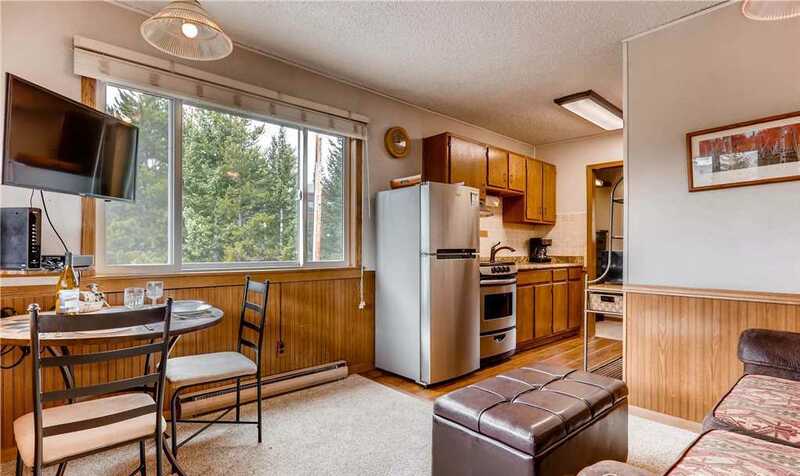 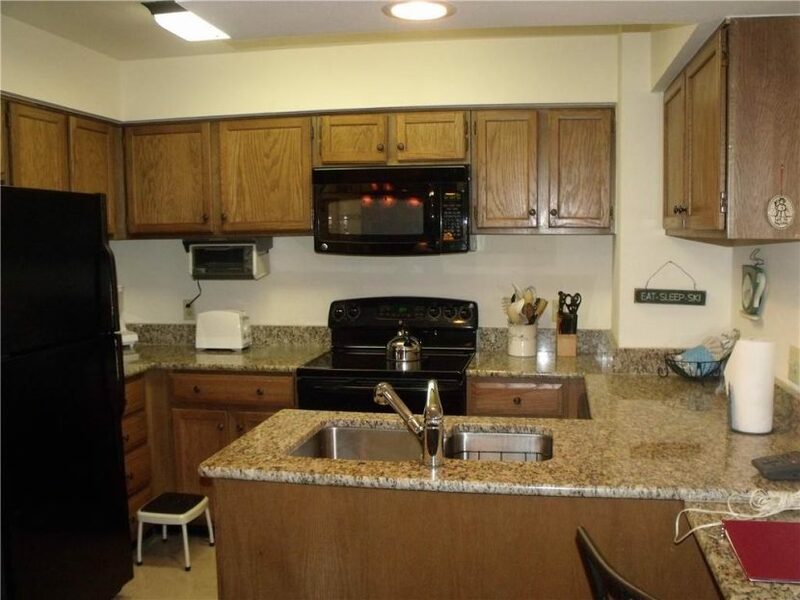 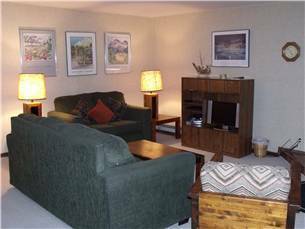 This nicely appointed 2-bedroom, 2-bathroom moderate condo is a great choice for a large family or group of up to eight people. 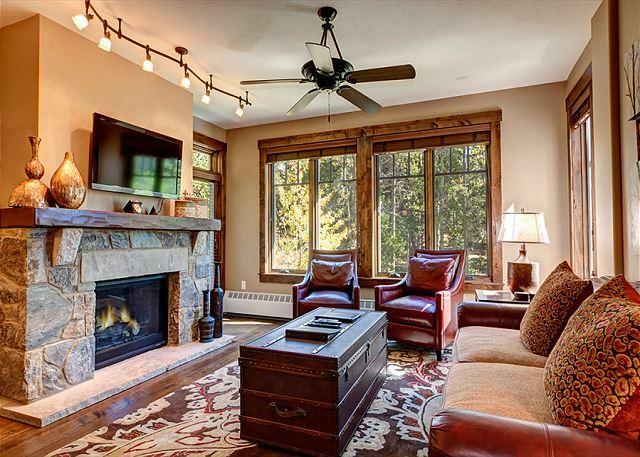 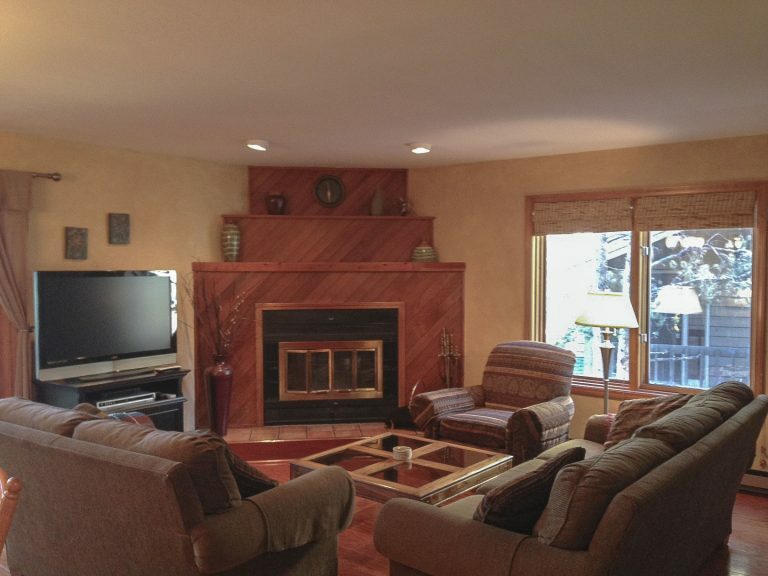 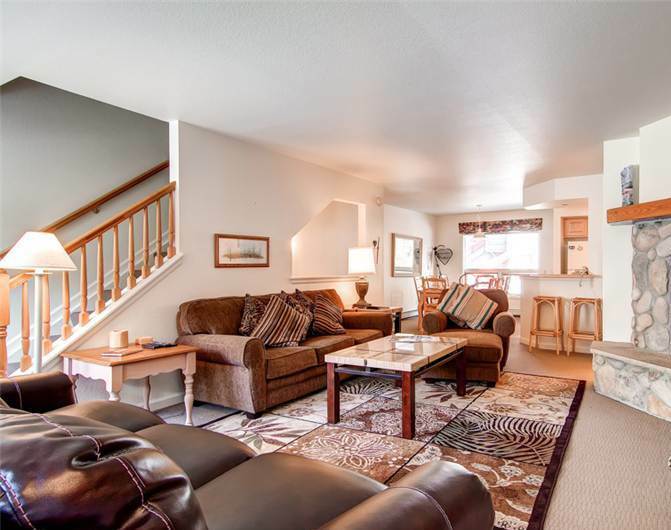 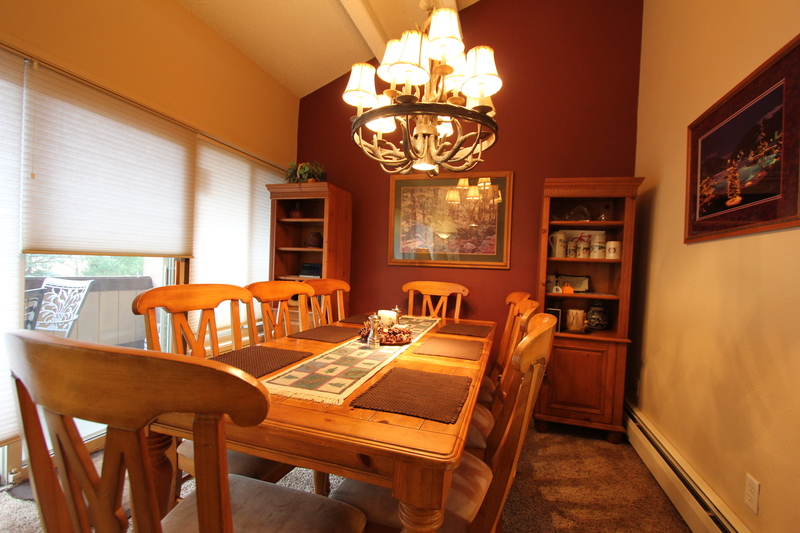 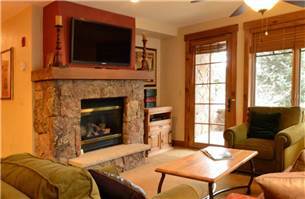 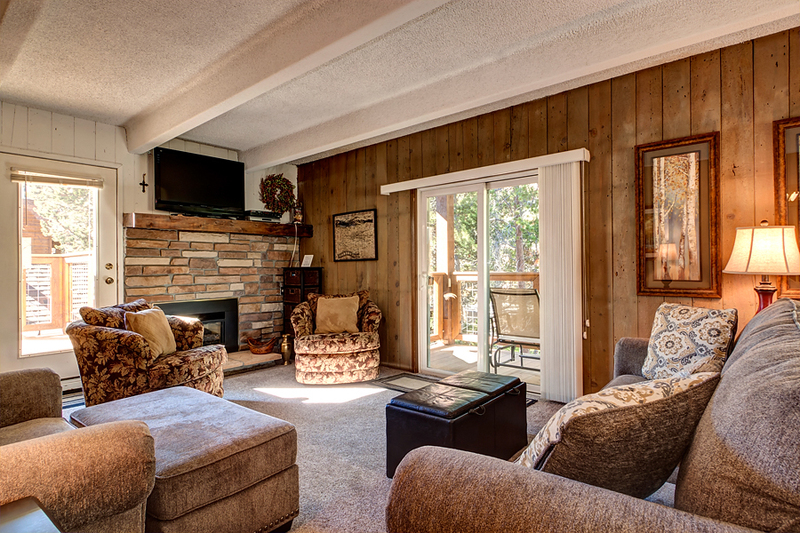 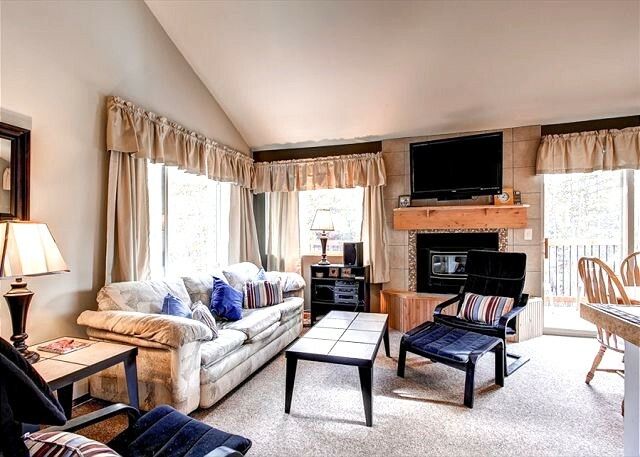 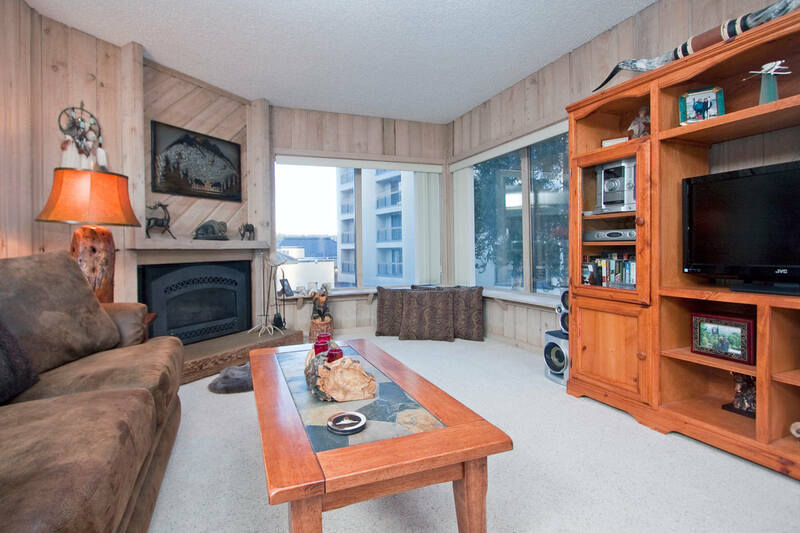 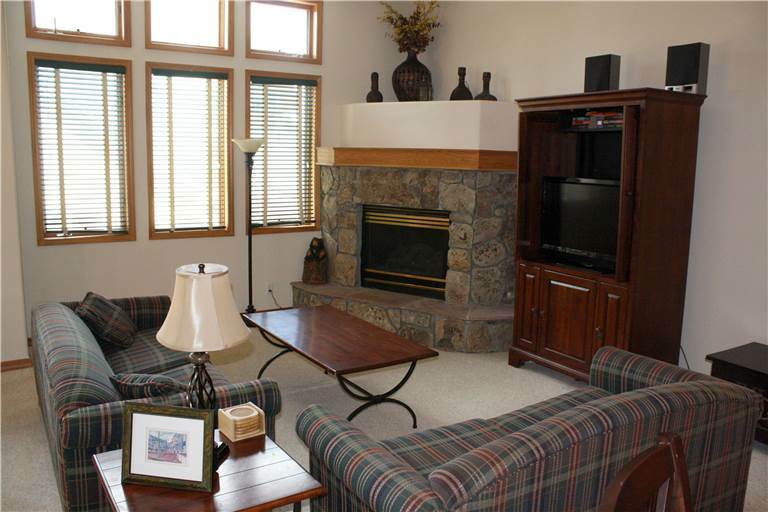 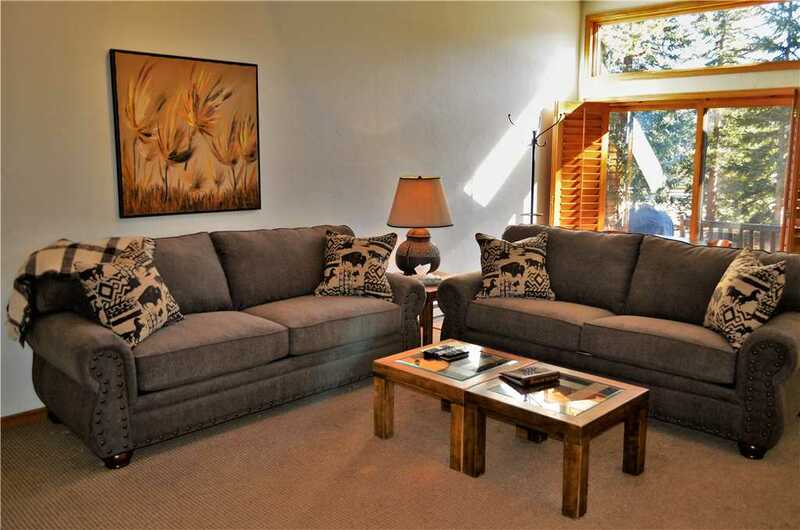 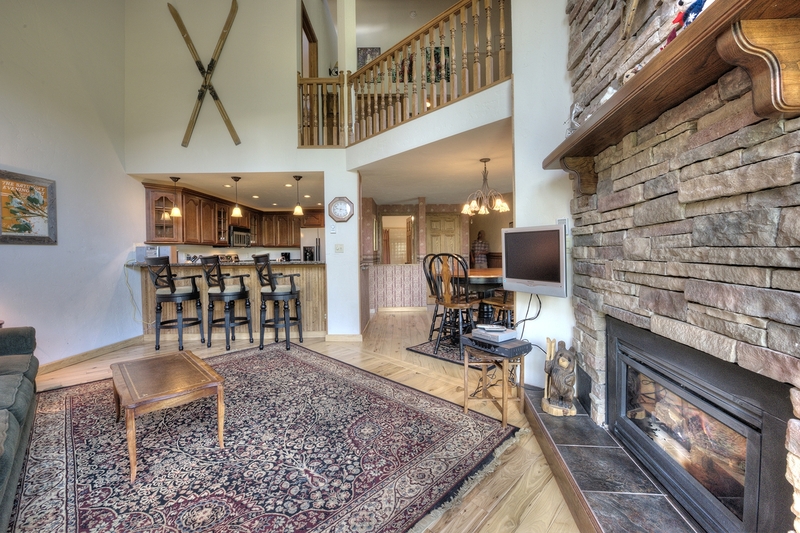 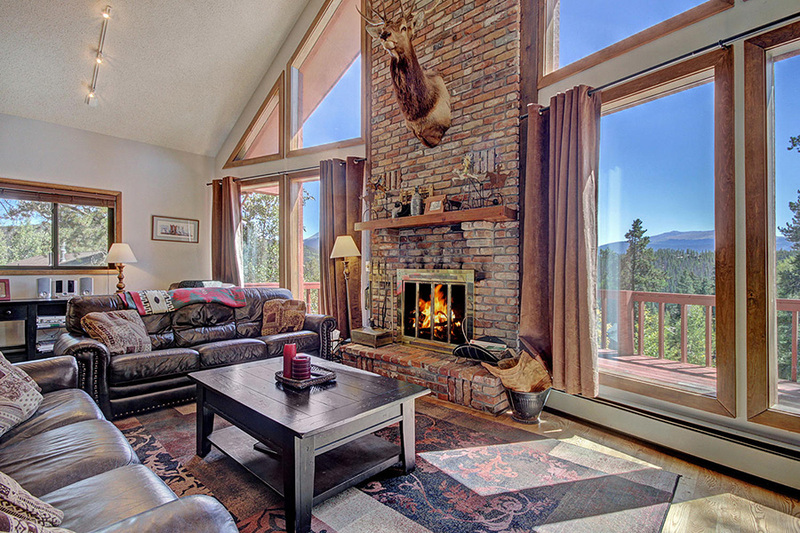 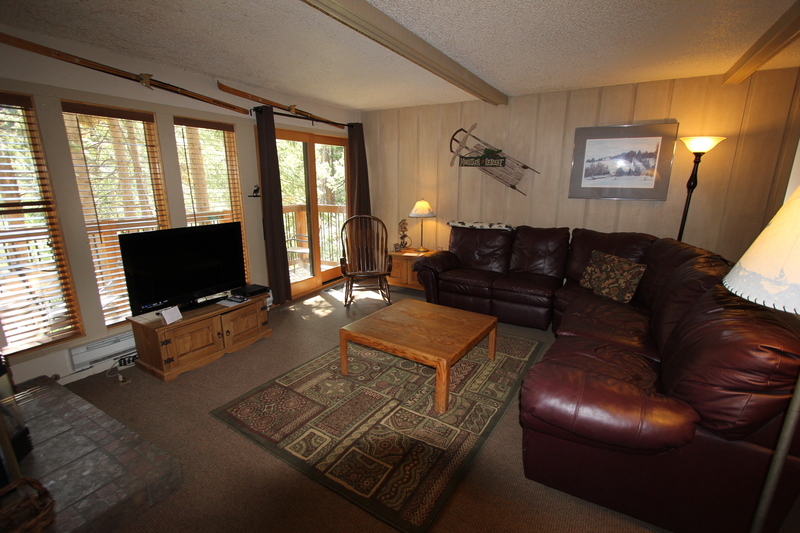 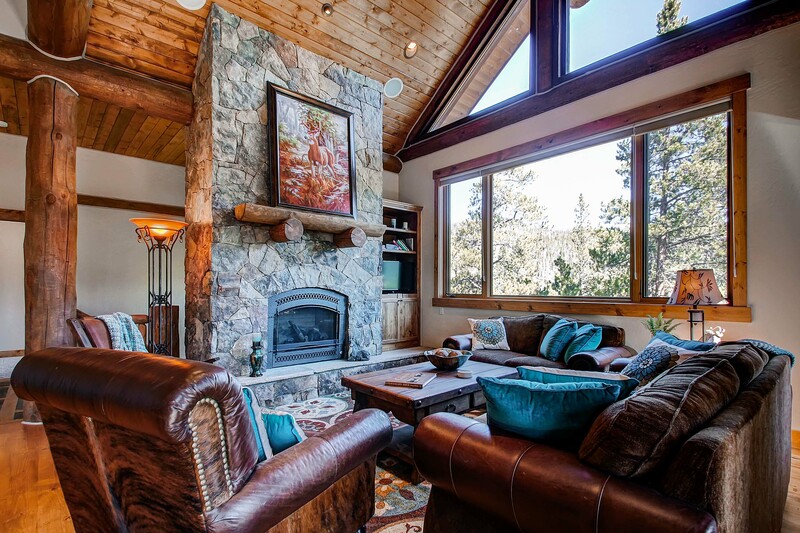 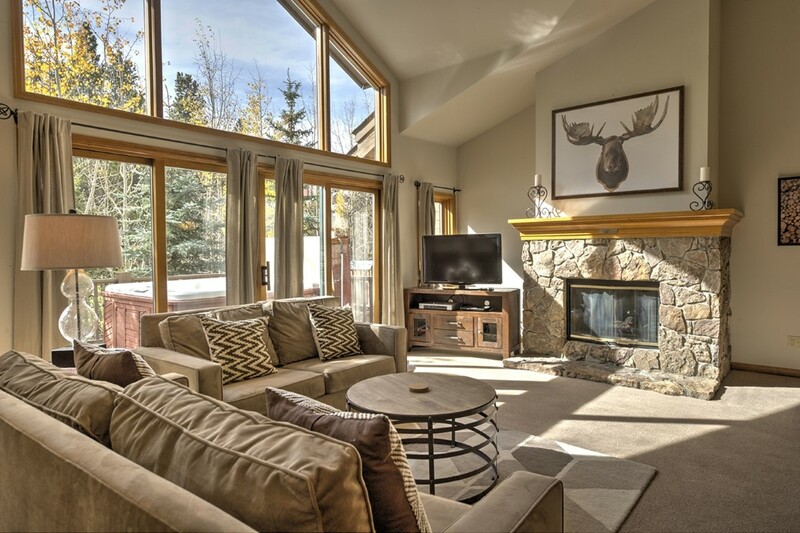 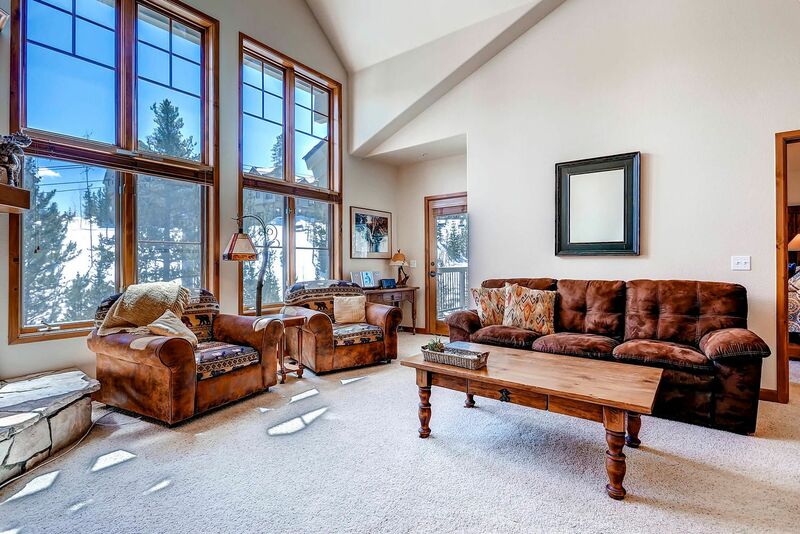 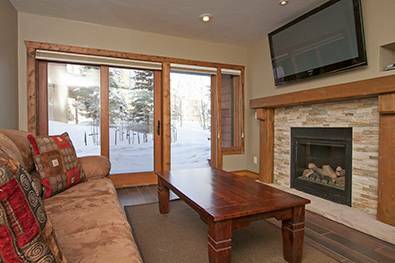 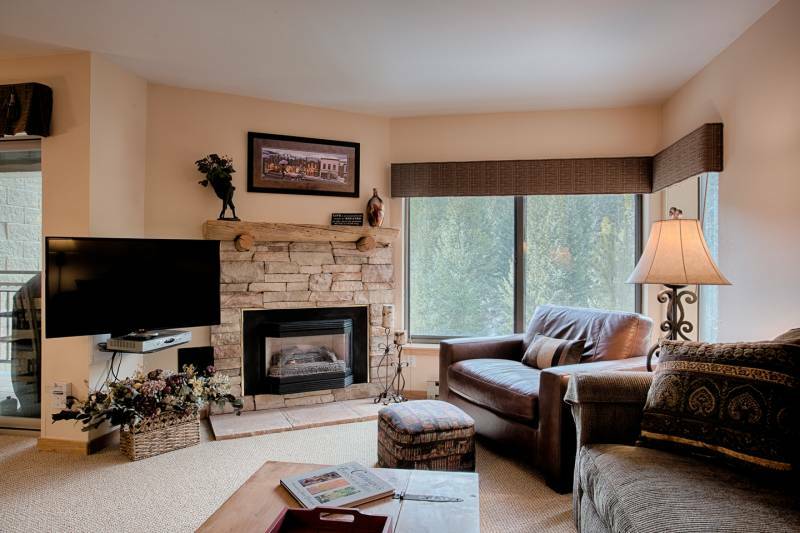 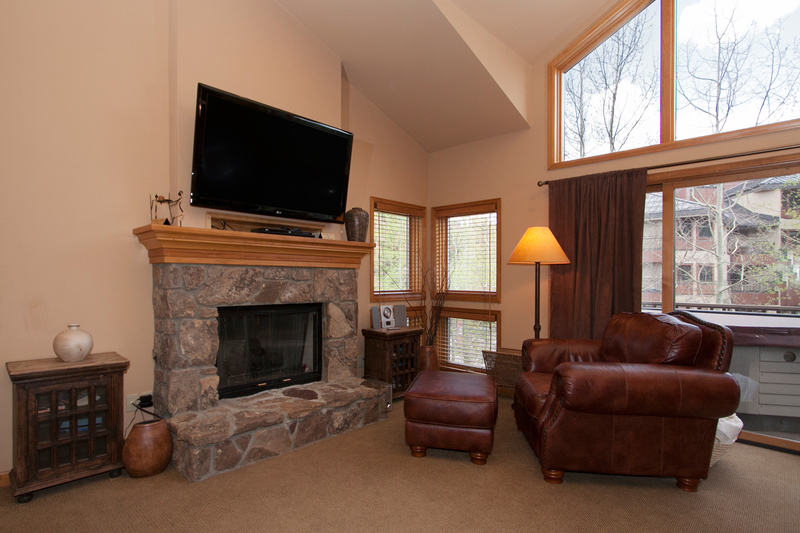 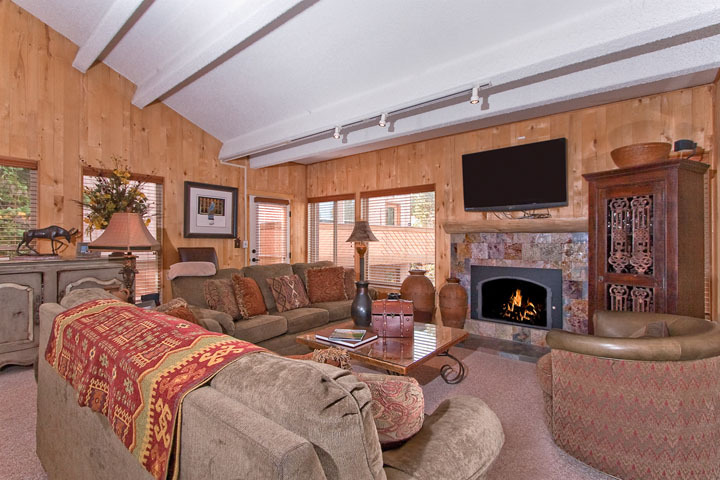 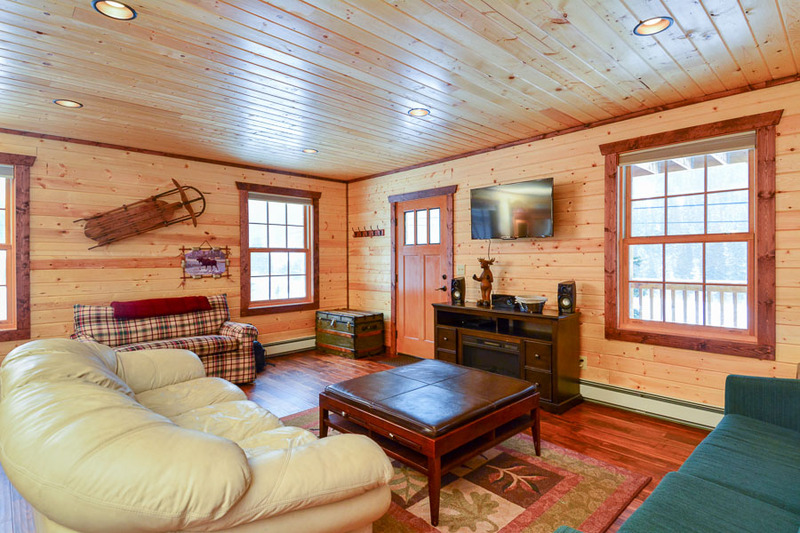 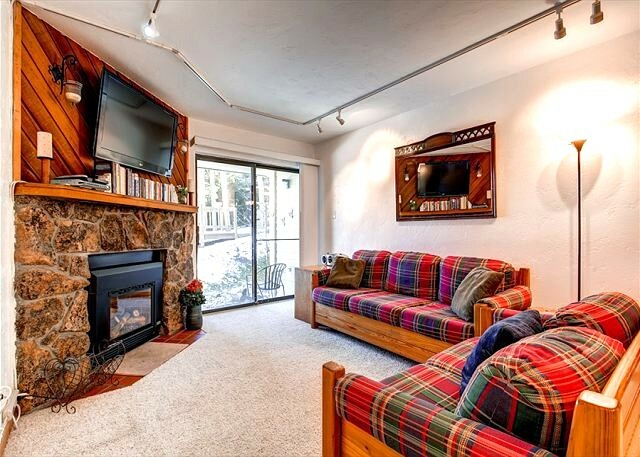 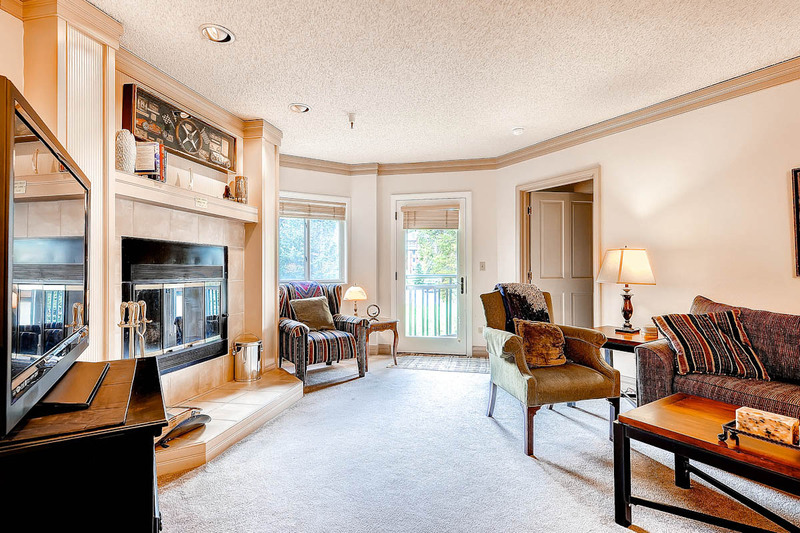 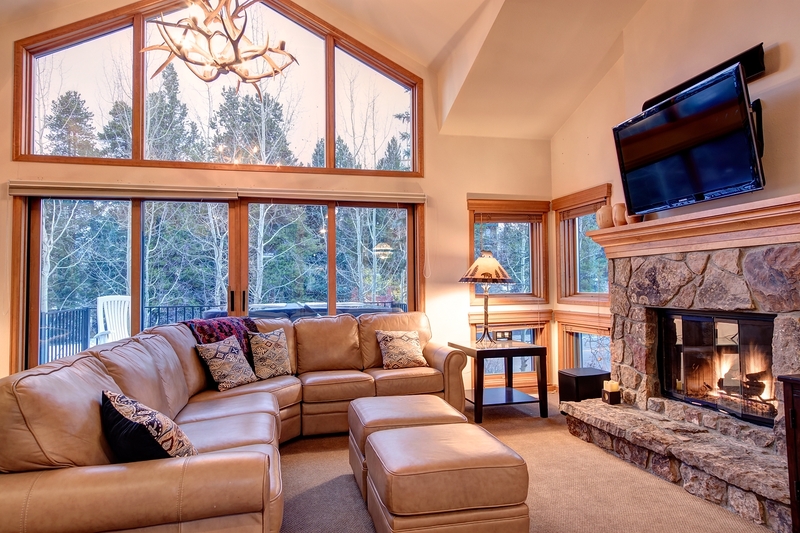 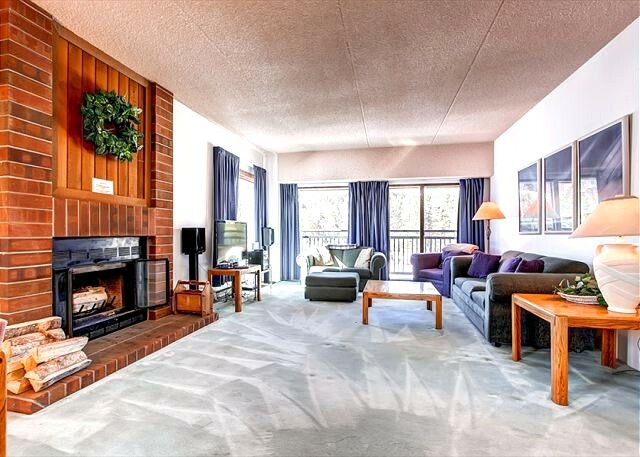 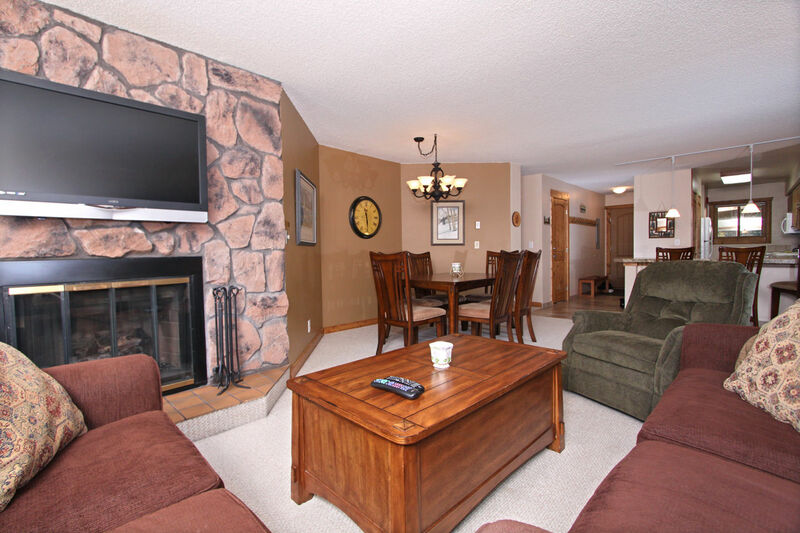 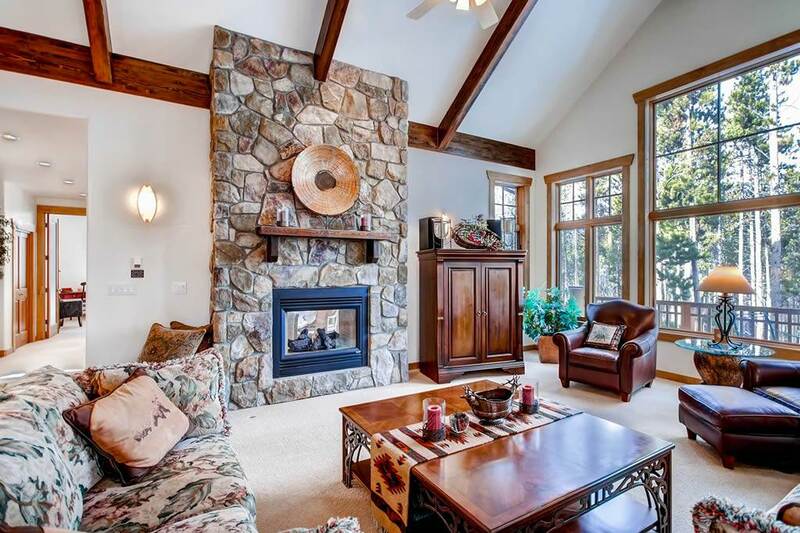 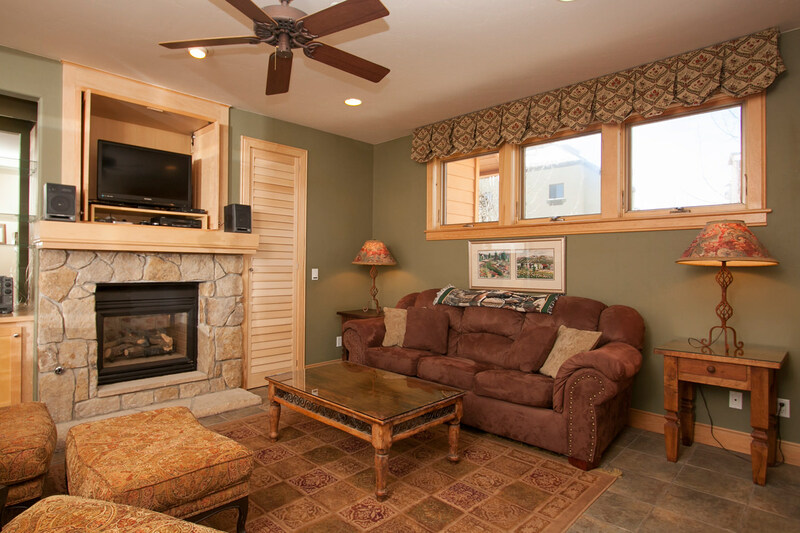 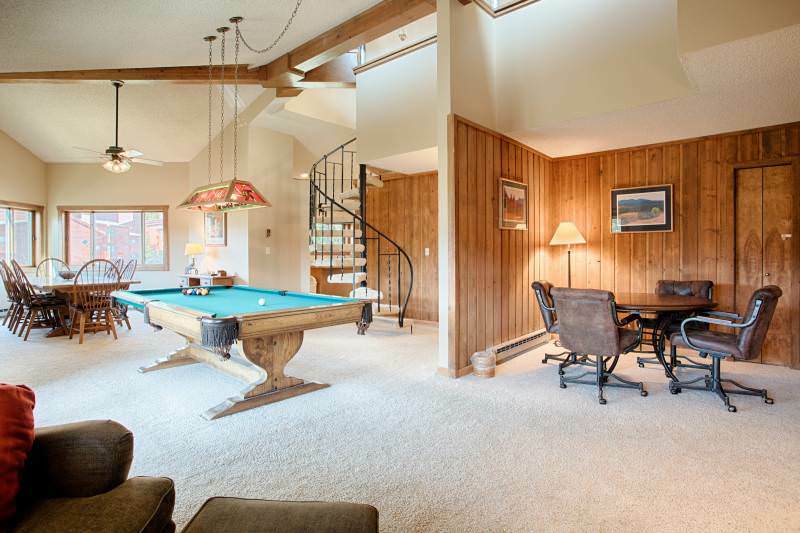 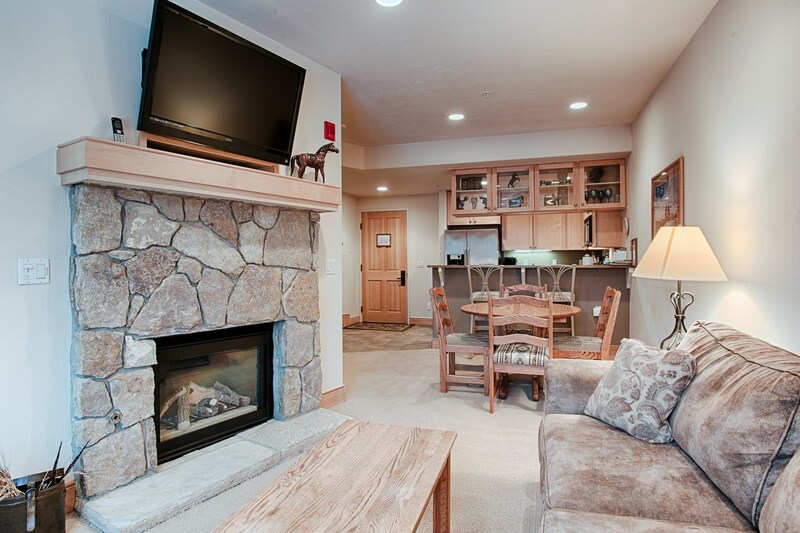 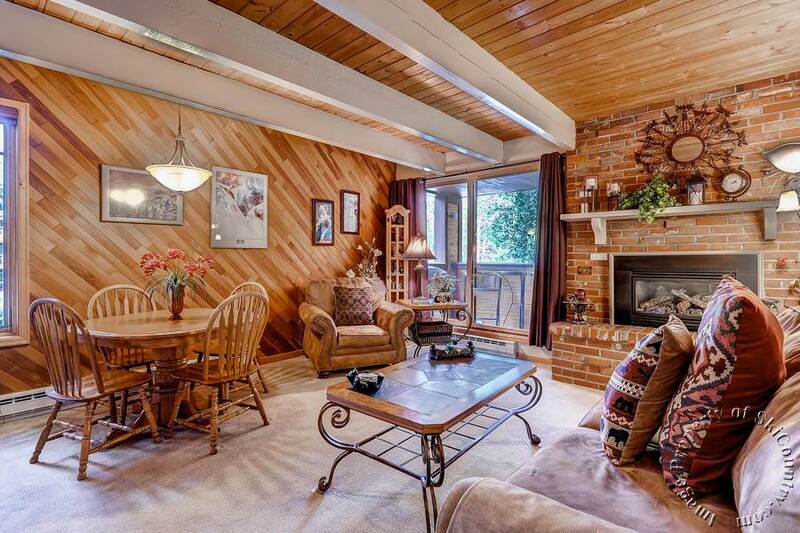 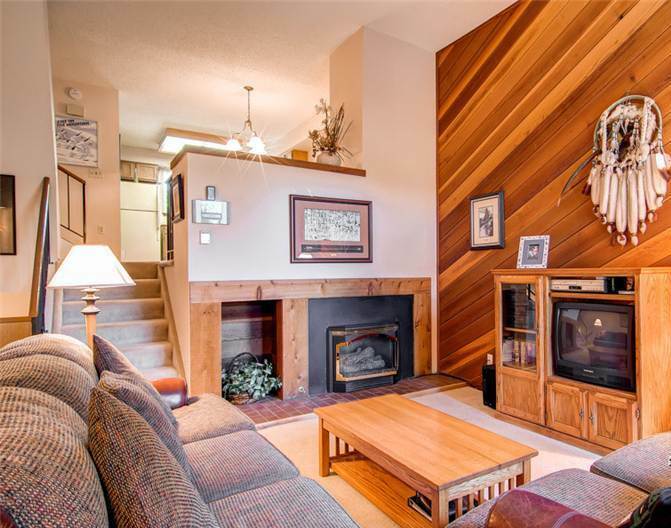 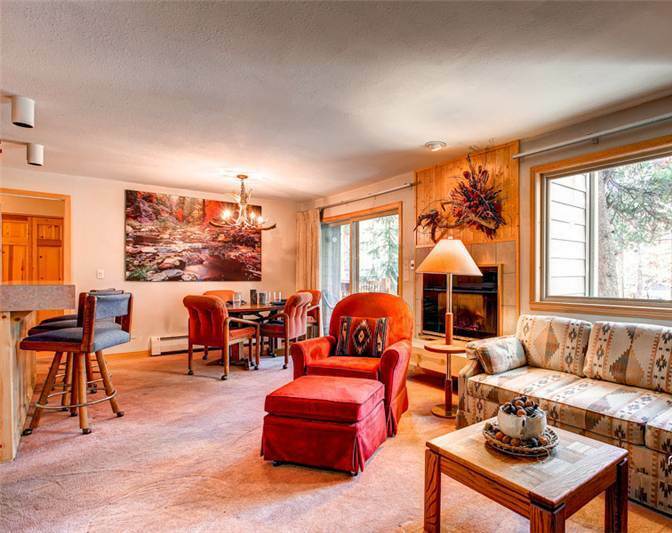 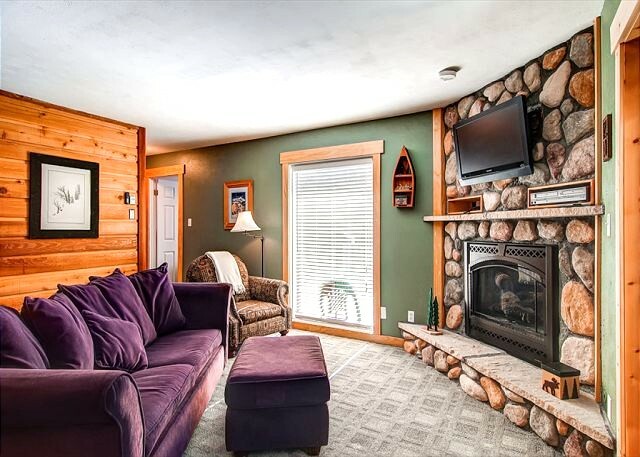 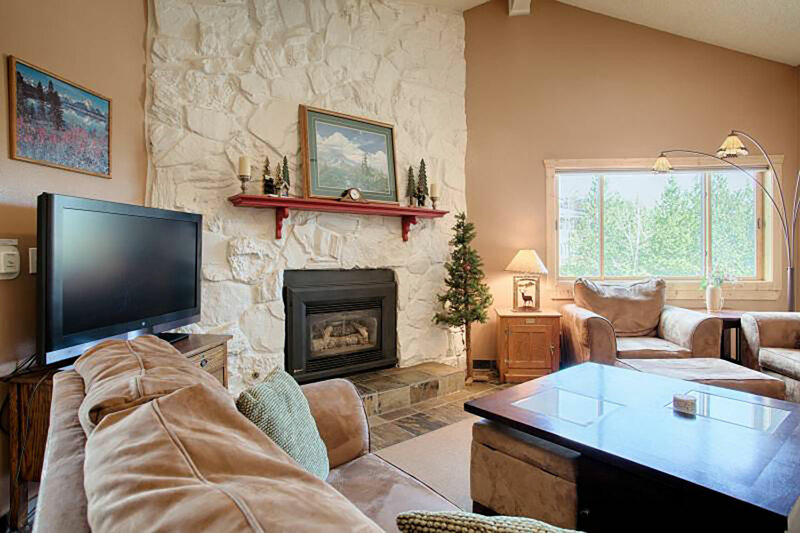 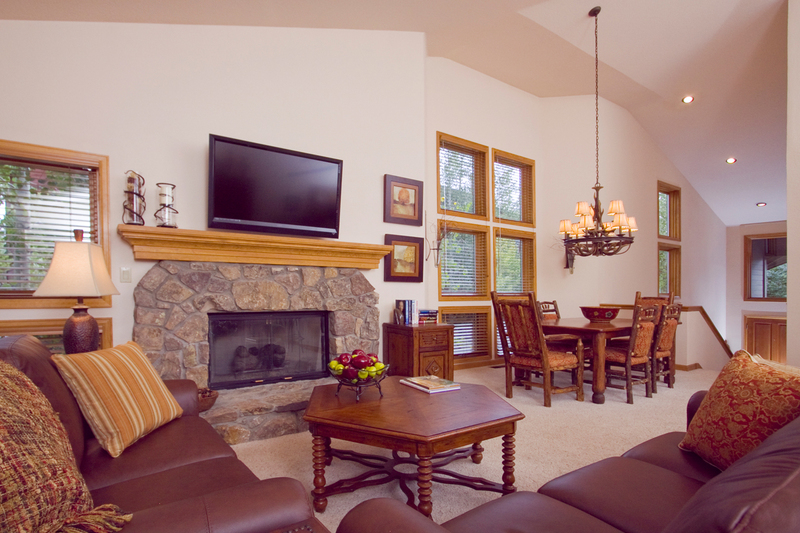 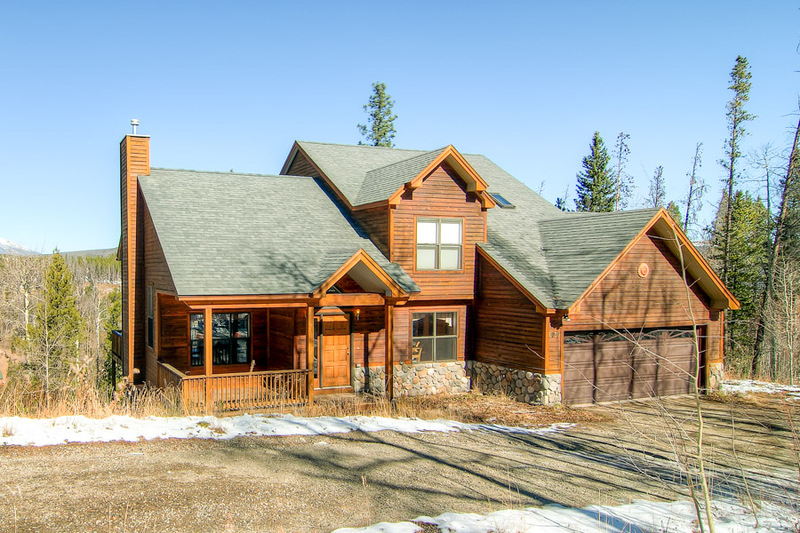 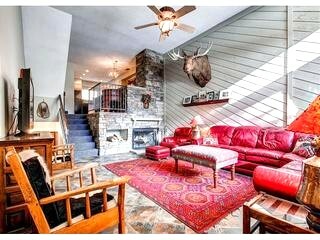 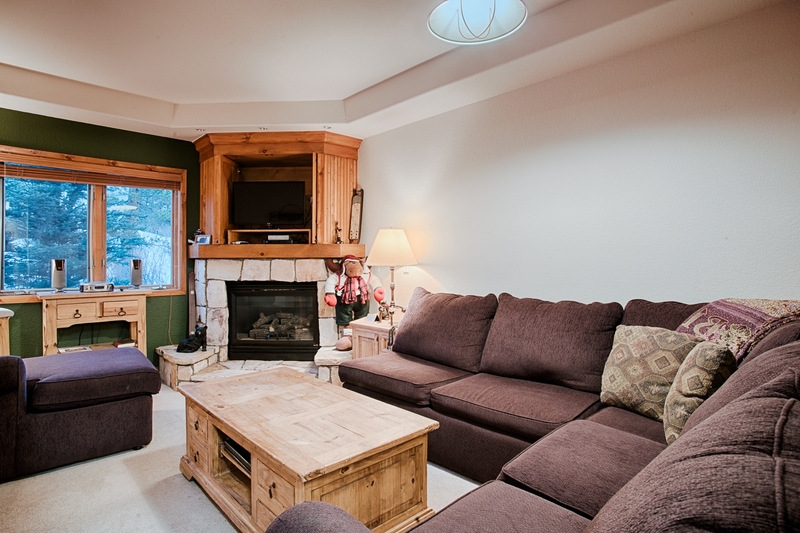 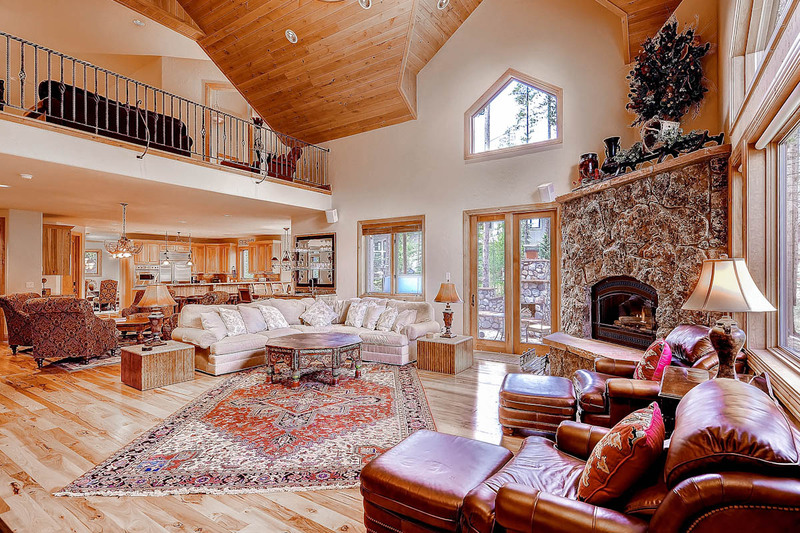 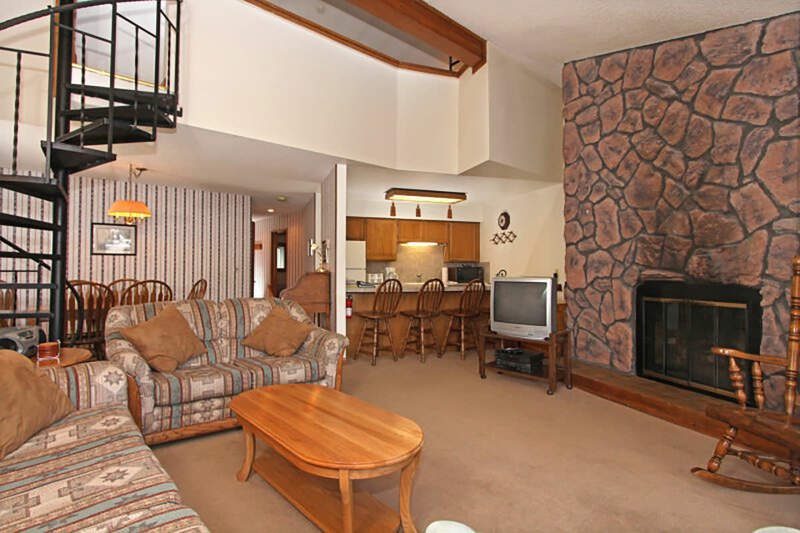 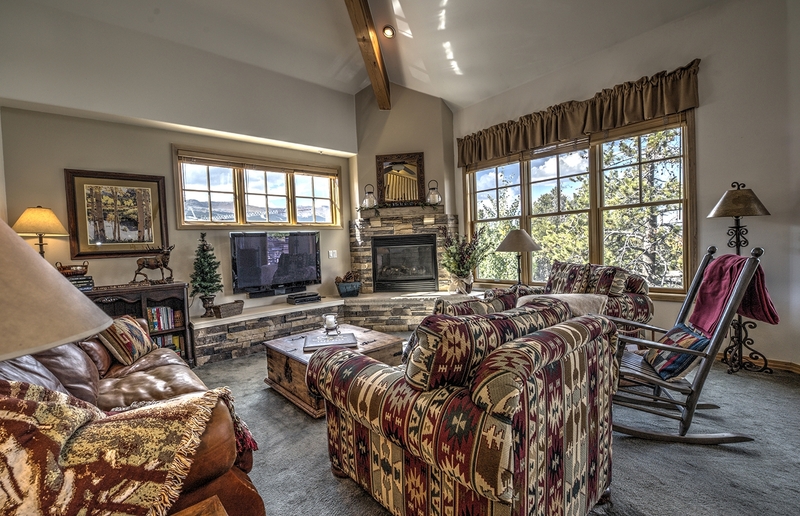 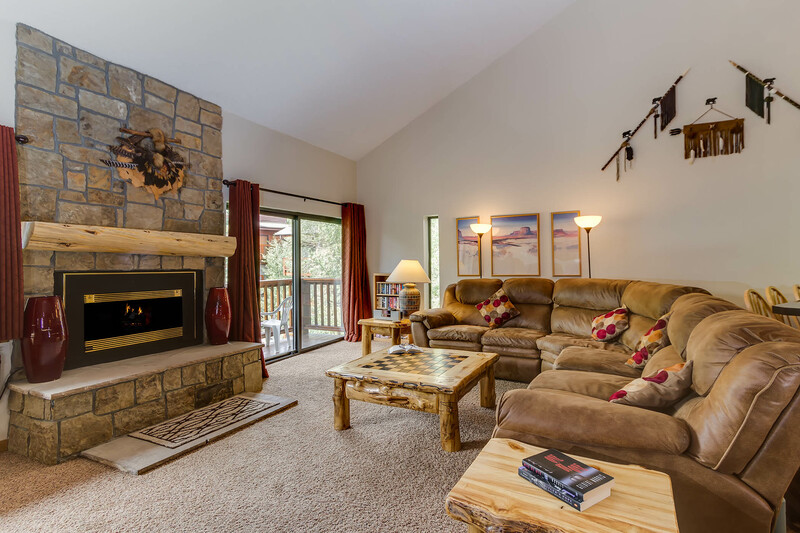 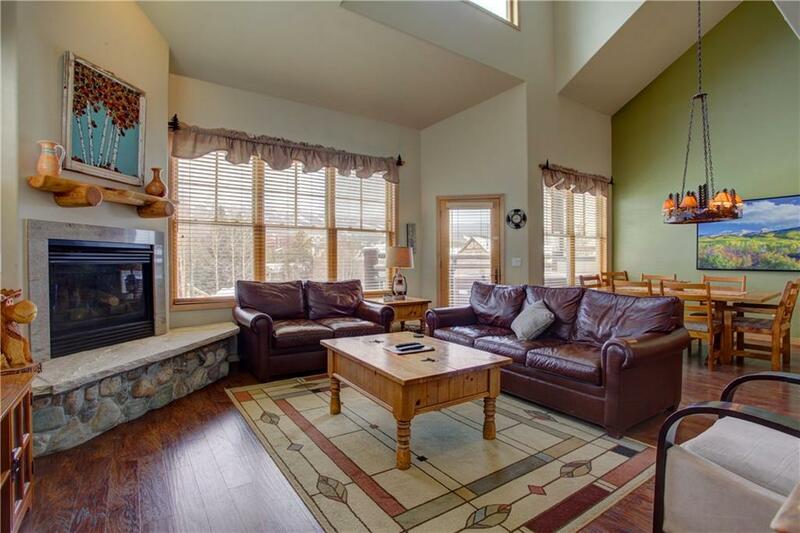 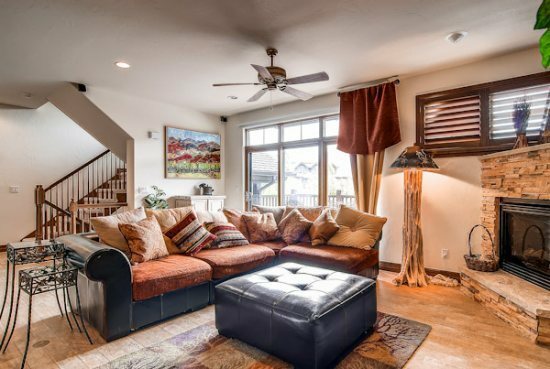 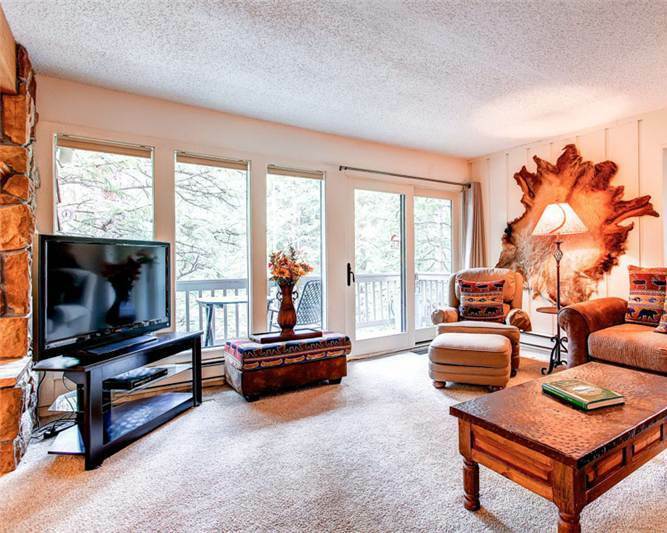 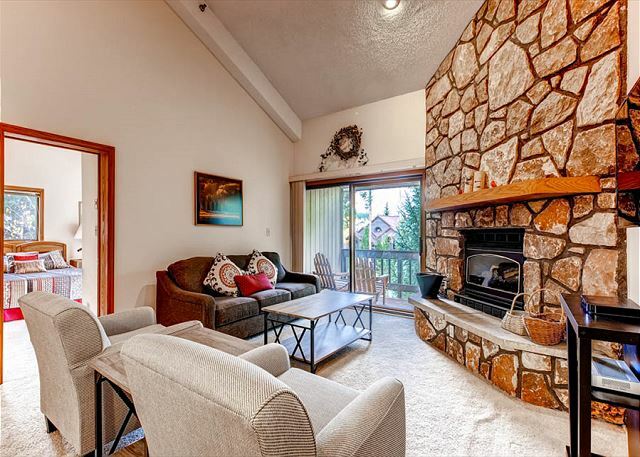 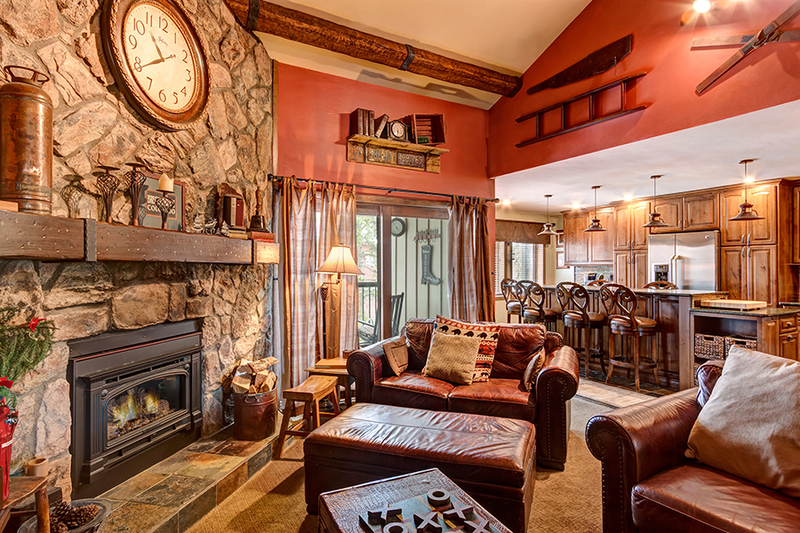 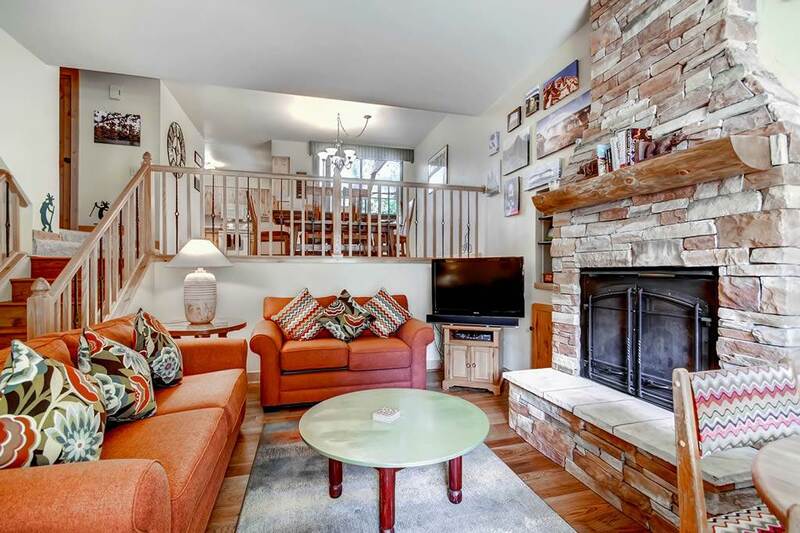 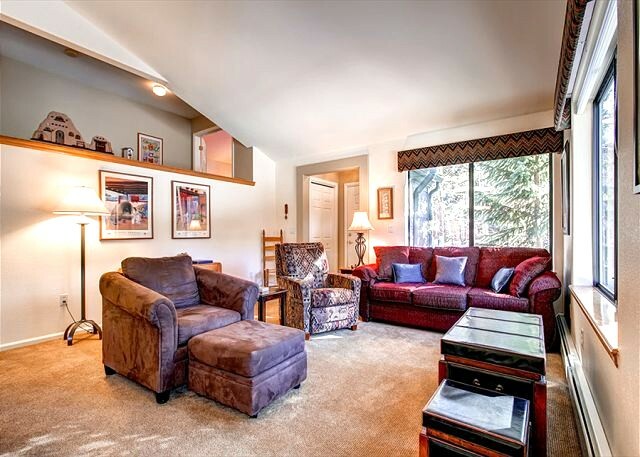 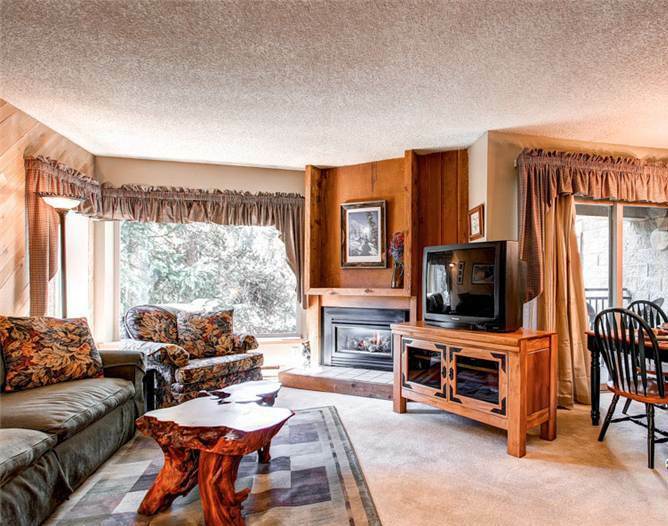 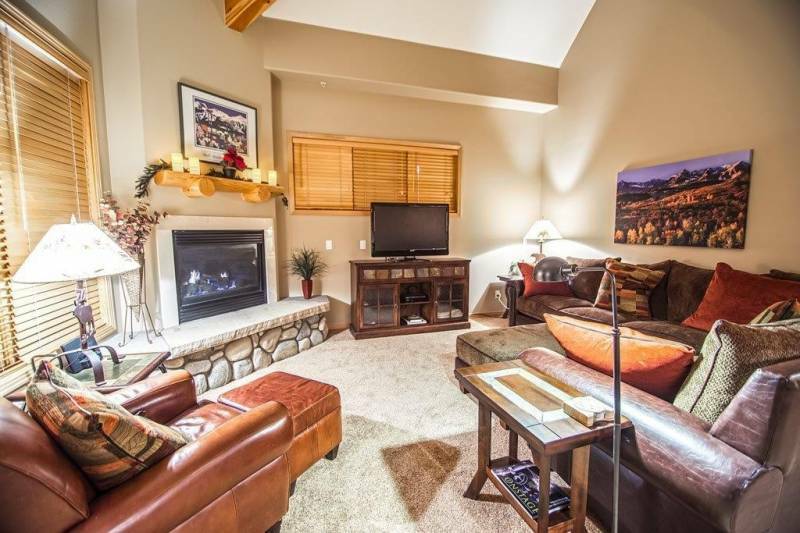 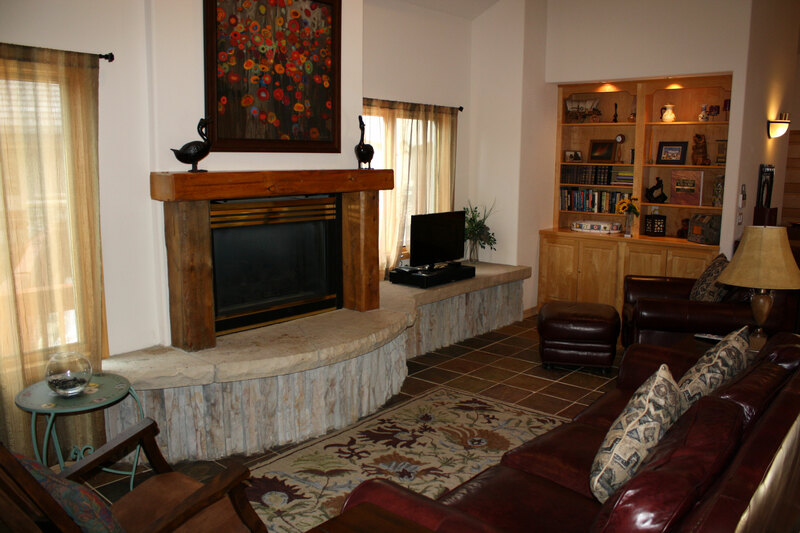 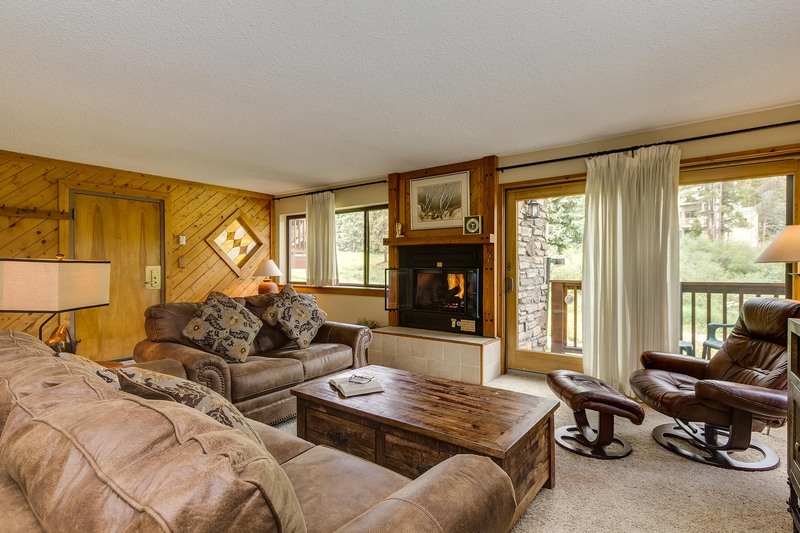 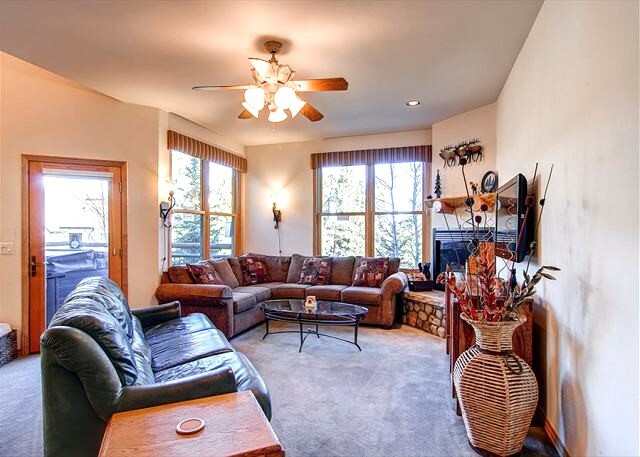 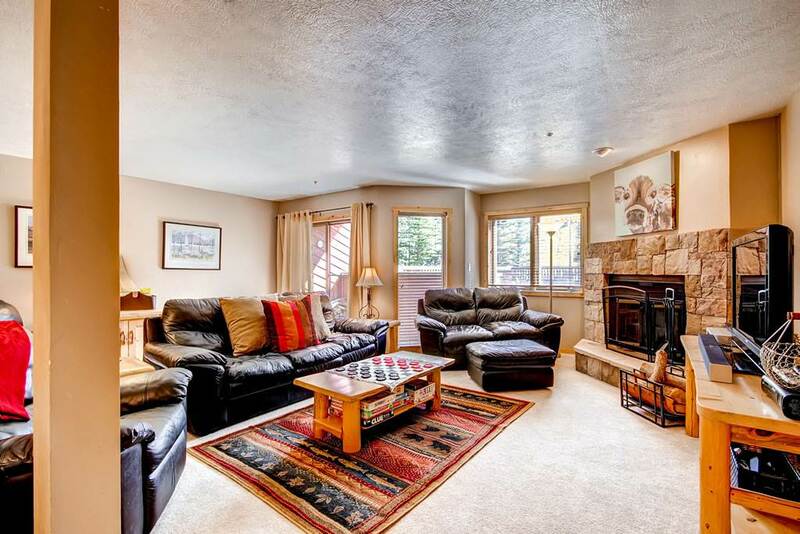 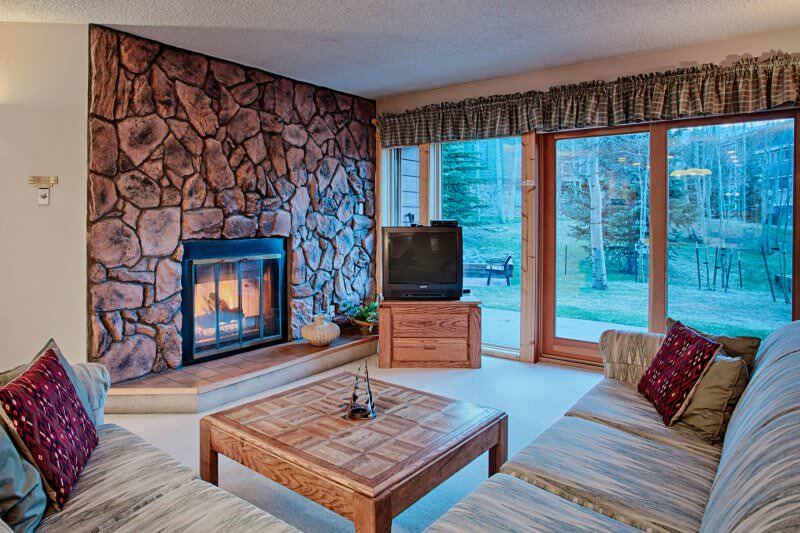 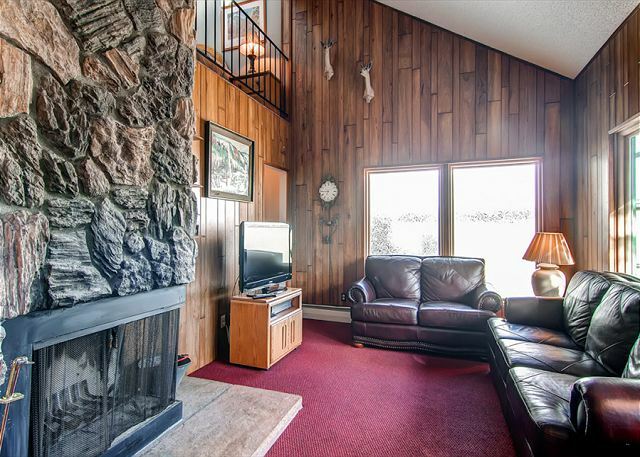 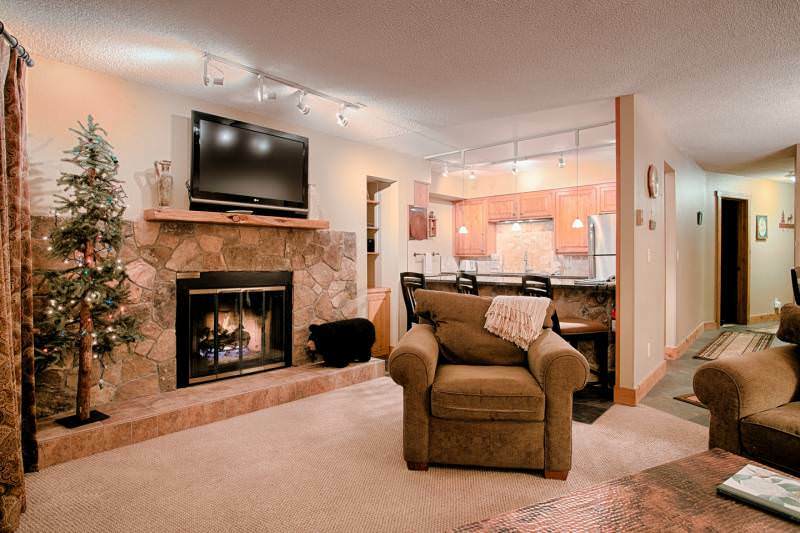 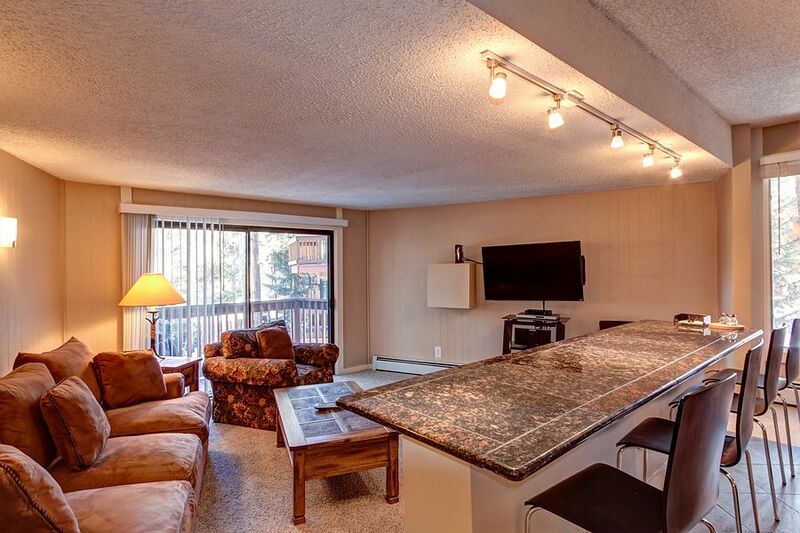 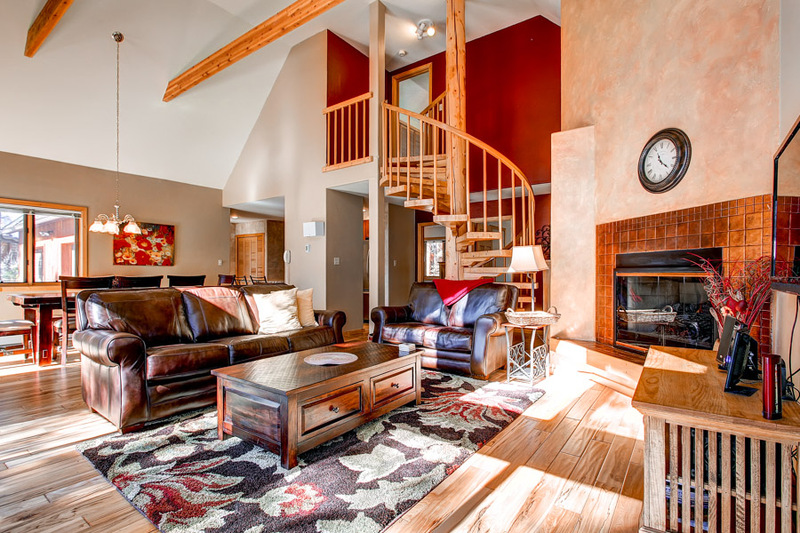 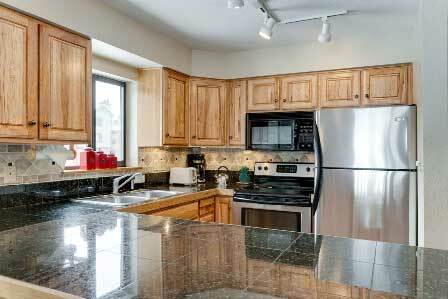 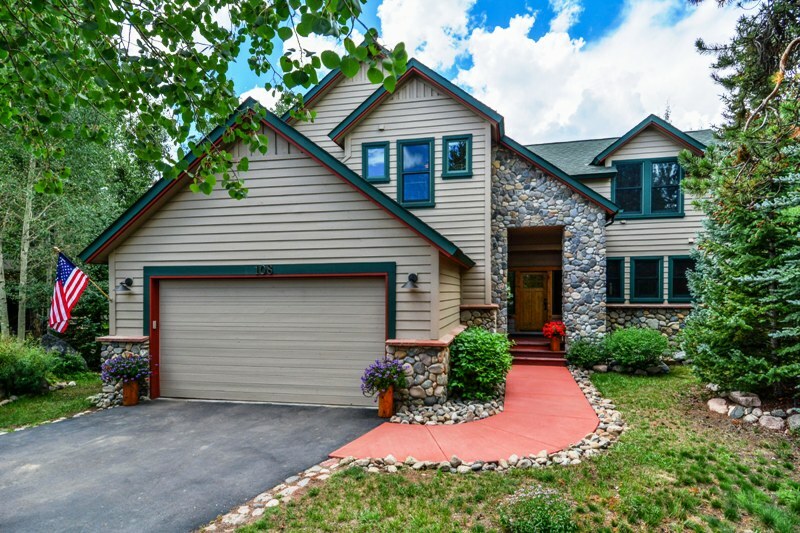 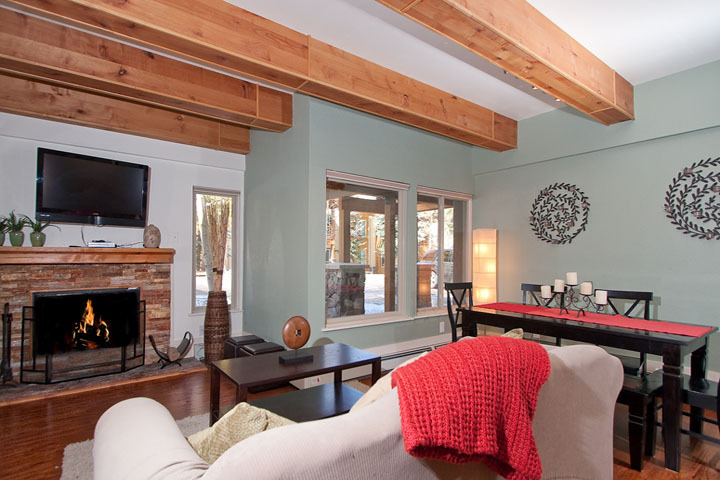 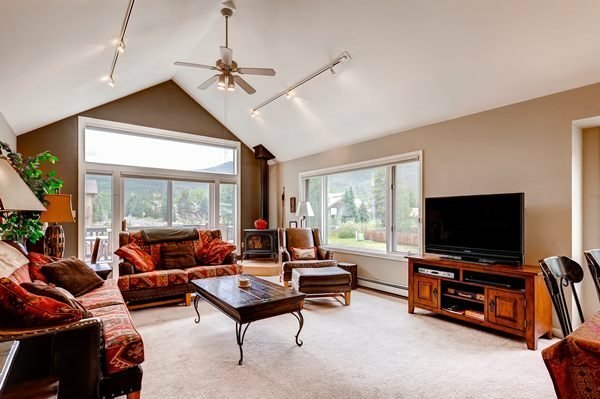 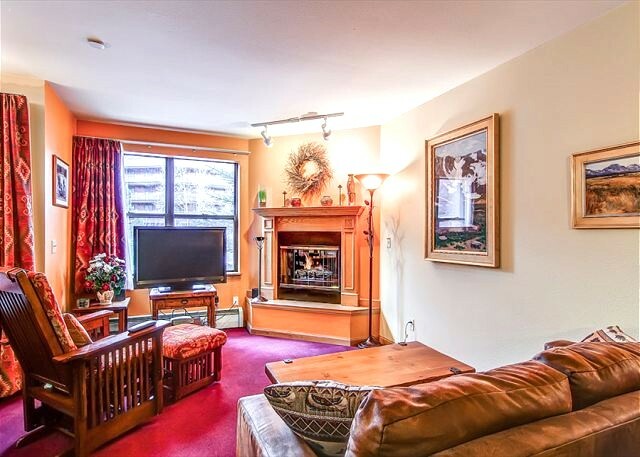 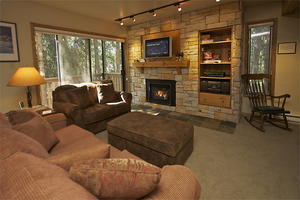 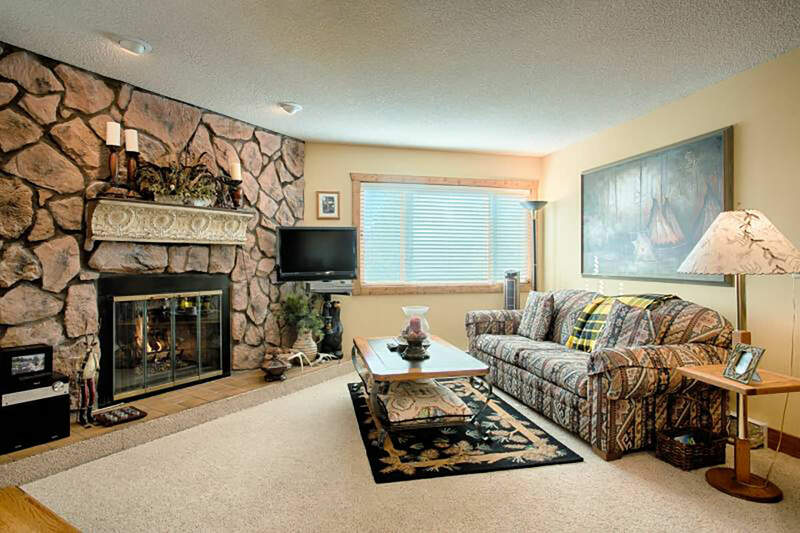 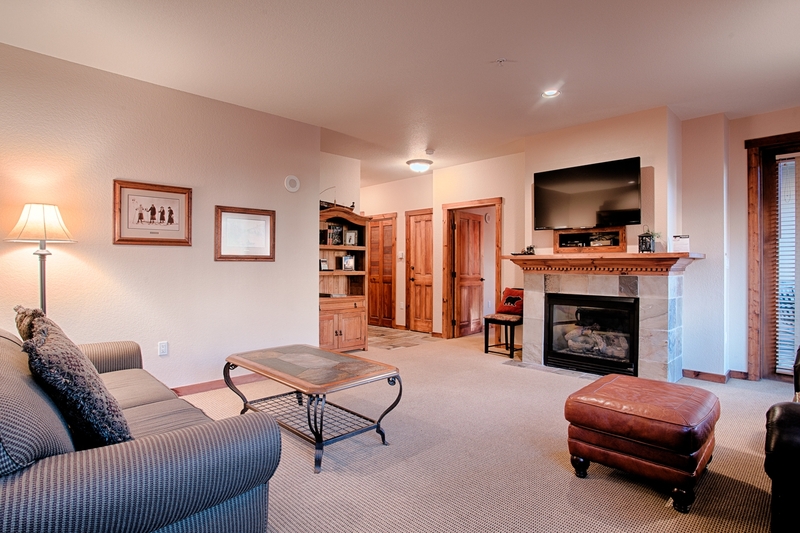 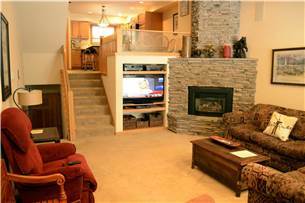 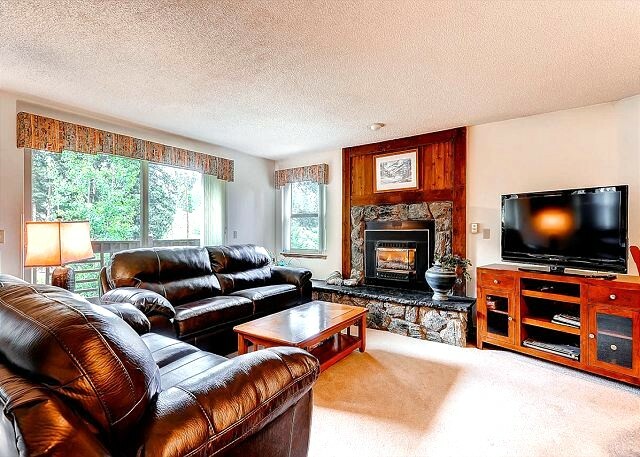 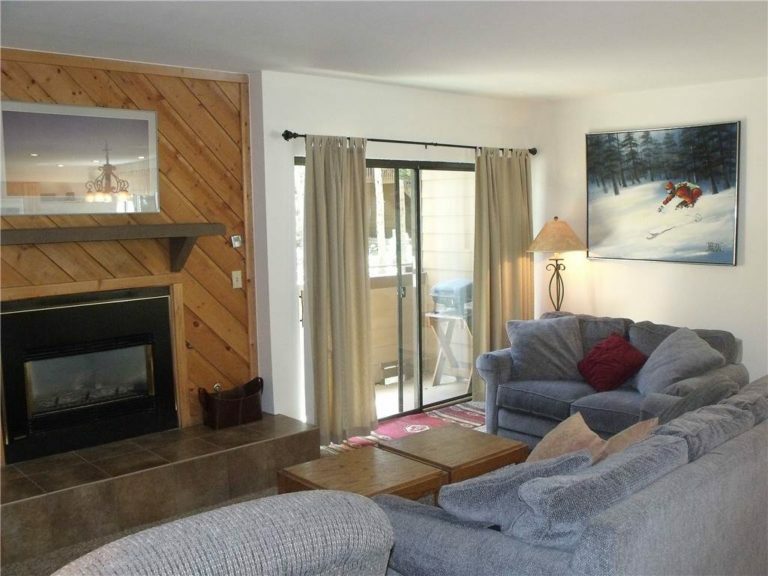 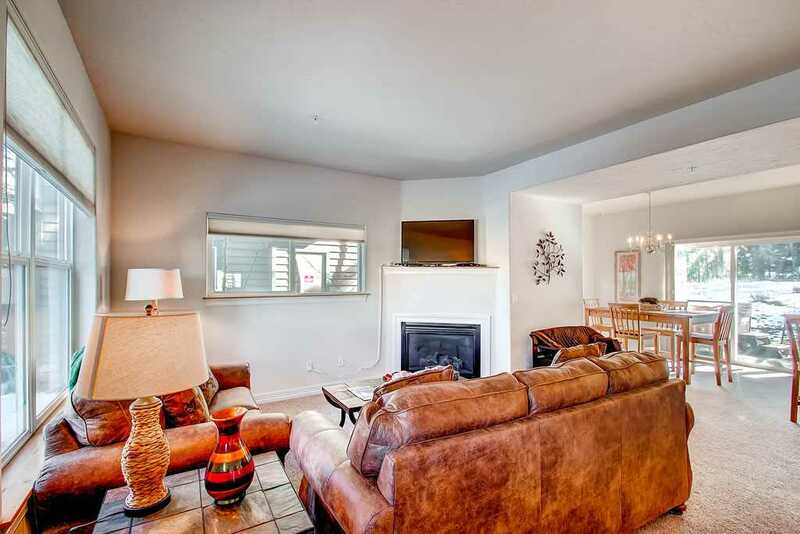 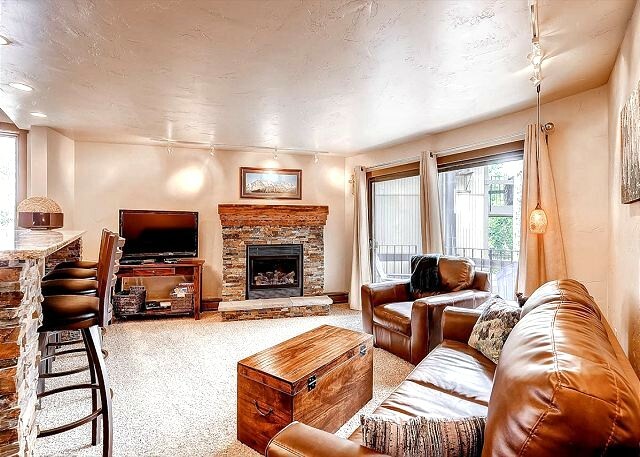 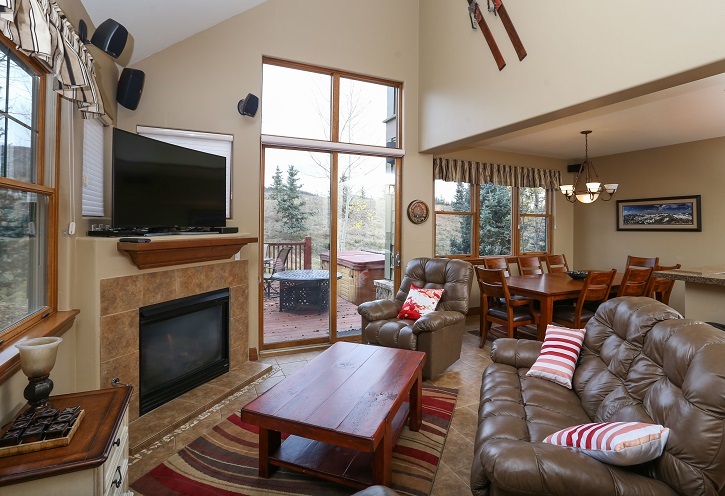 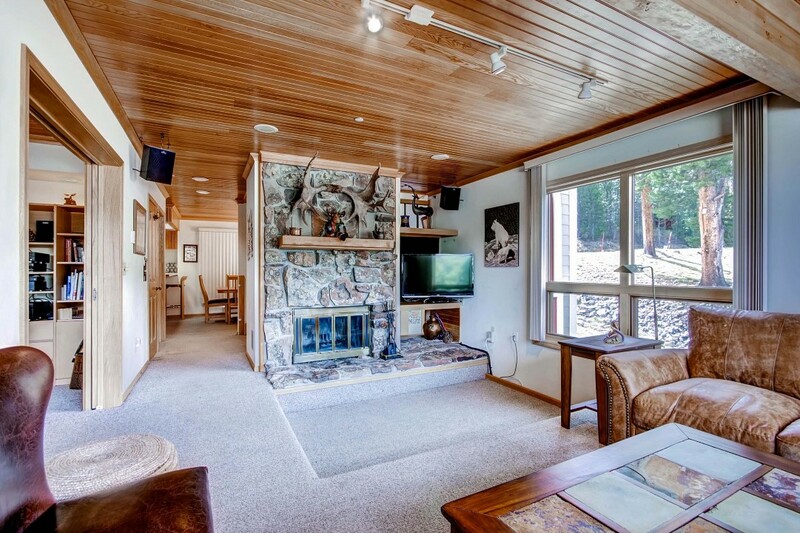 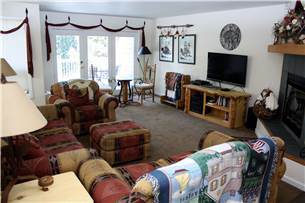 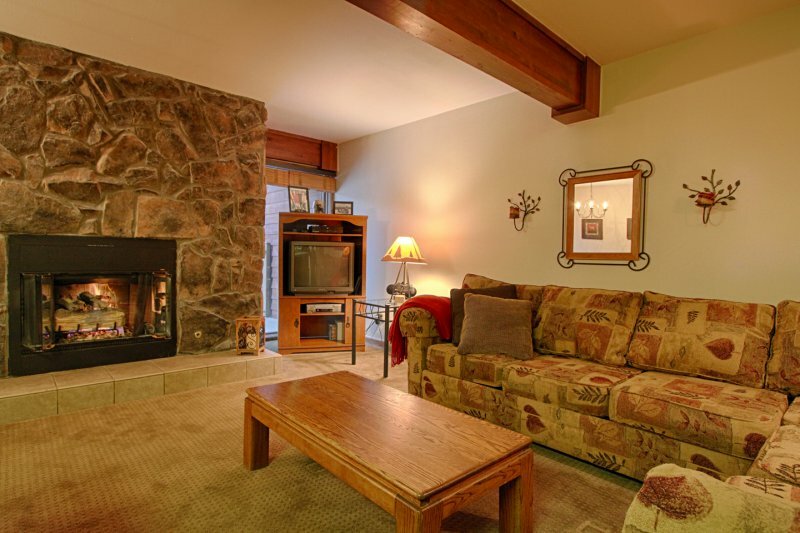 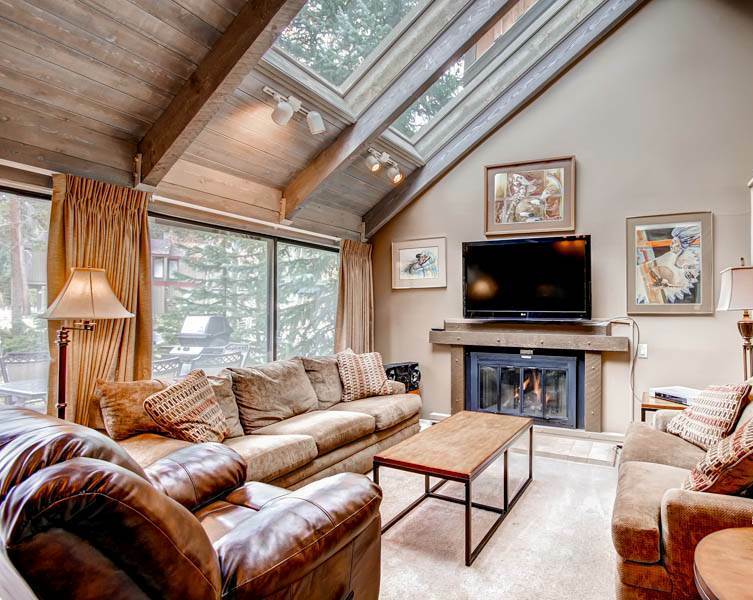 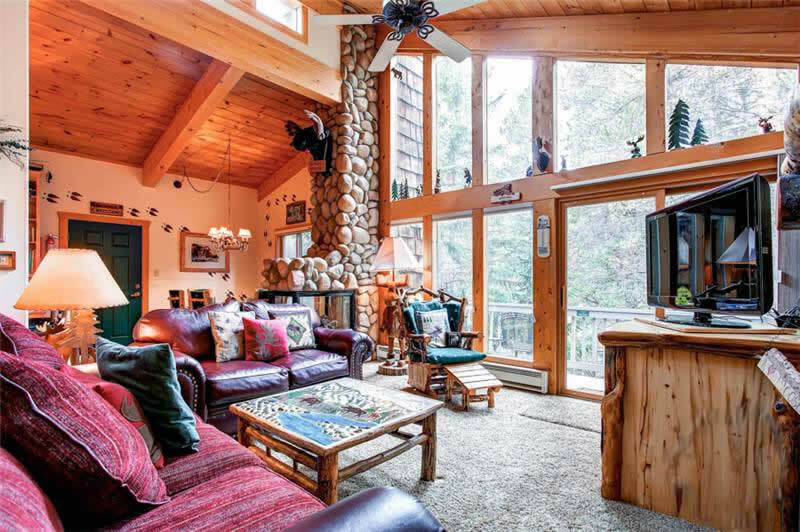 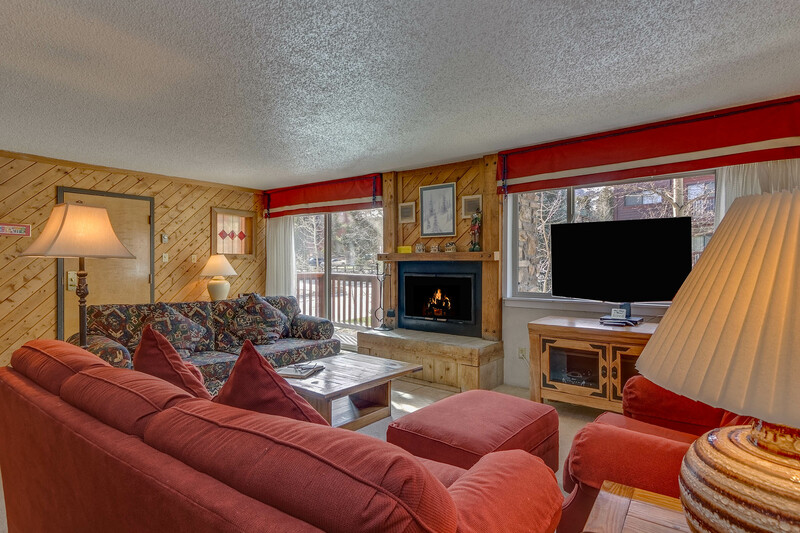 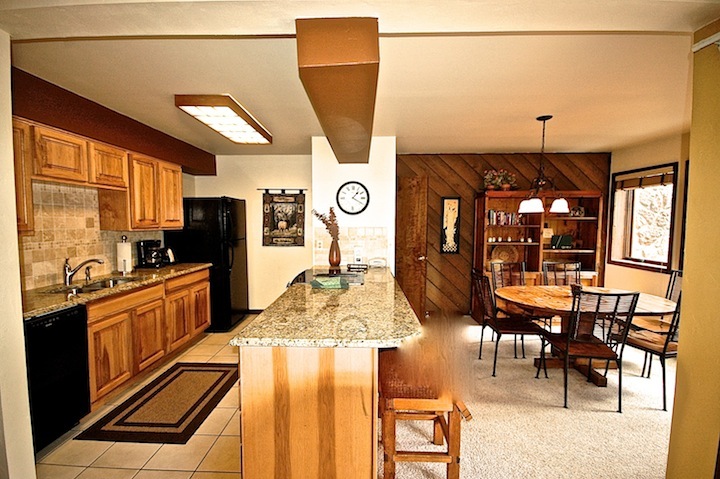 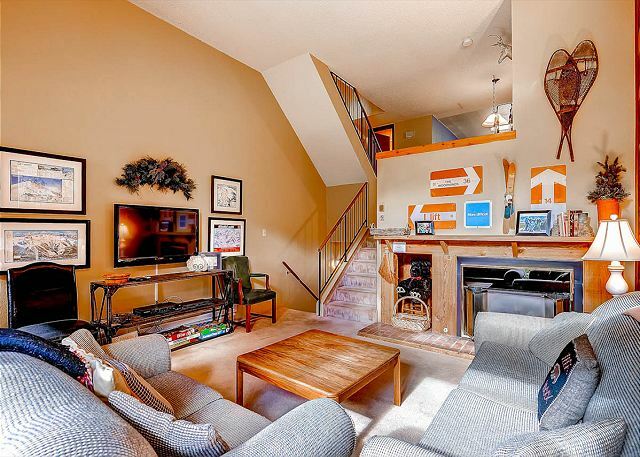 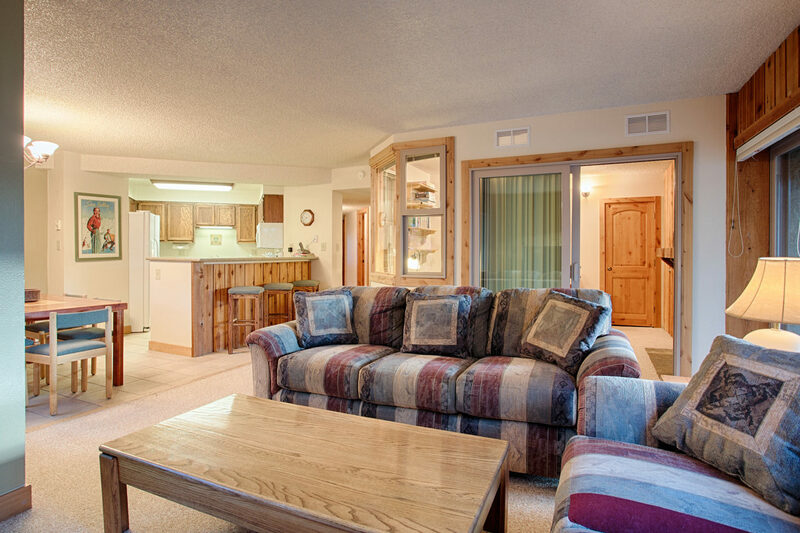 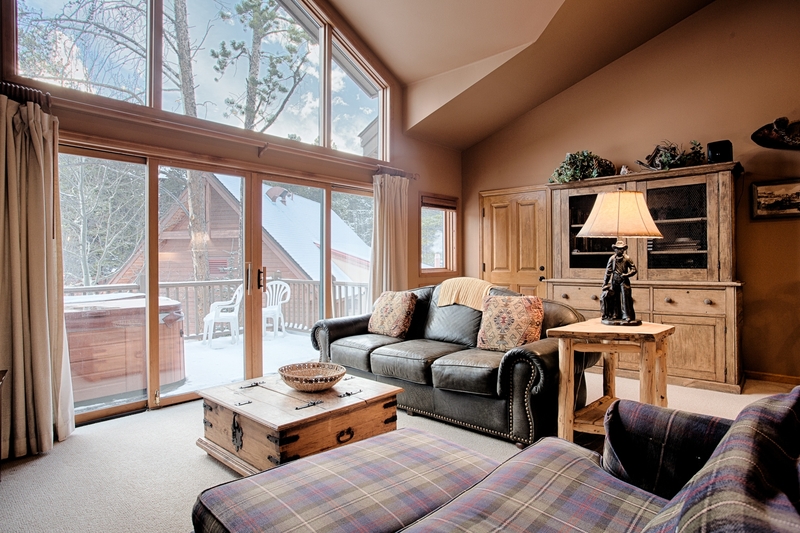 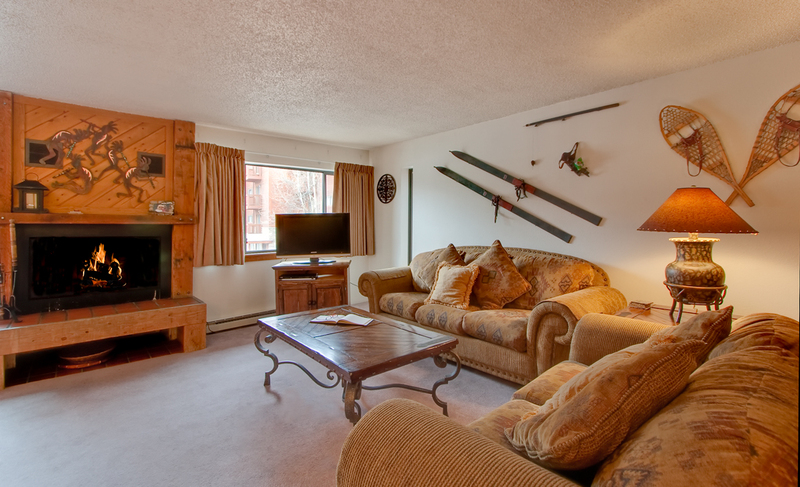 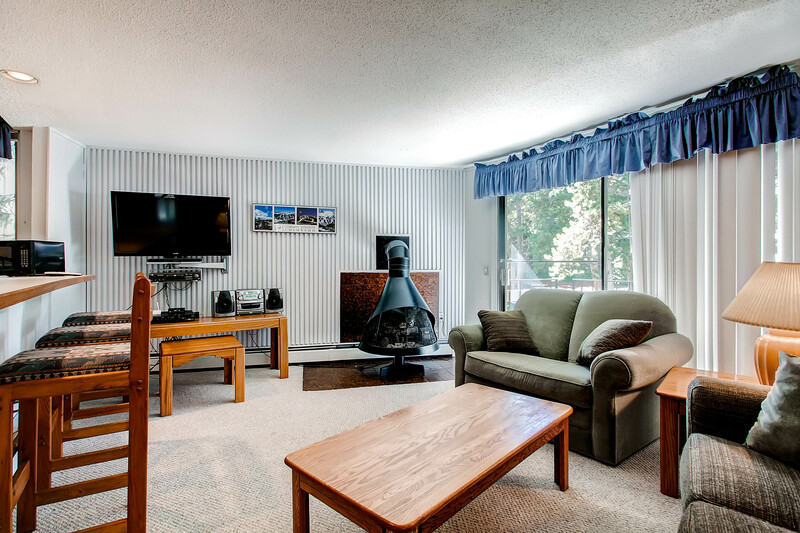 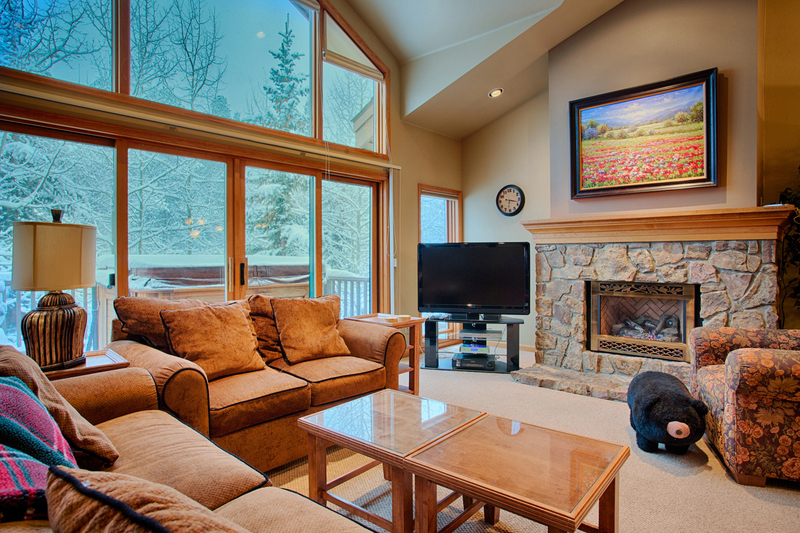 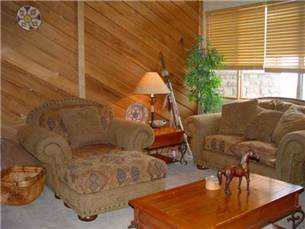 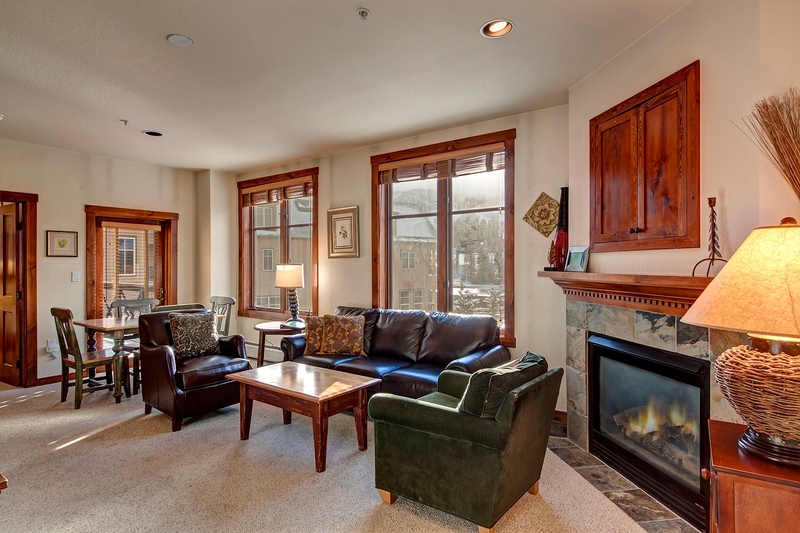 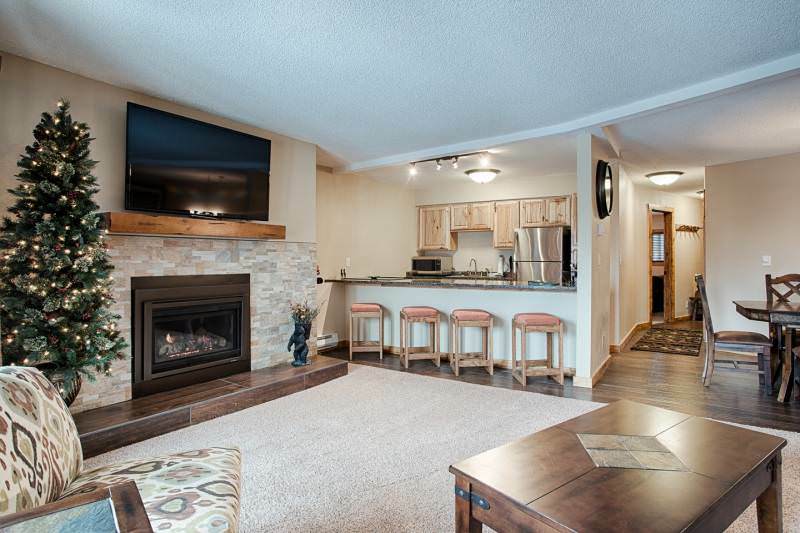 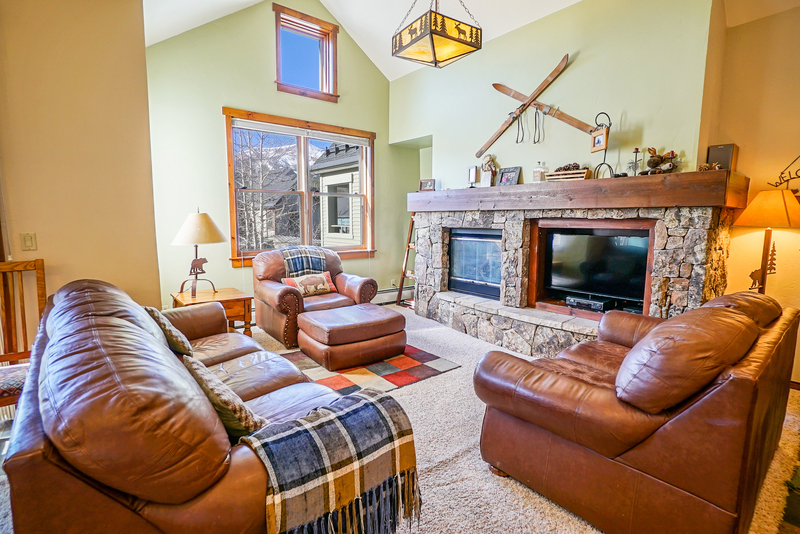 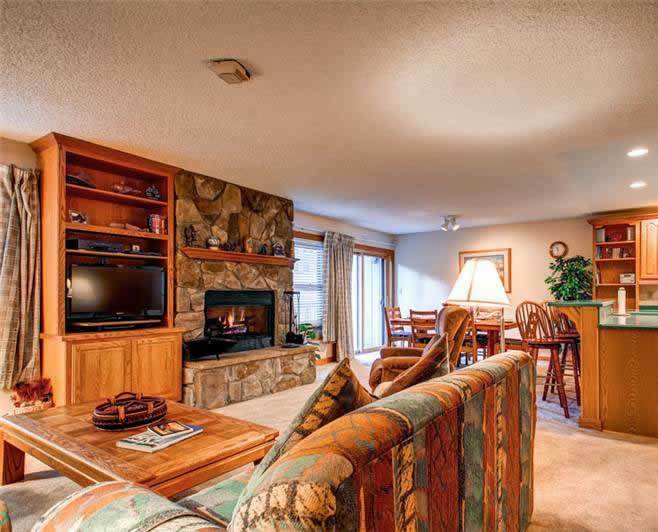 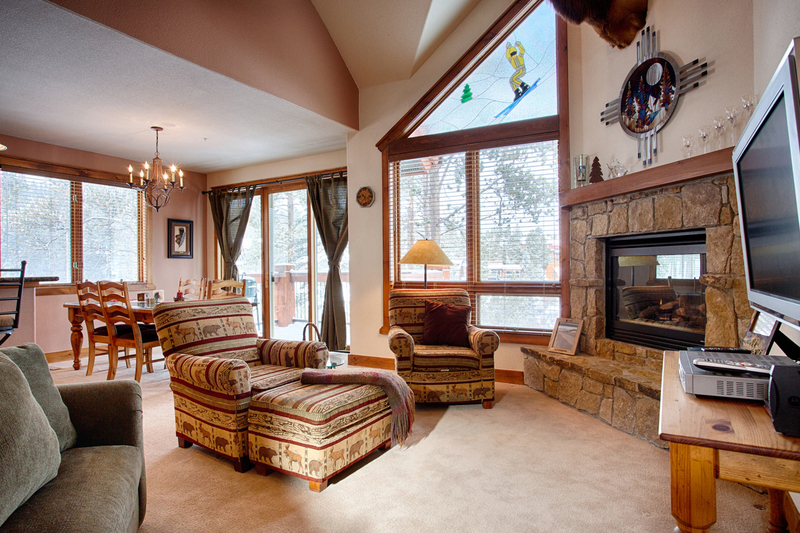 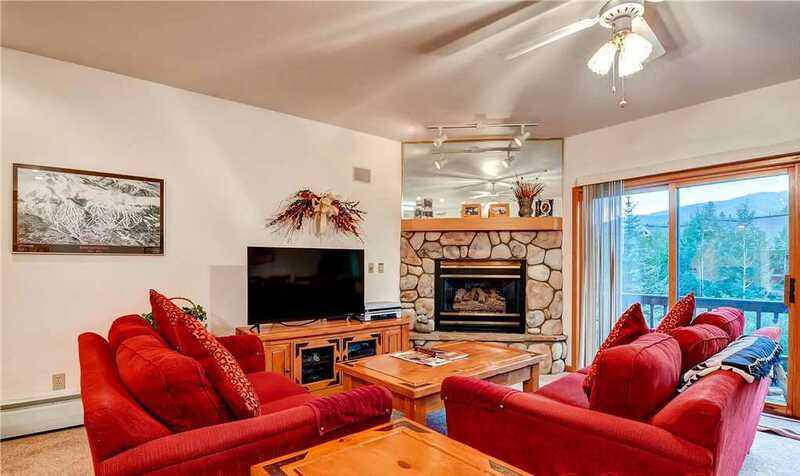 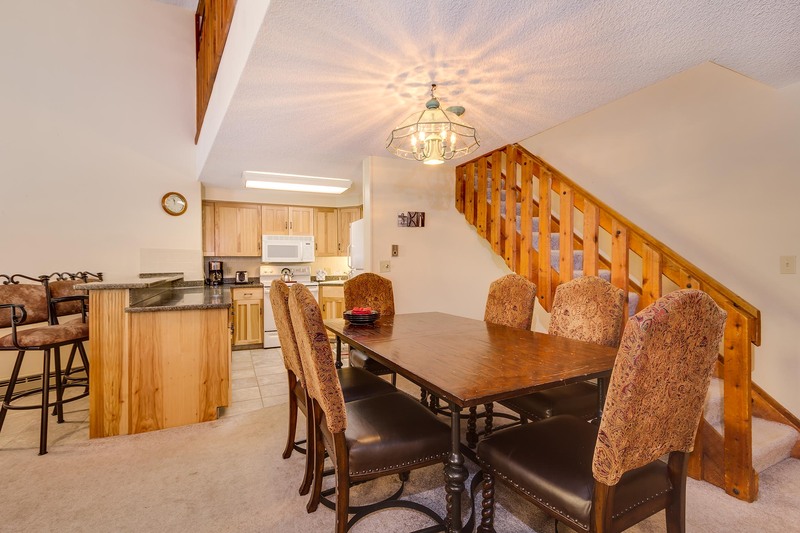 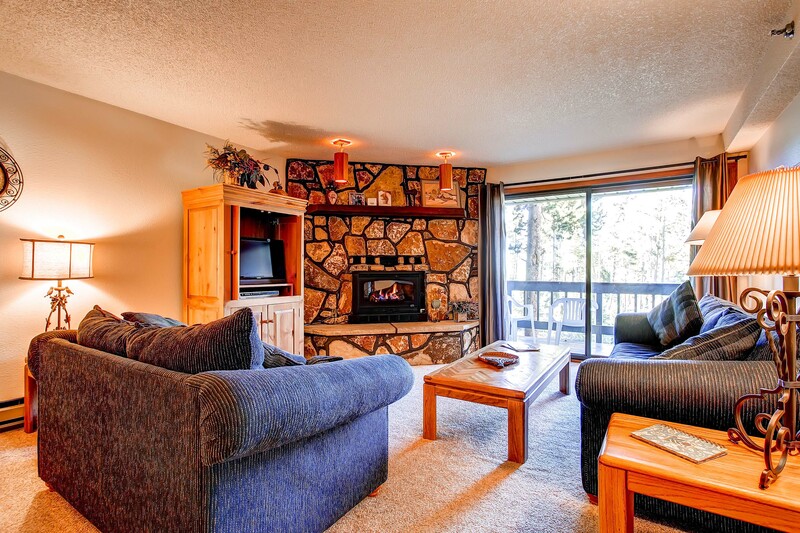 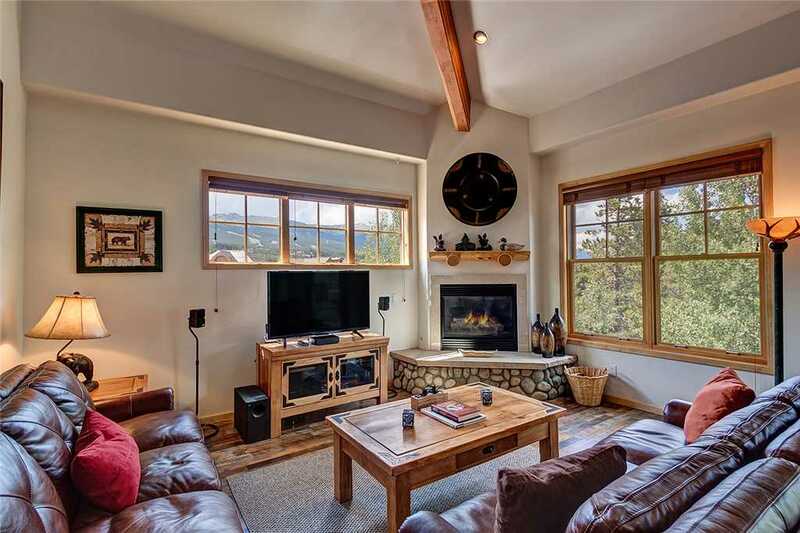 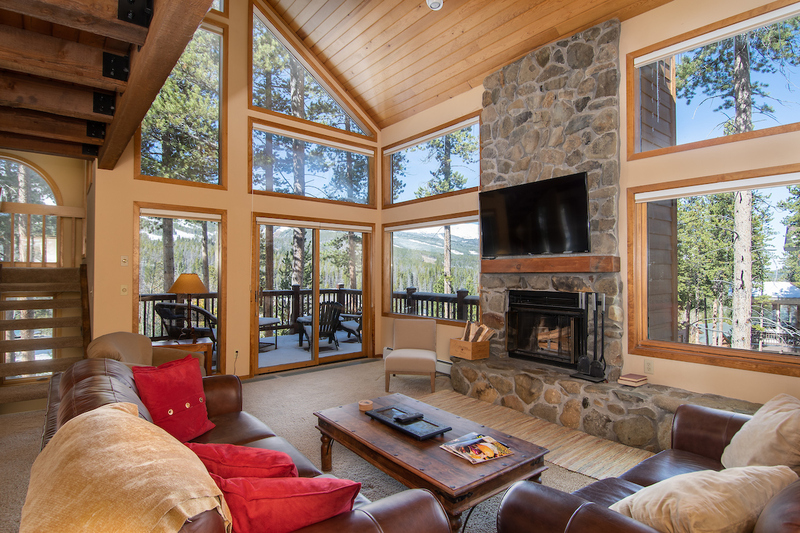 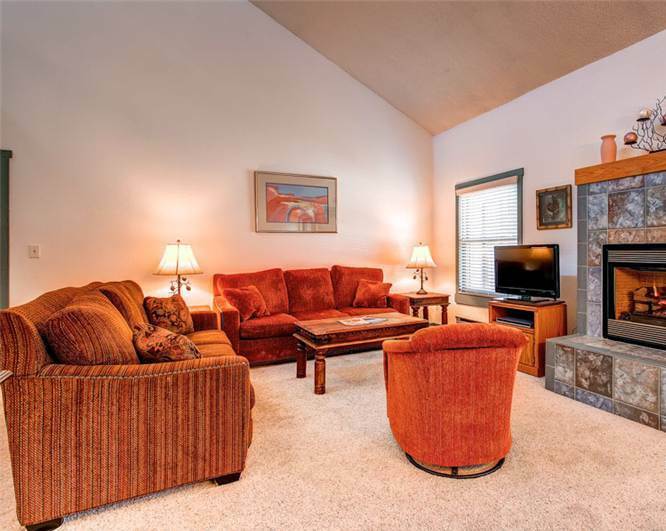 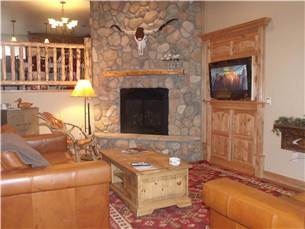 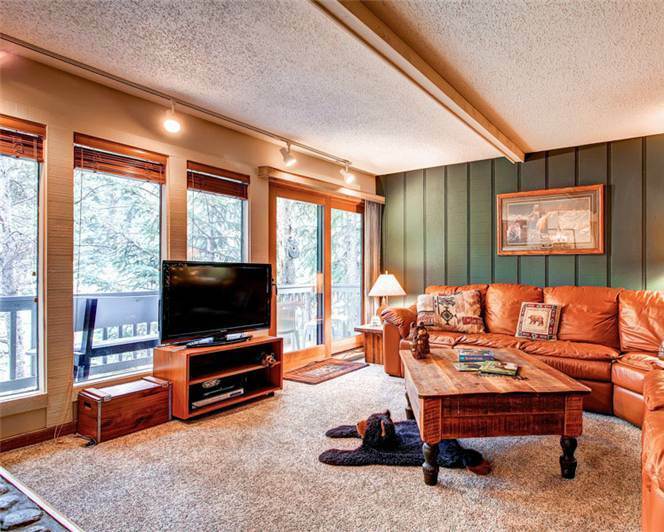 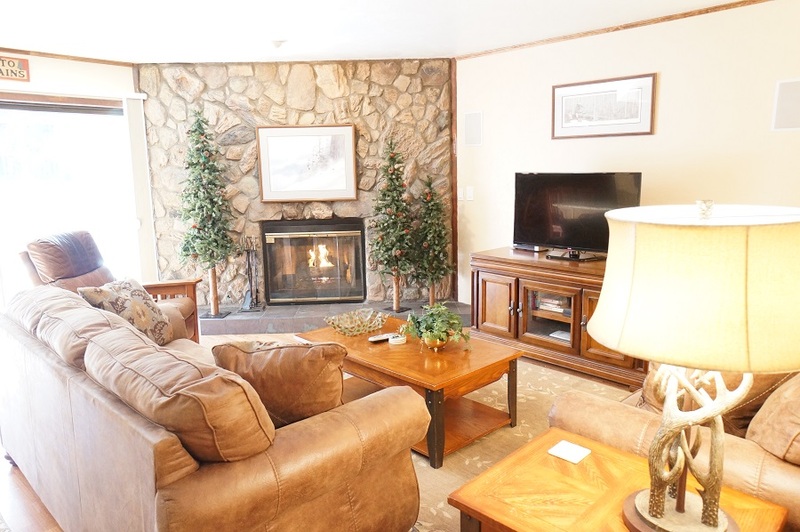 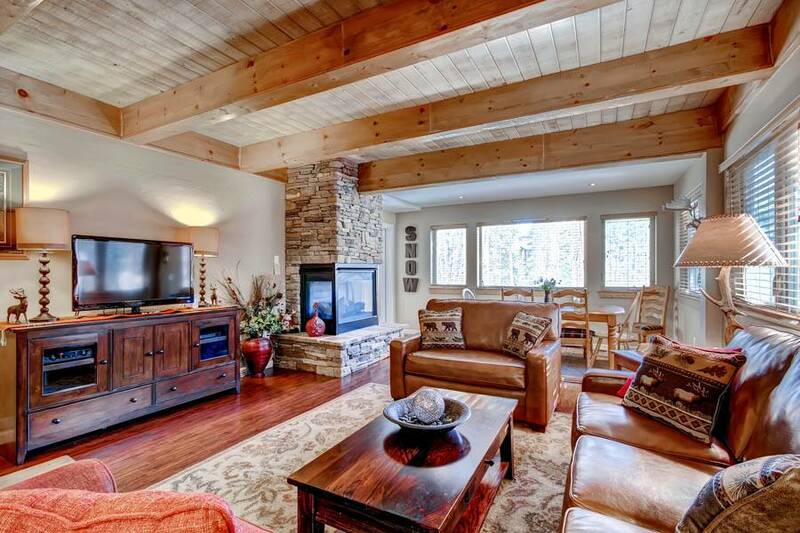 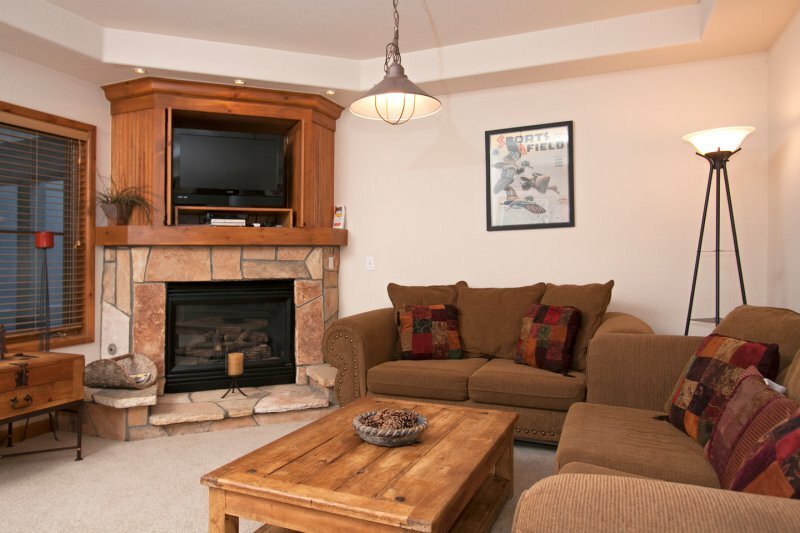 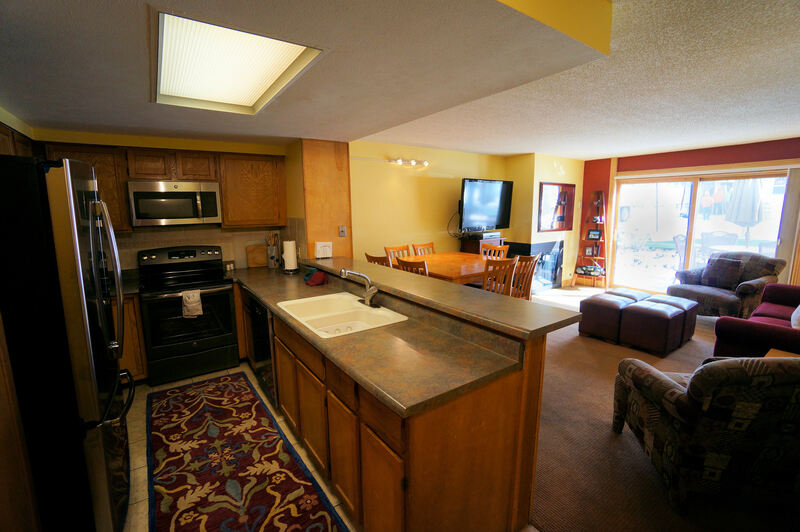 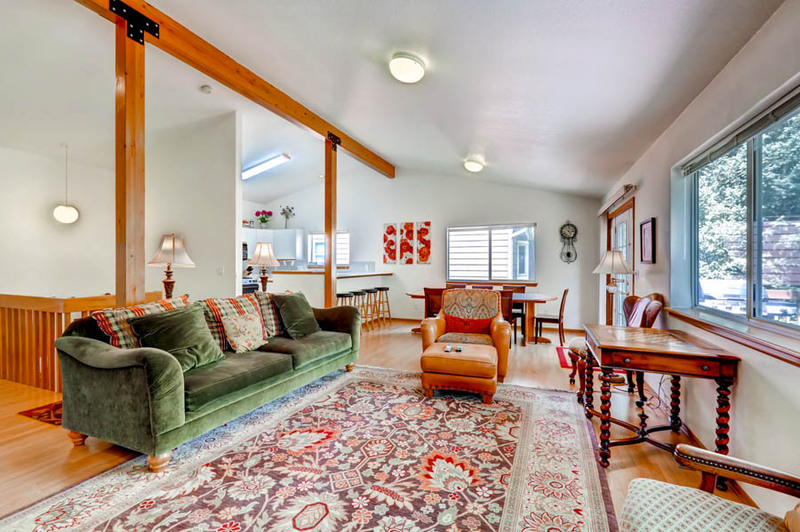 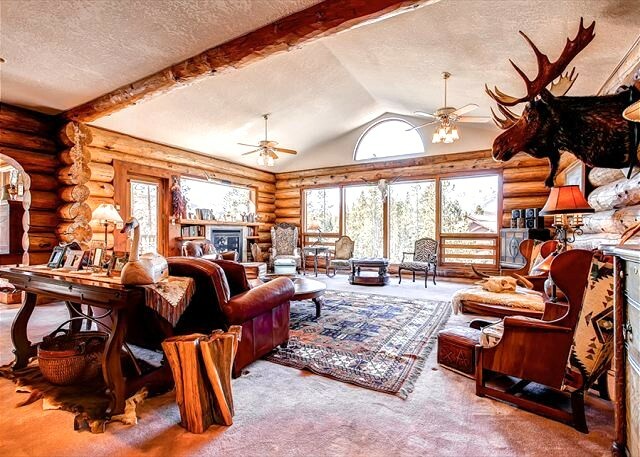 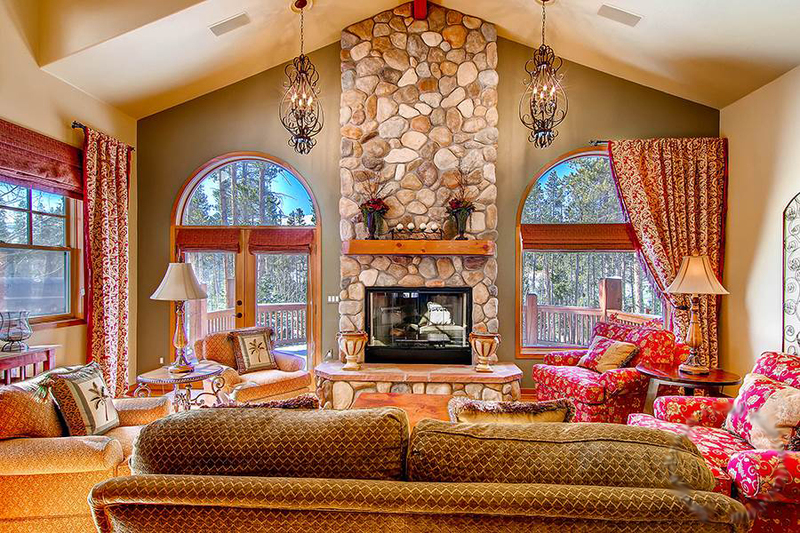 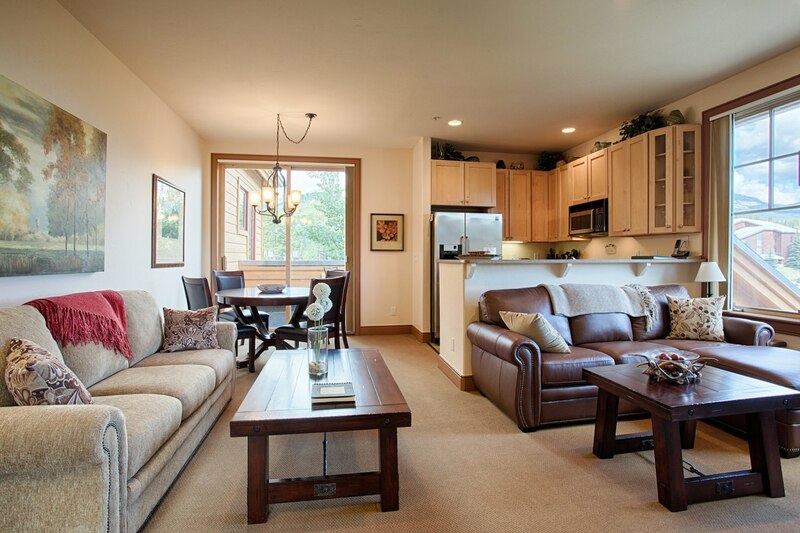 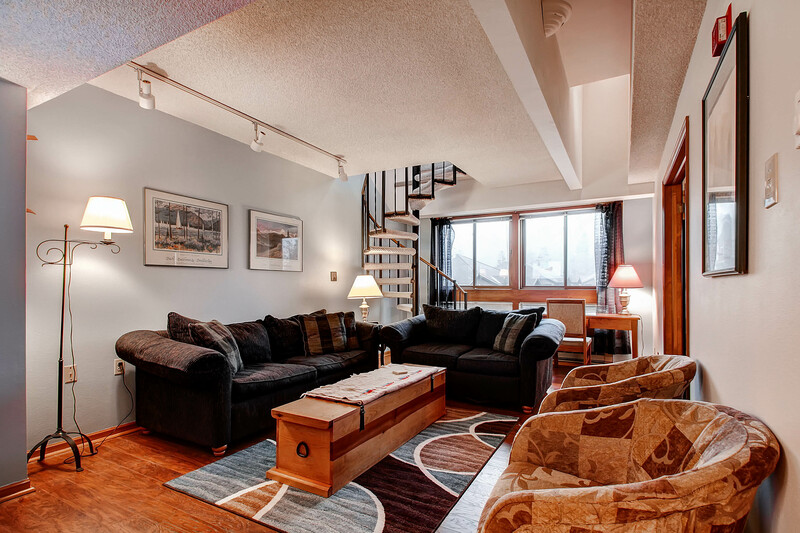 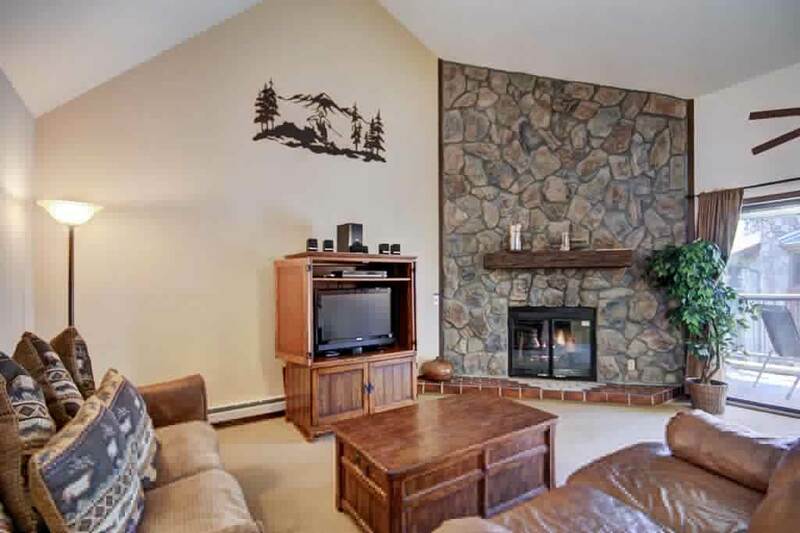 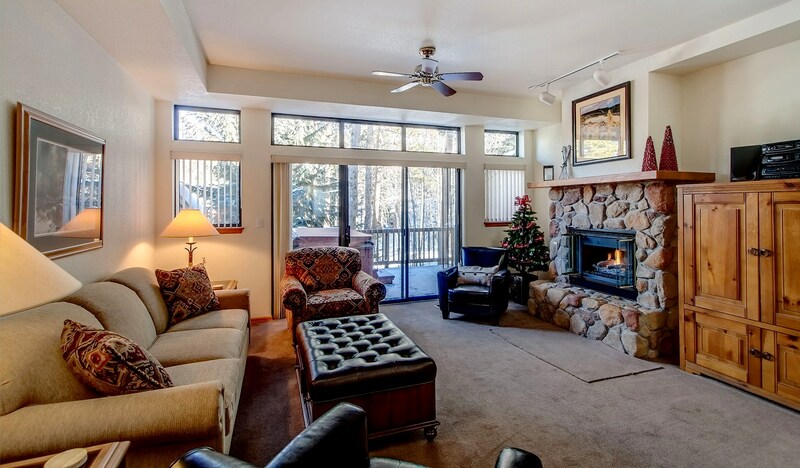 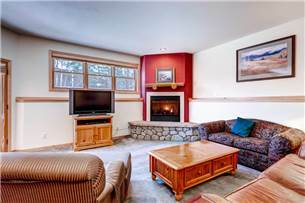 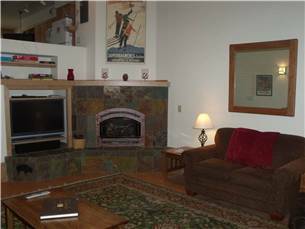 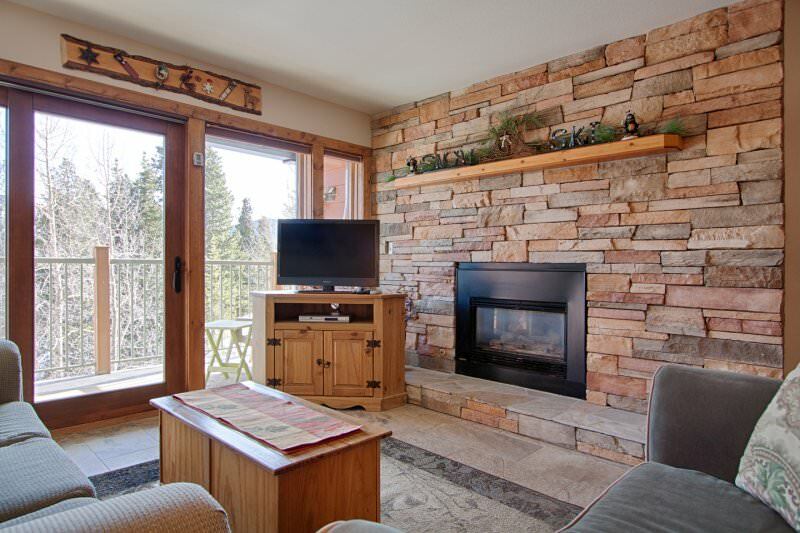 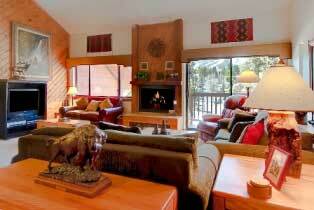 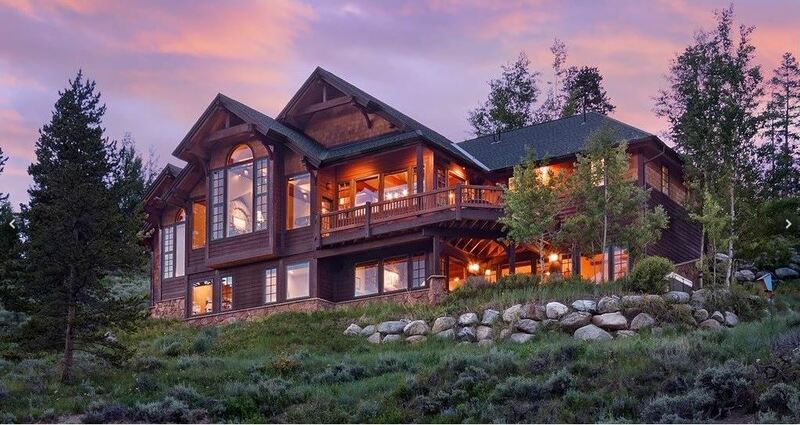 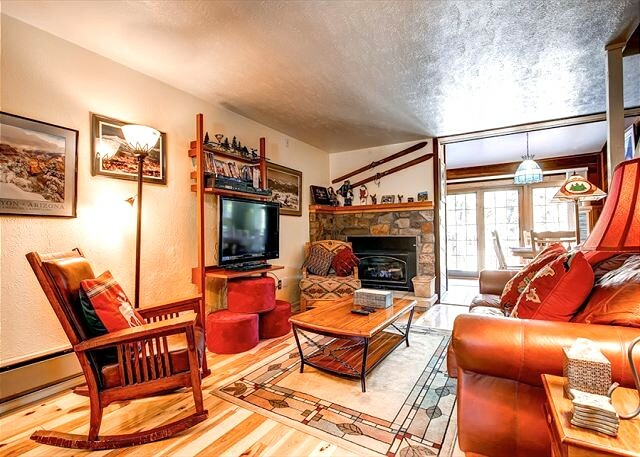 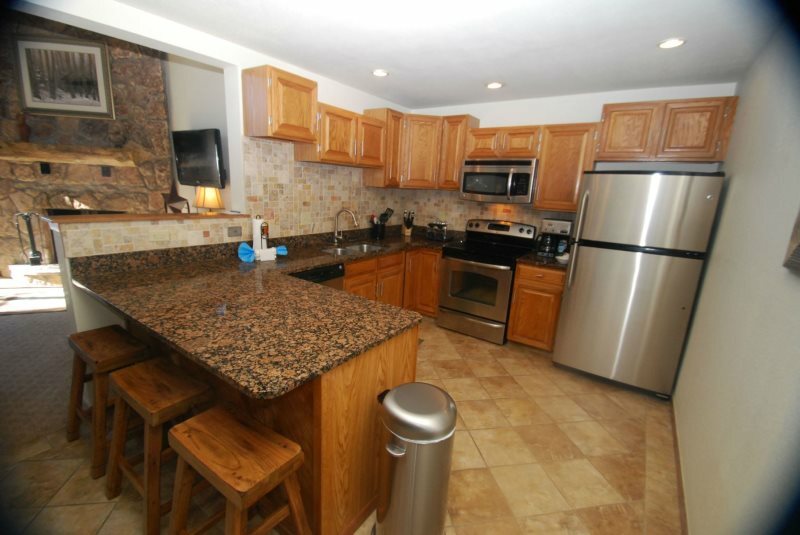 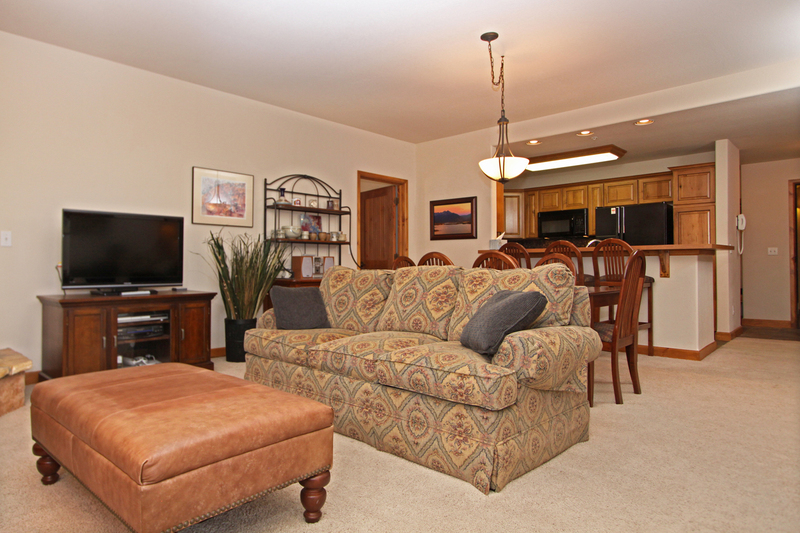 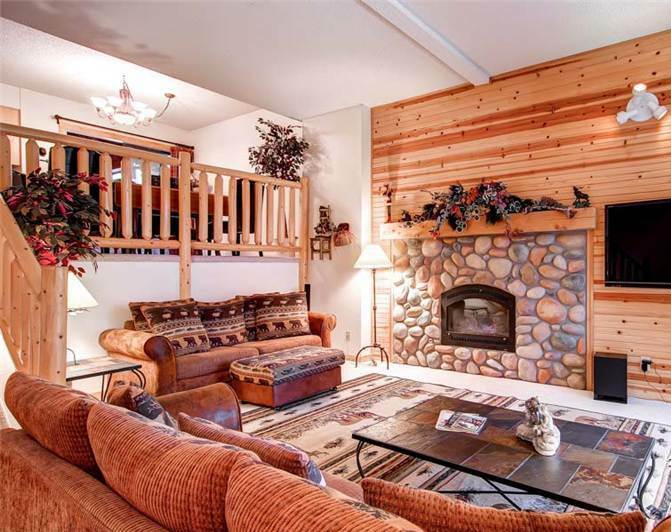 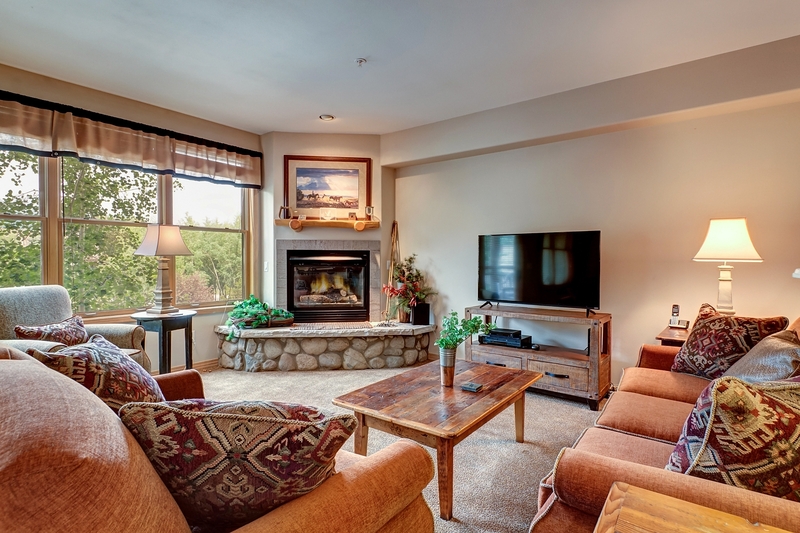 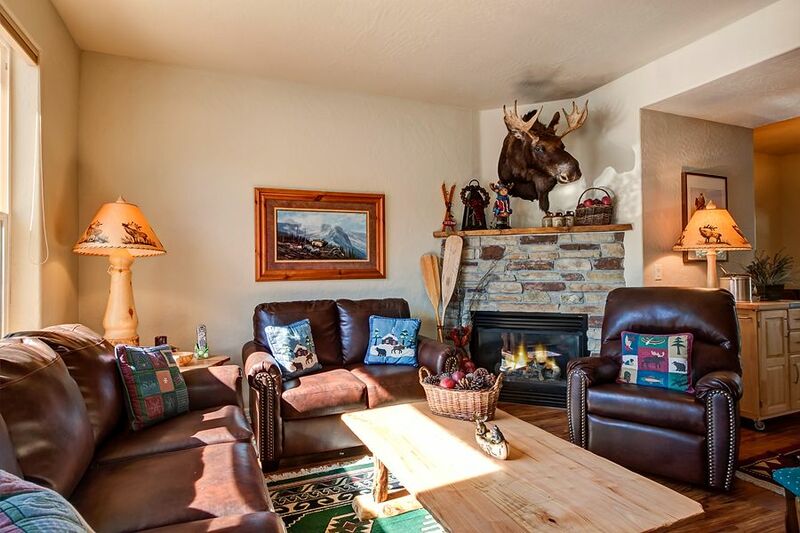 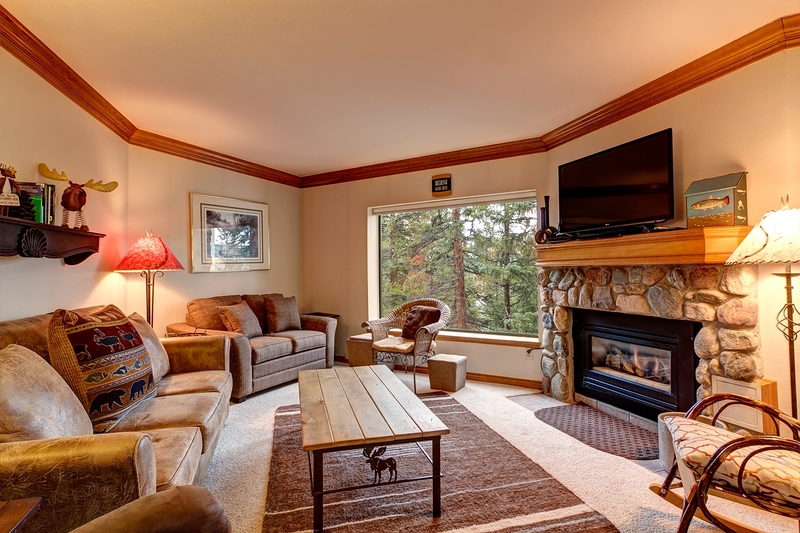 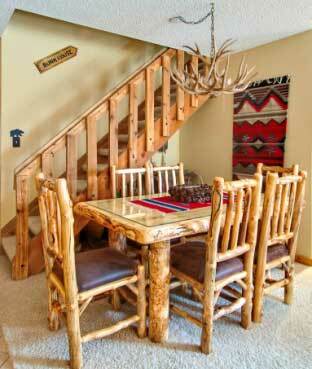 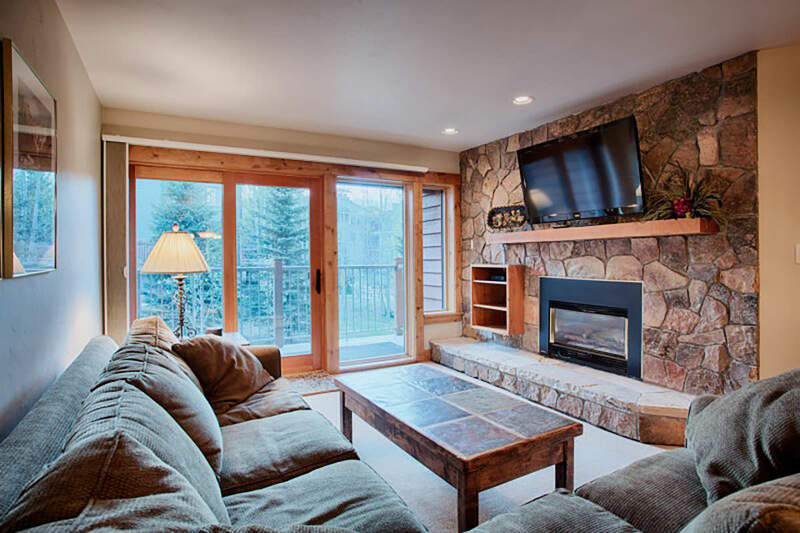 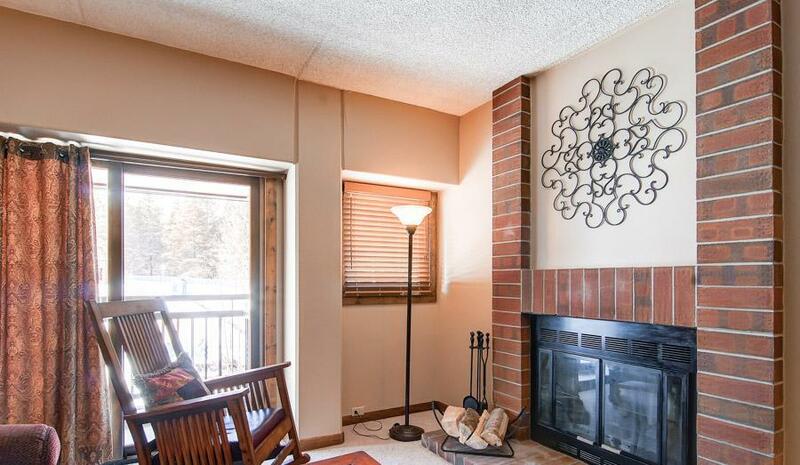 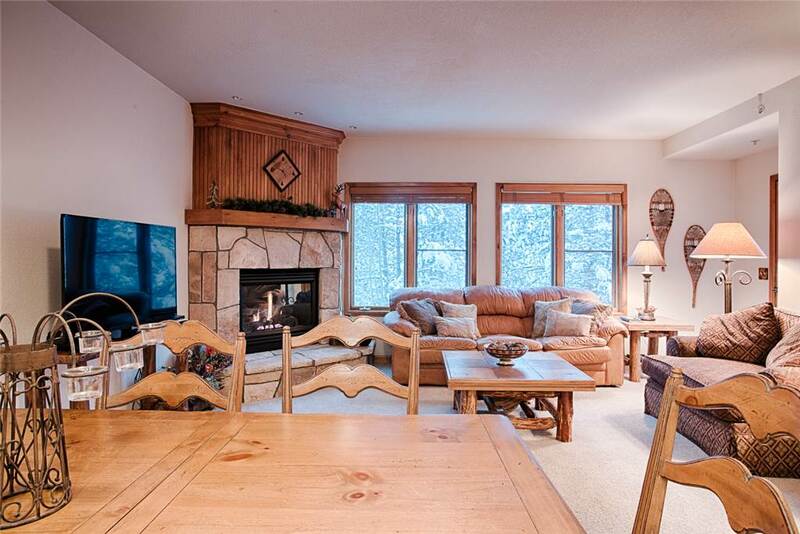 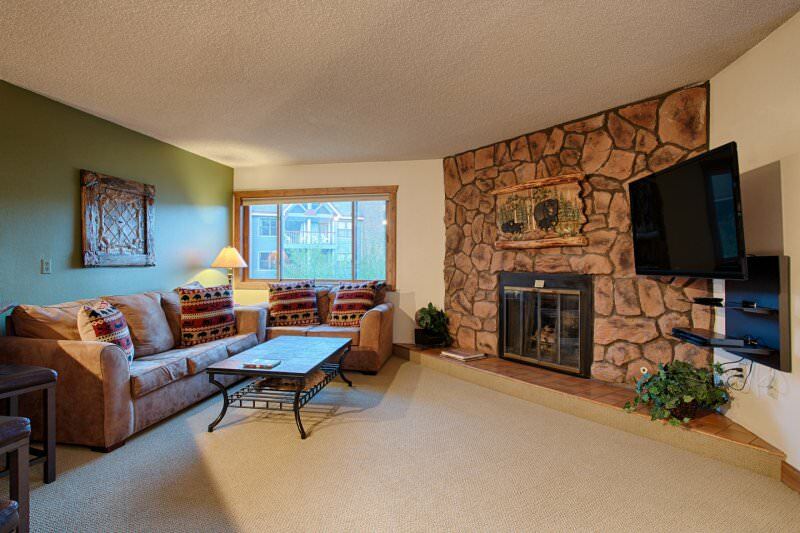 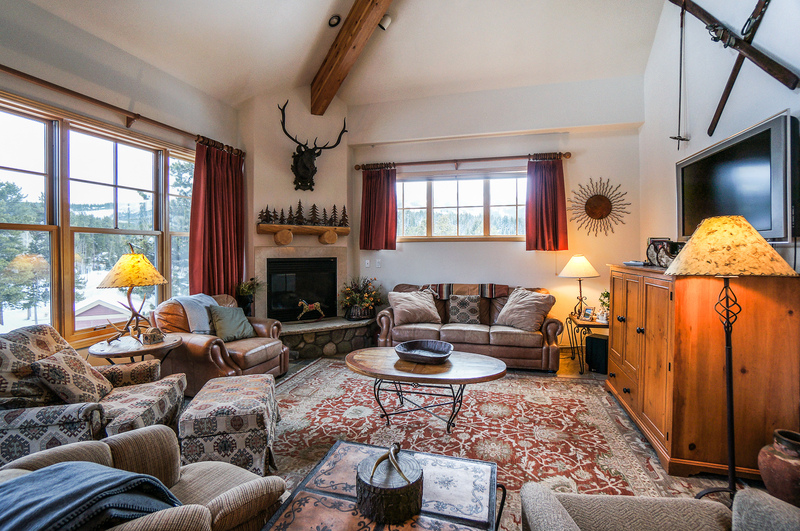 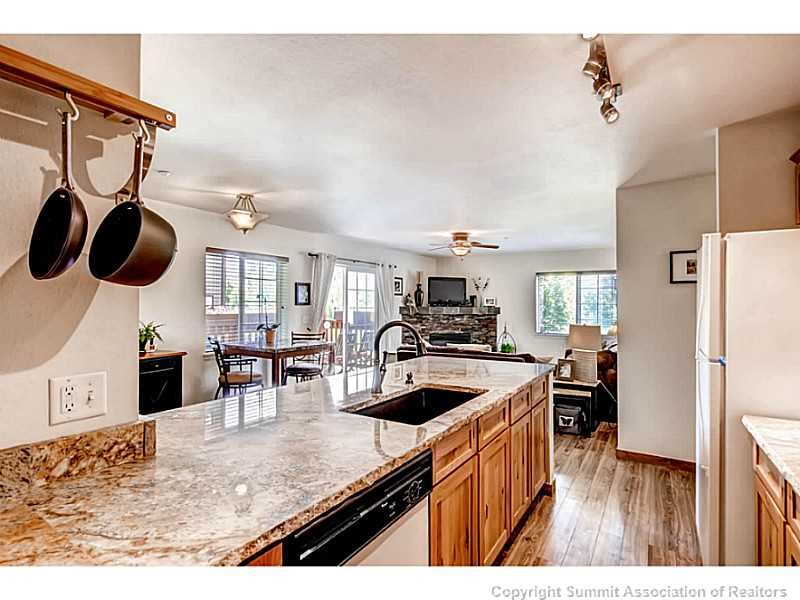 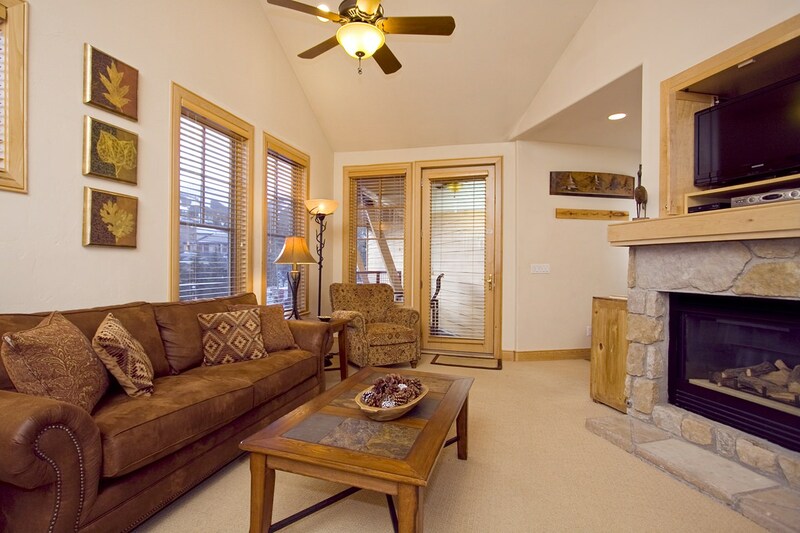 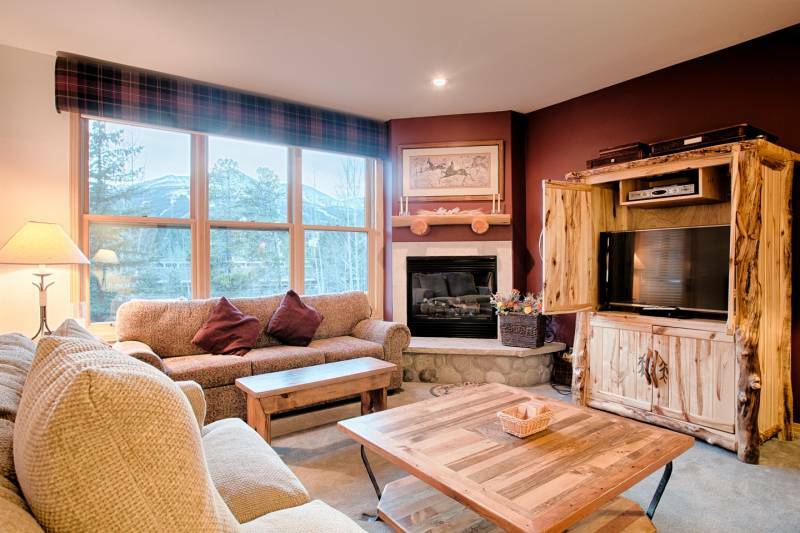 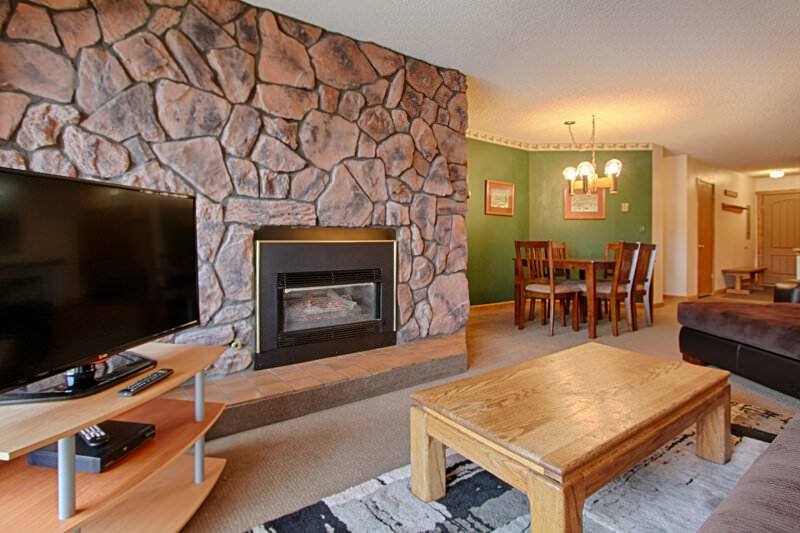 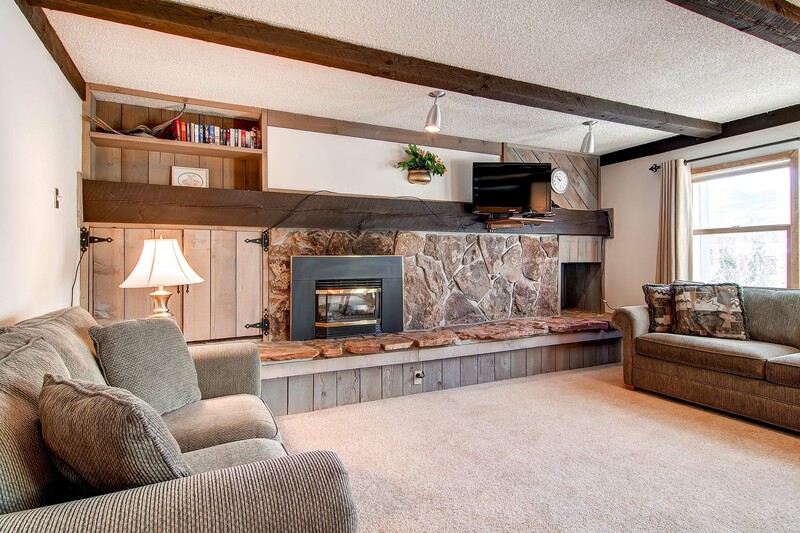 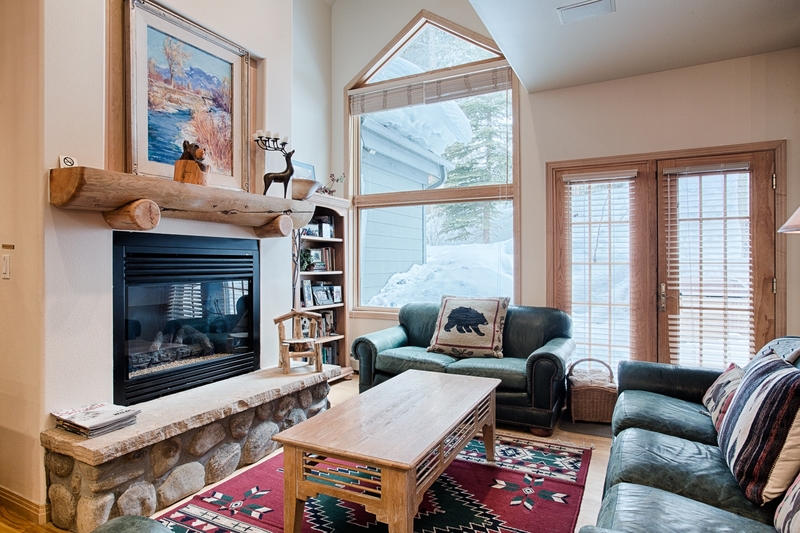 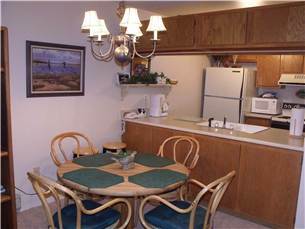 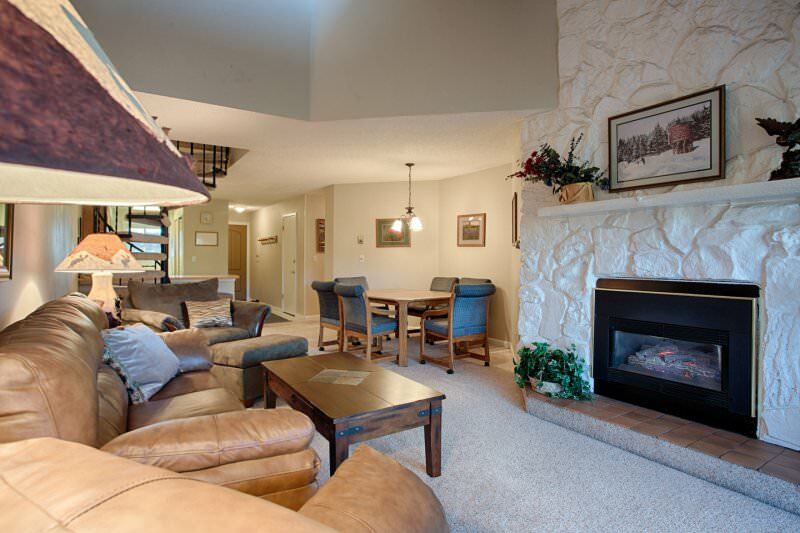 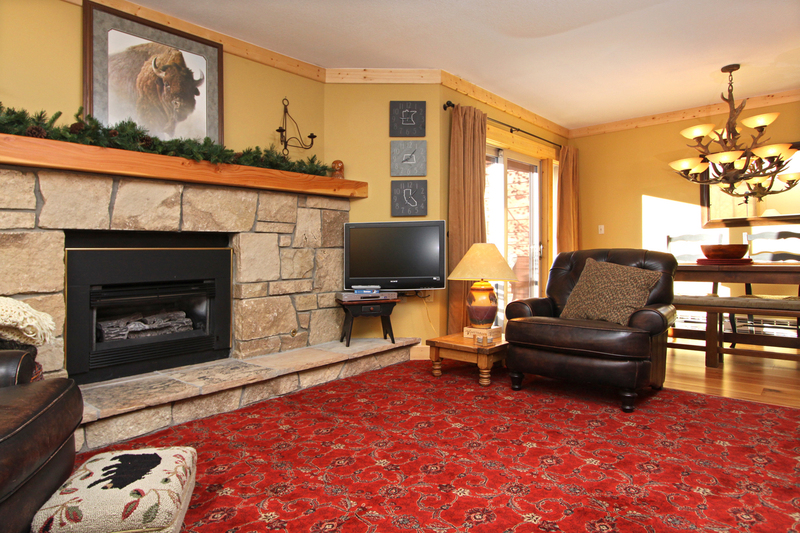 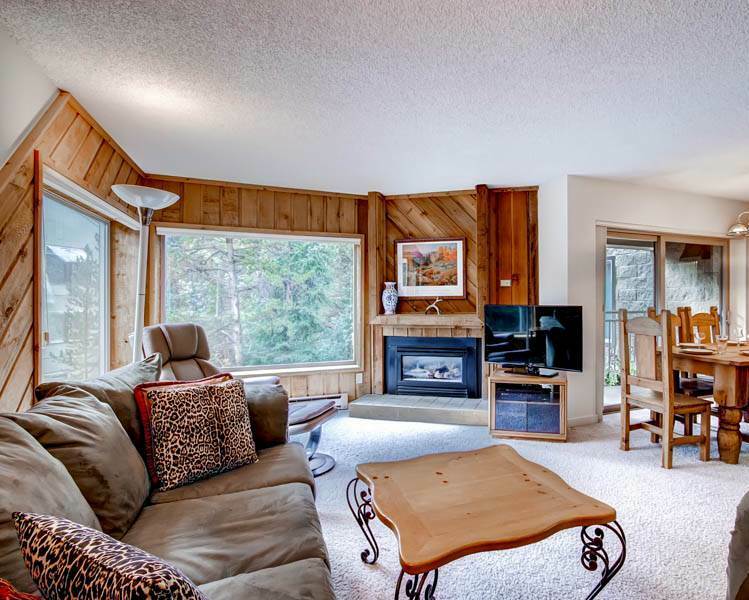 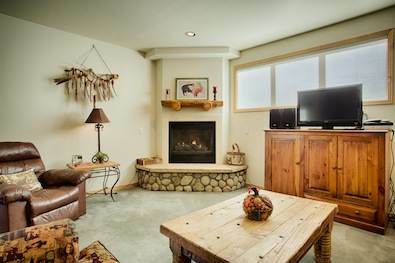 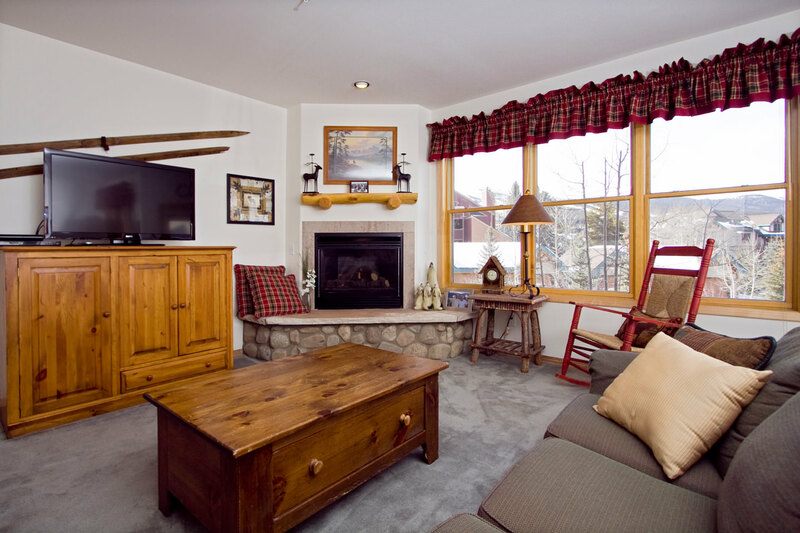 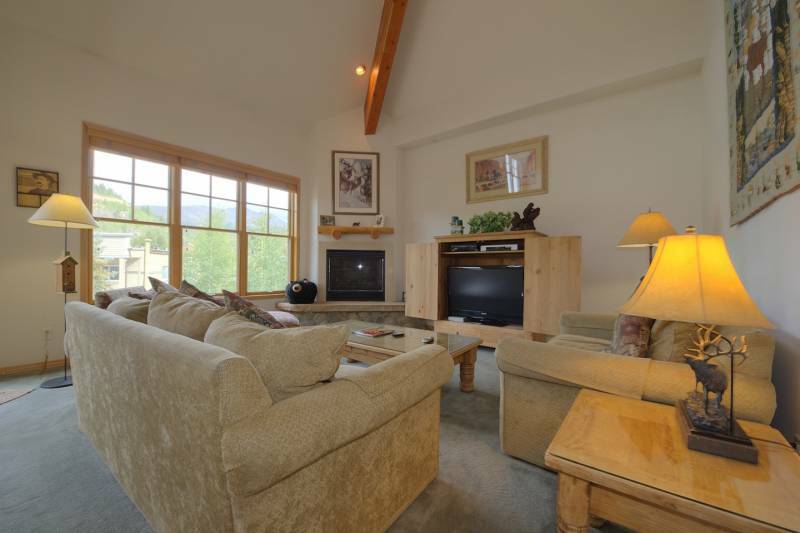 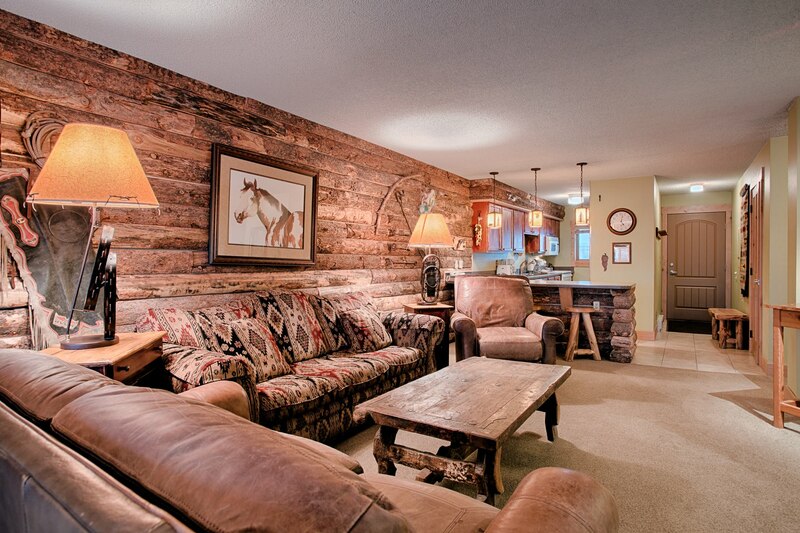 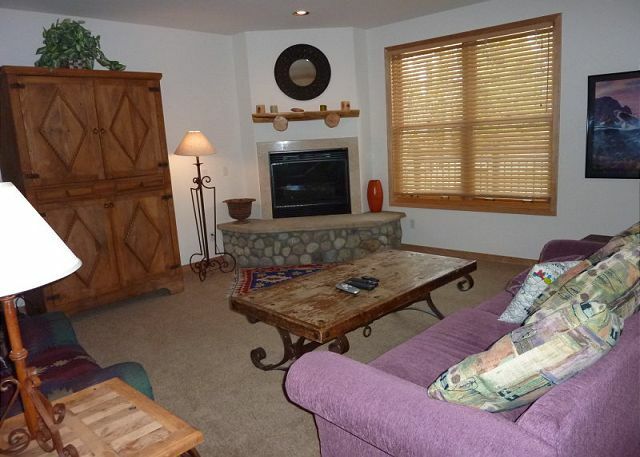 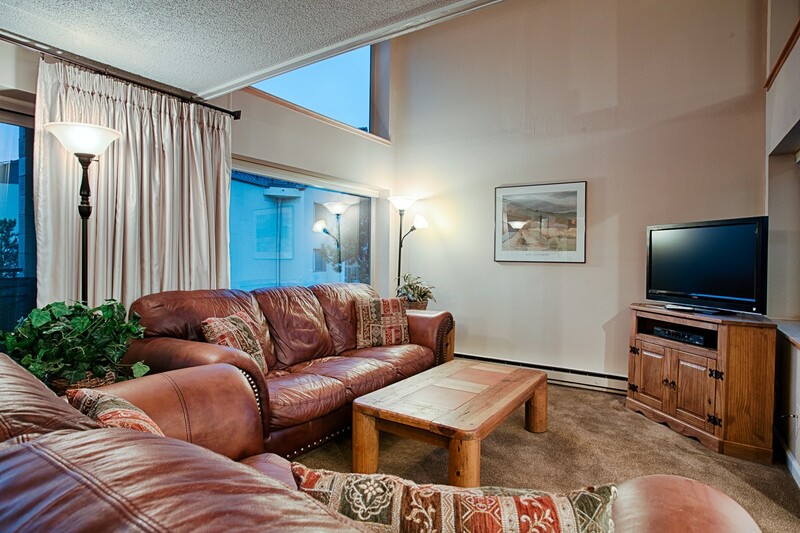 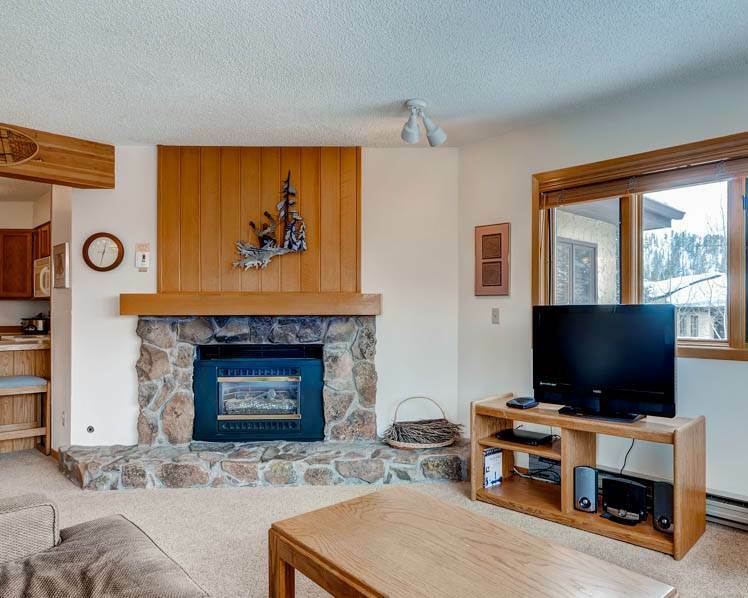 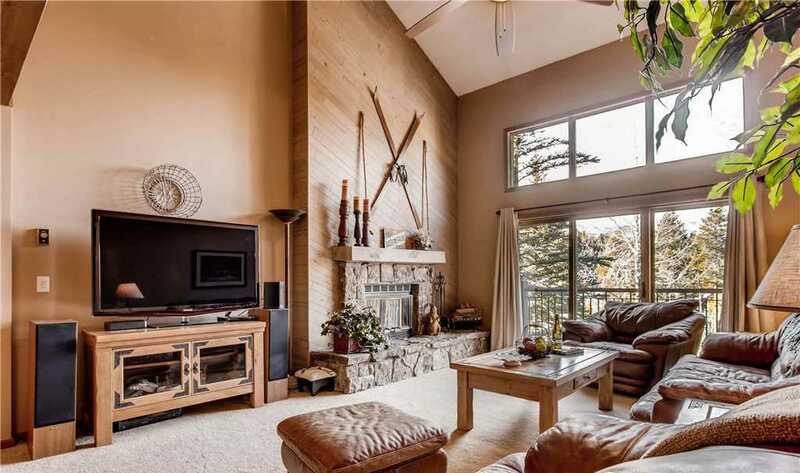 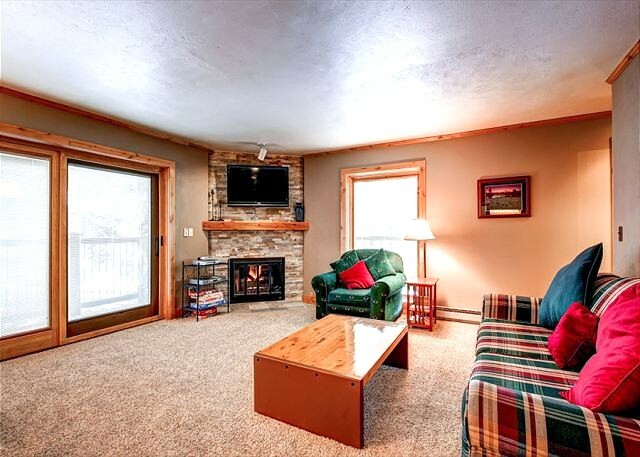 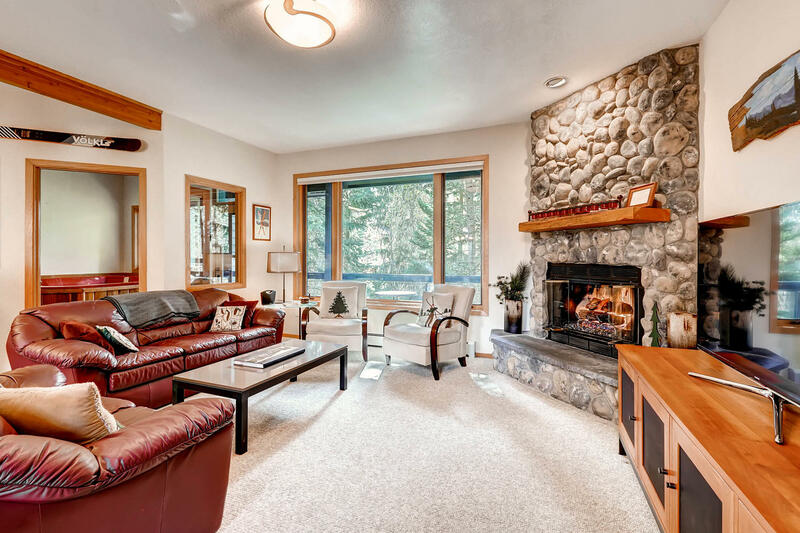 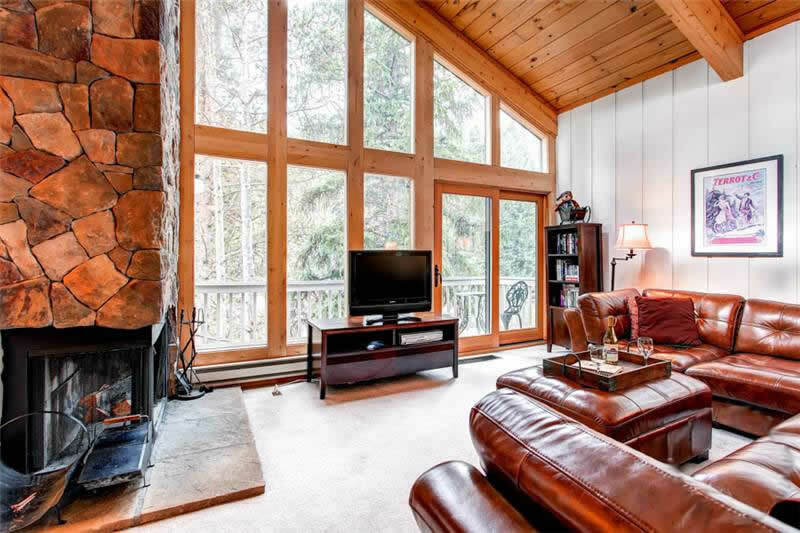 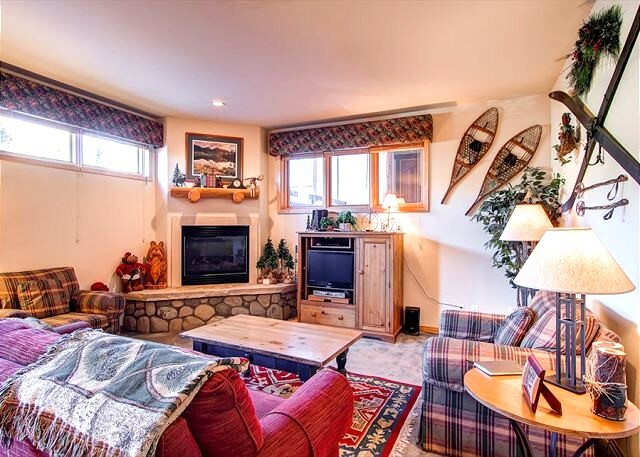 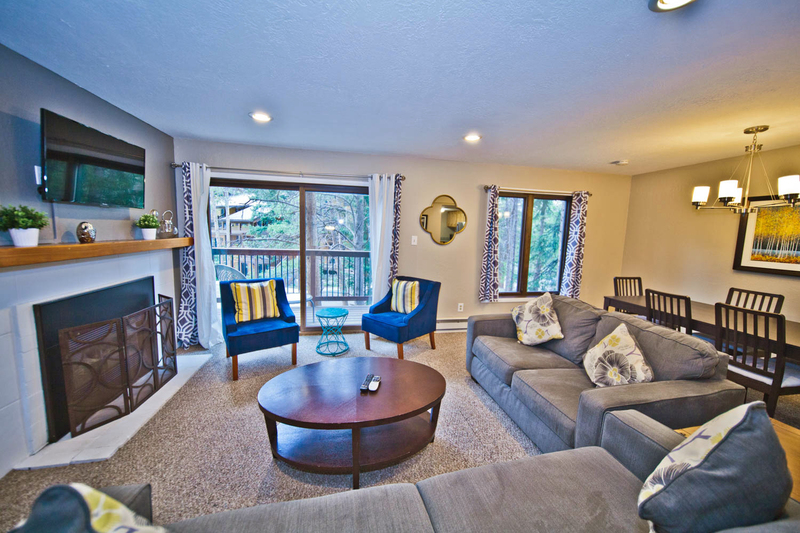 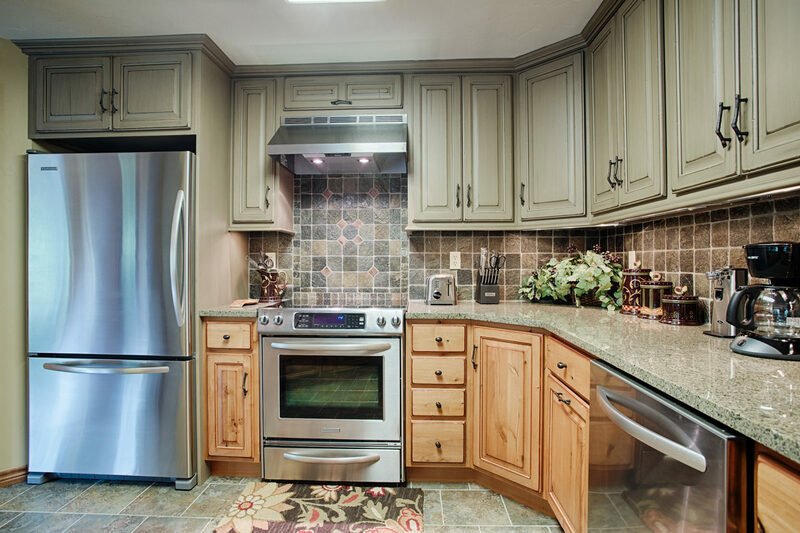 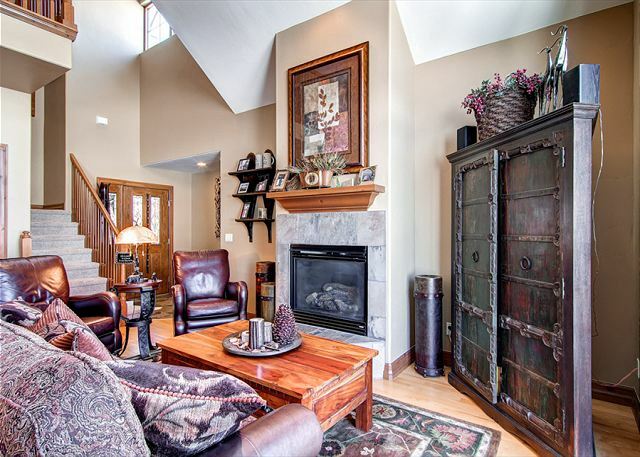 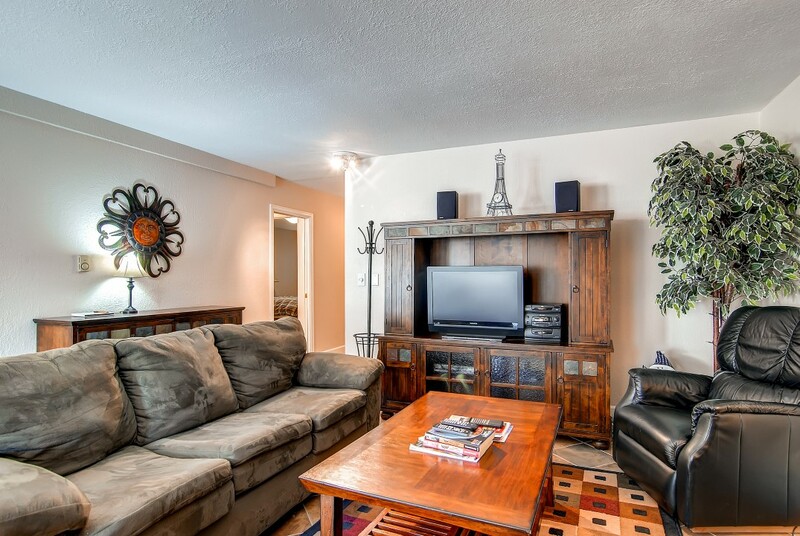 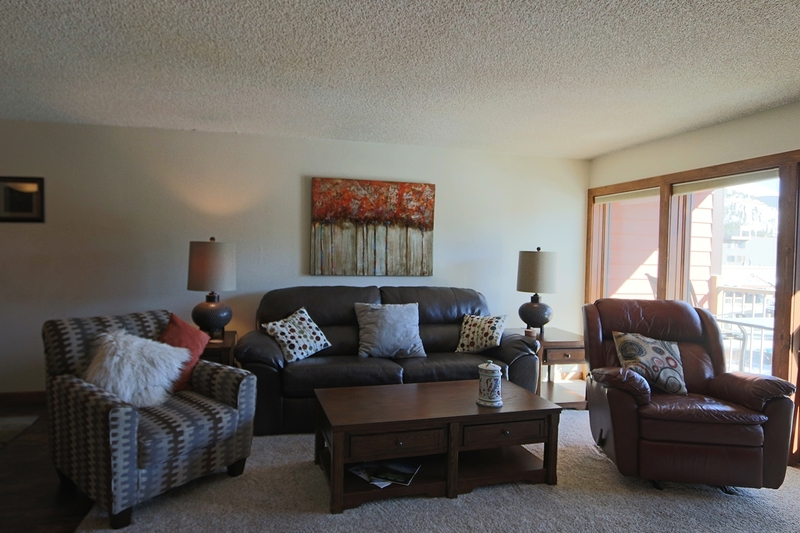 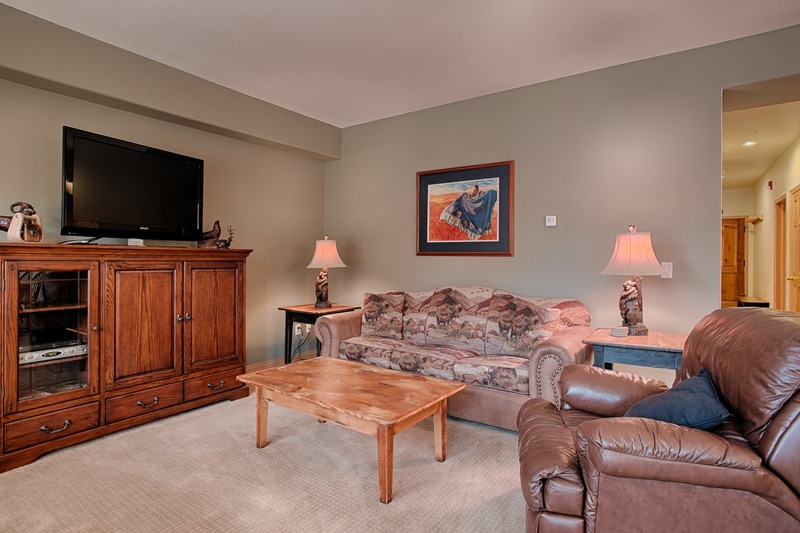 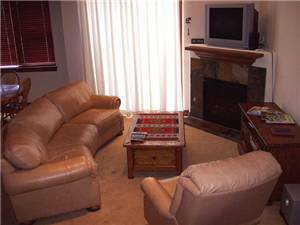 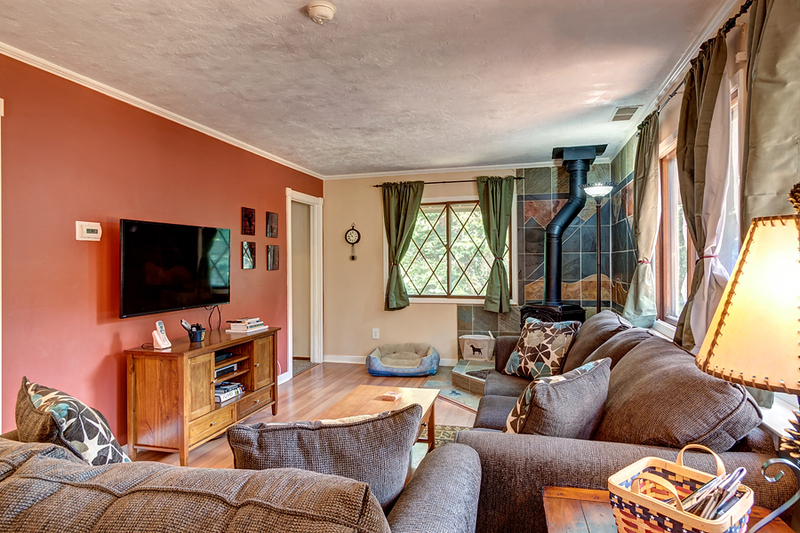 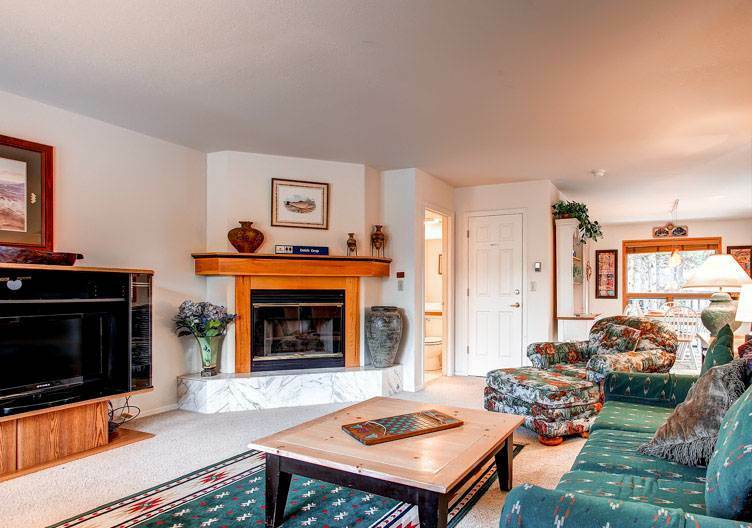 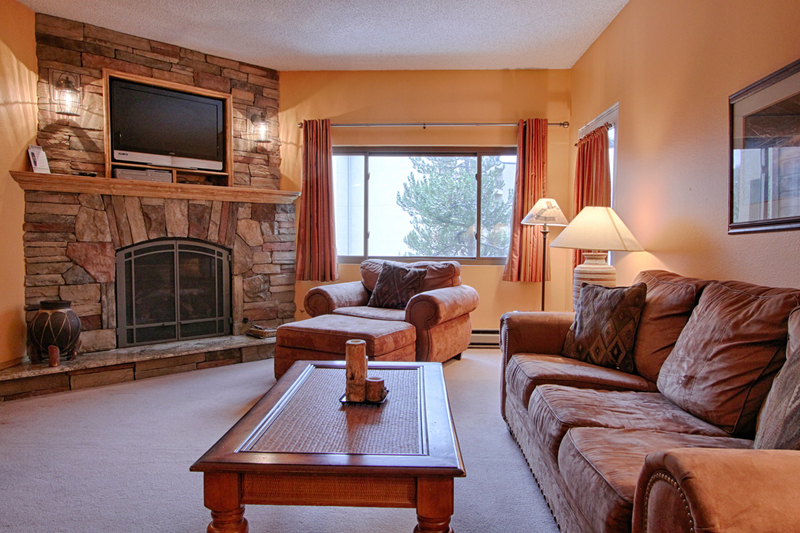 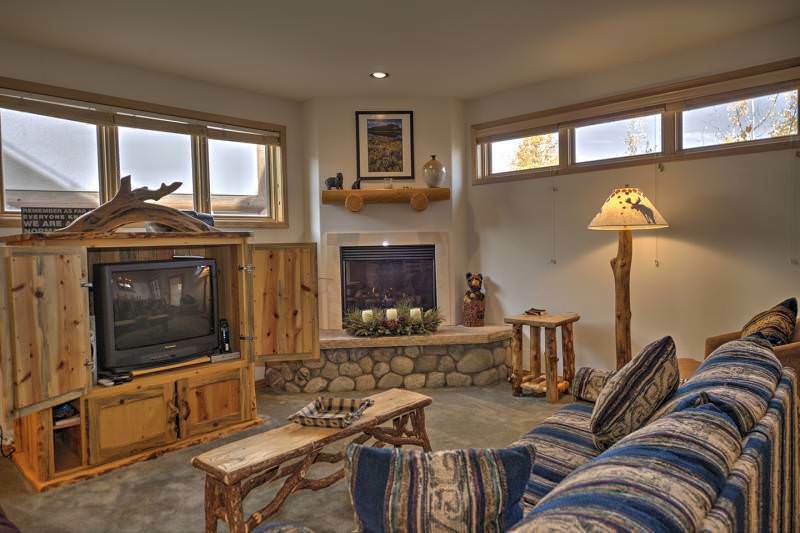 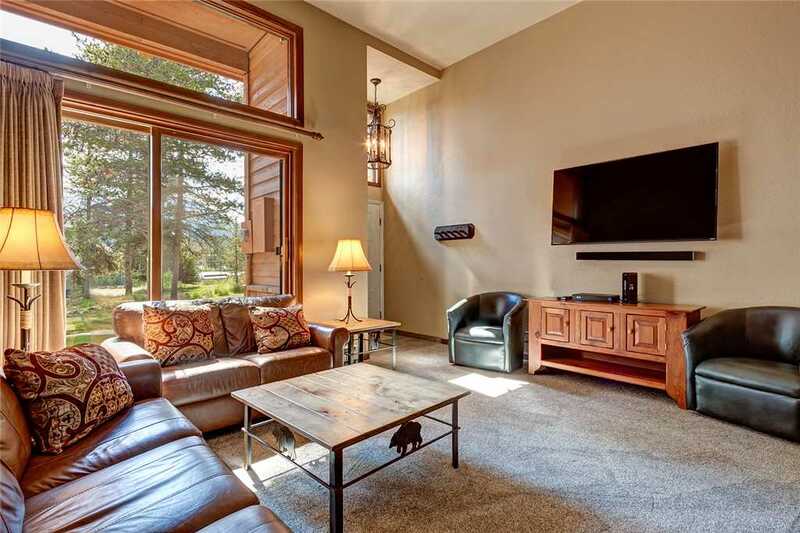 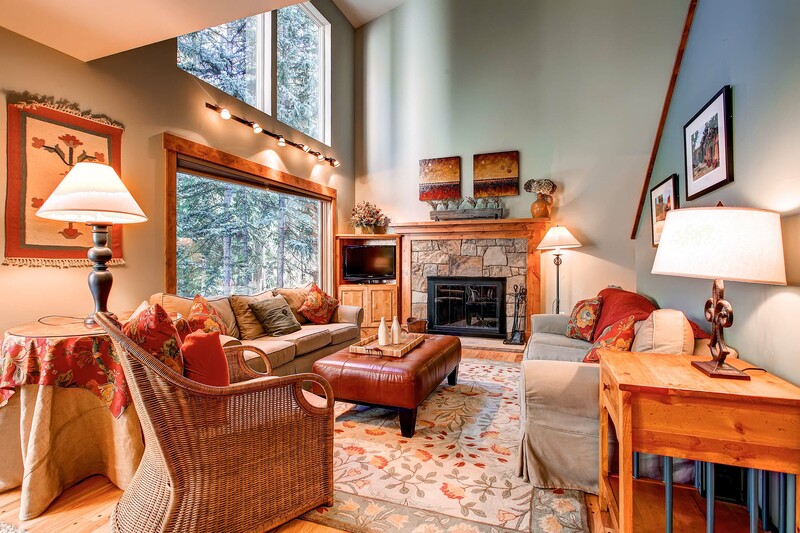 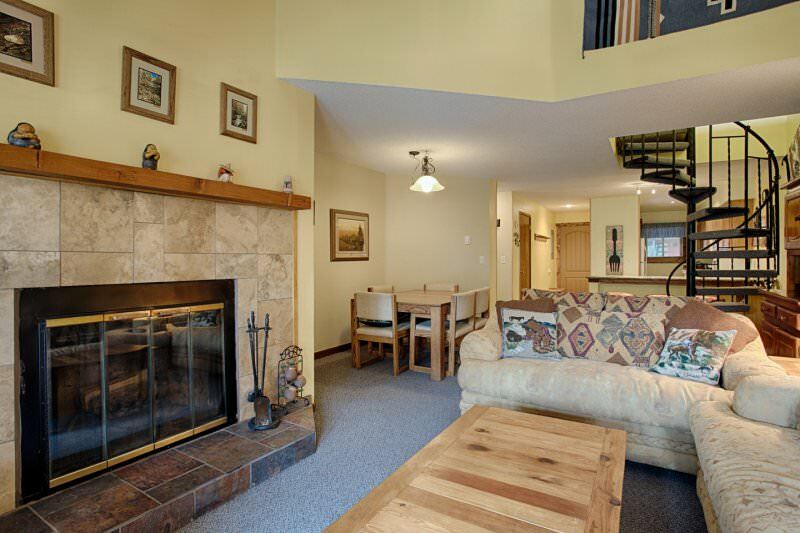 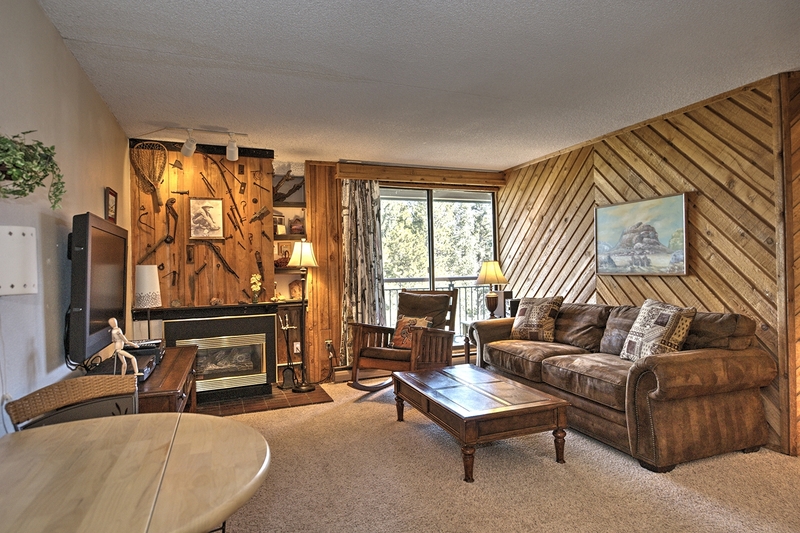 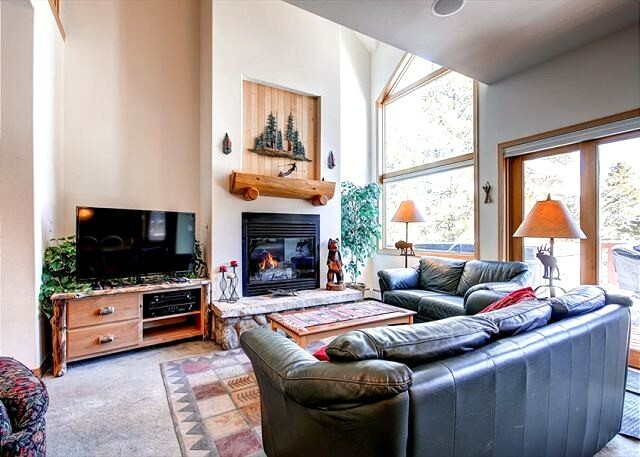 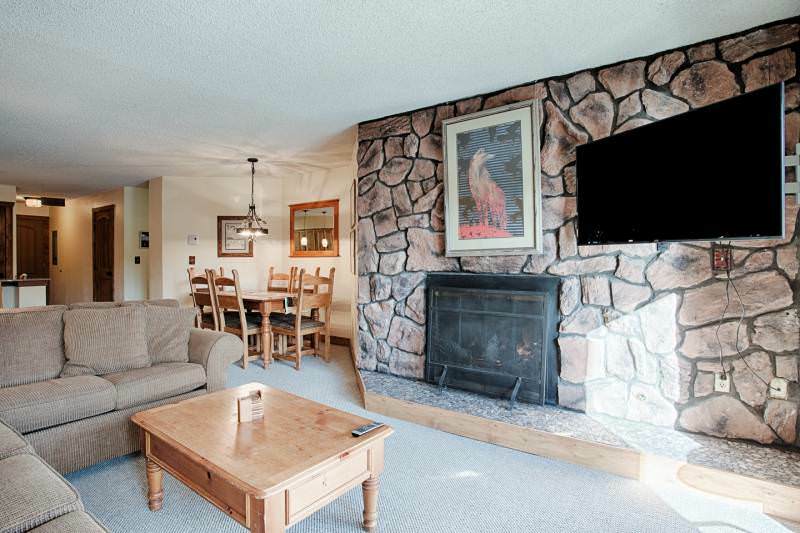 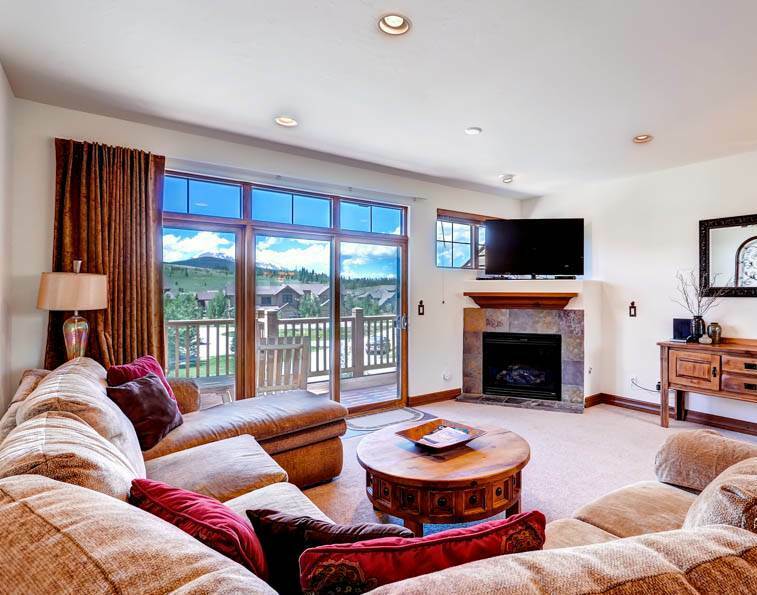 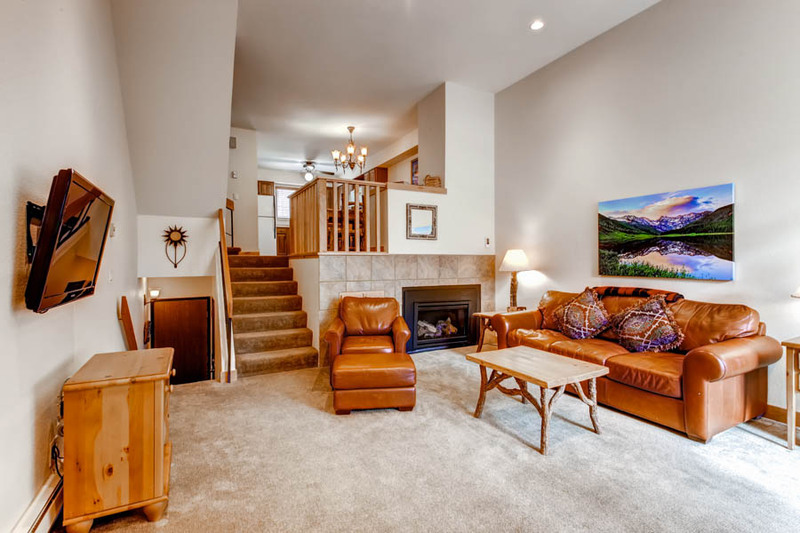 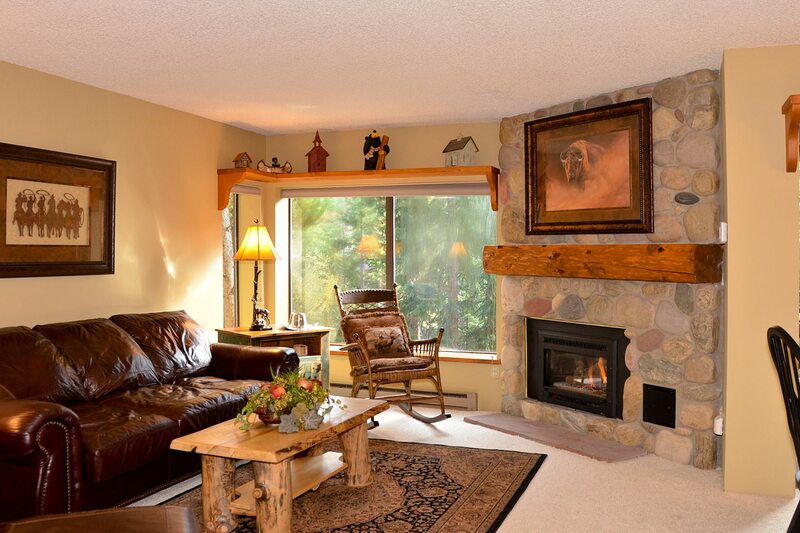 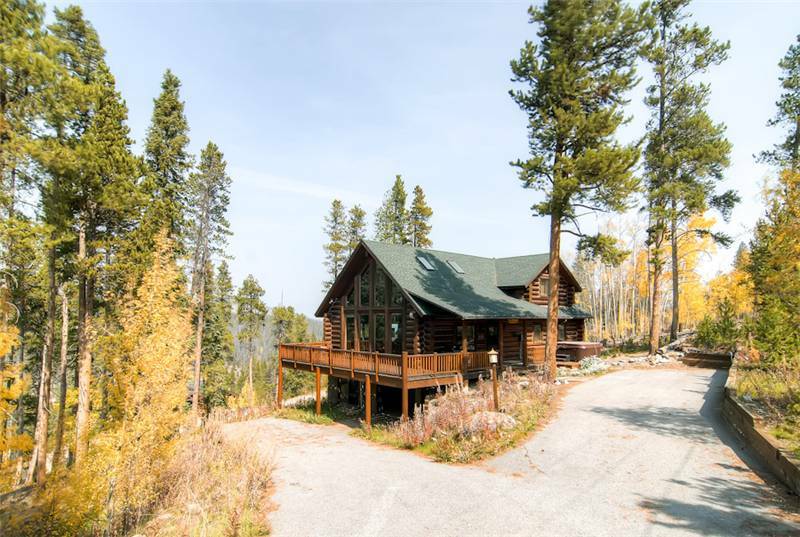 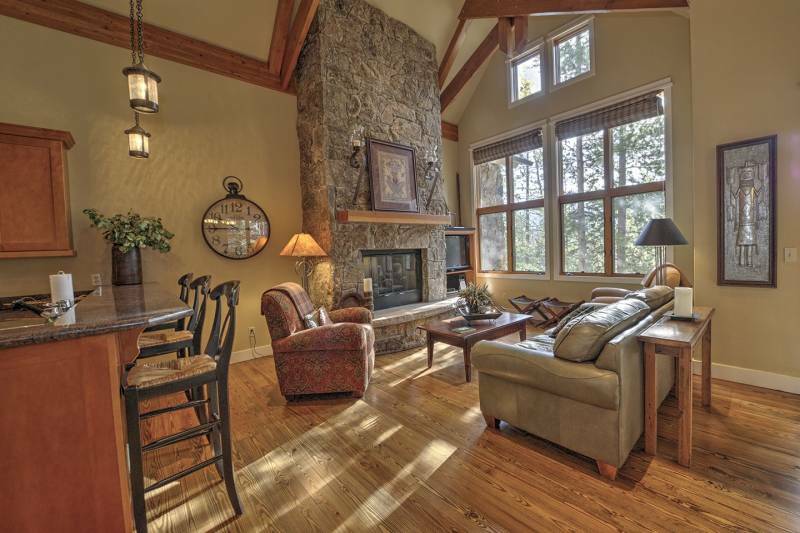 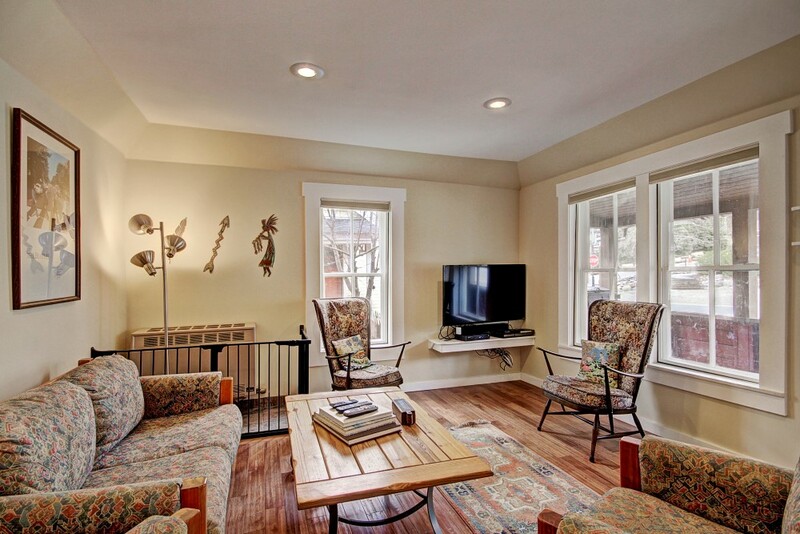 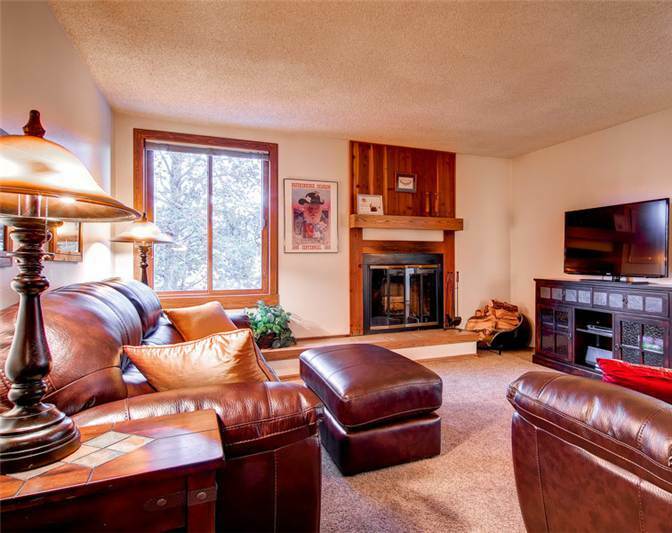 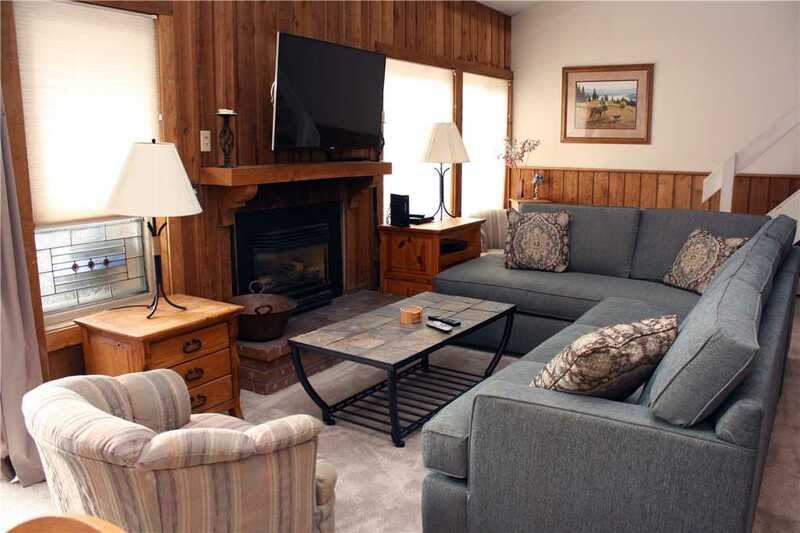 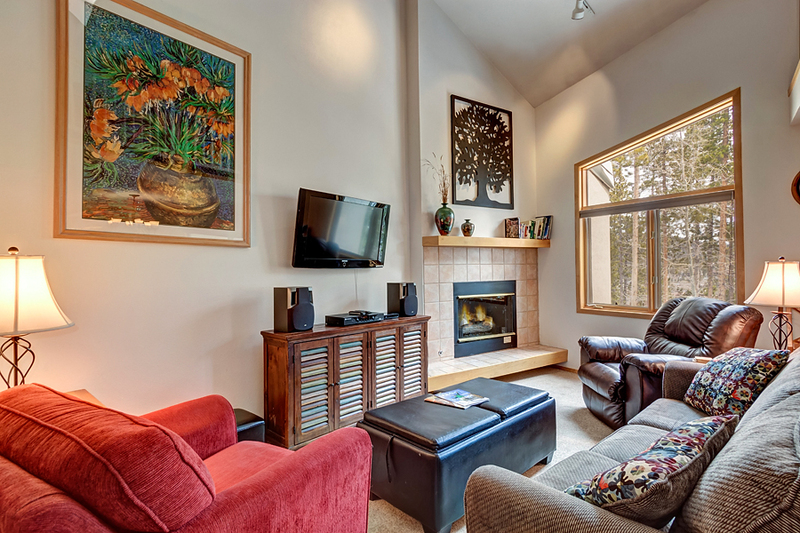 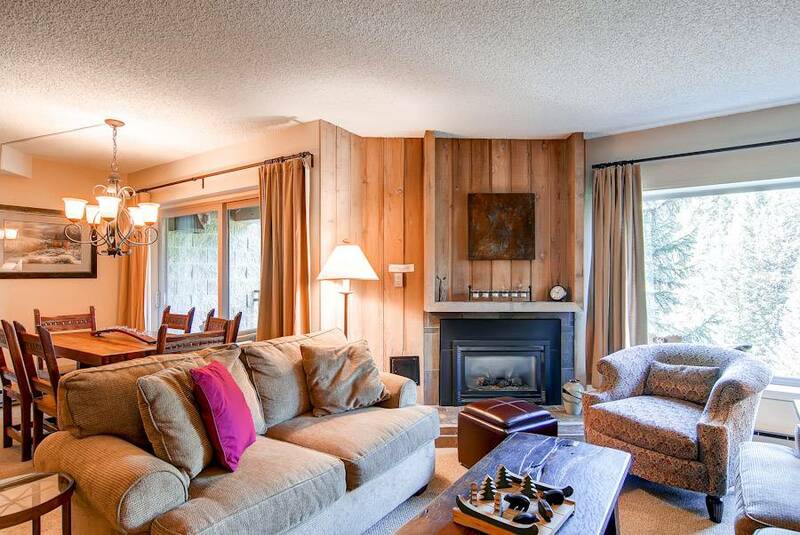 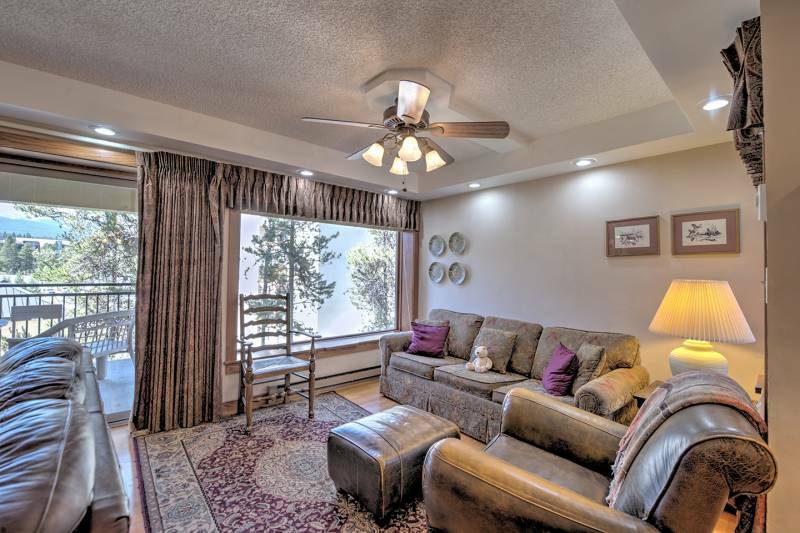 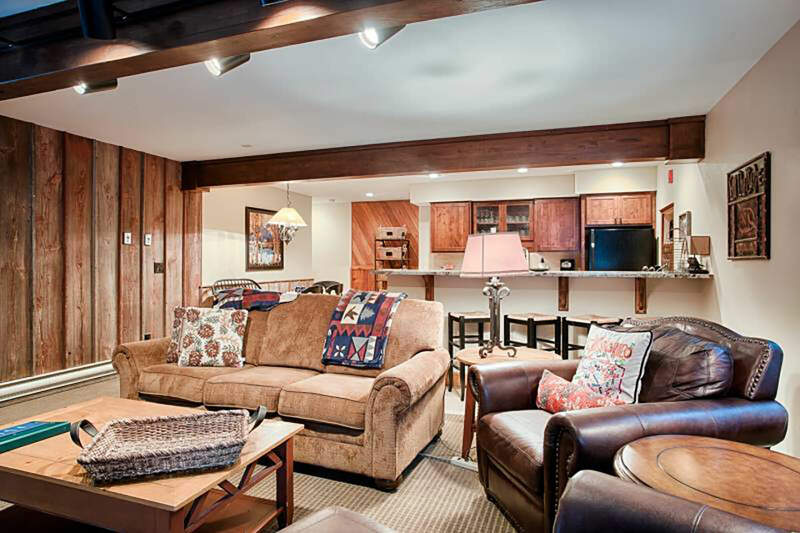 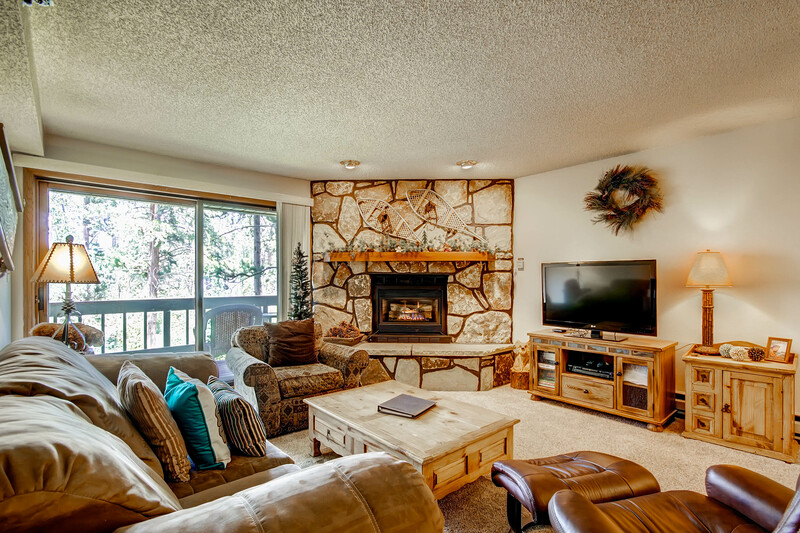 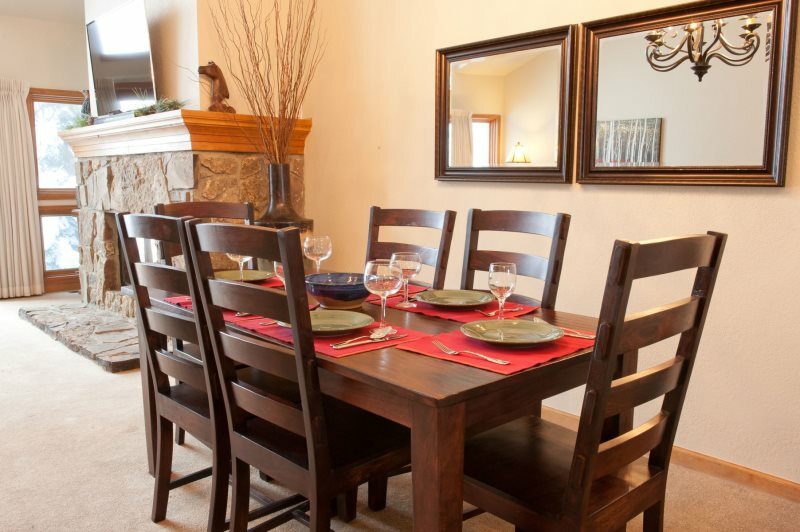 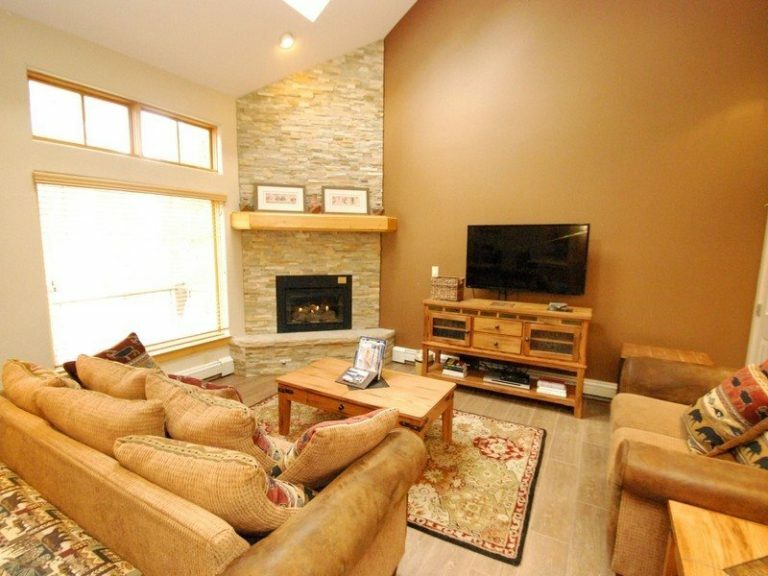 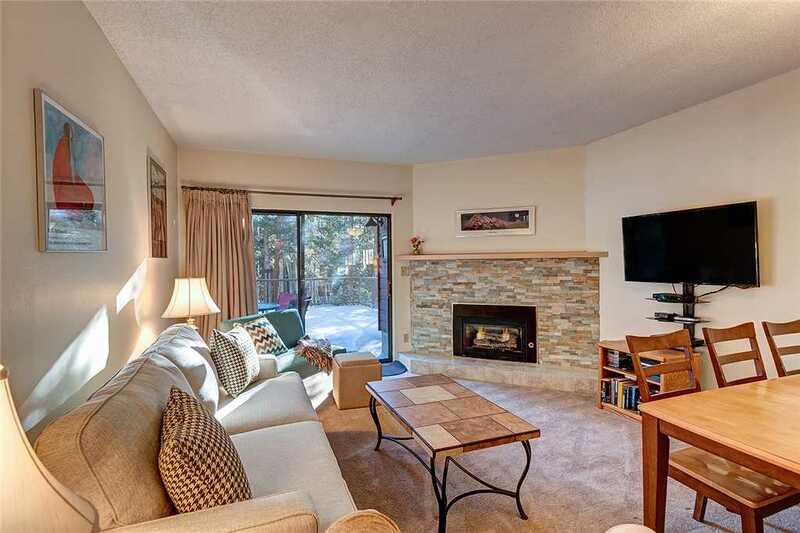 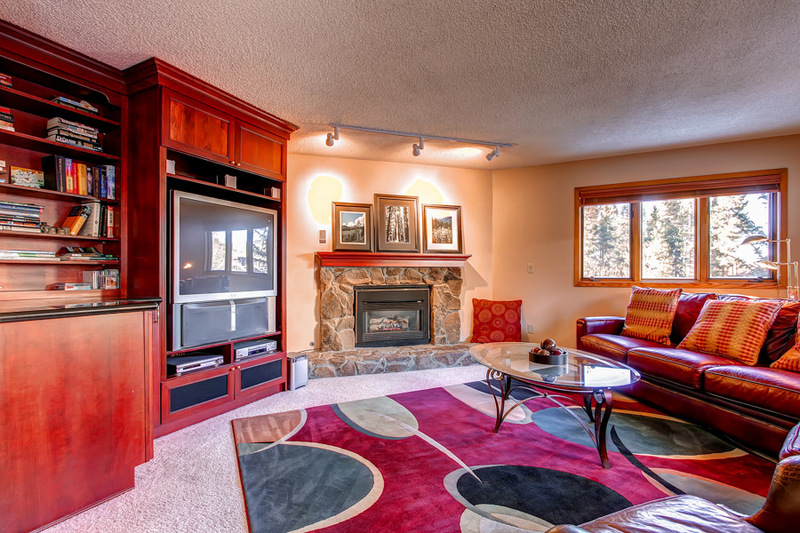 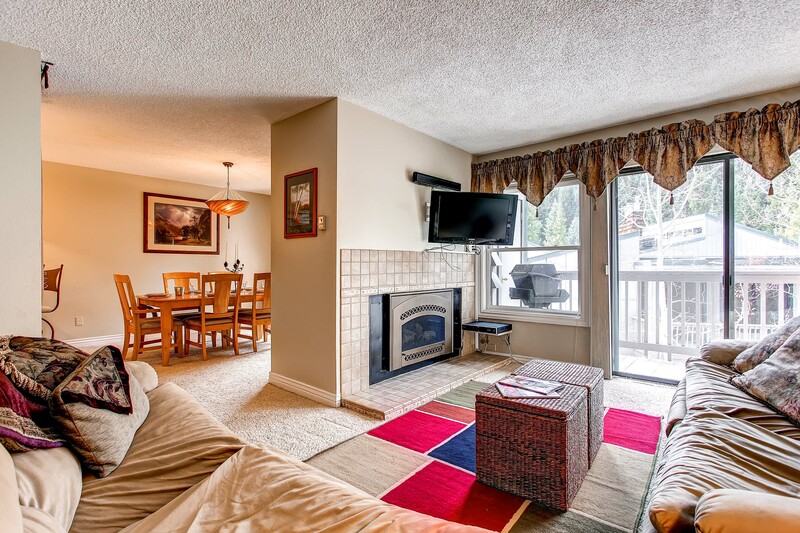 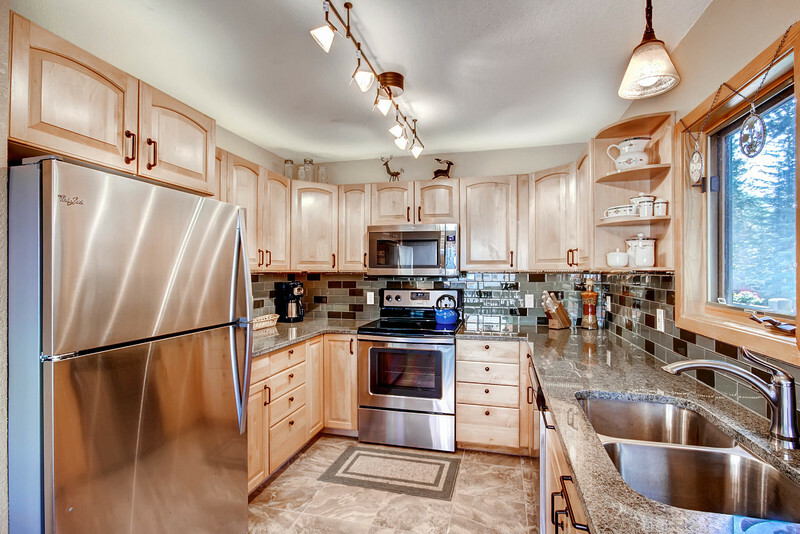 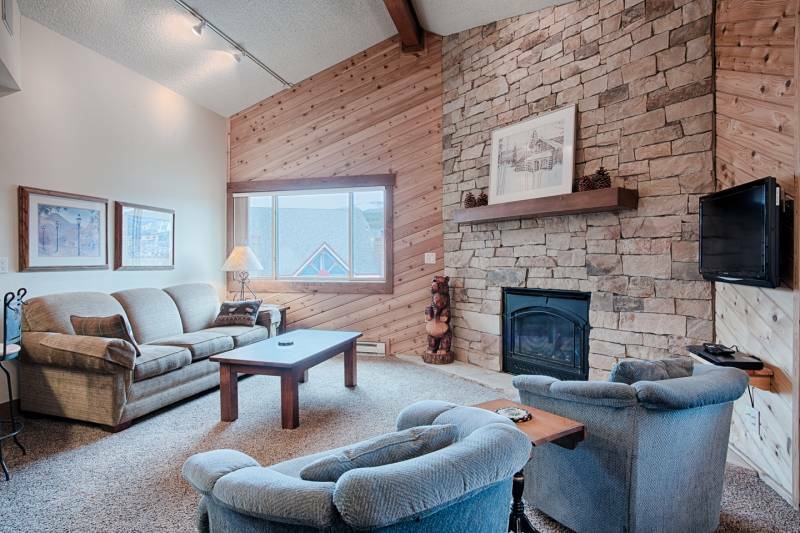 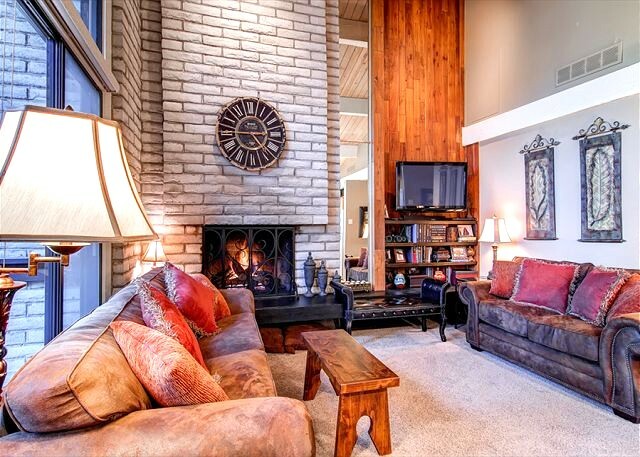 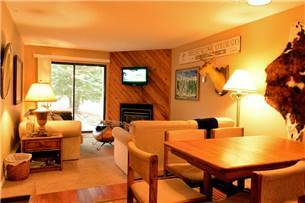 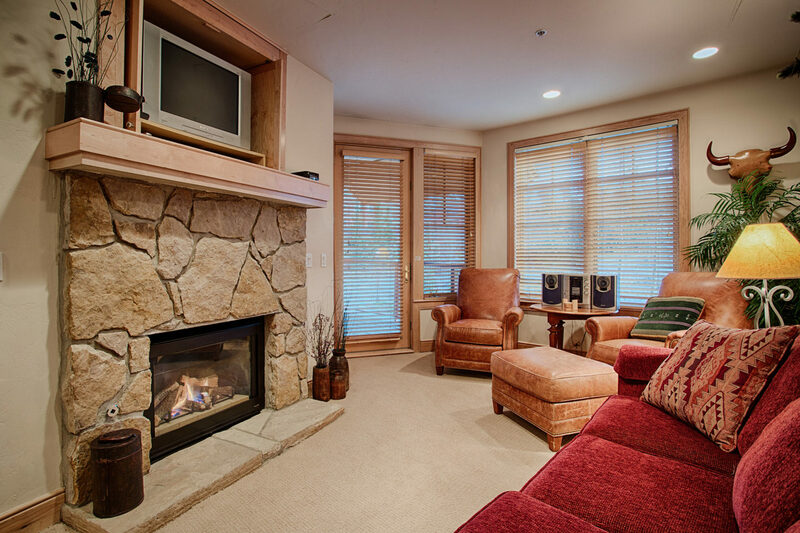 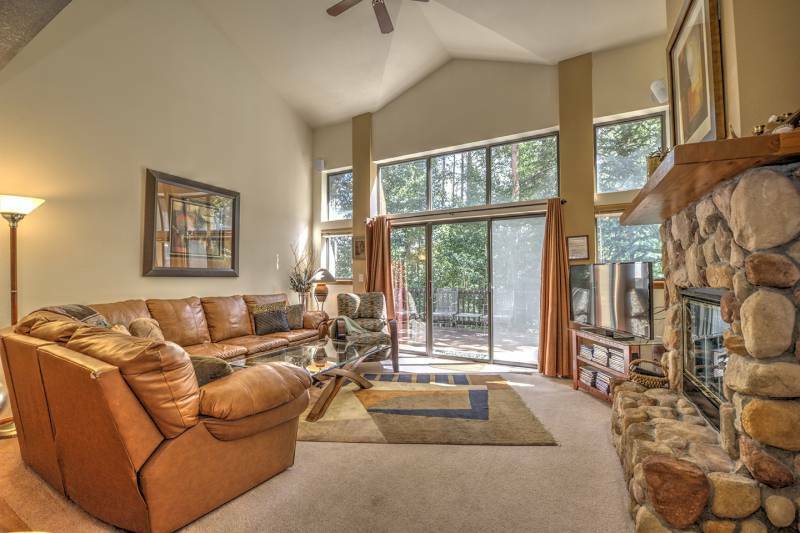 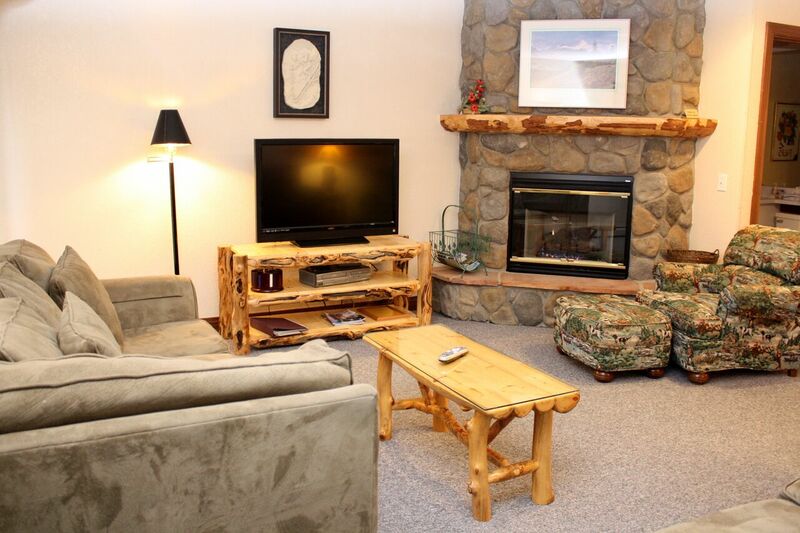 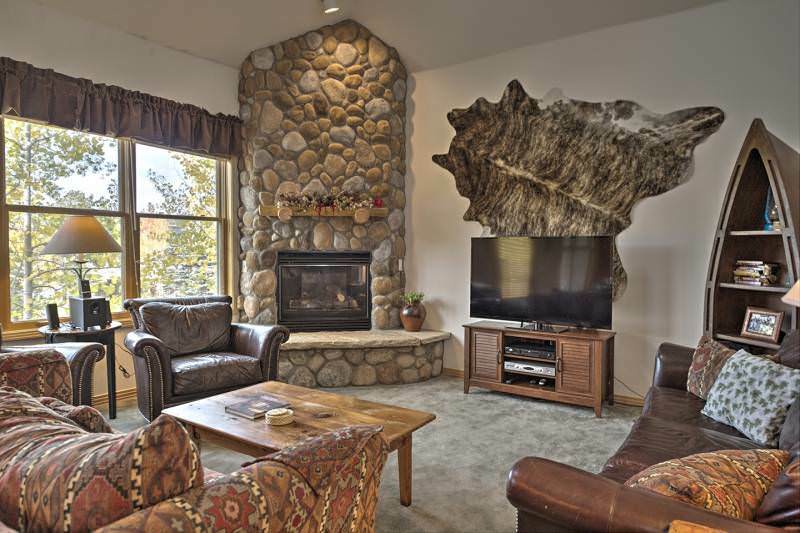 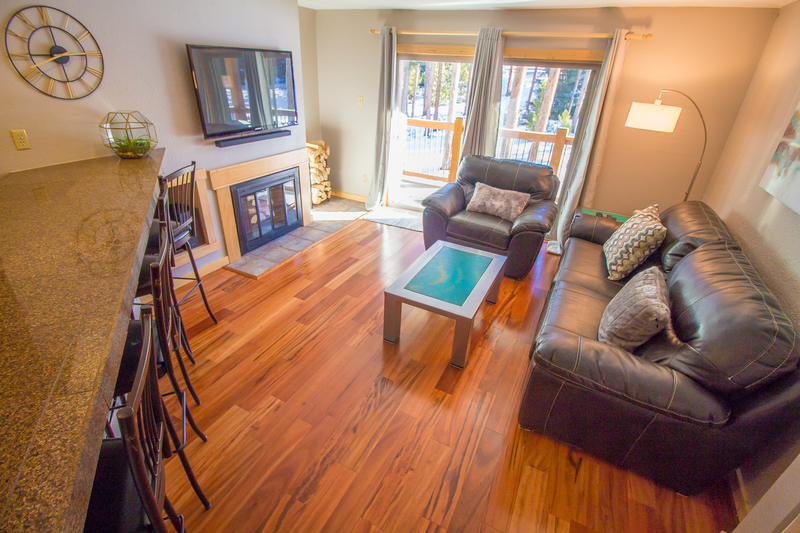 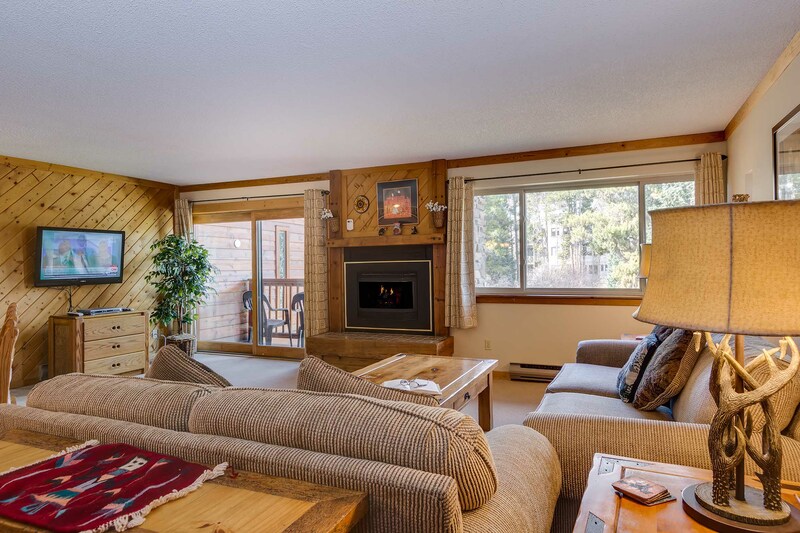 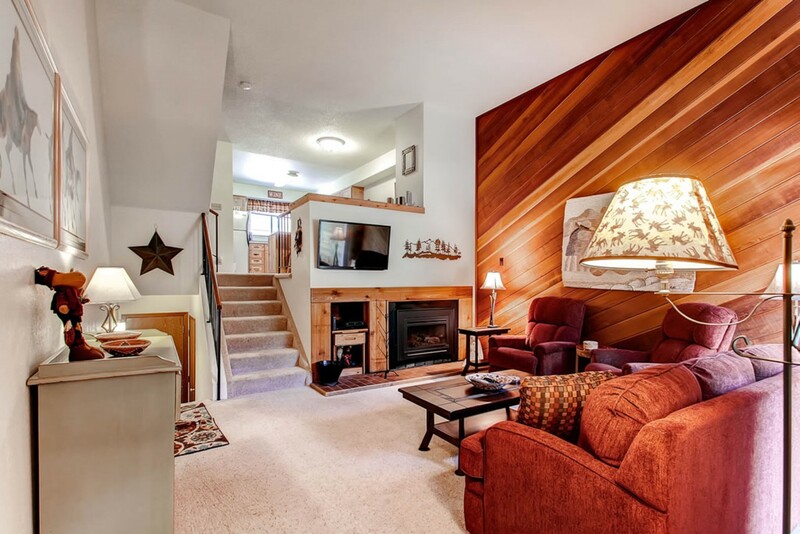 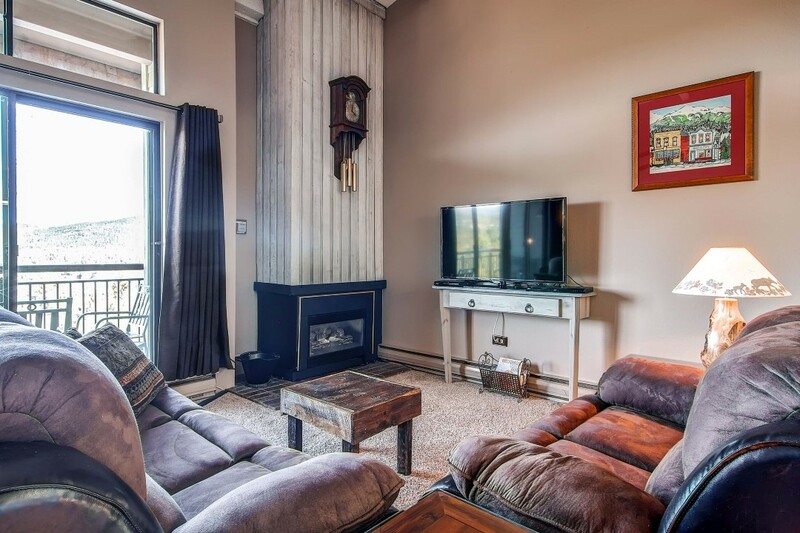 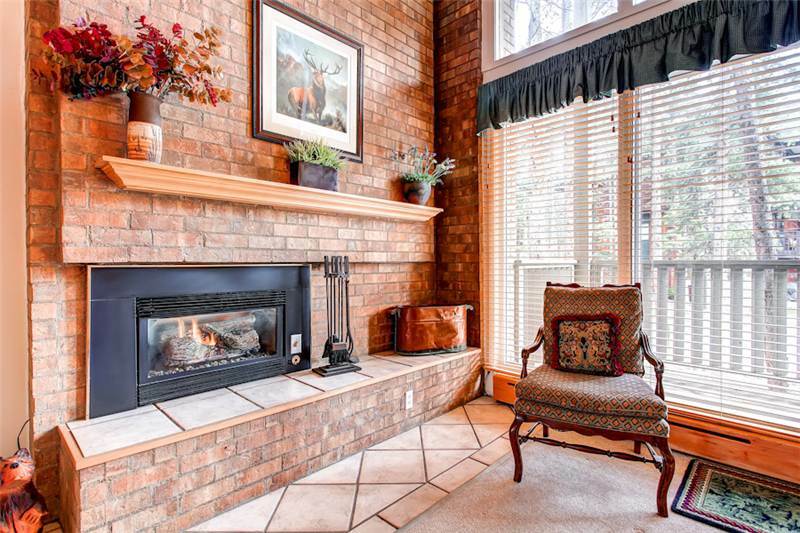 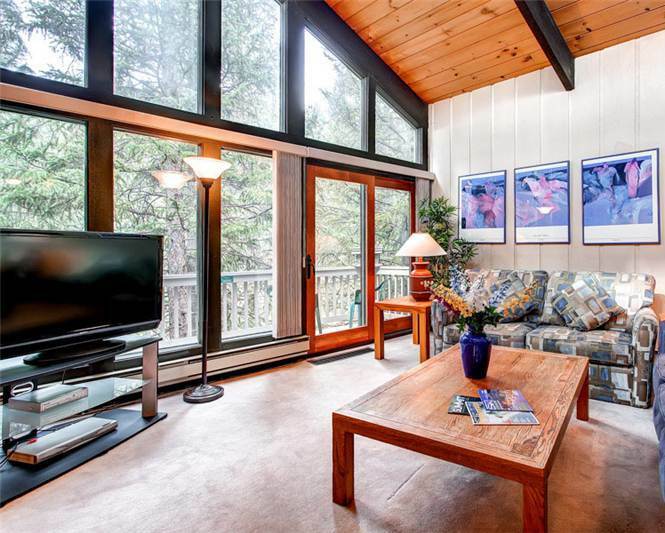 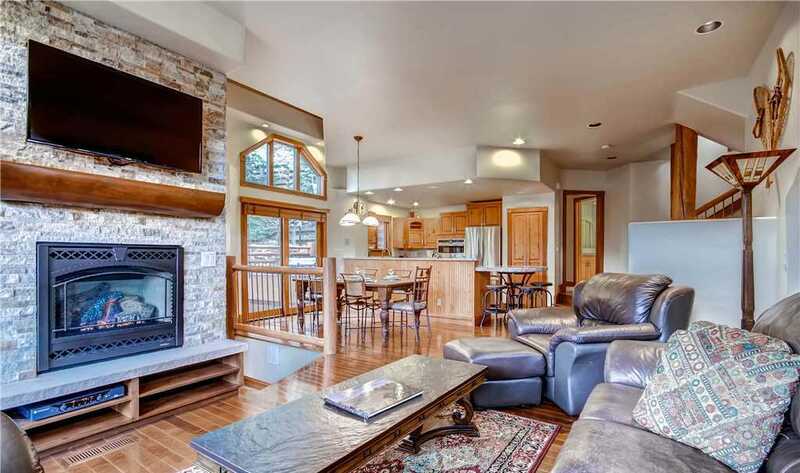 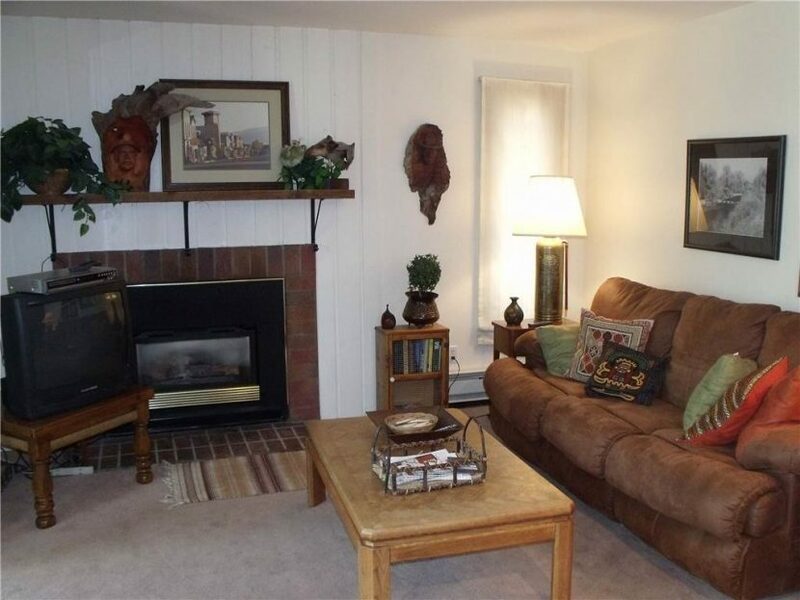 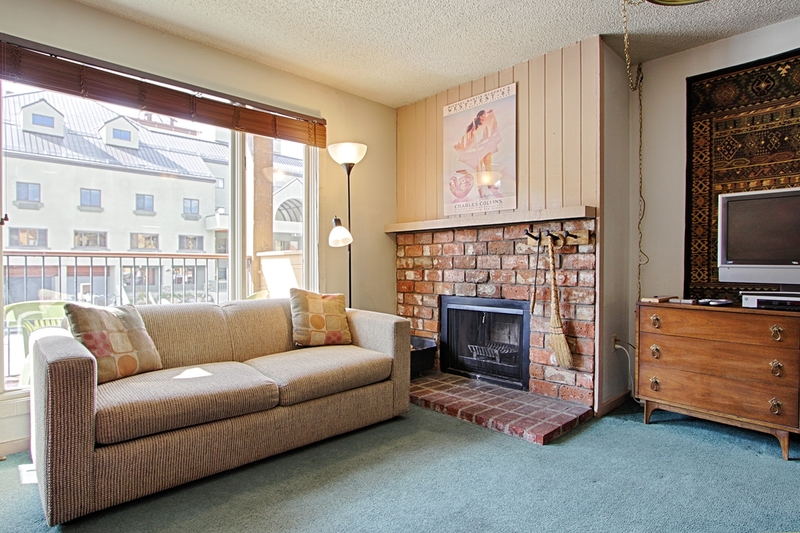 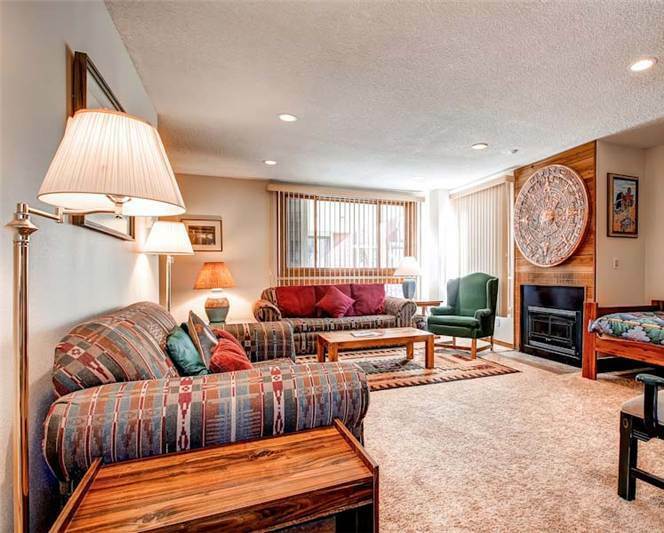 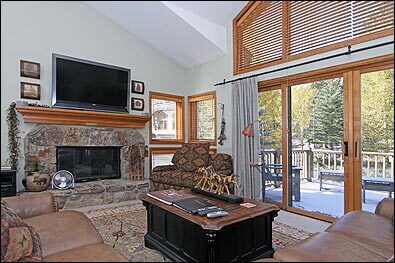 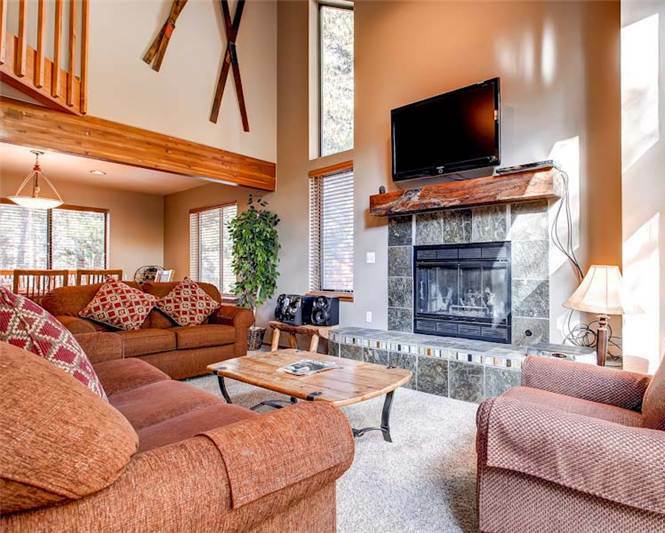 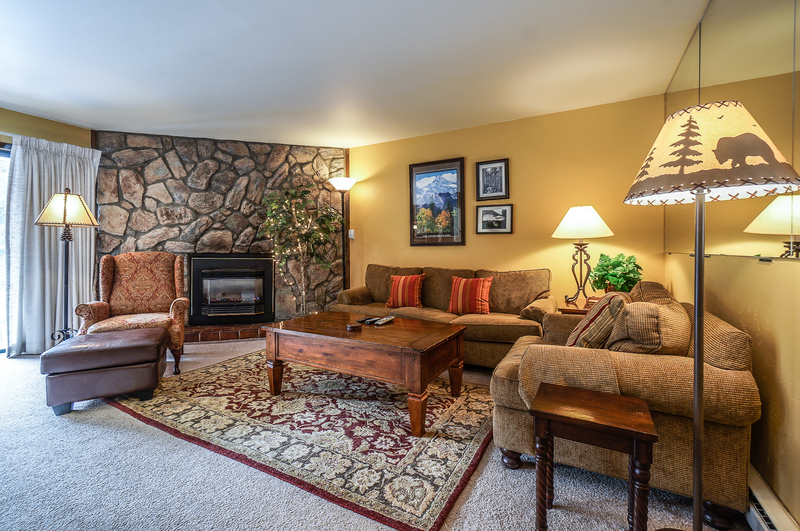 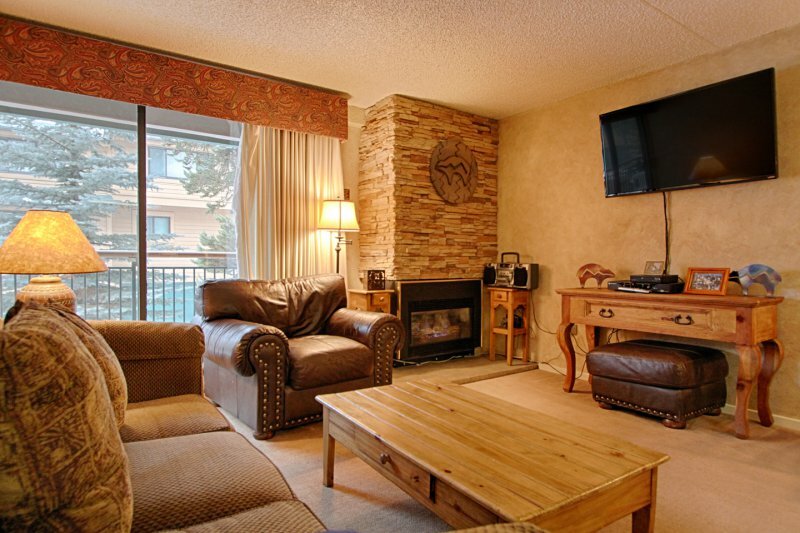 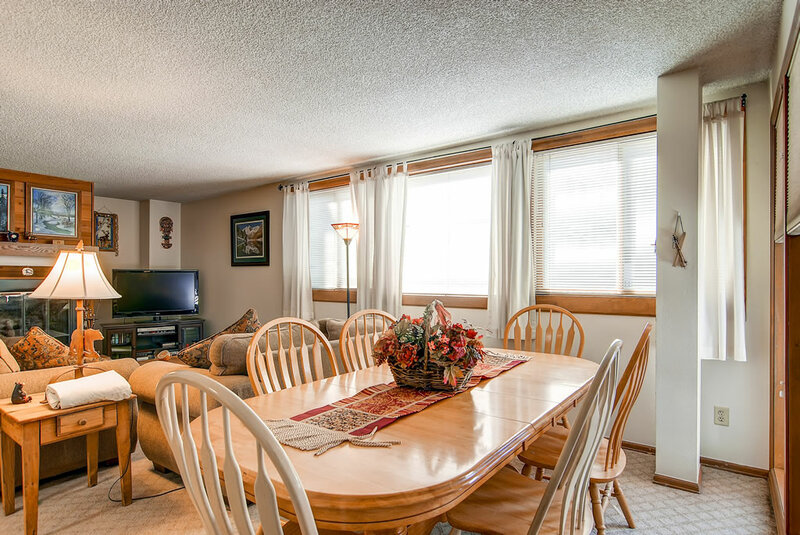 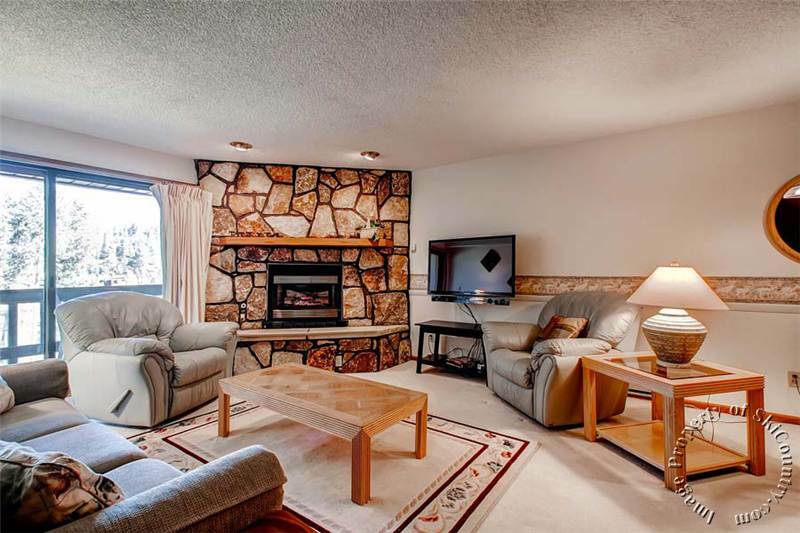 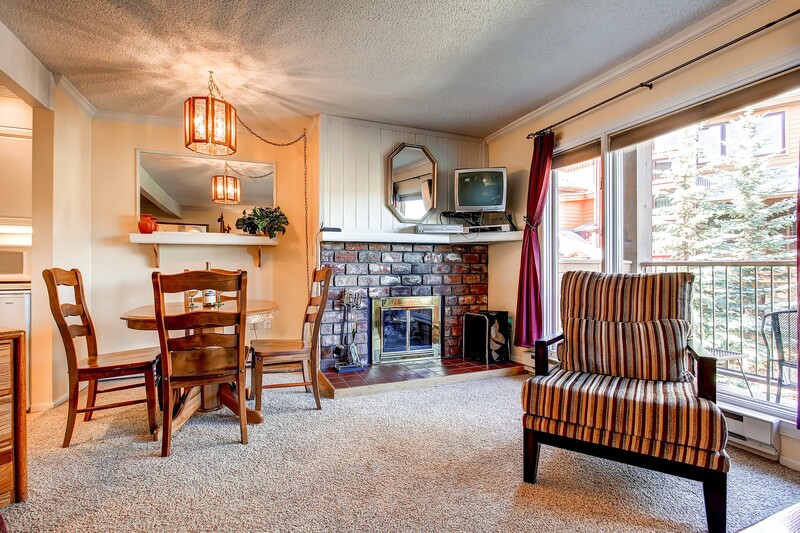 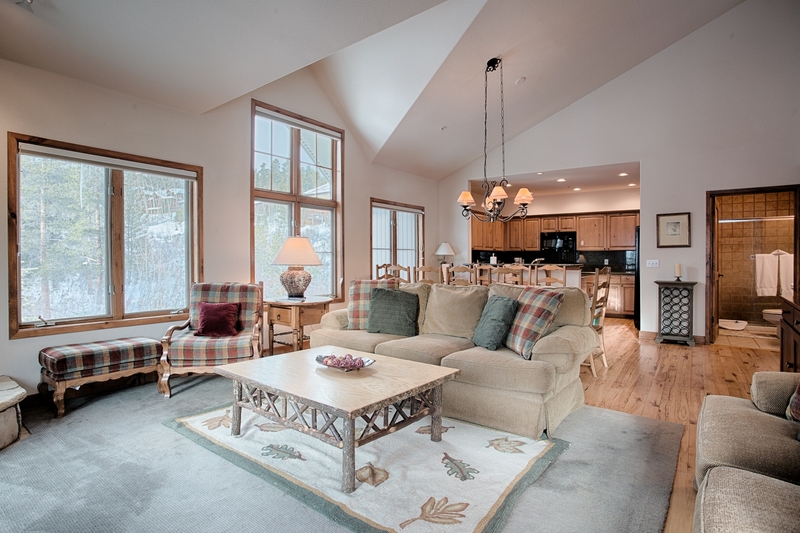 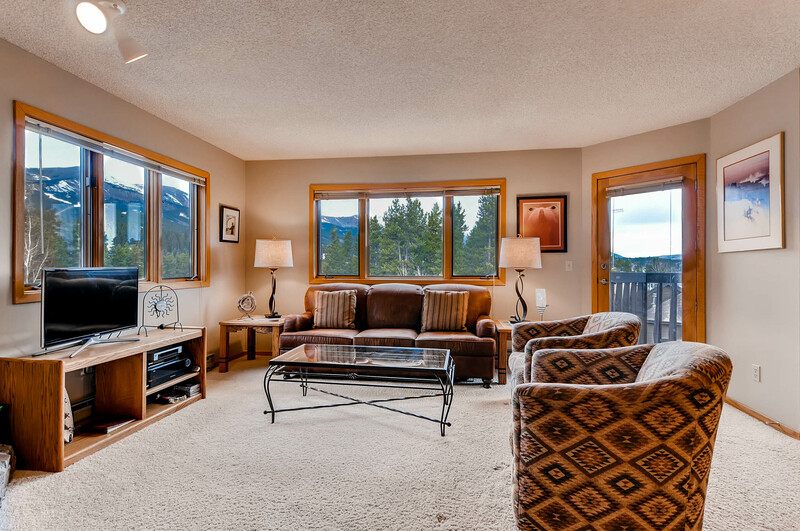 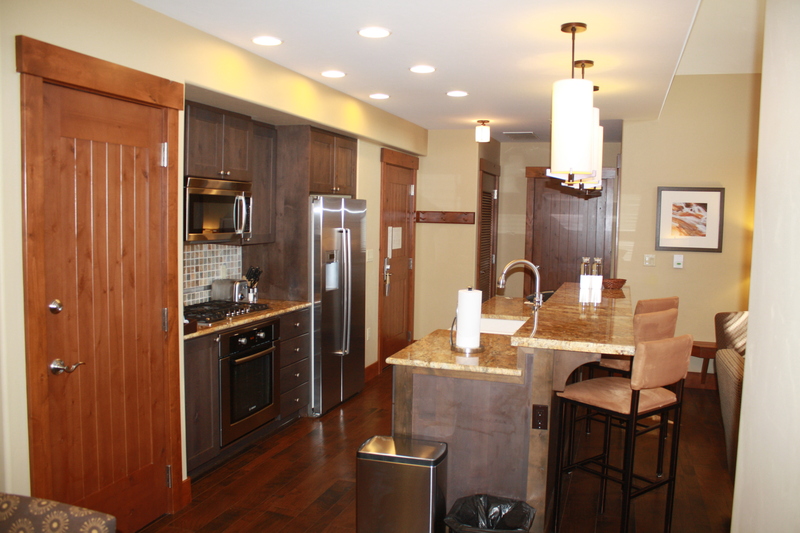 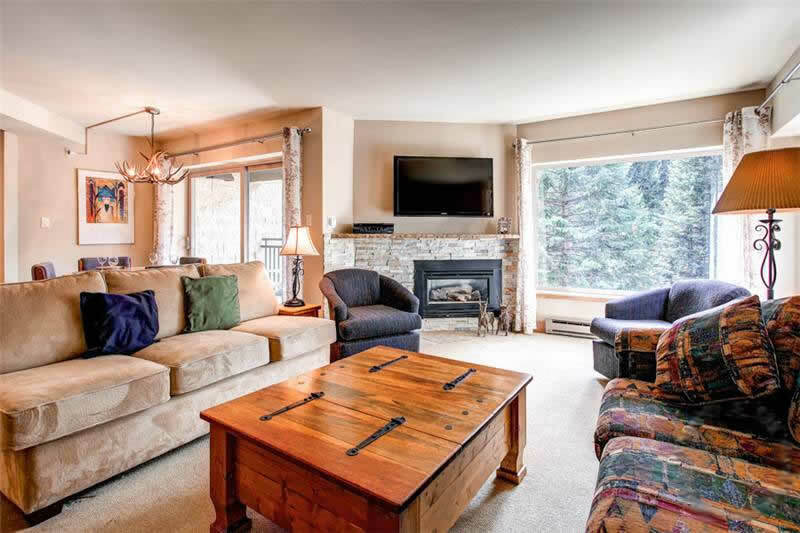 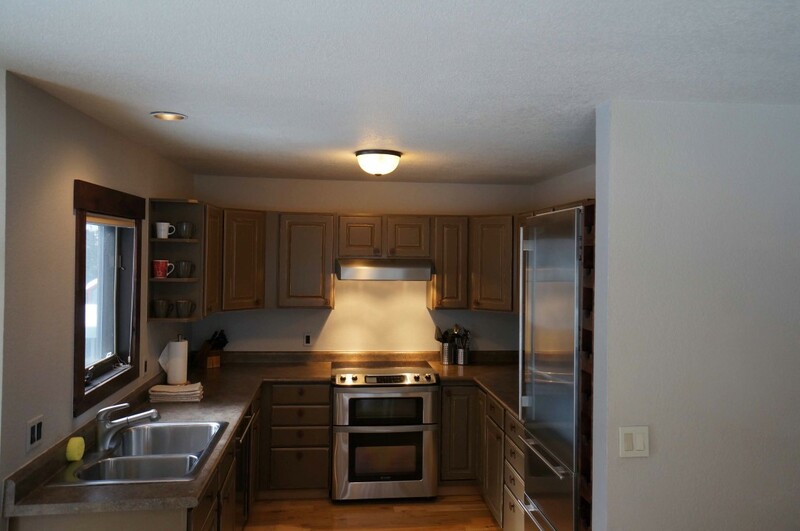 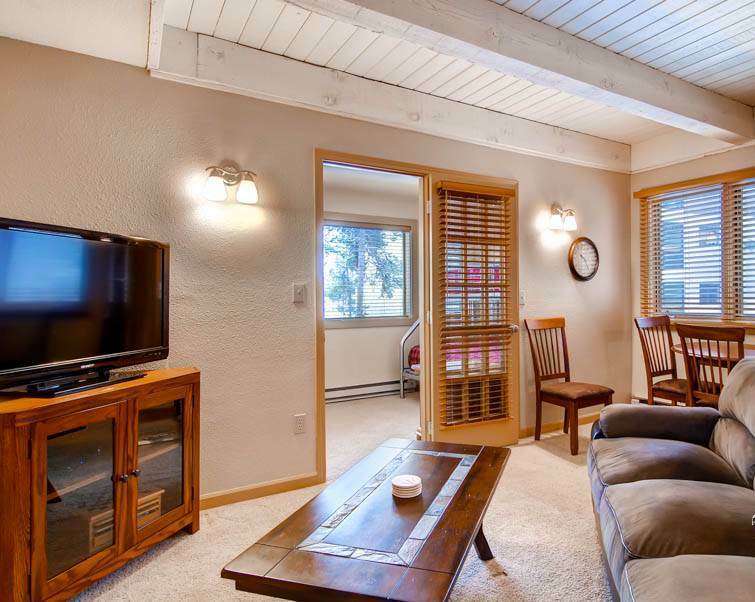 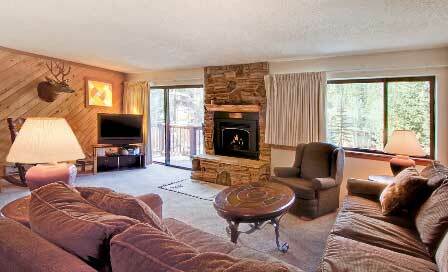 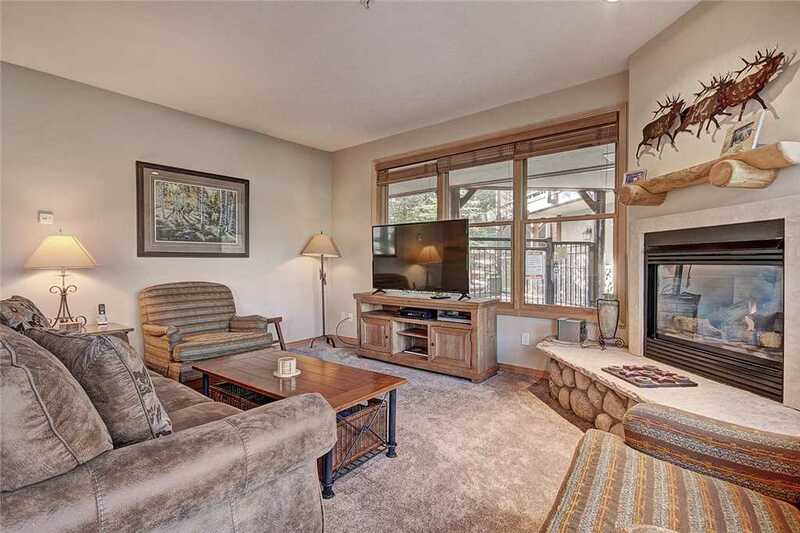 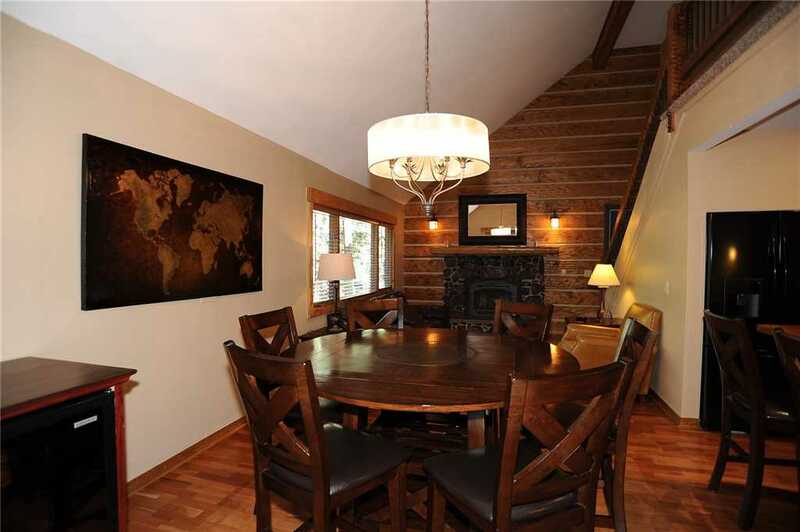 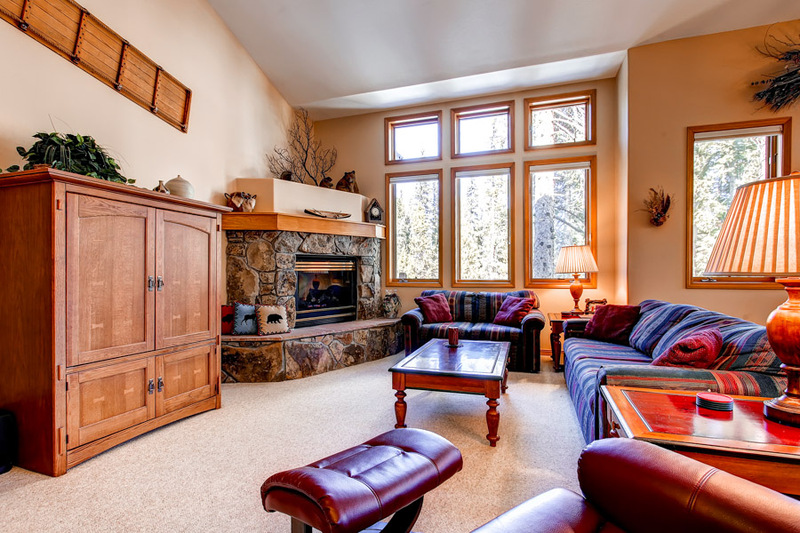 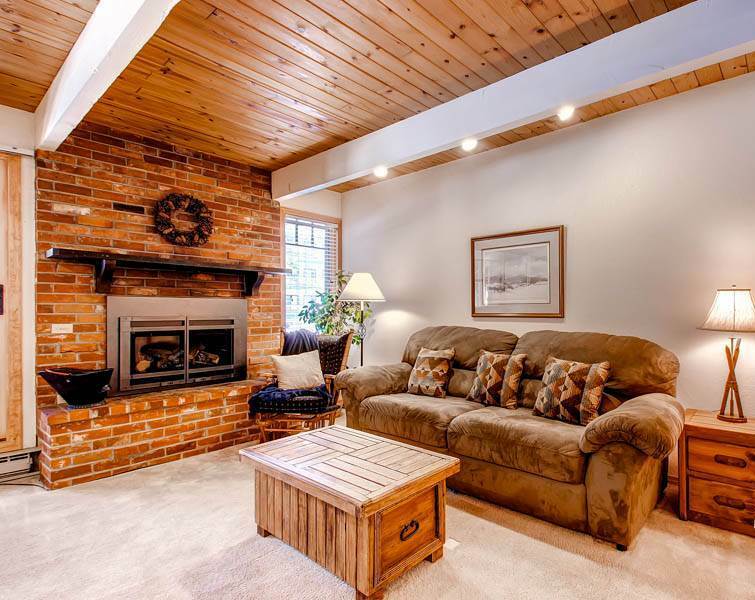 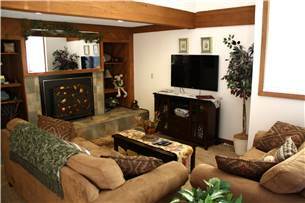 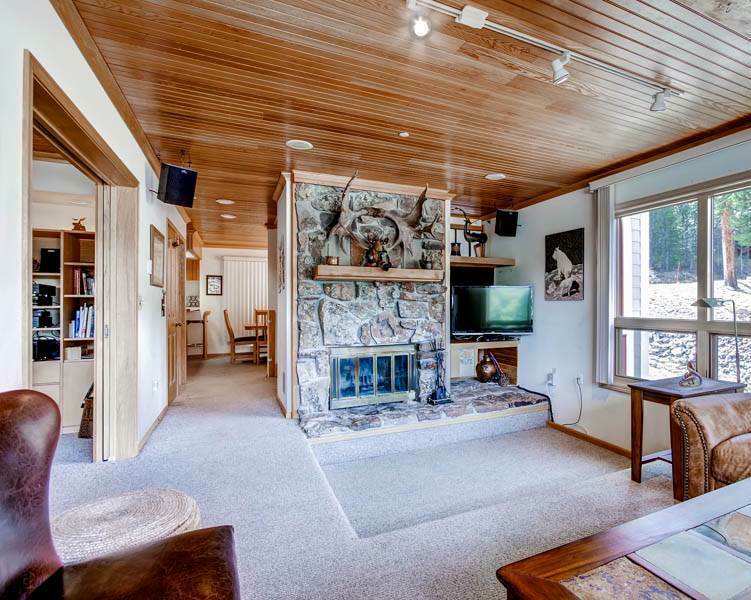 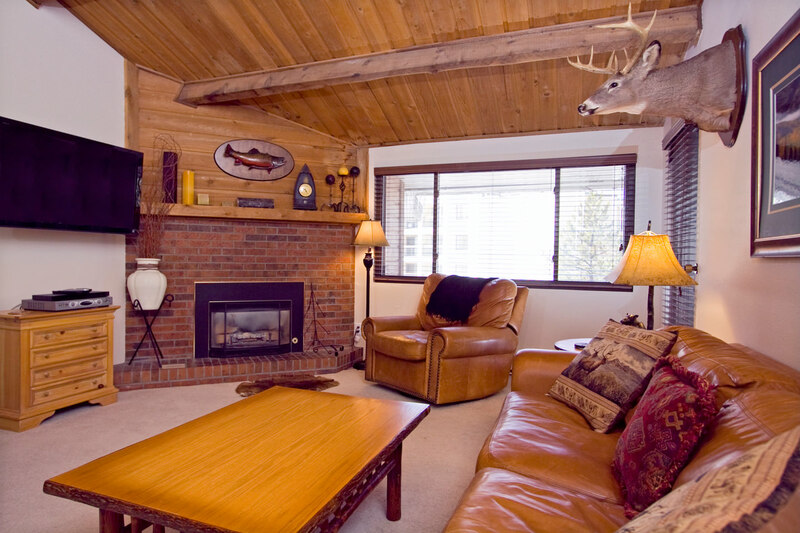 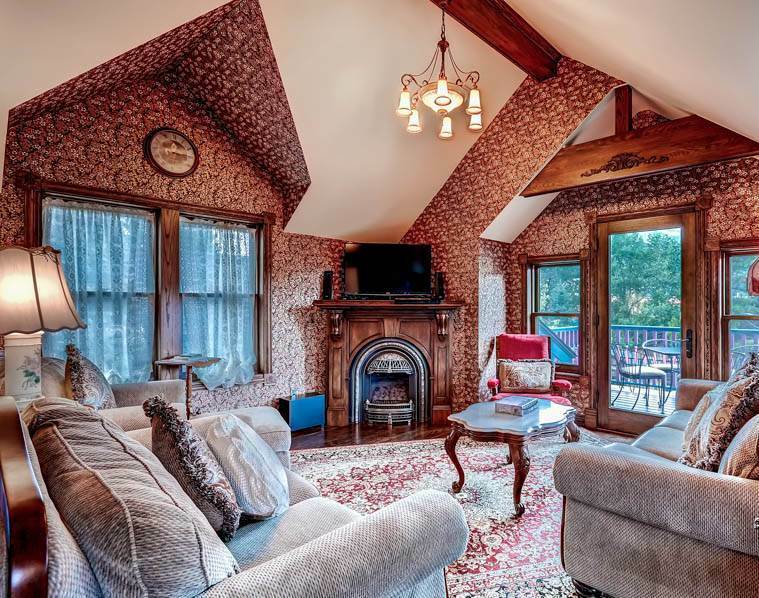 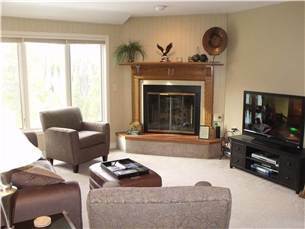 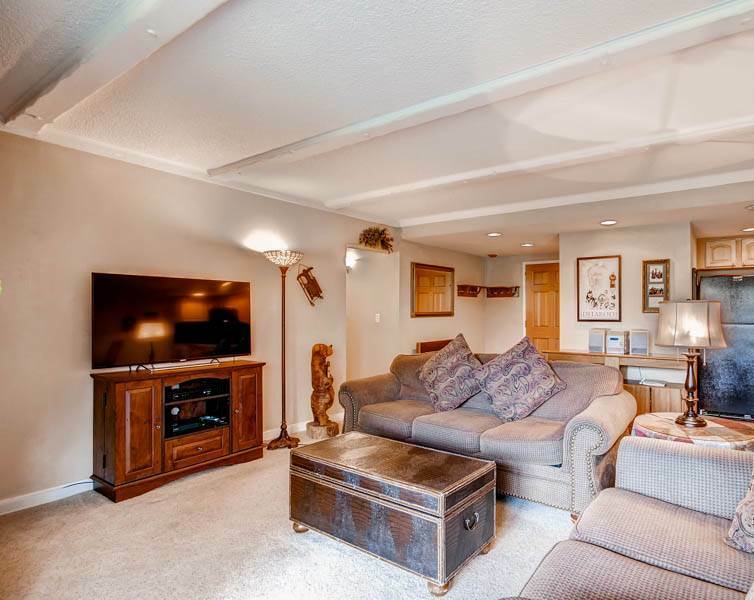 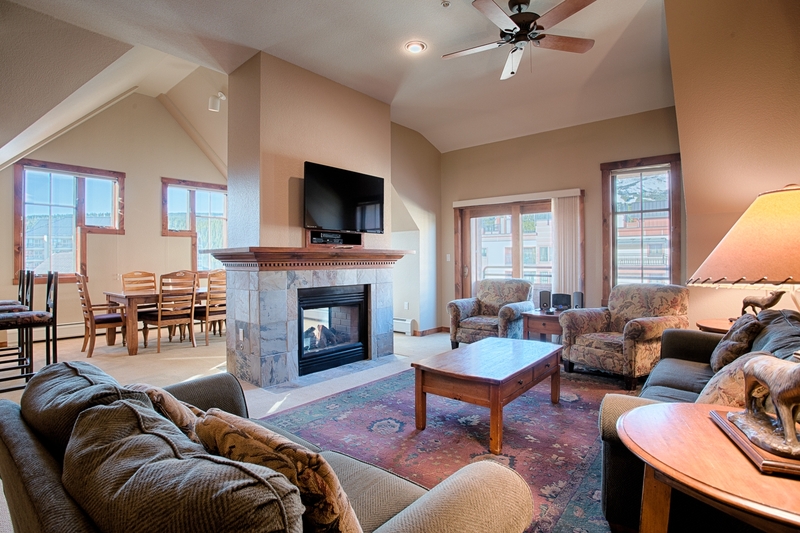 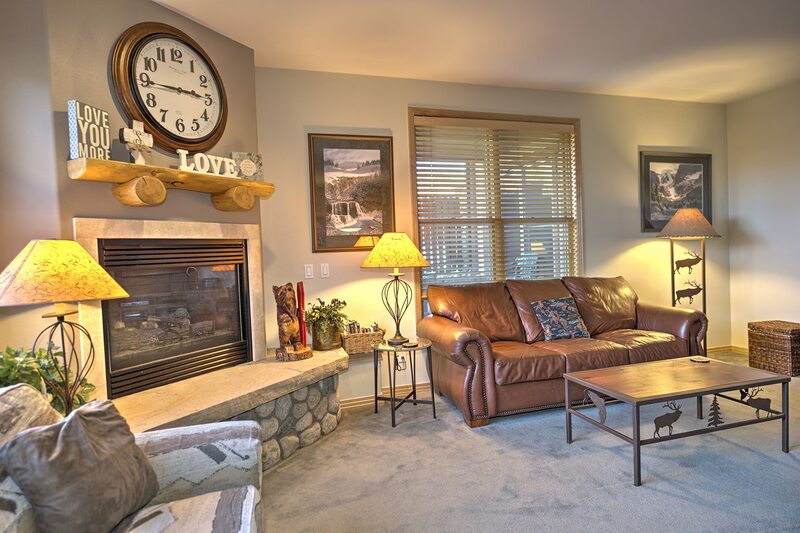 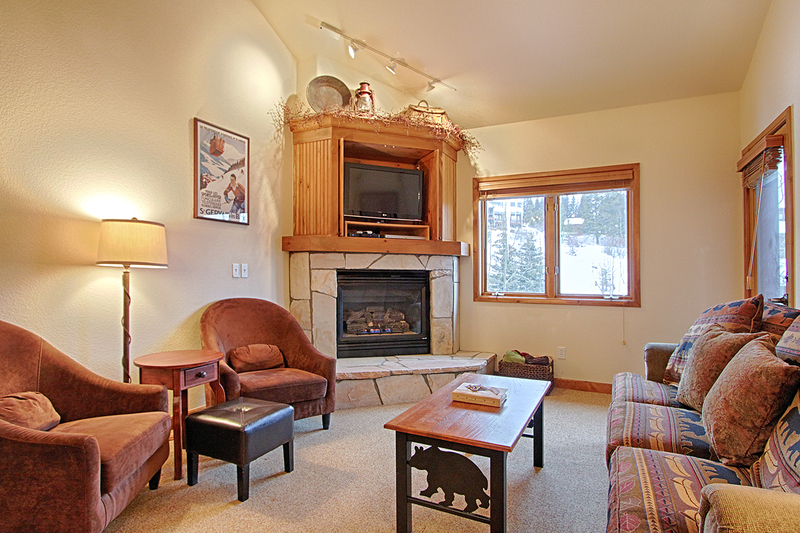 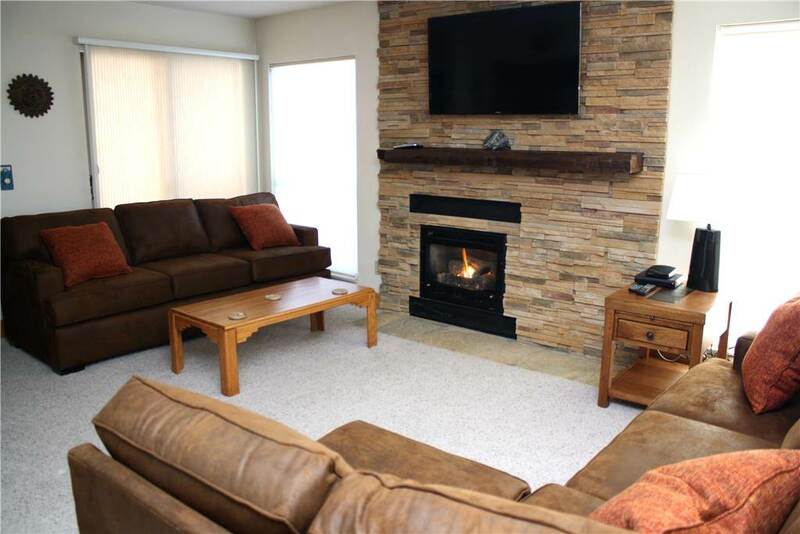 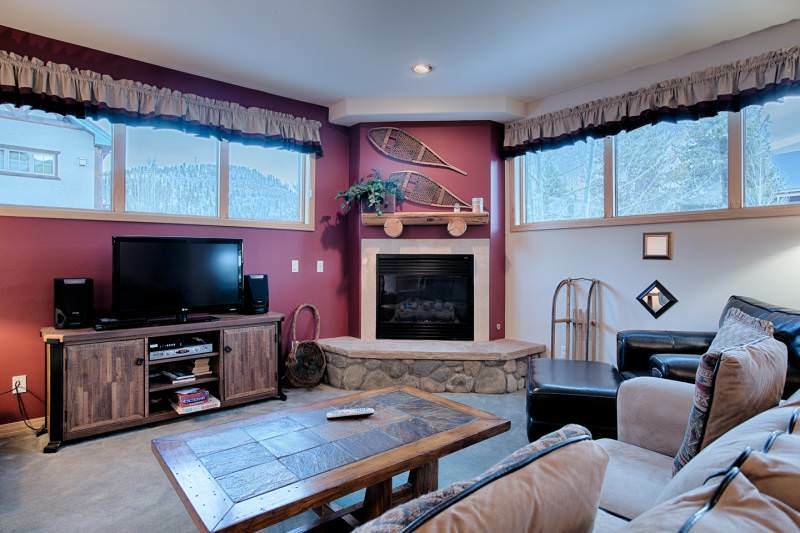 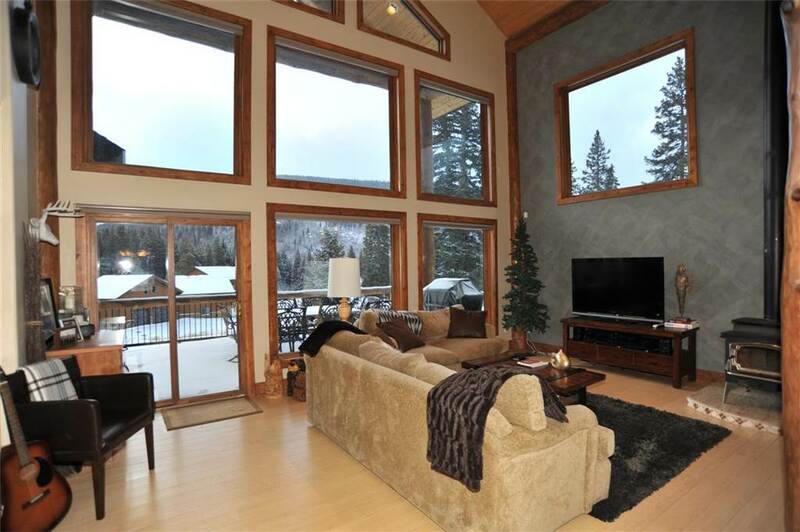 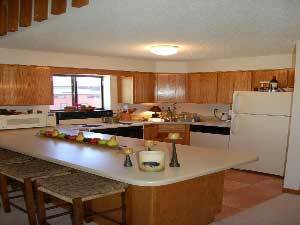 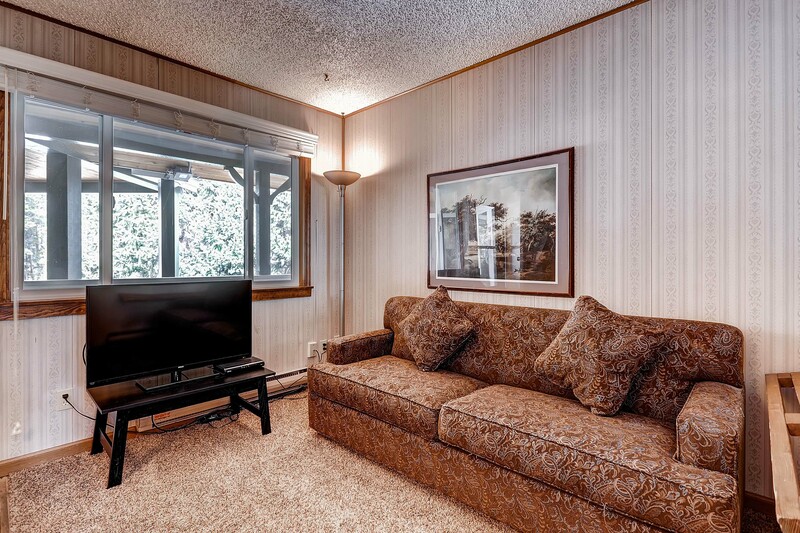 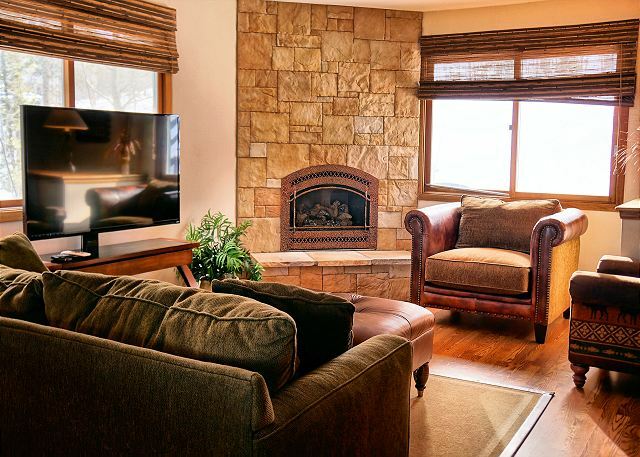 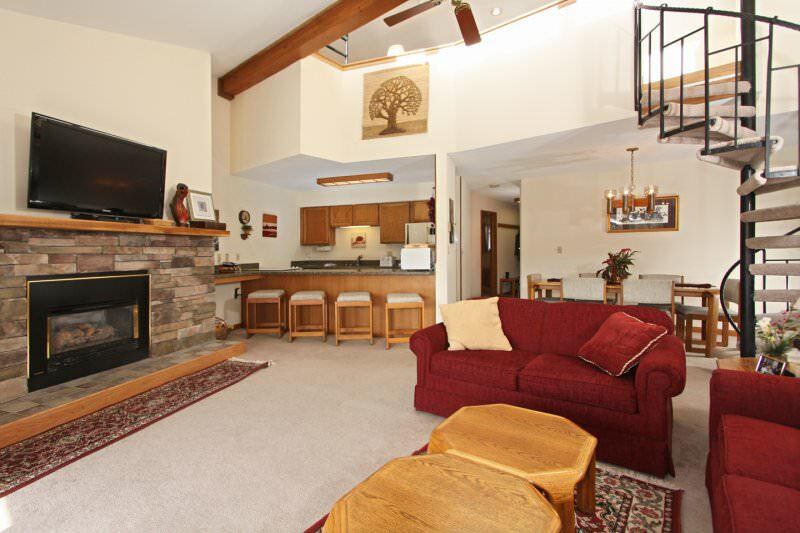 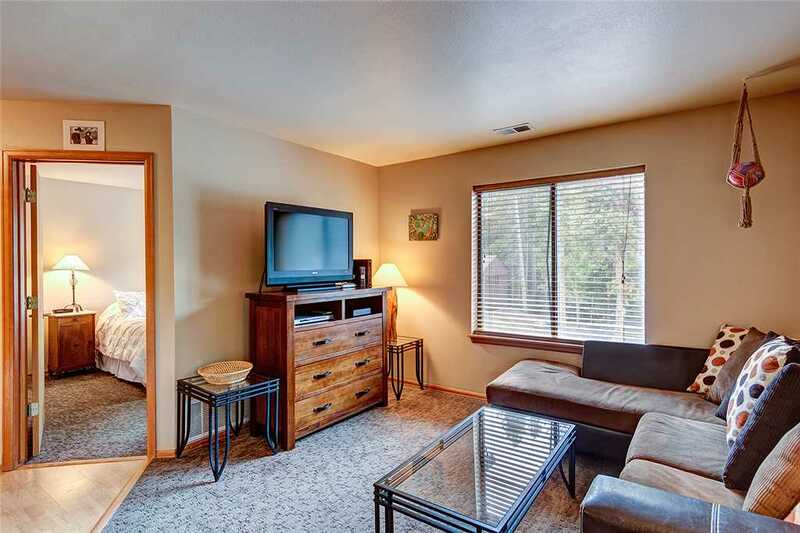 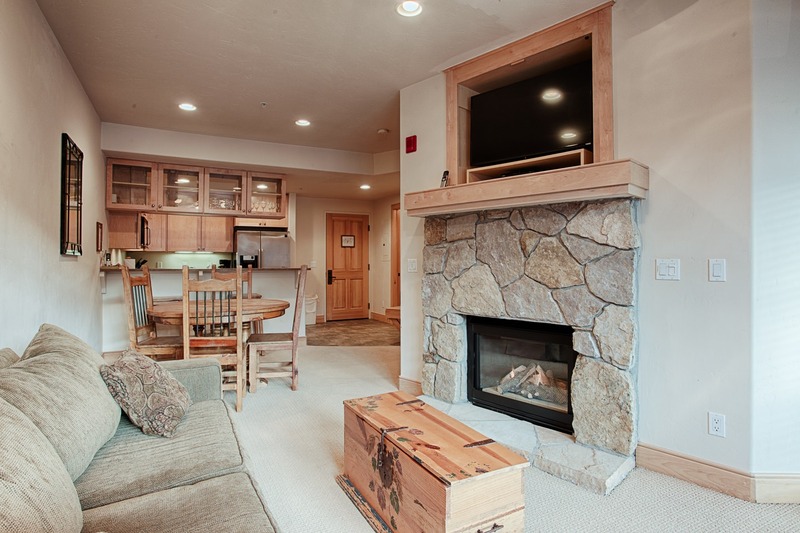 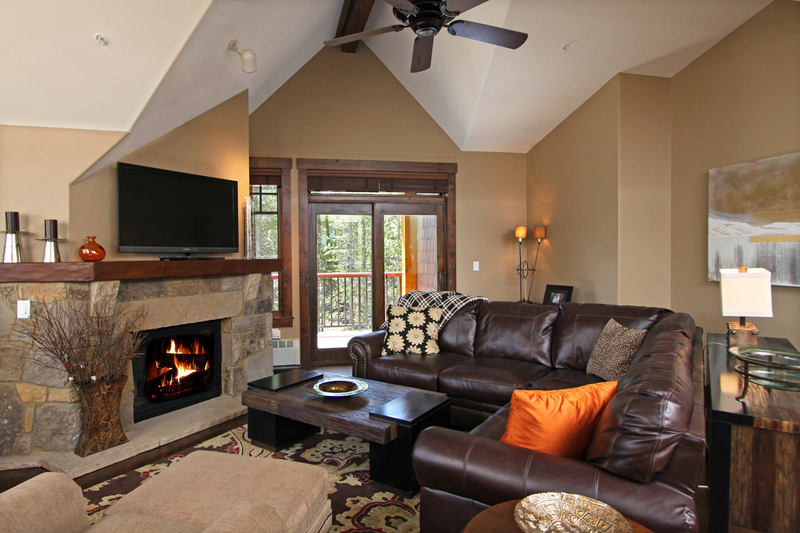 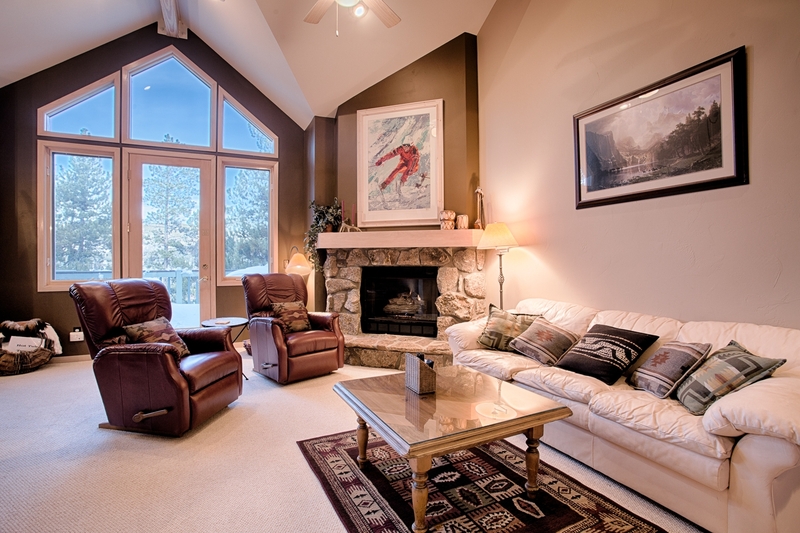 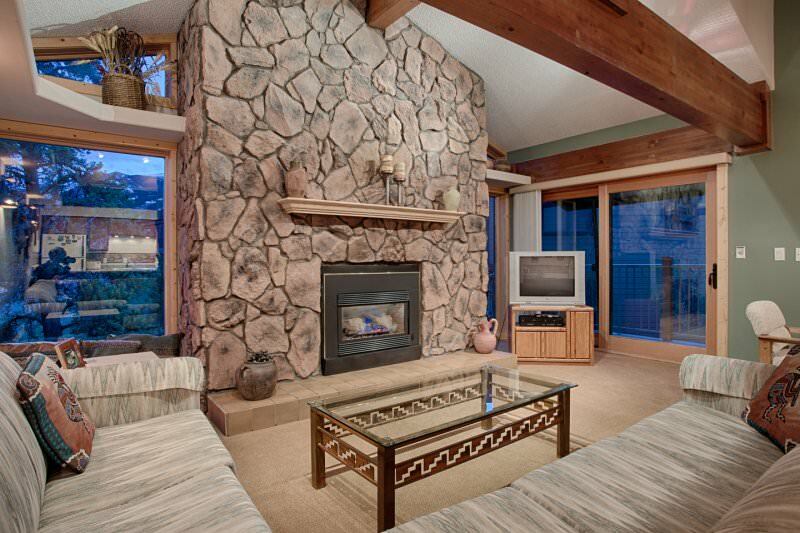 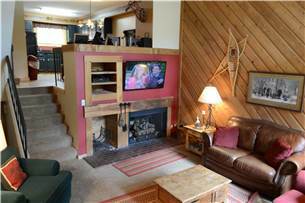 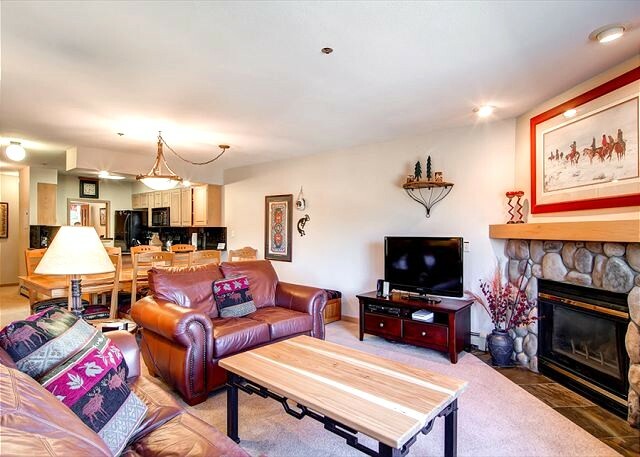 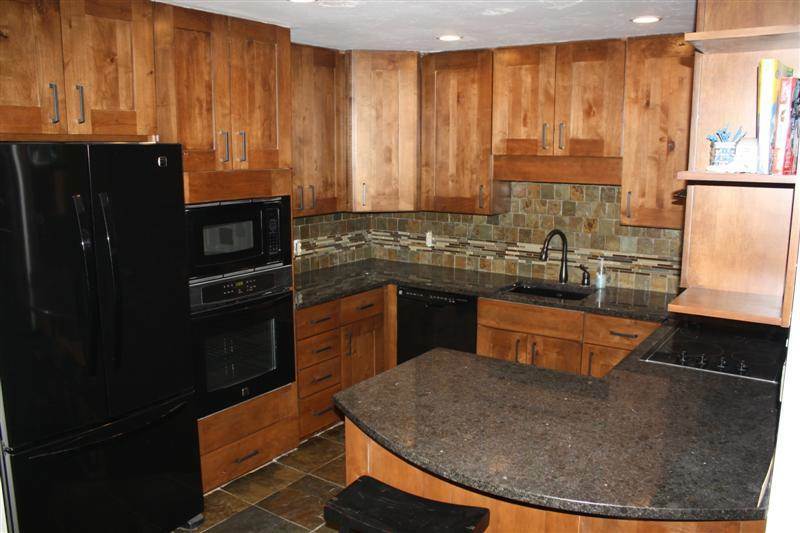 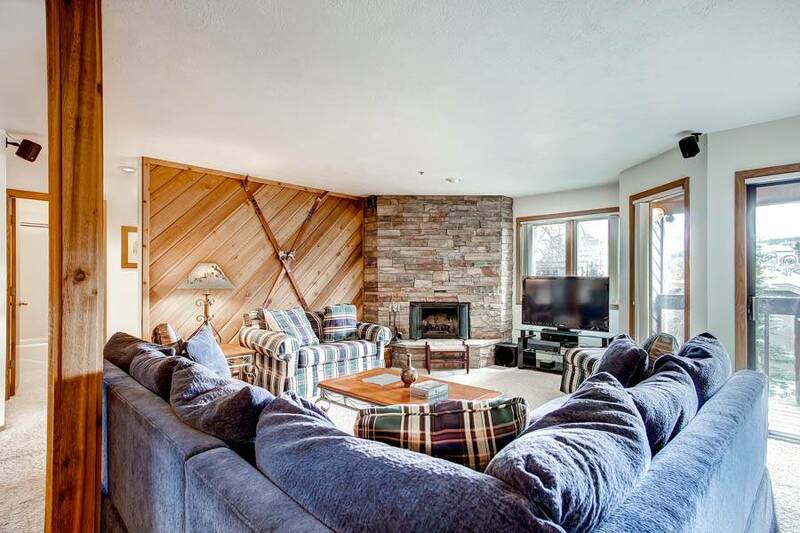 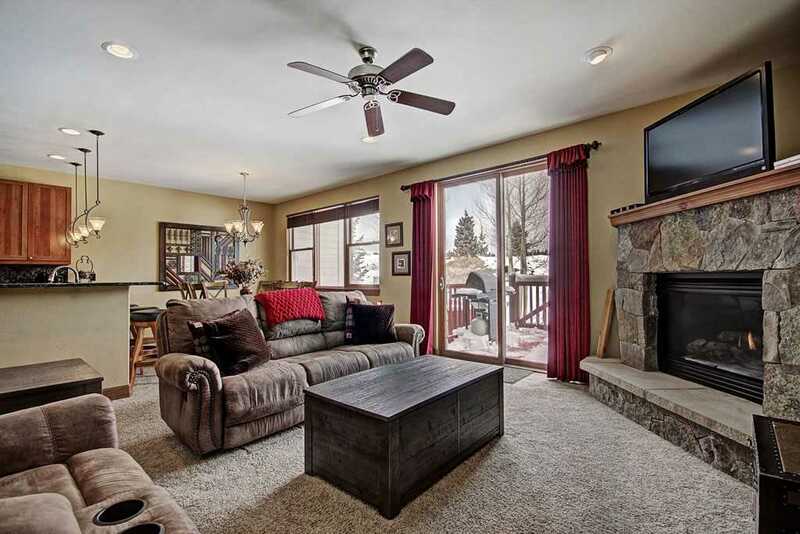 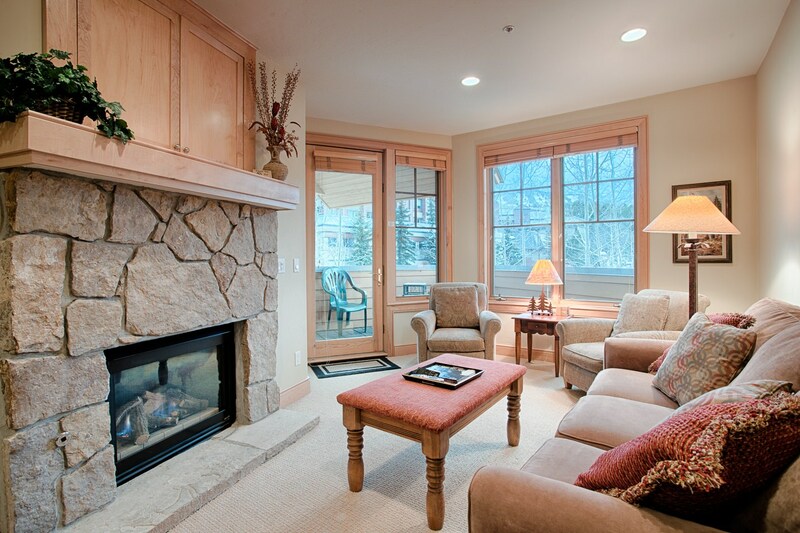 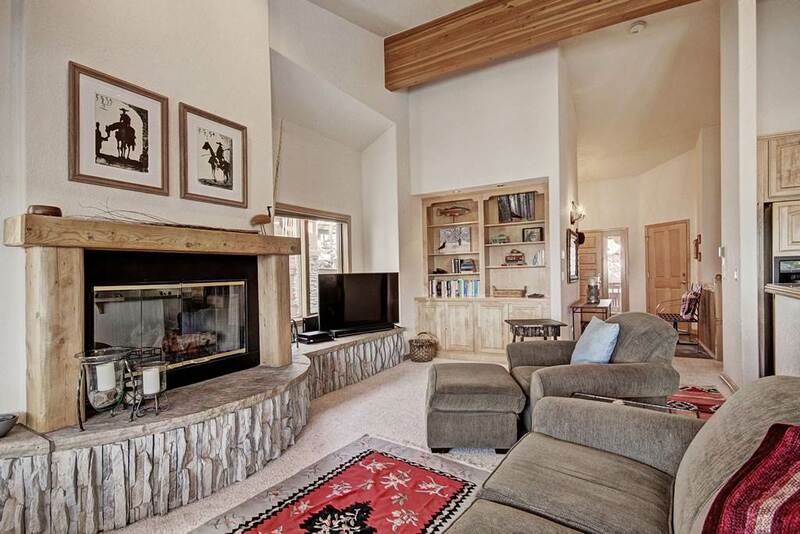 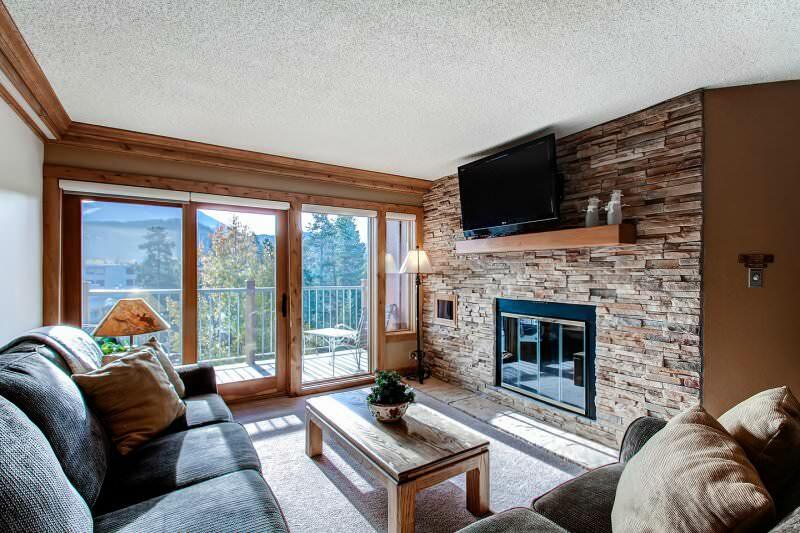 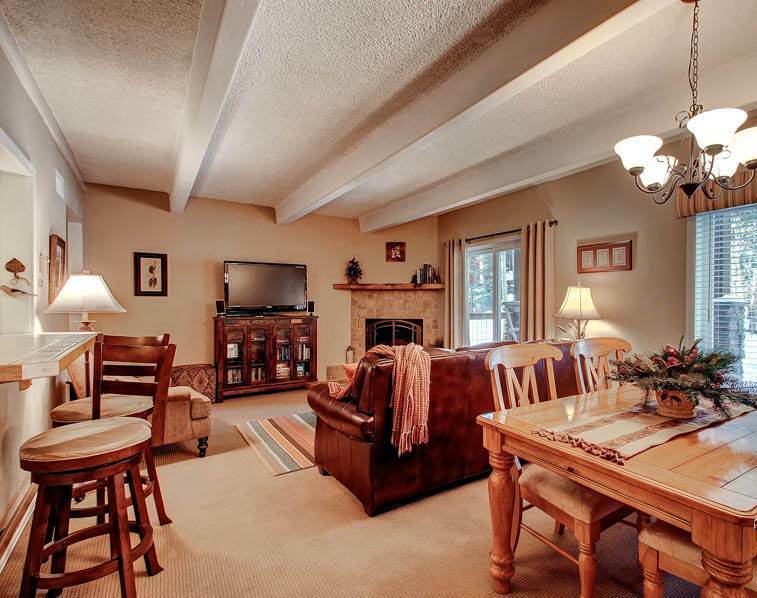 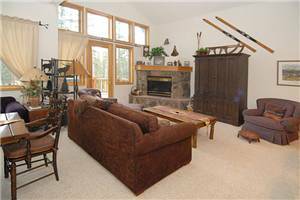 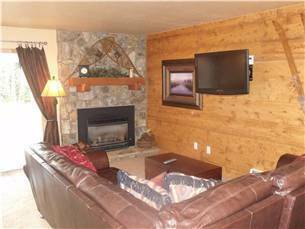 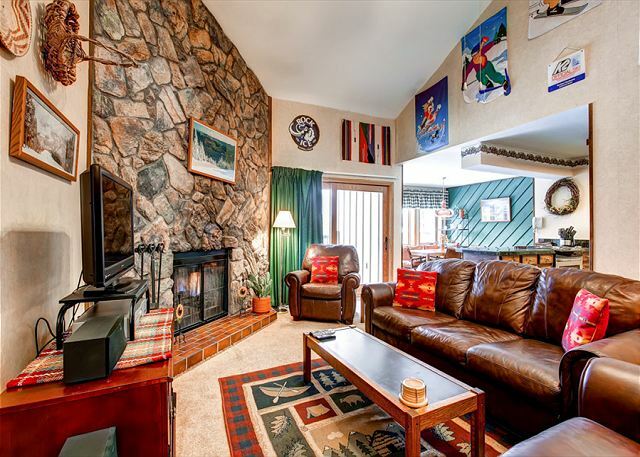 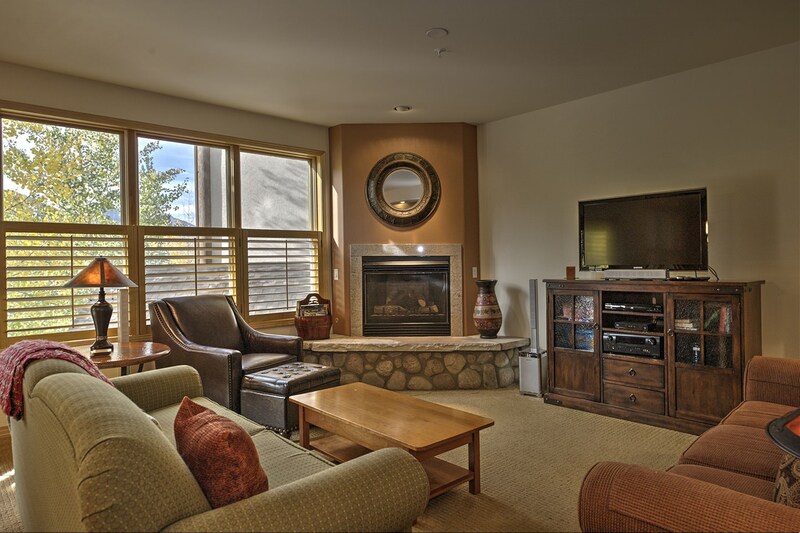 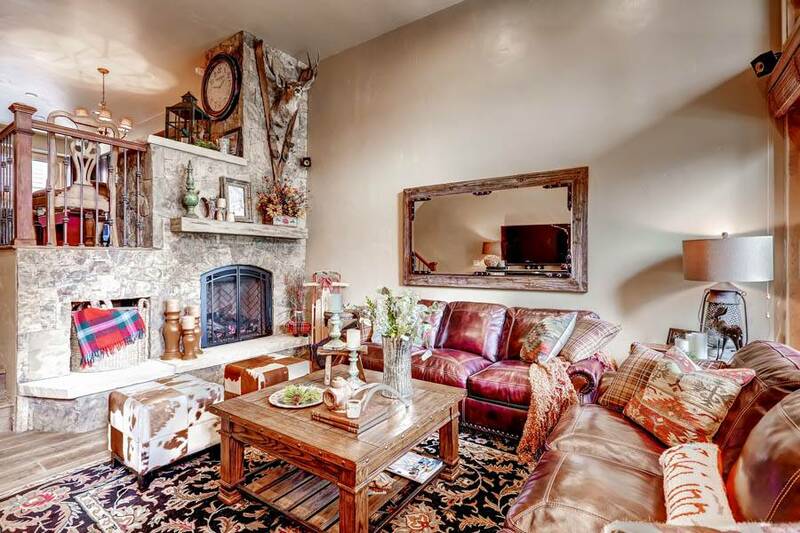 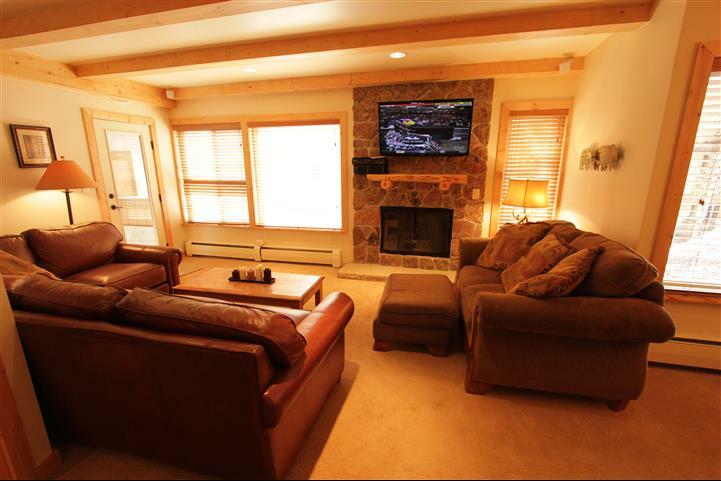 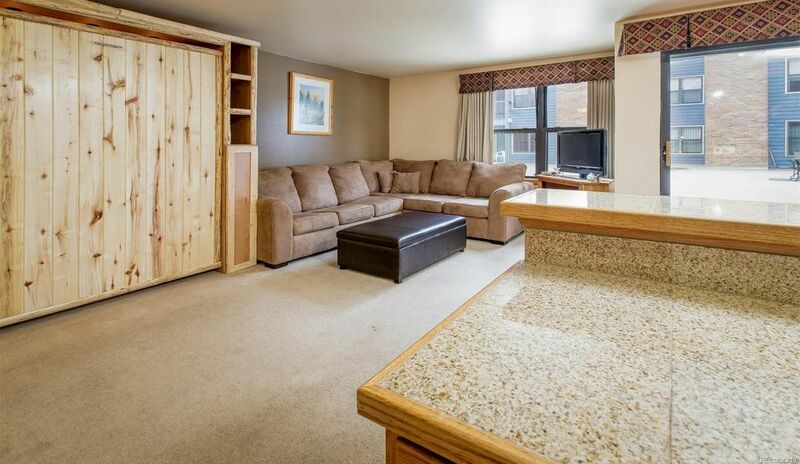 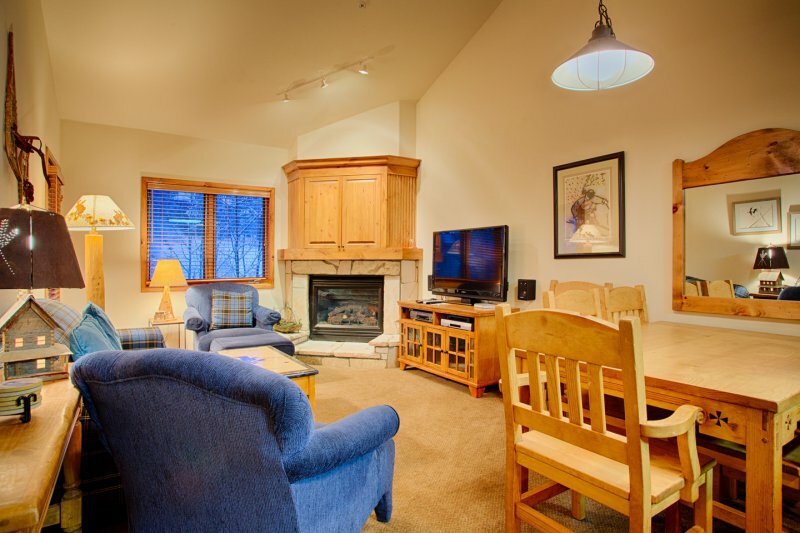 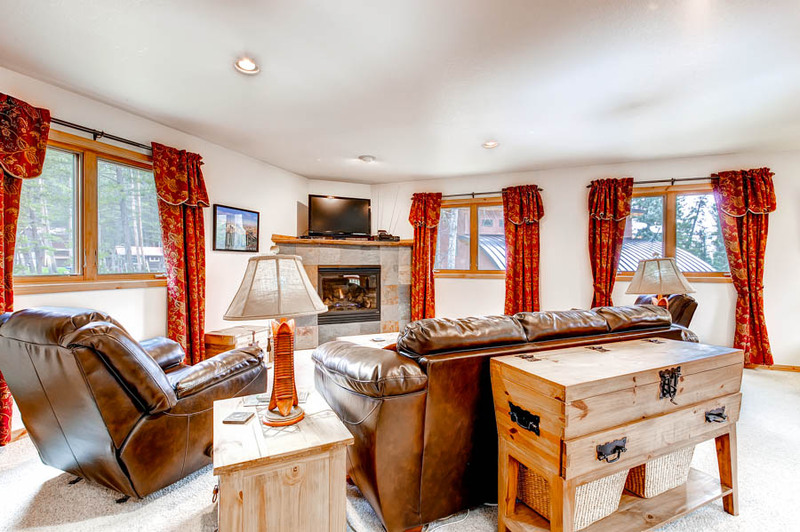 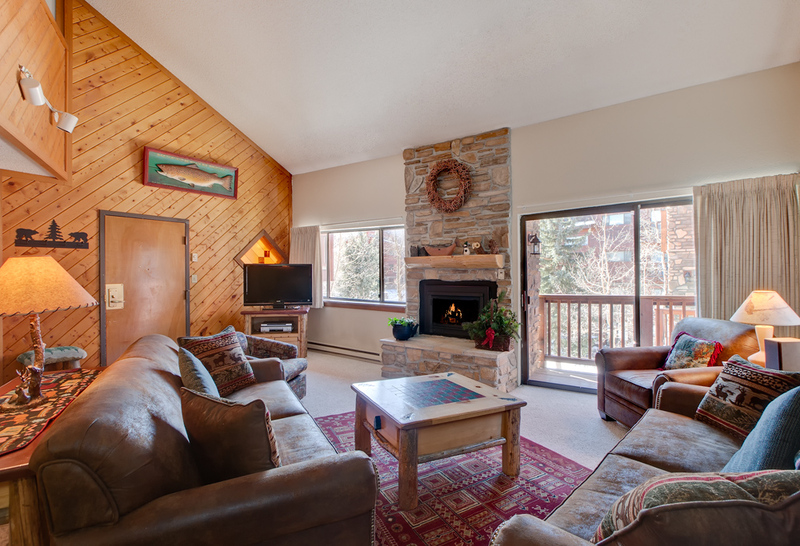 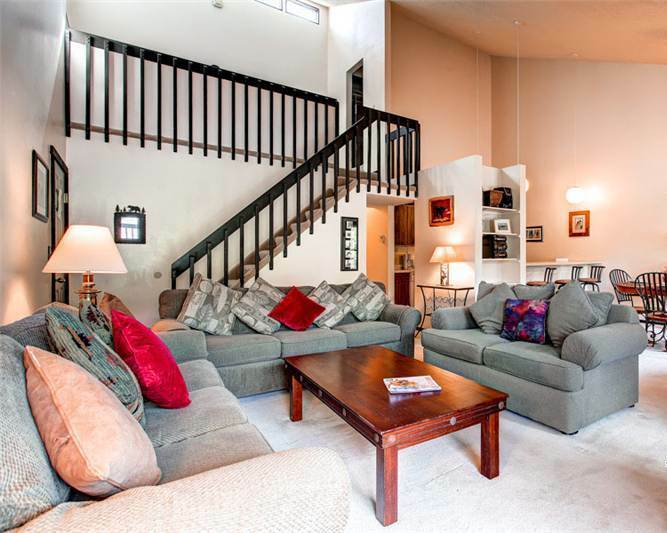 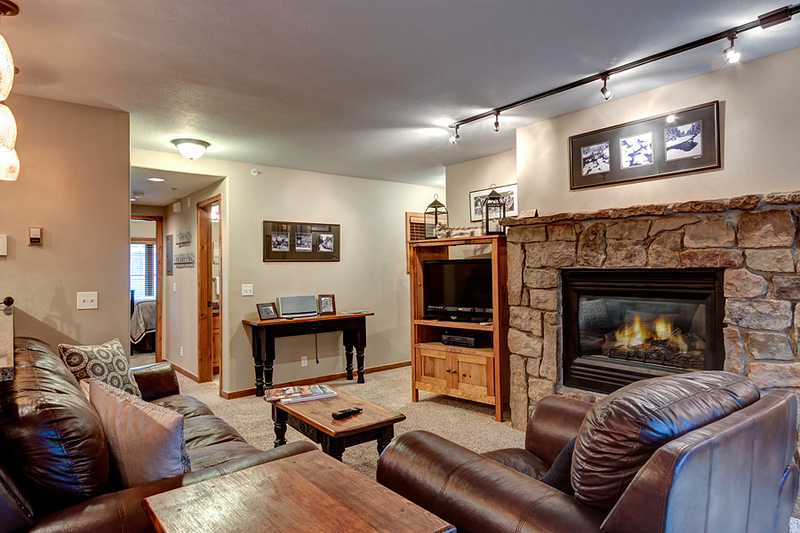 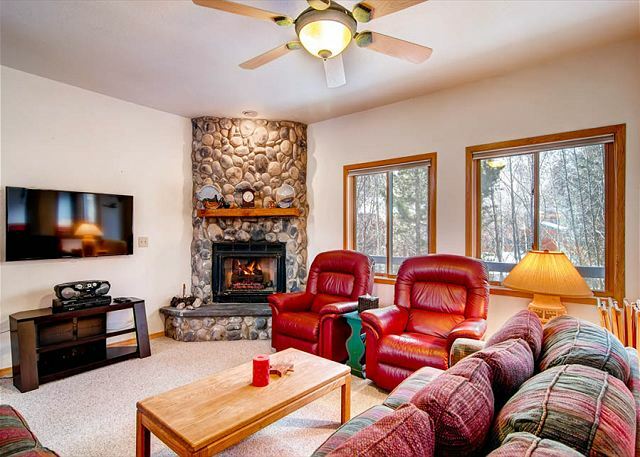 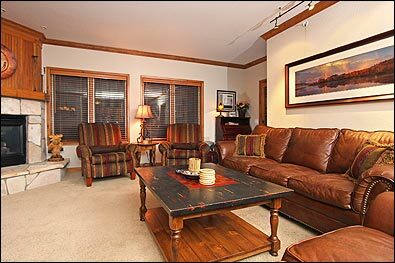 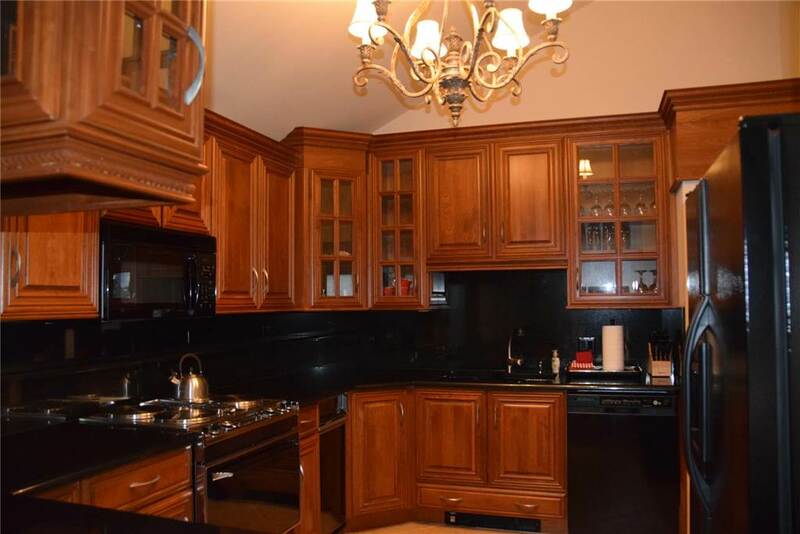 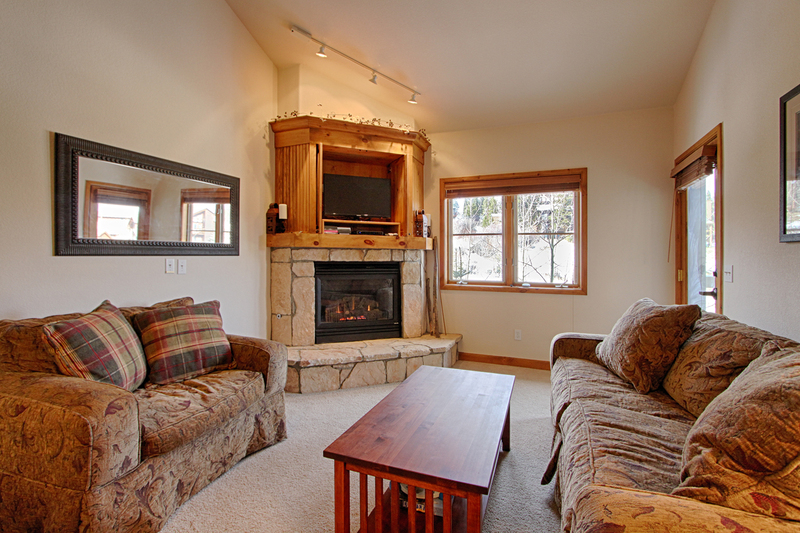 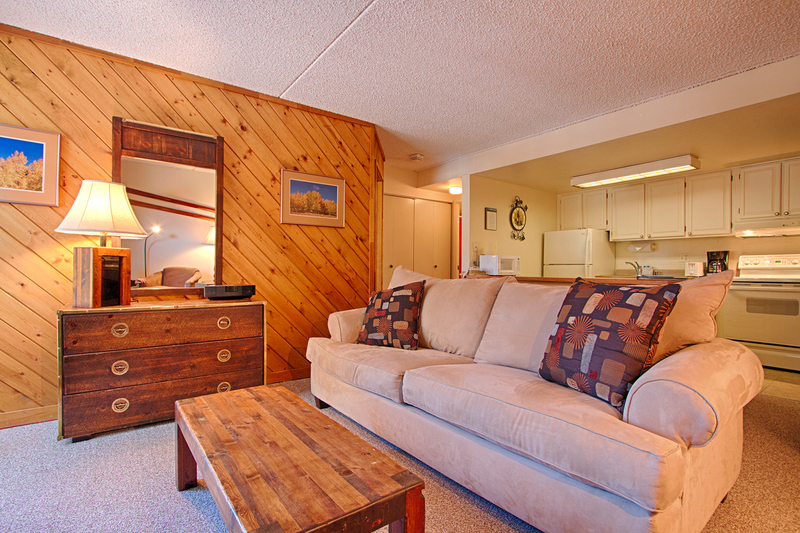 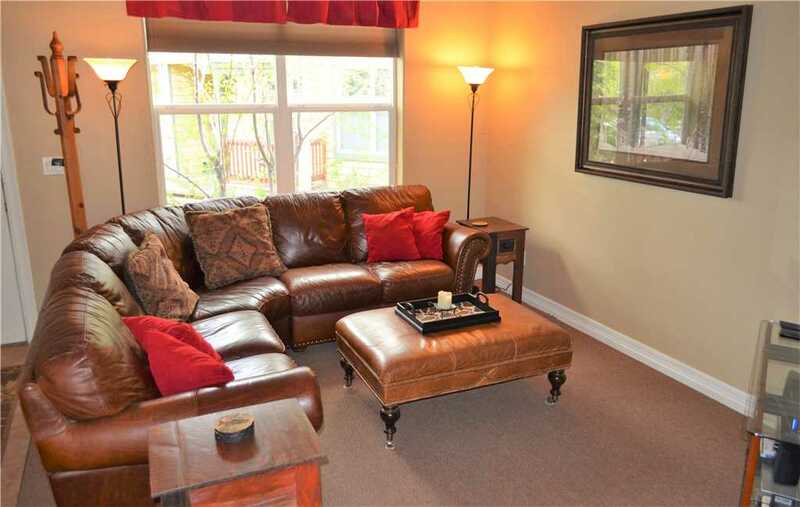 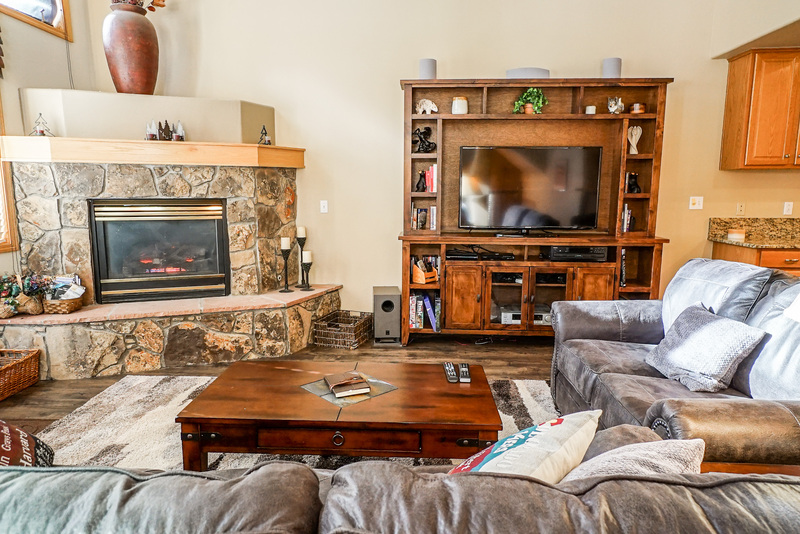 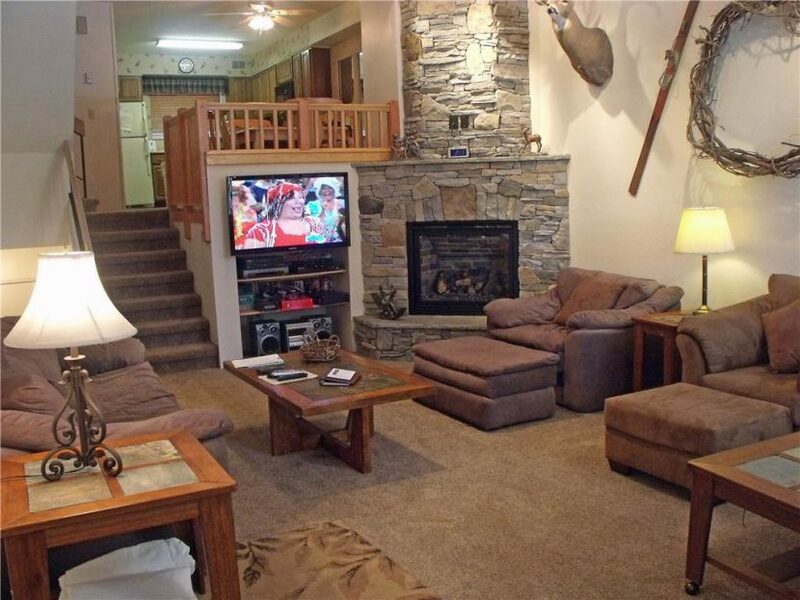 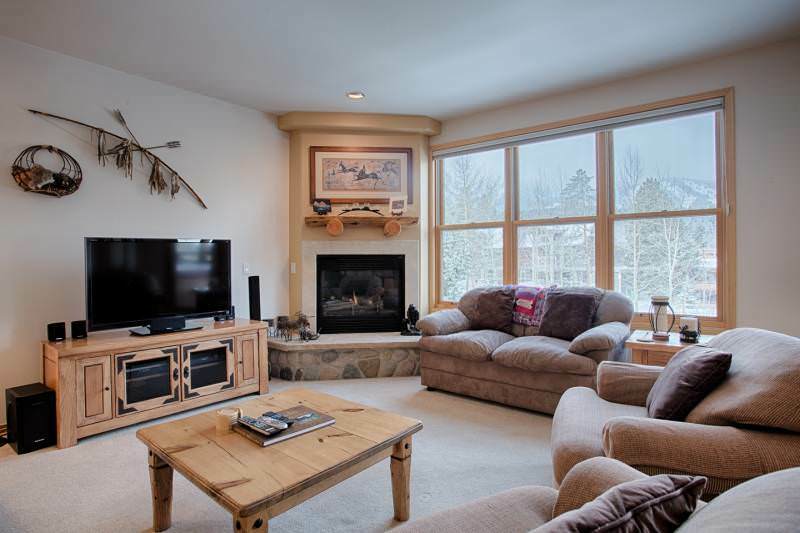 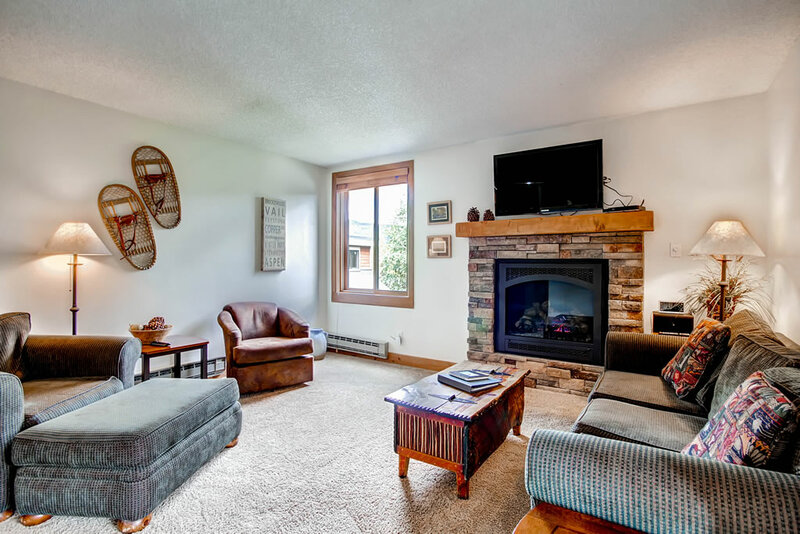 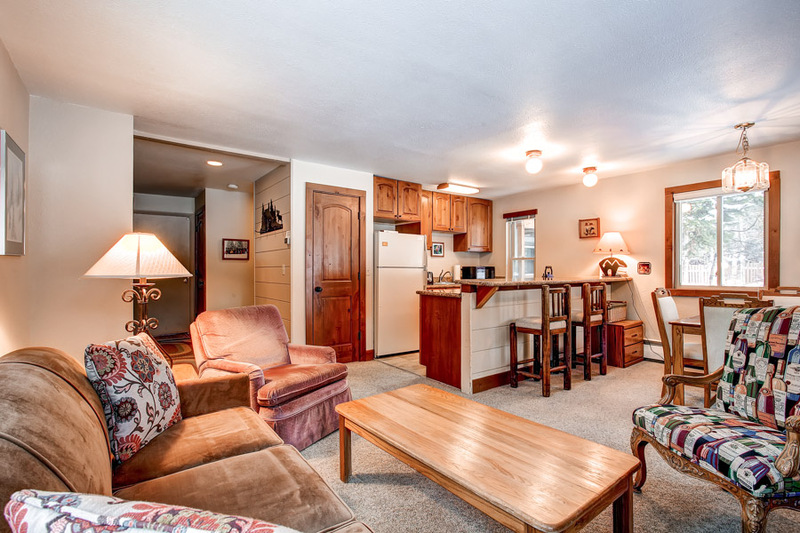 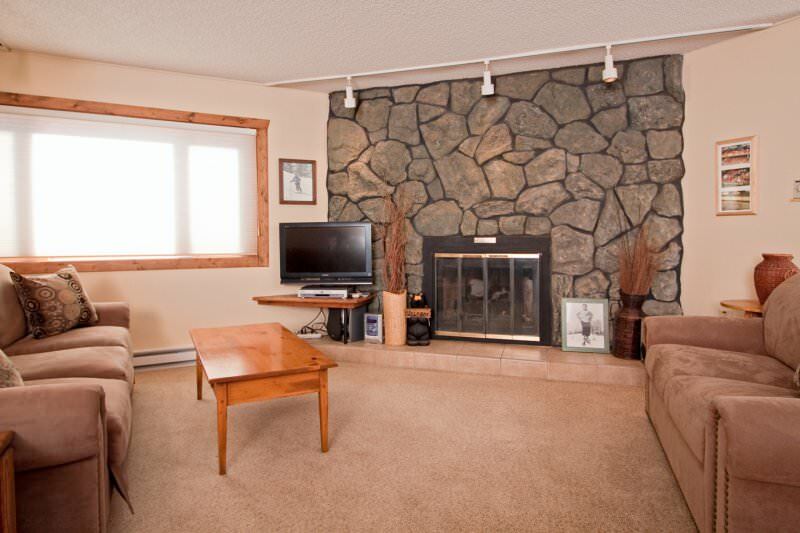 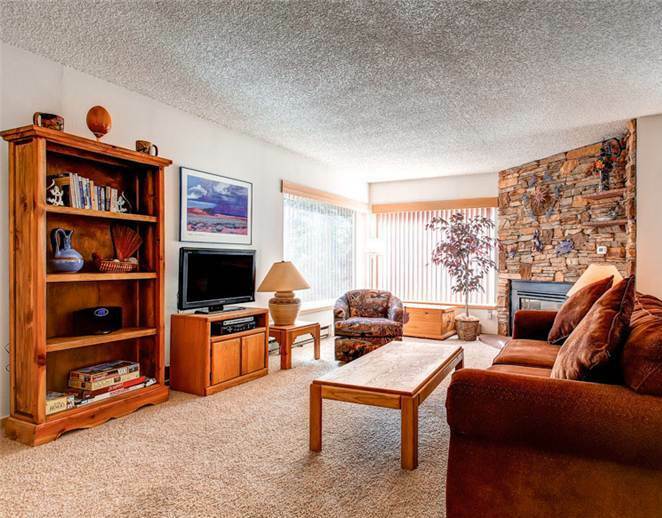 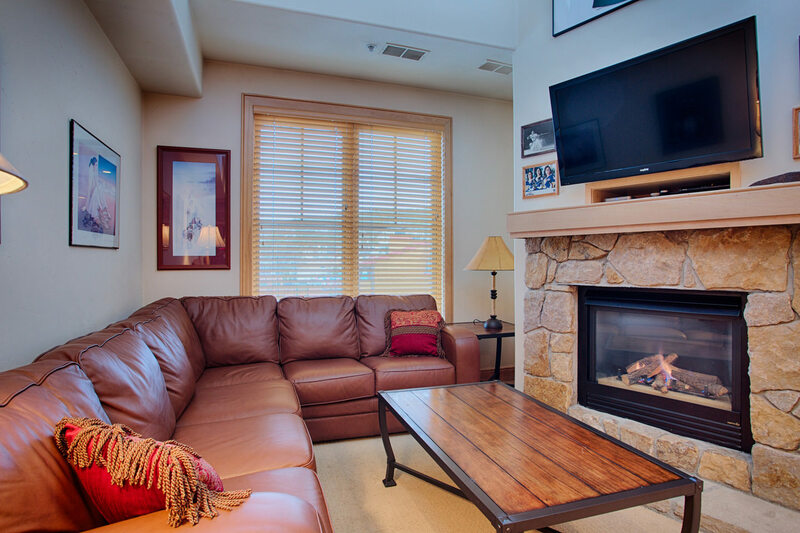 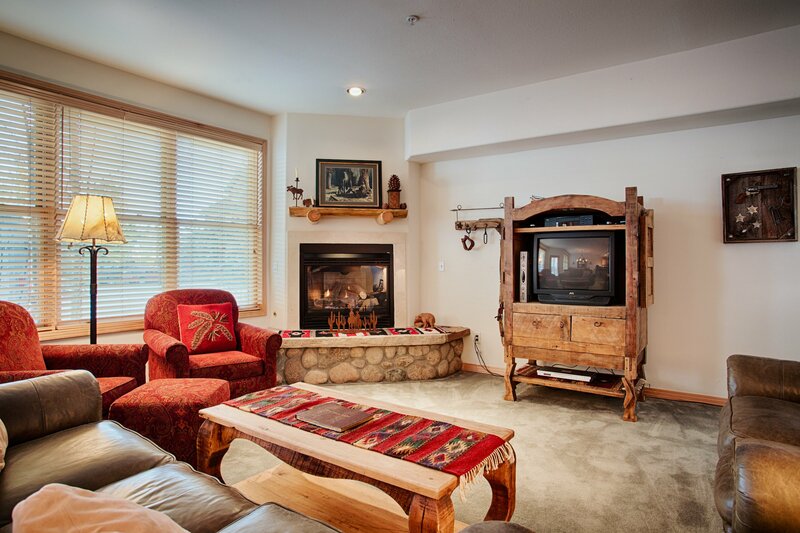 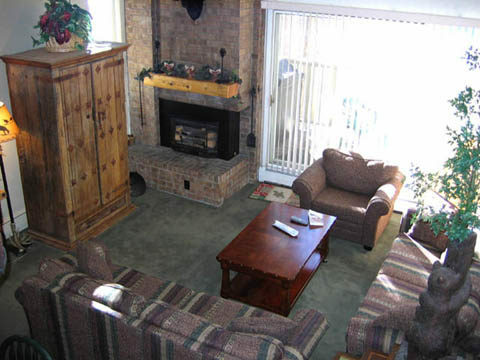 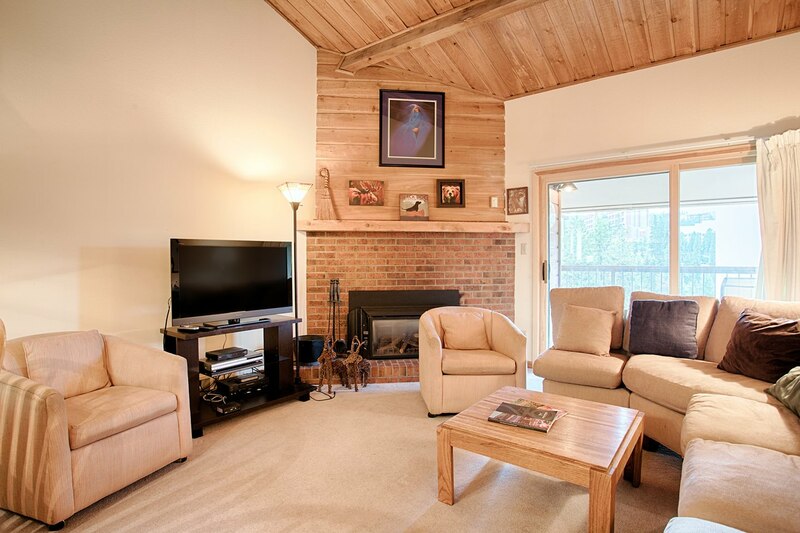 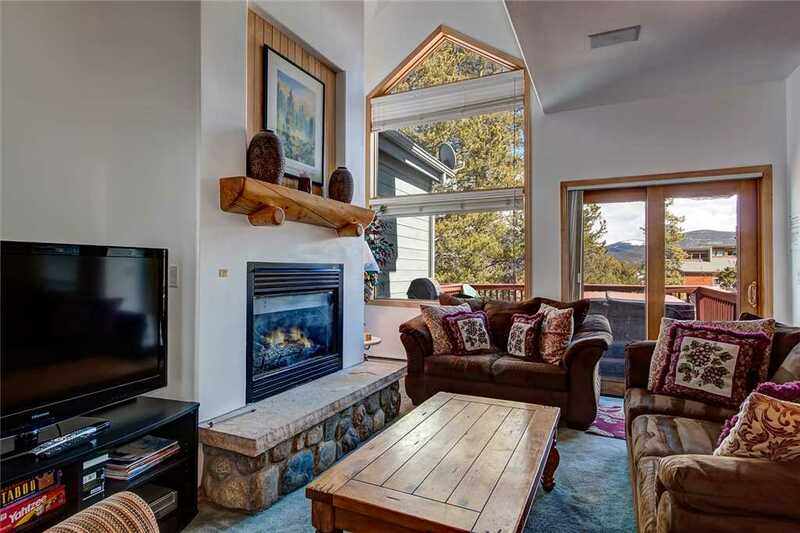 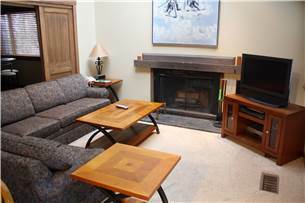 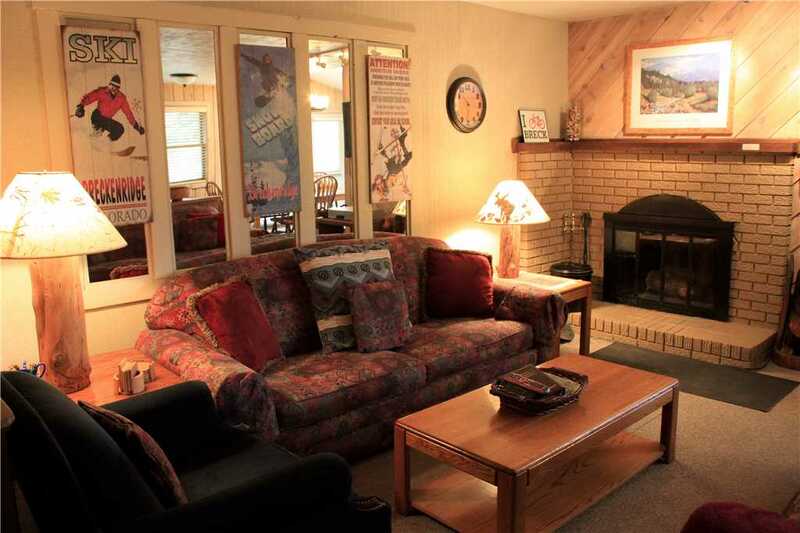 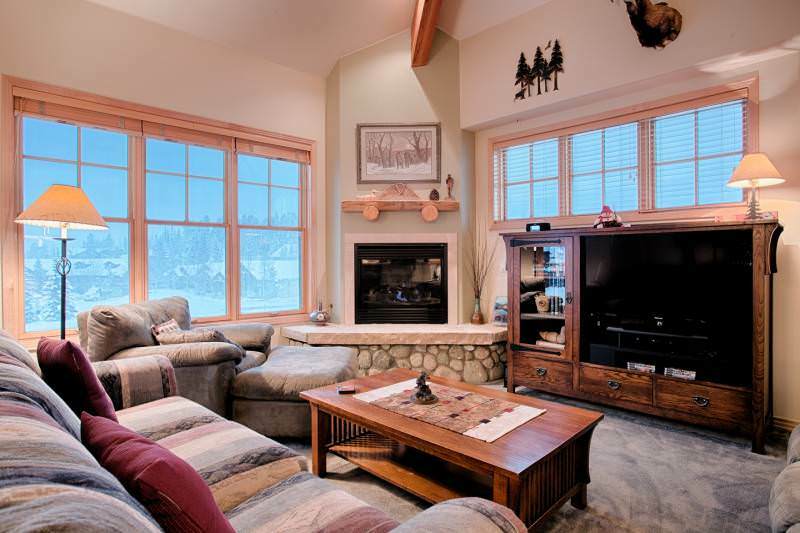 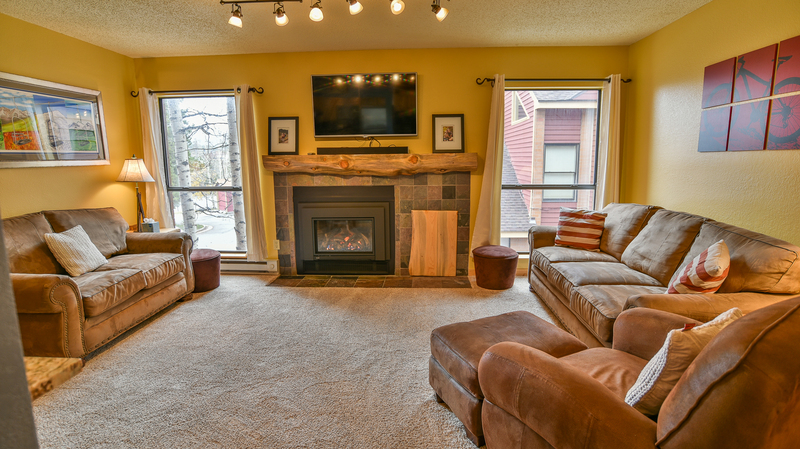 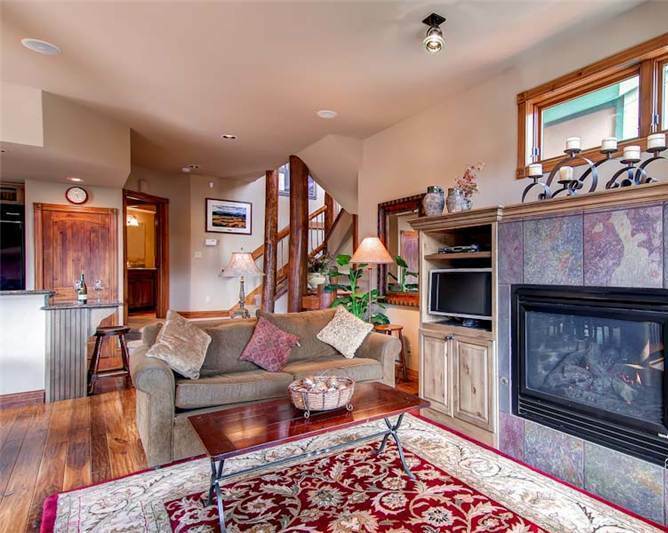 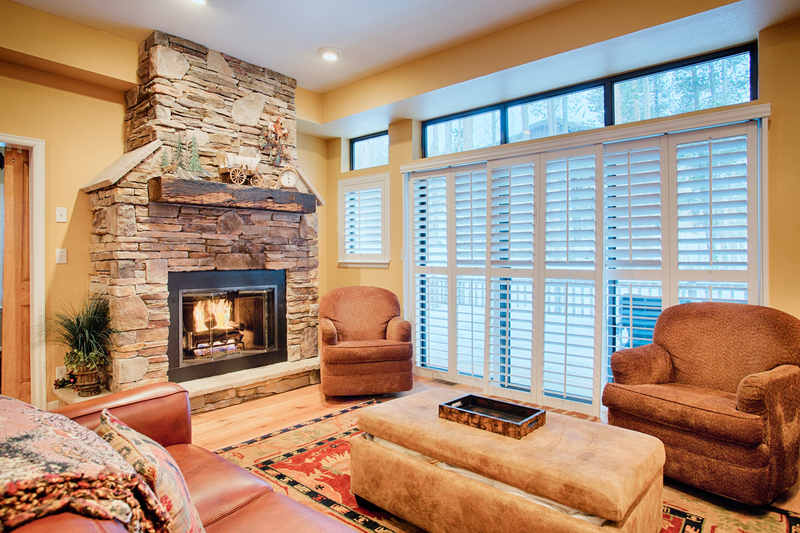 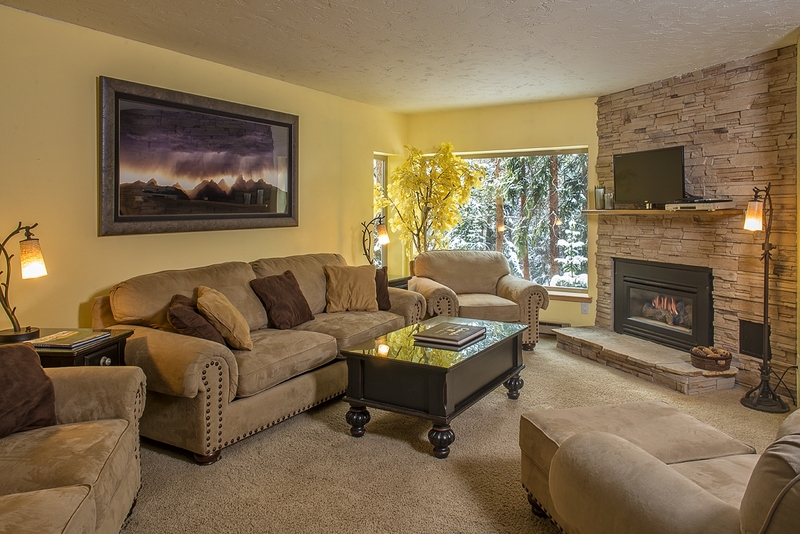 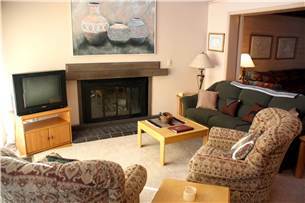 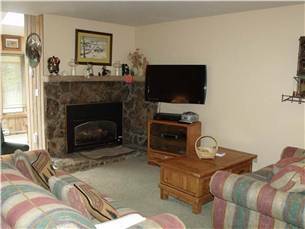 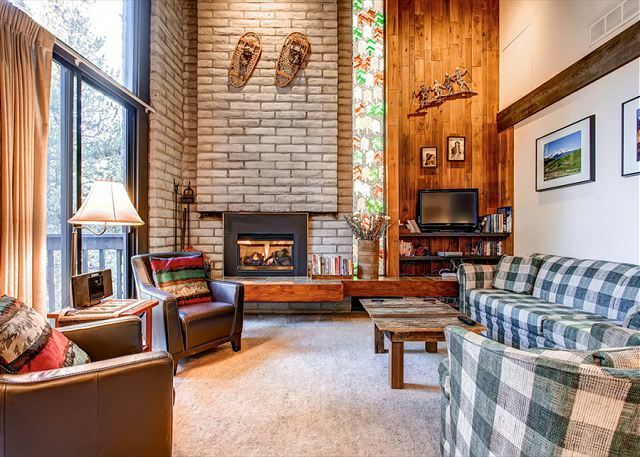 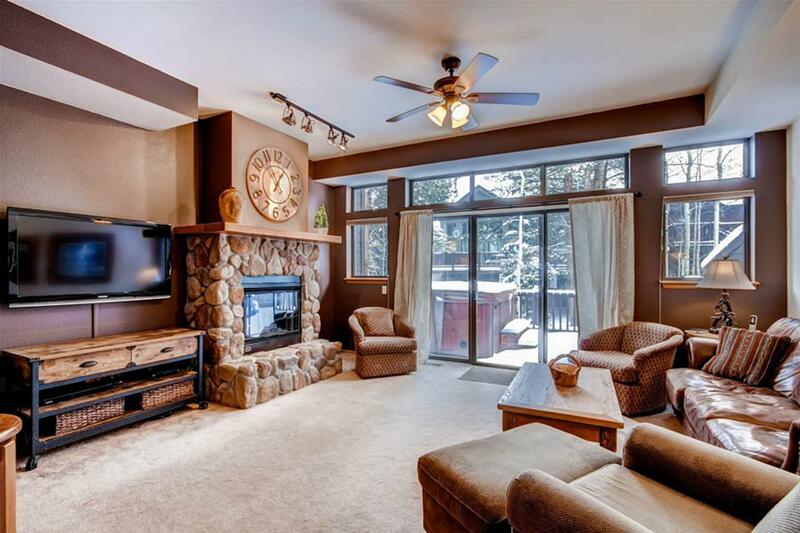 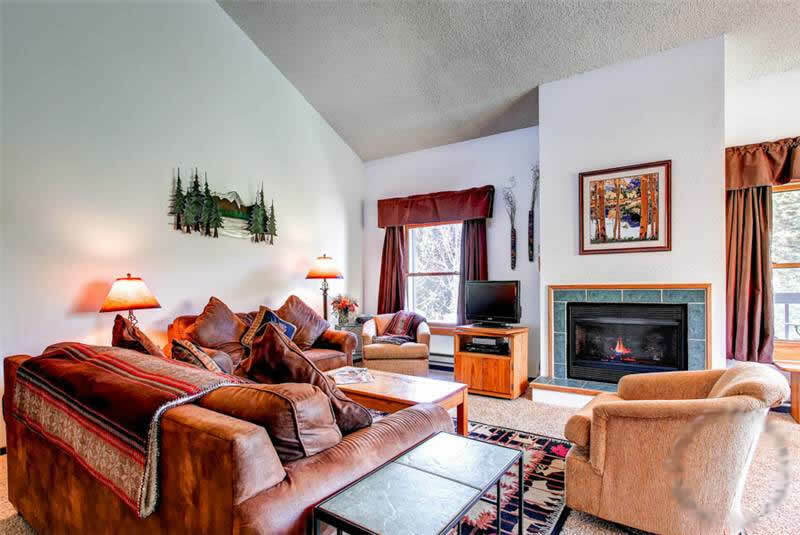 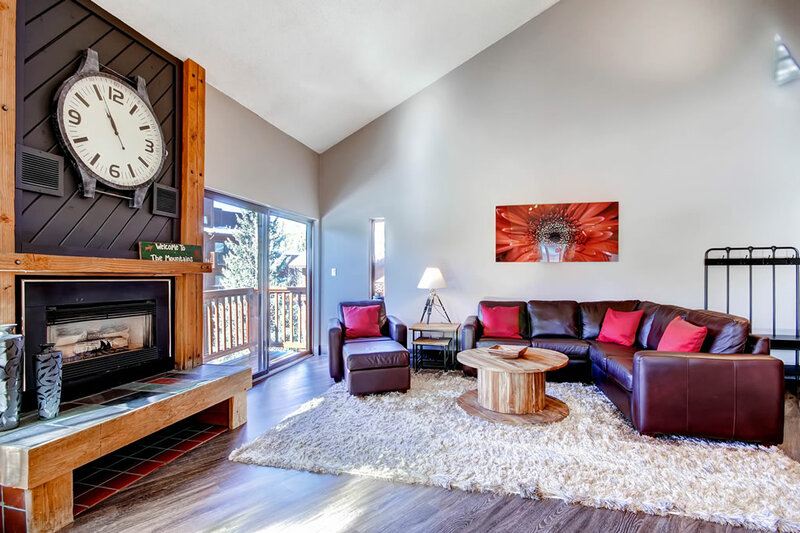 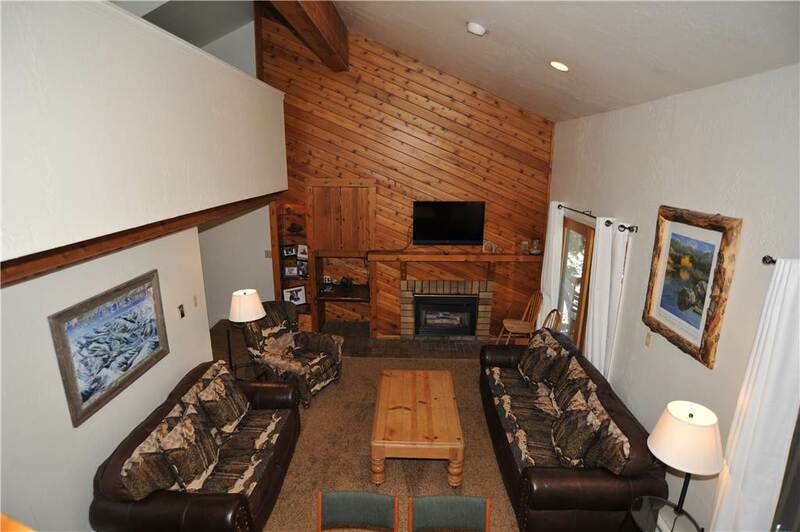 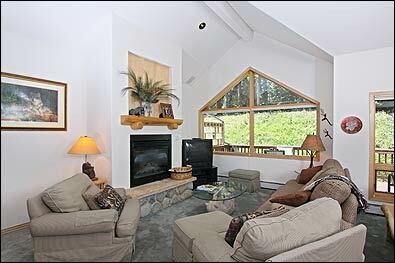 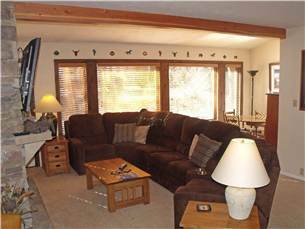 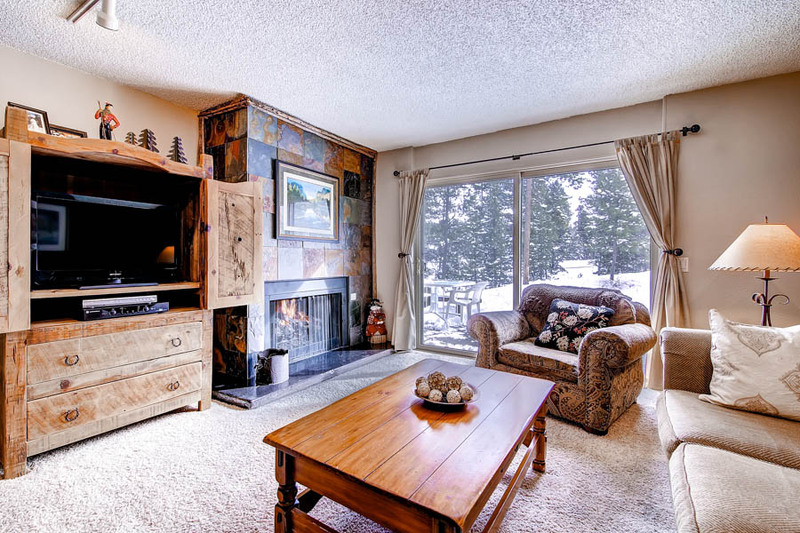 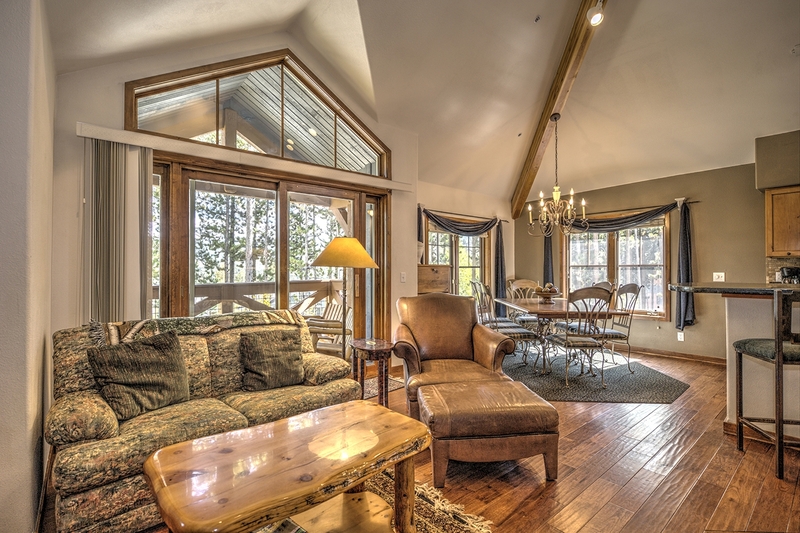 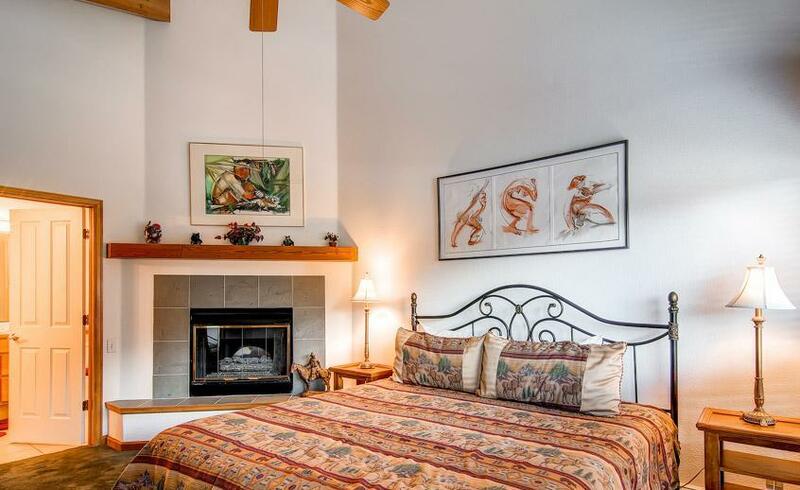 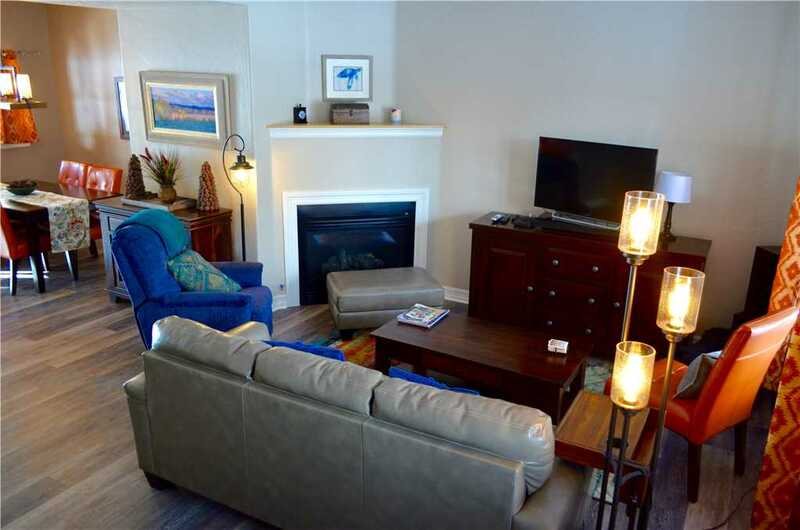 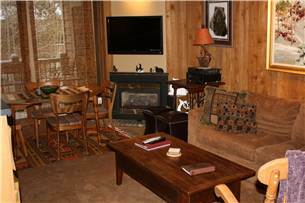 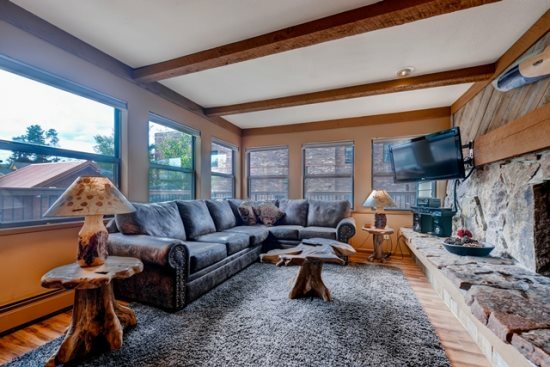 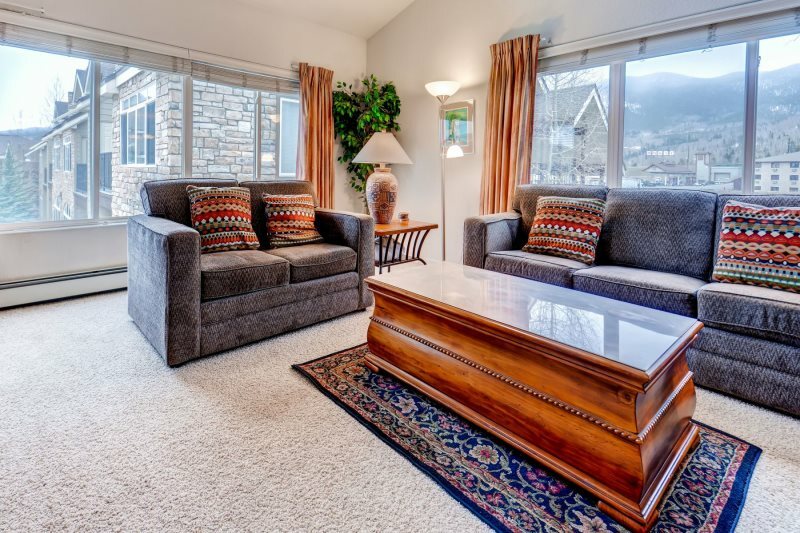 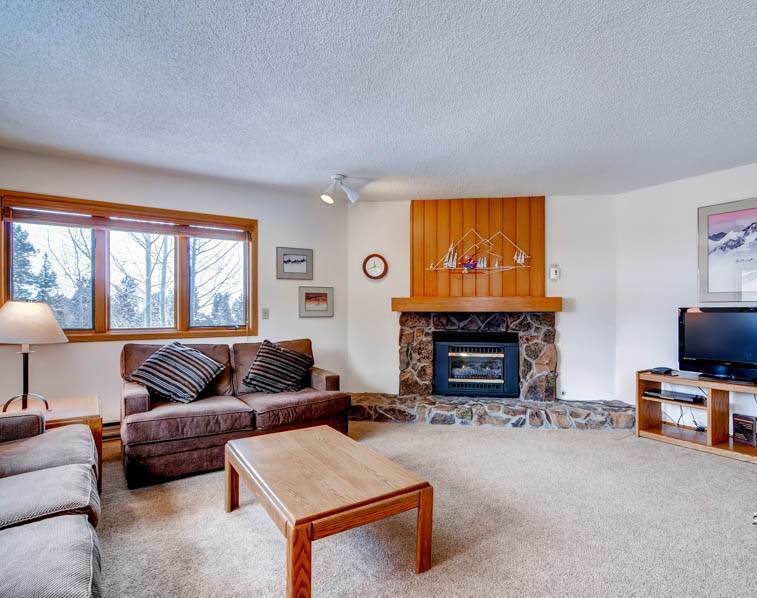 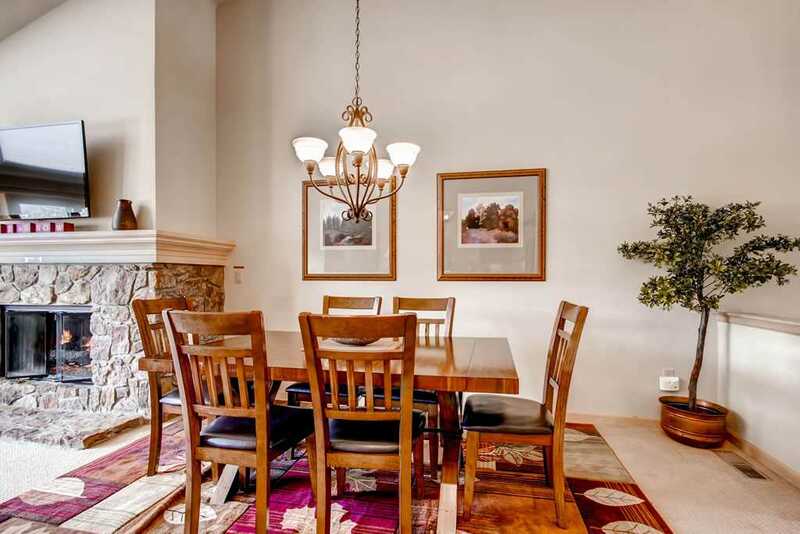 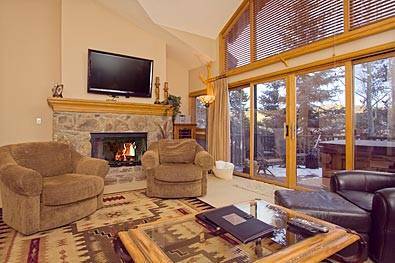 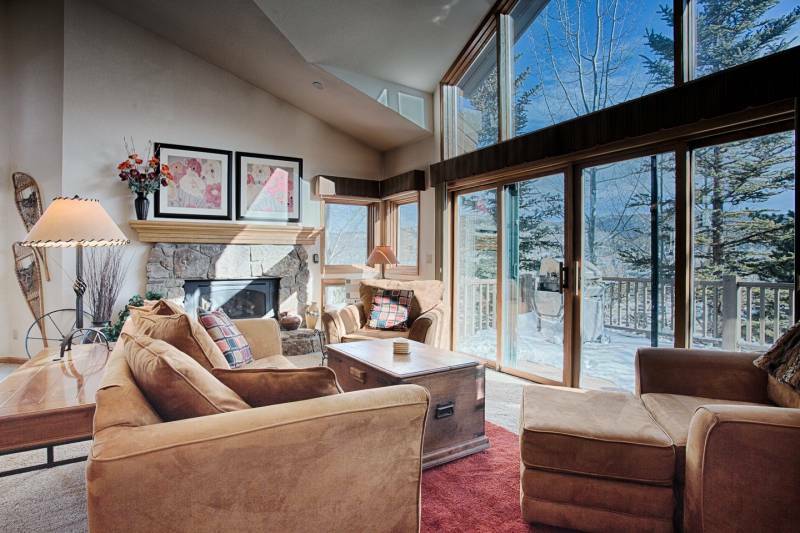 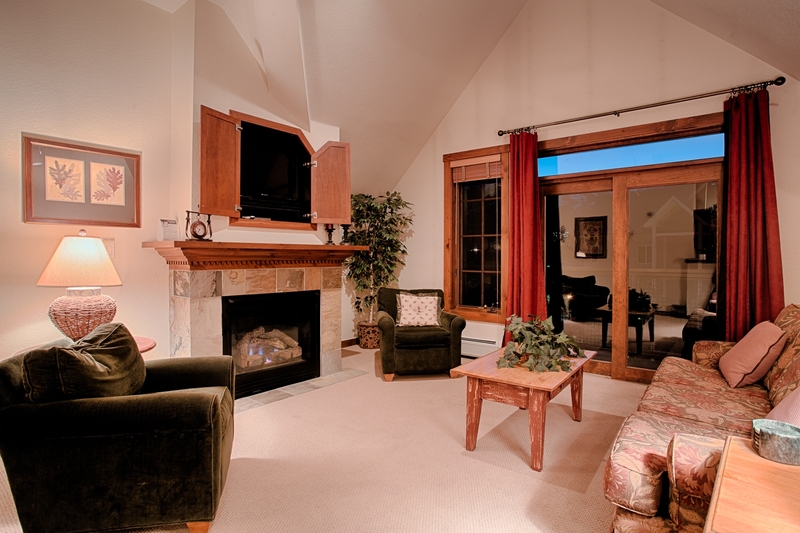 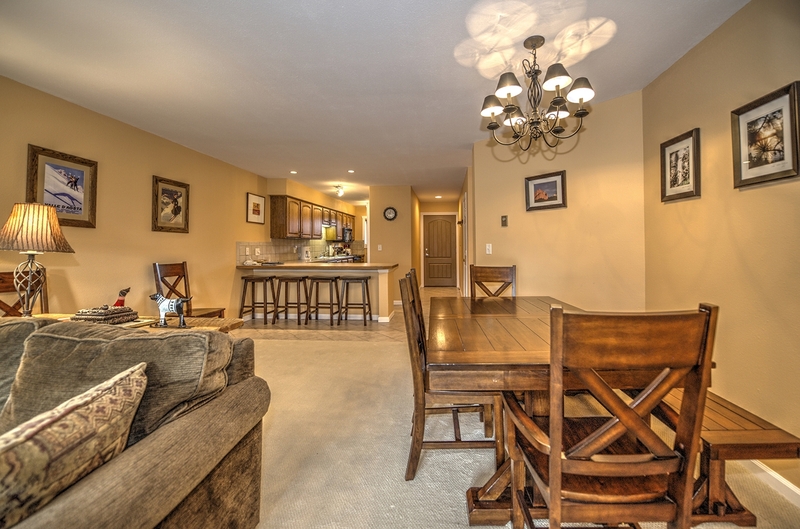 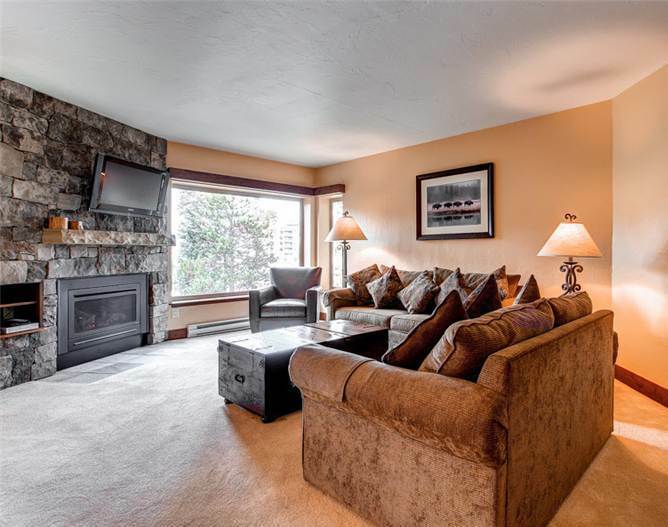 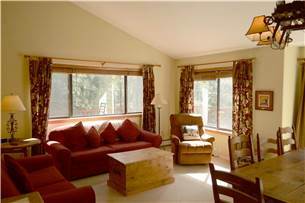 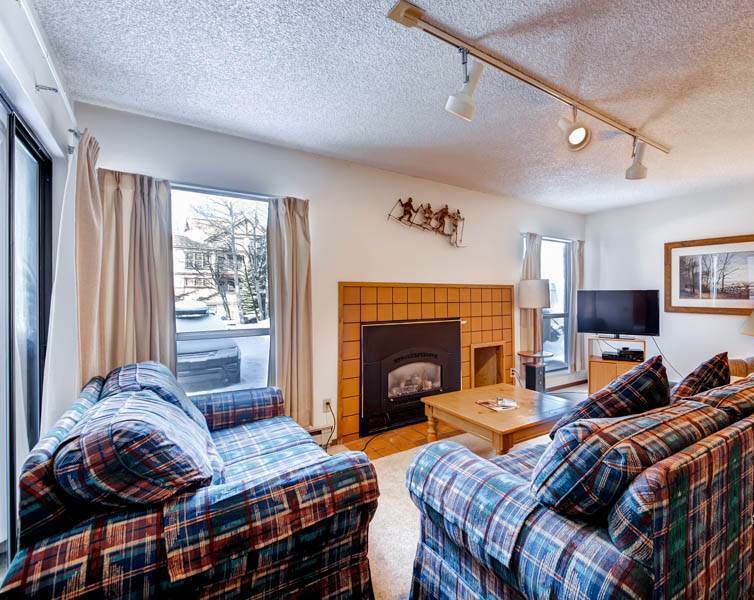 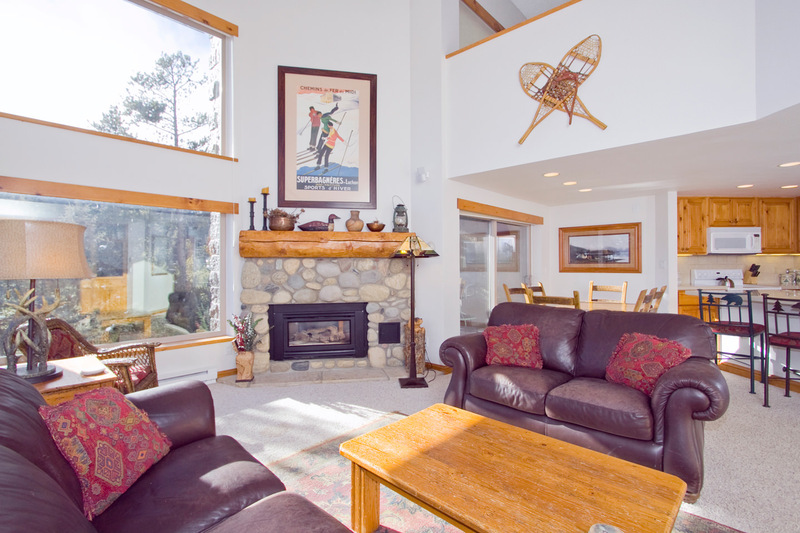 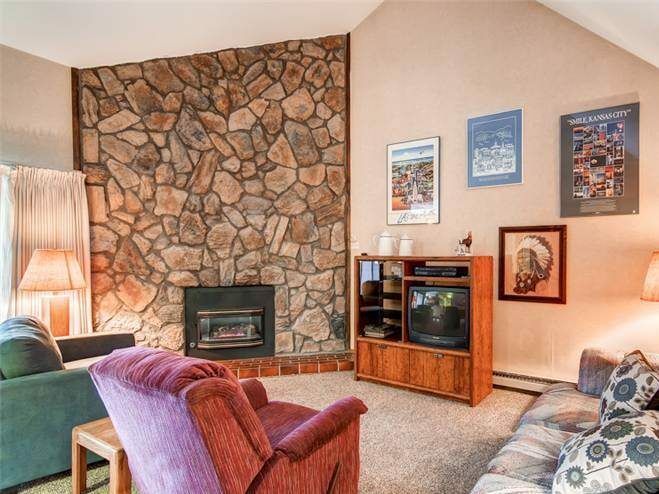 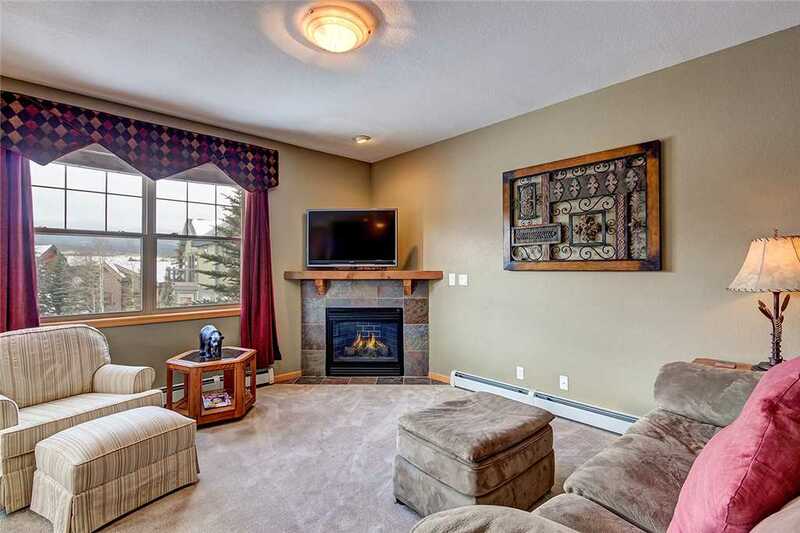 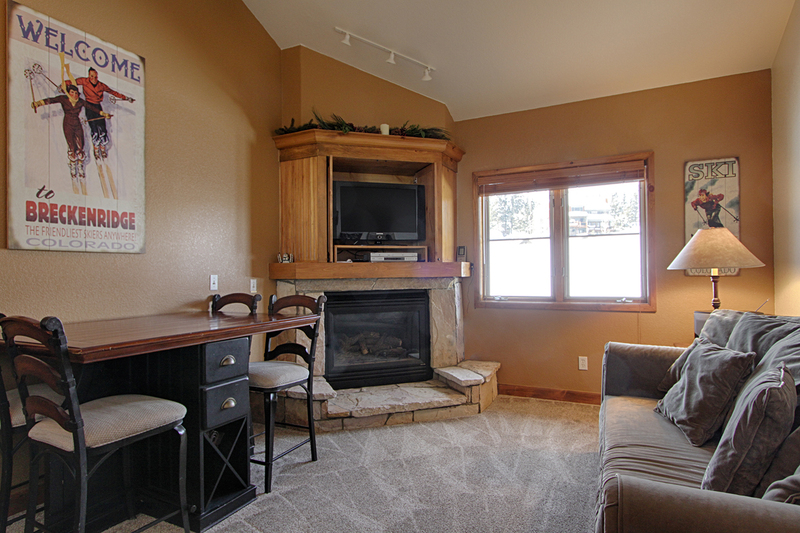 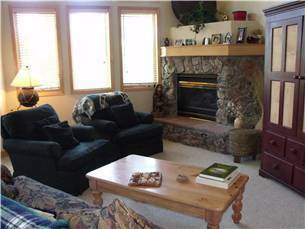 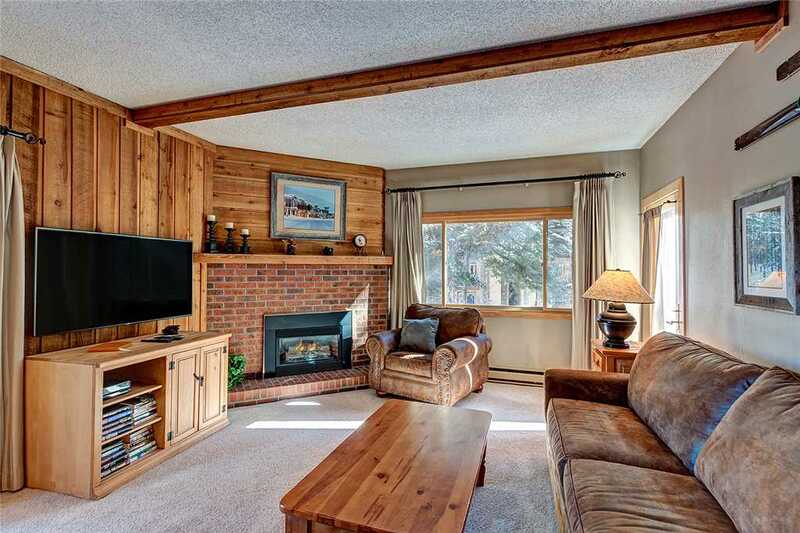 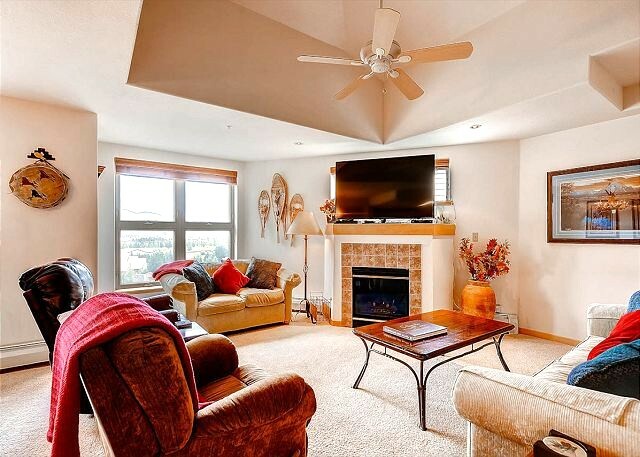 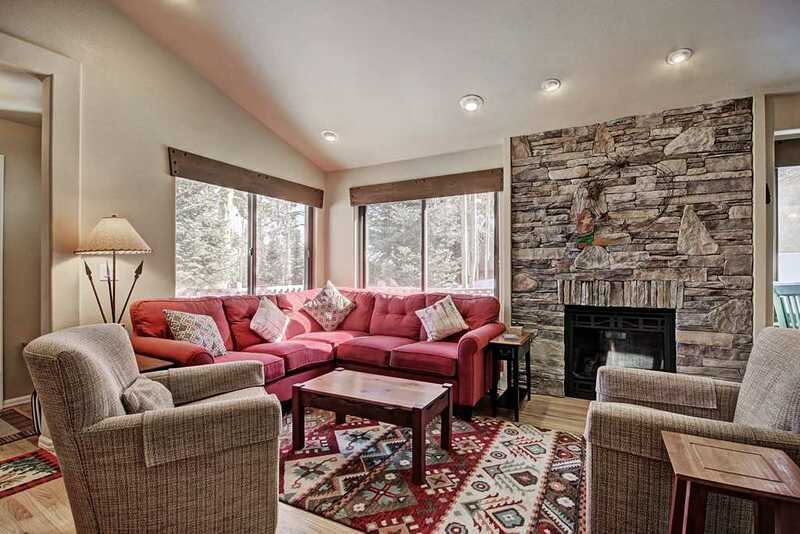 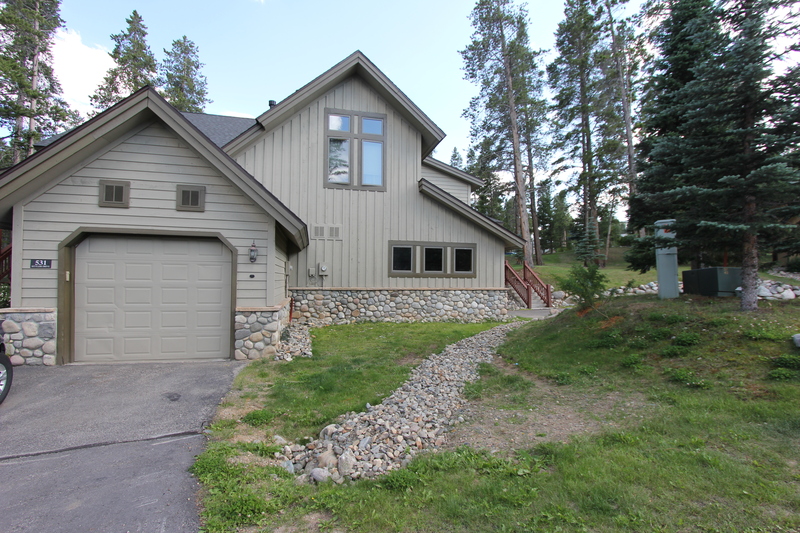 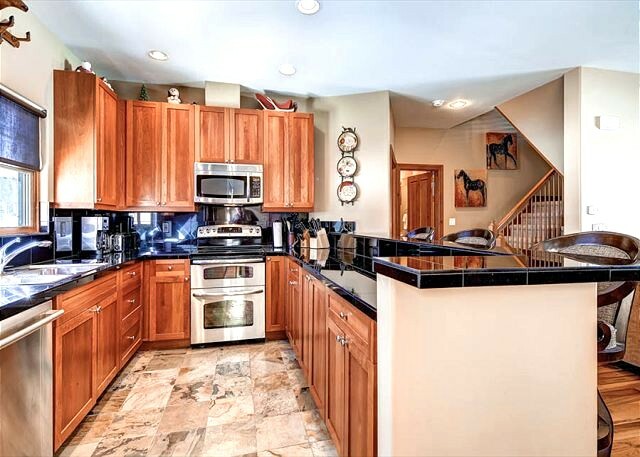 It boasts an open, comfortable living room with a beautiful stone gas fireplace and a huge LCD TV above it. 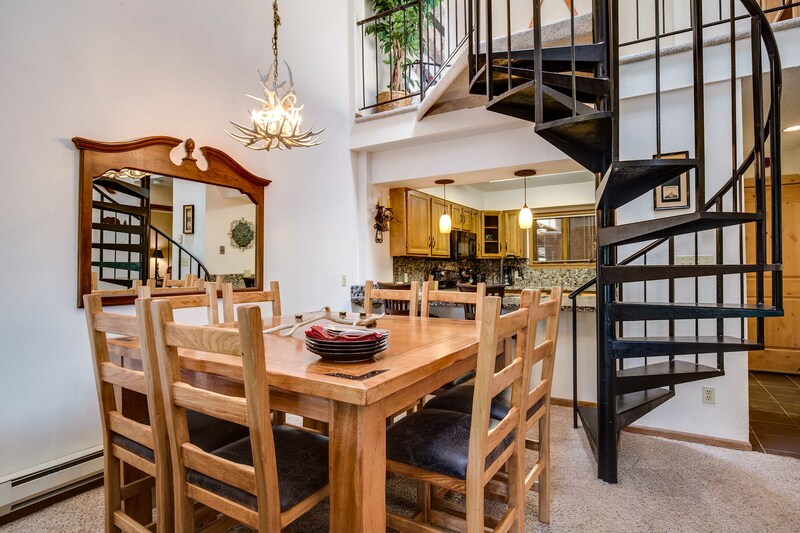 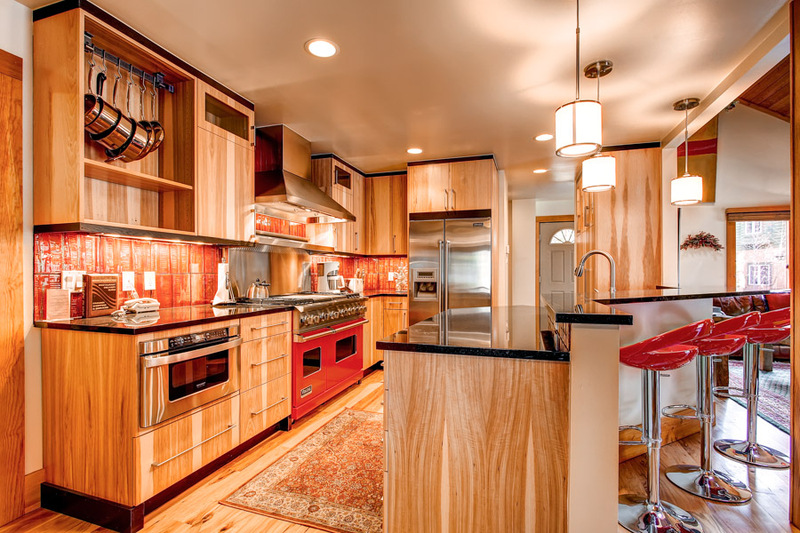 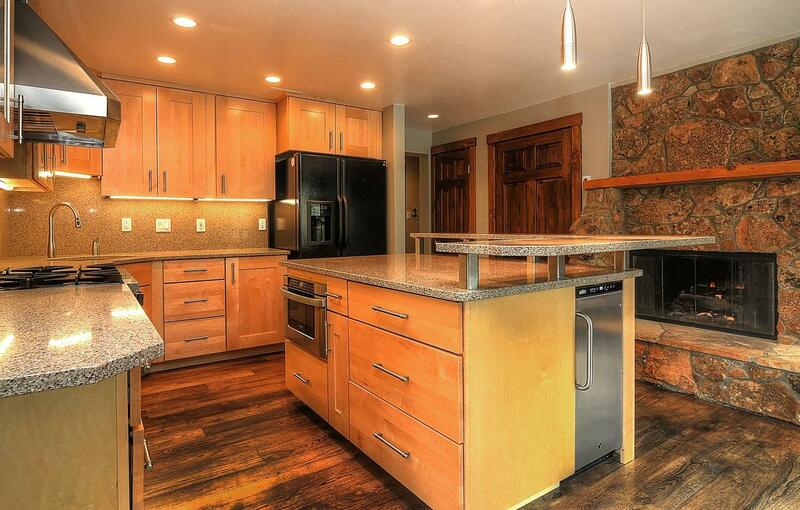 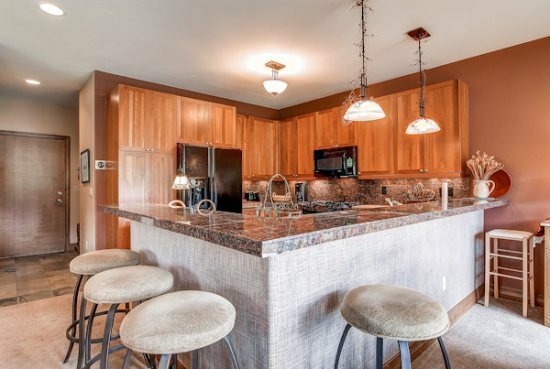 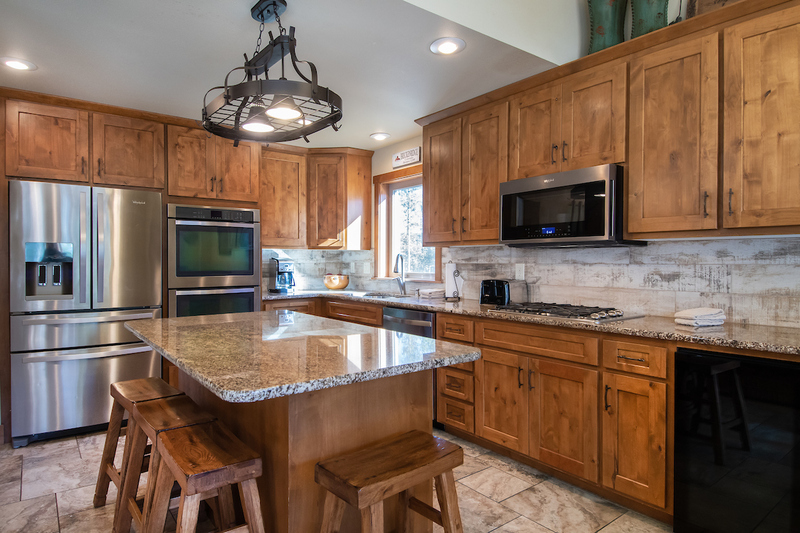 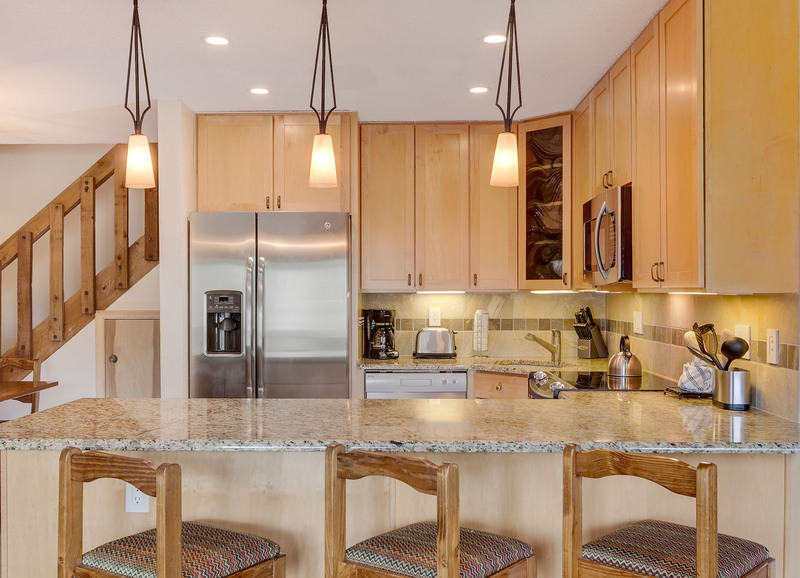 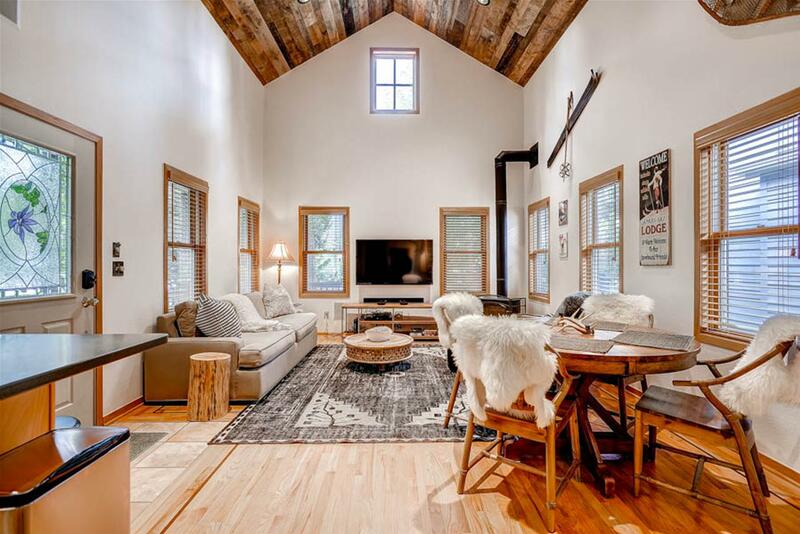 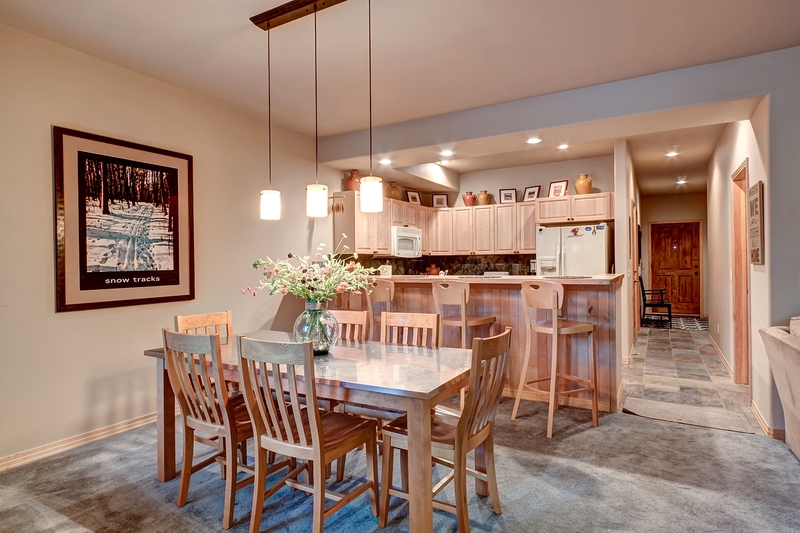 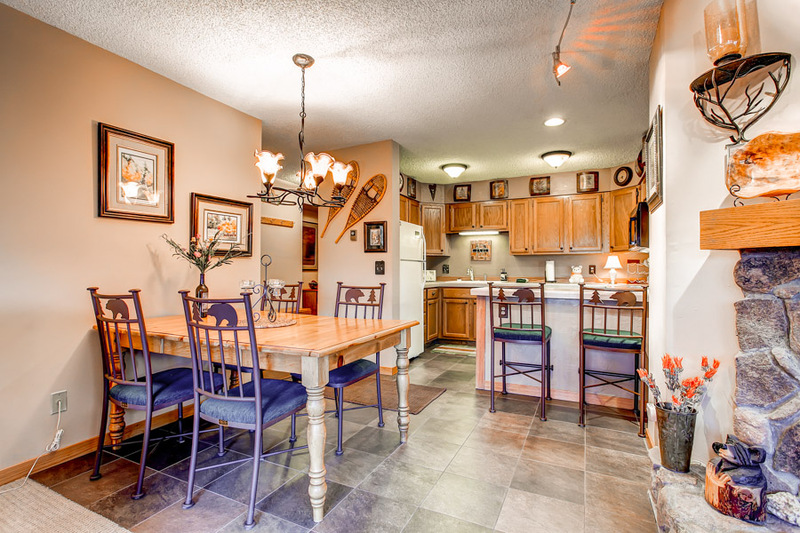 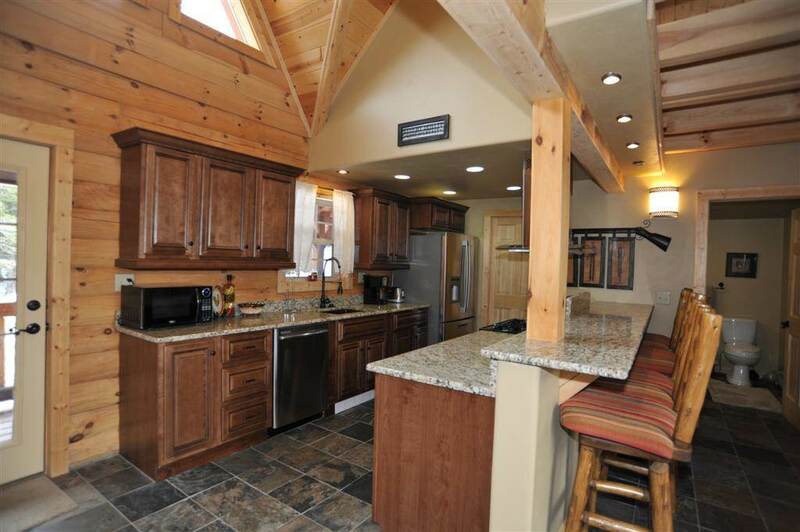 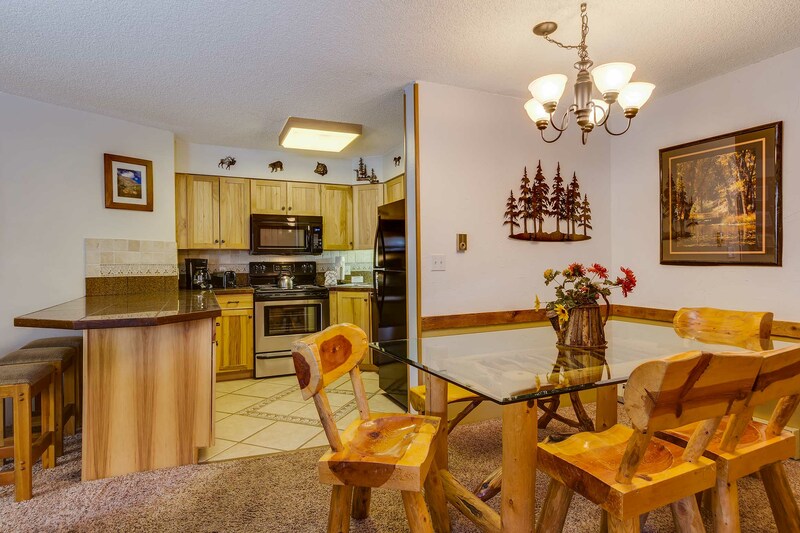 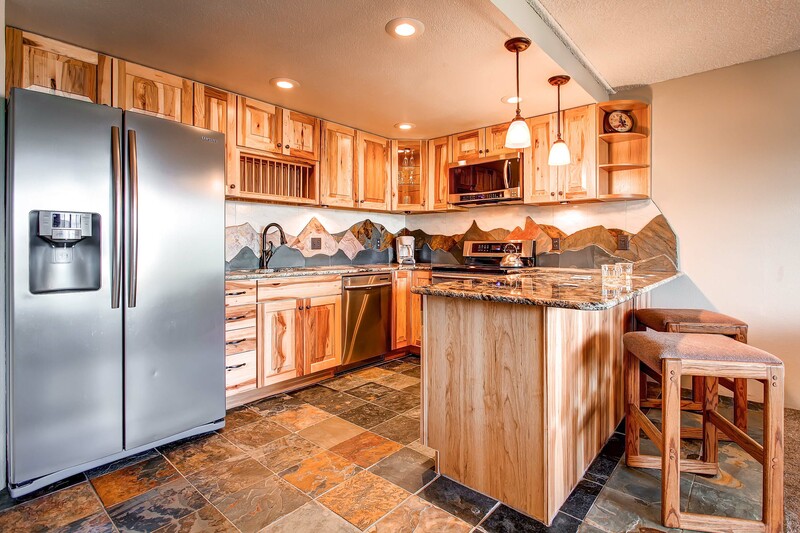 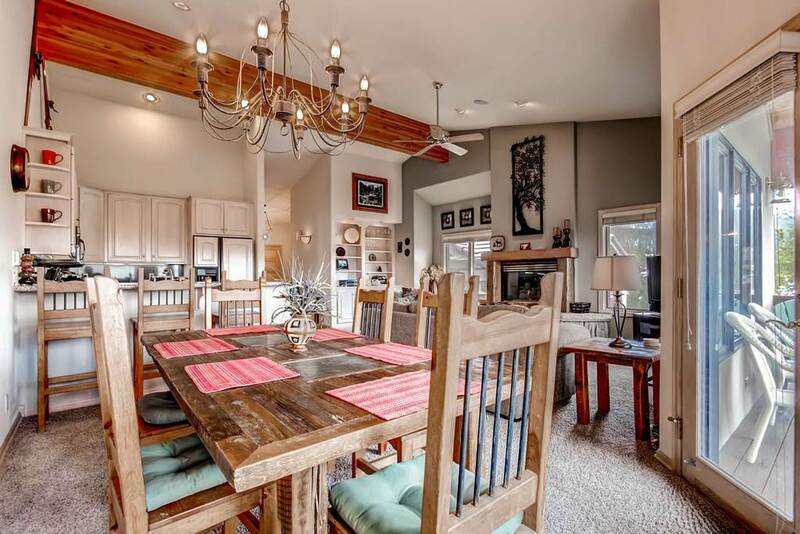 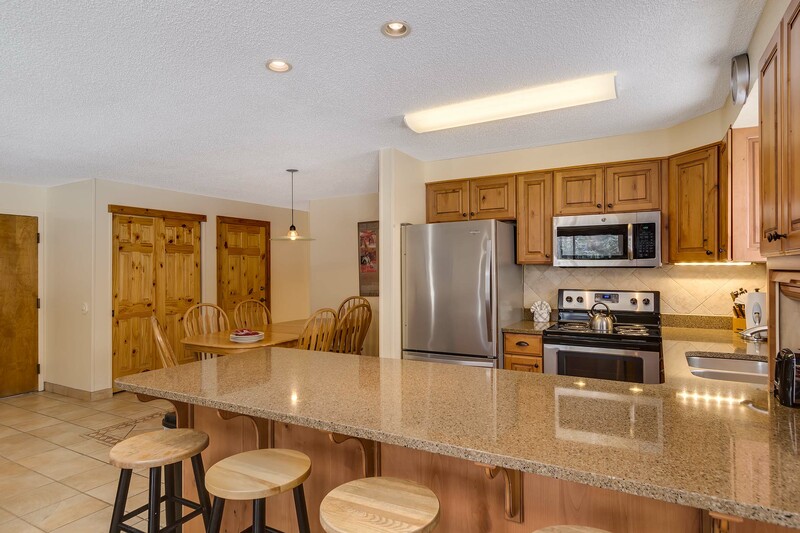 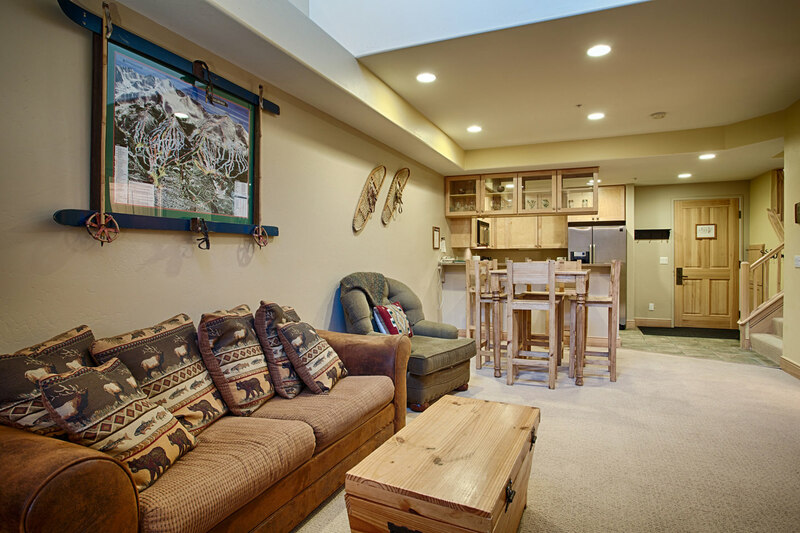 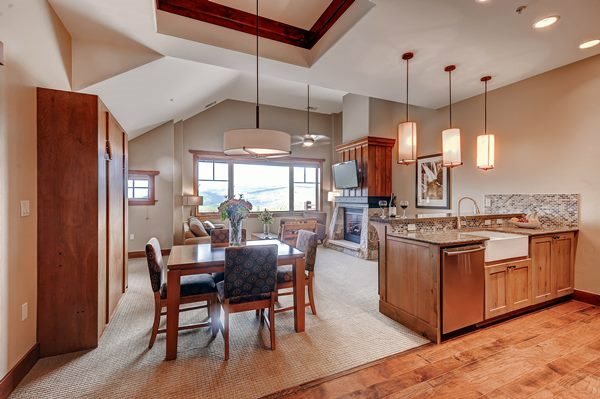 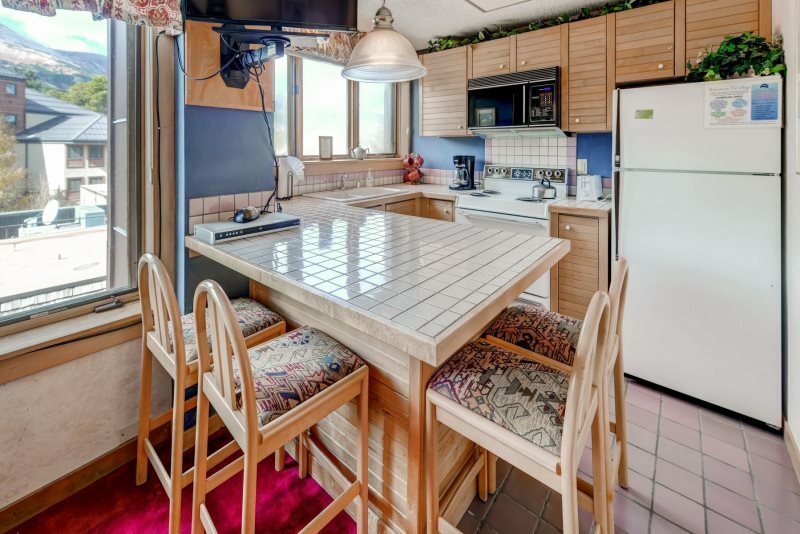 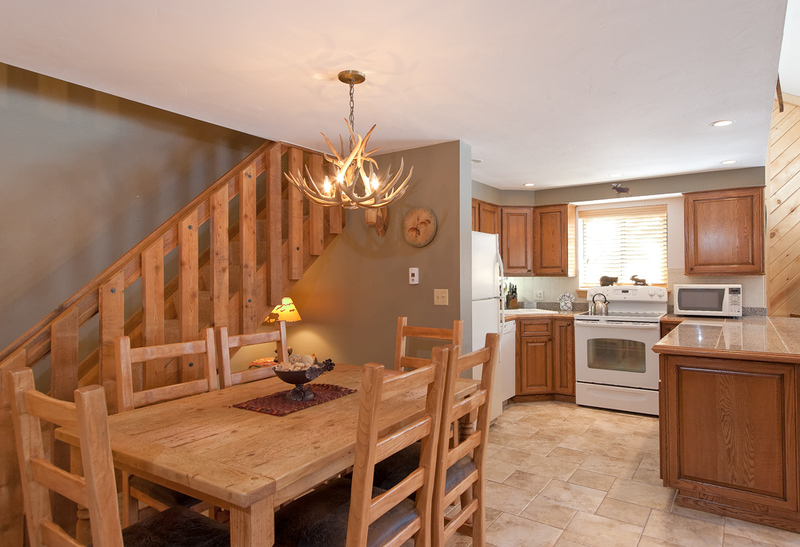 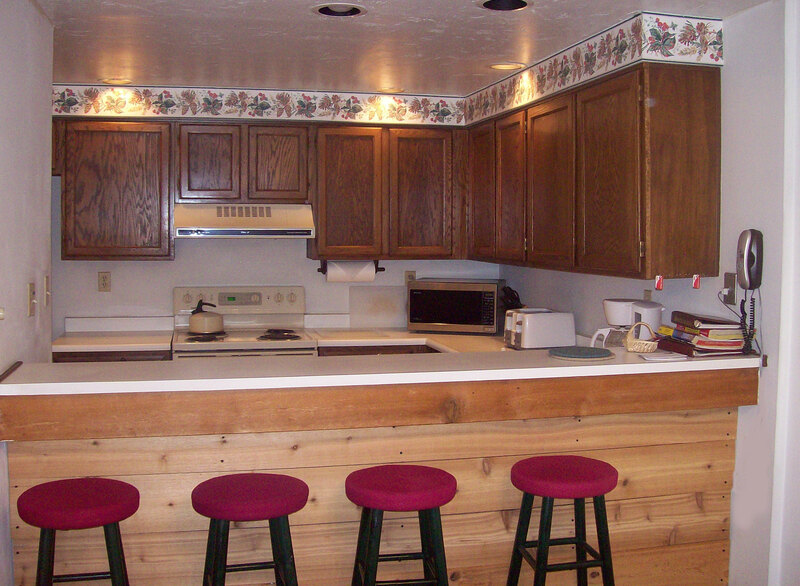 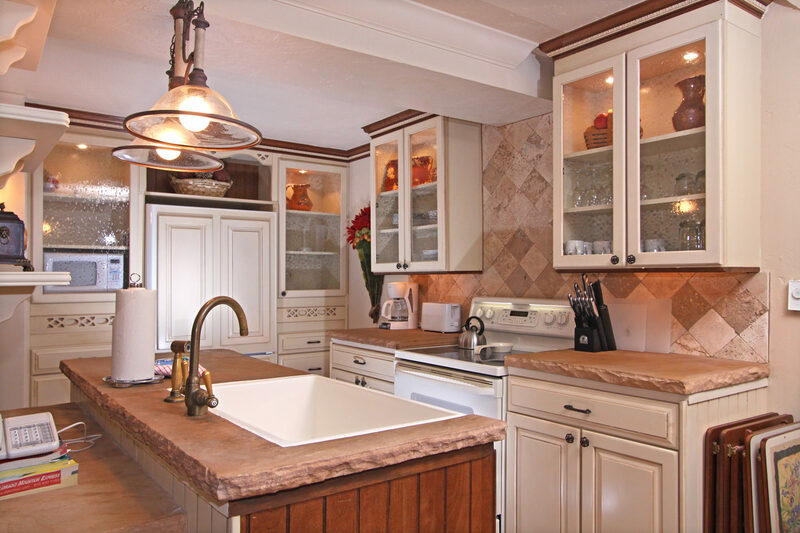 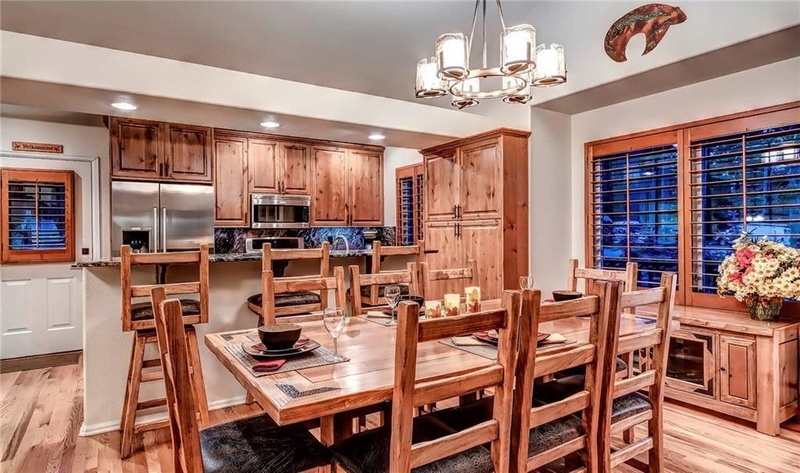 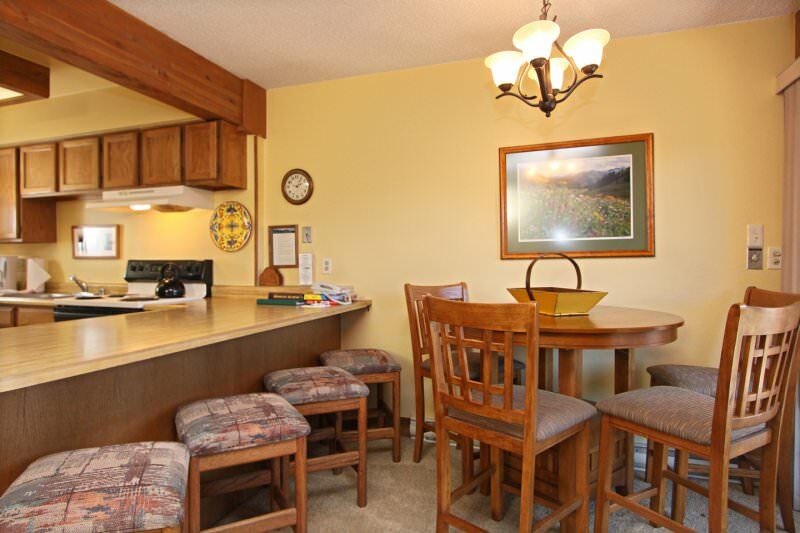 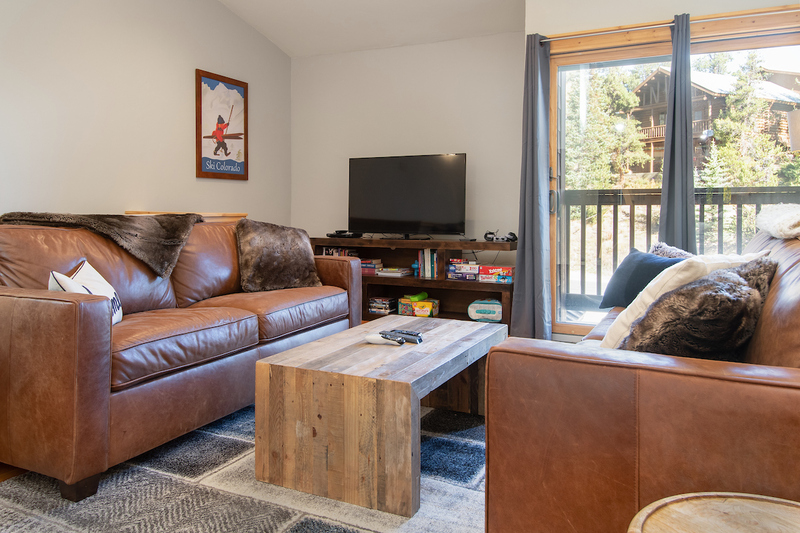 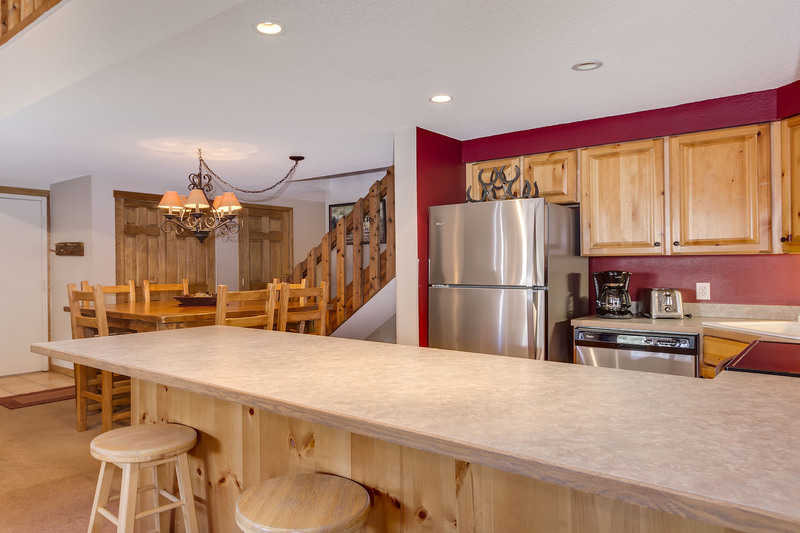 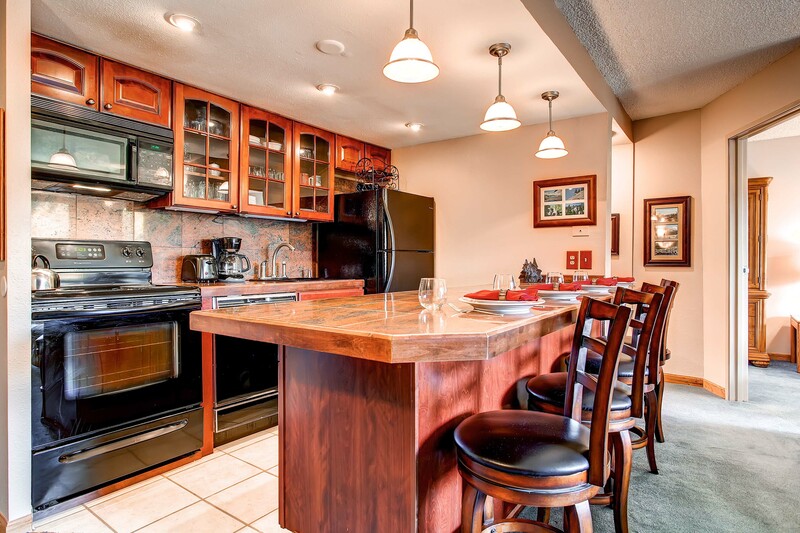 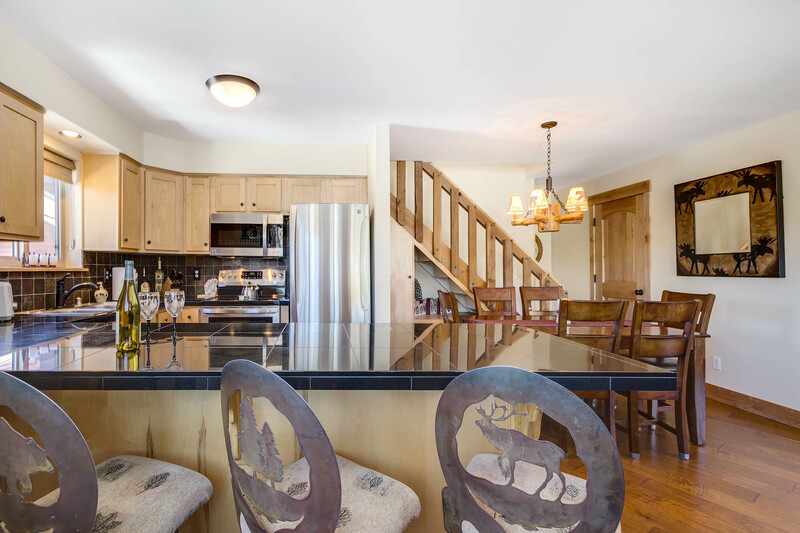 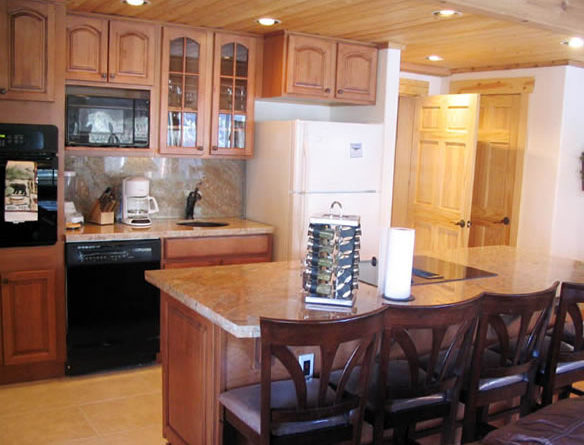 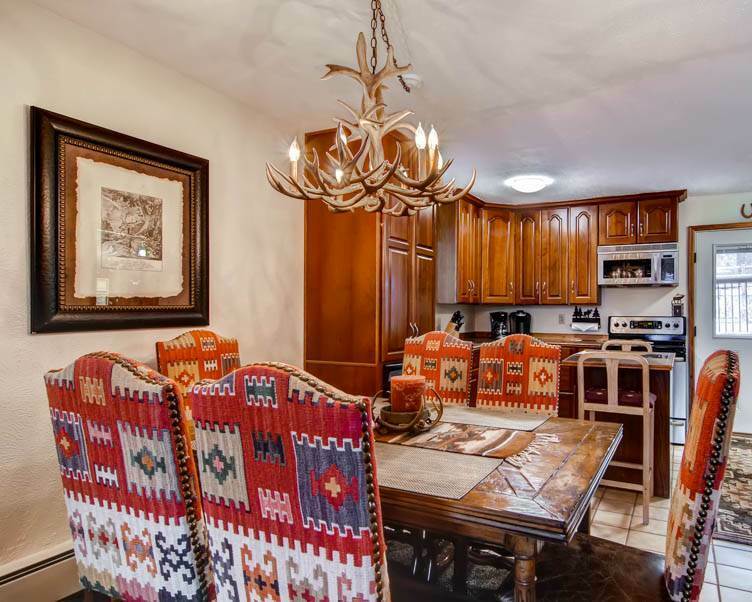 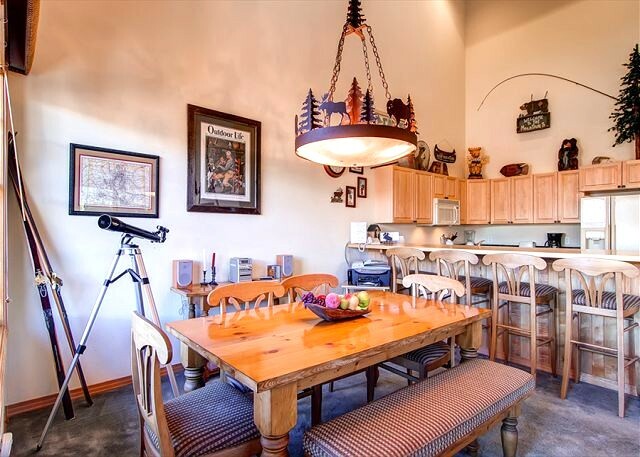 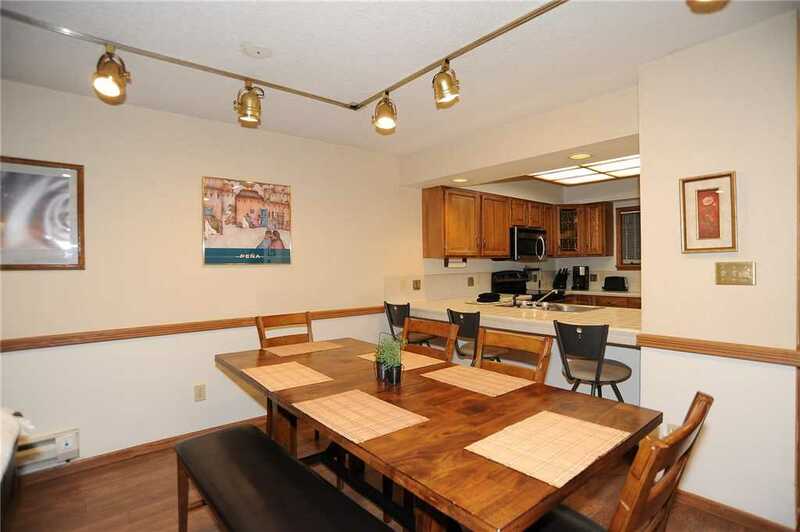 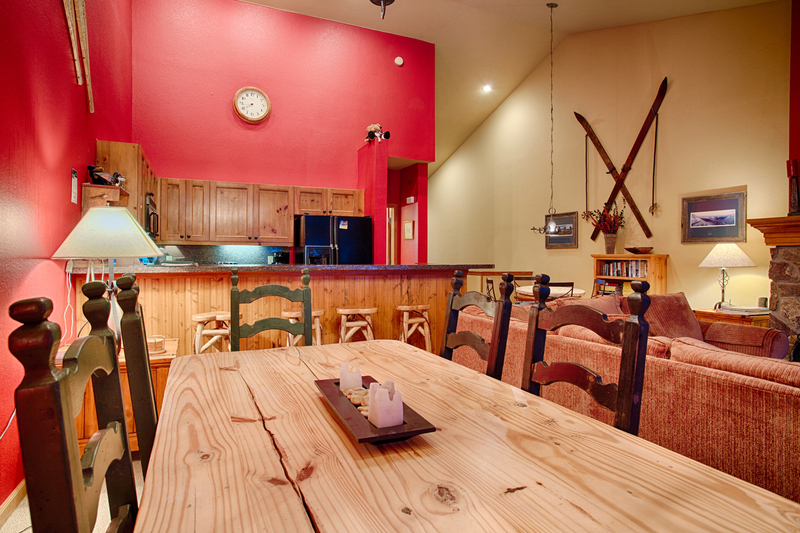 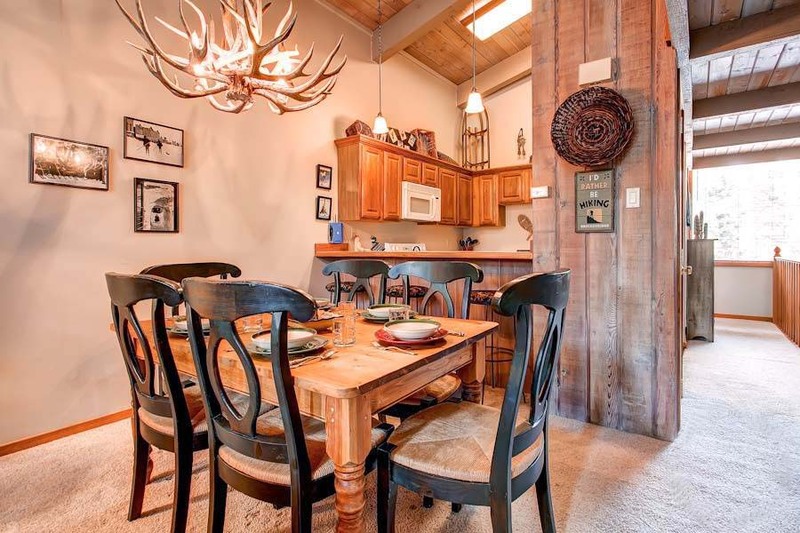 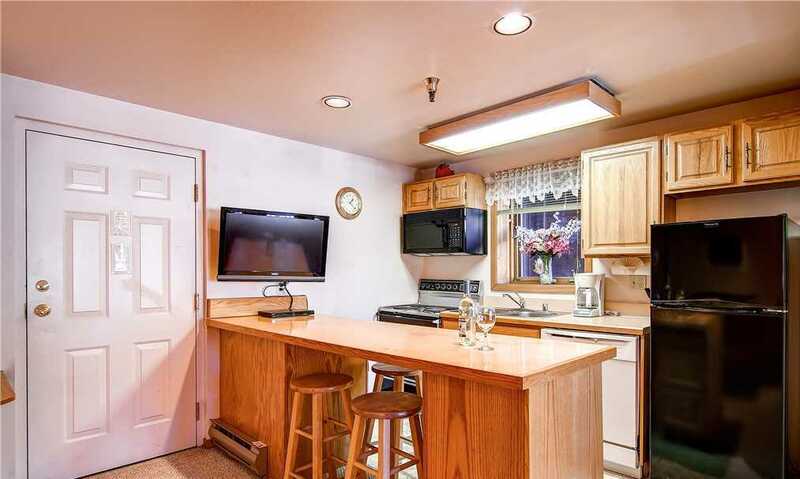 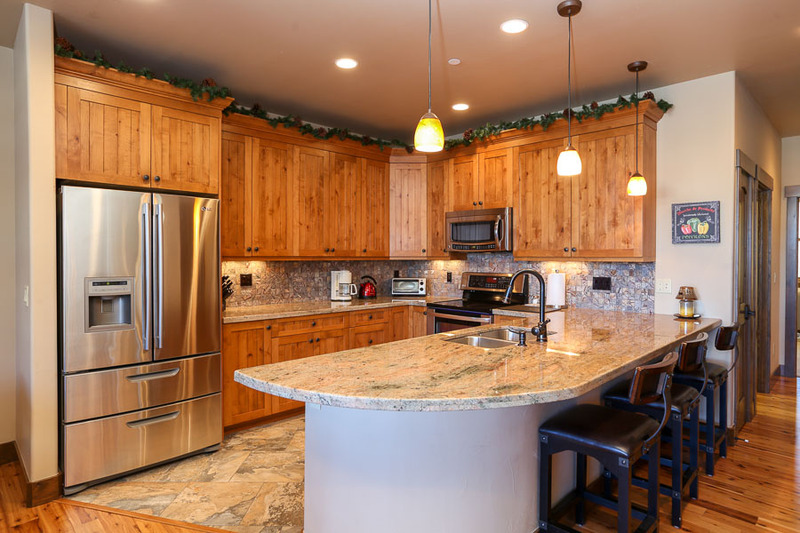 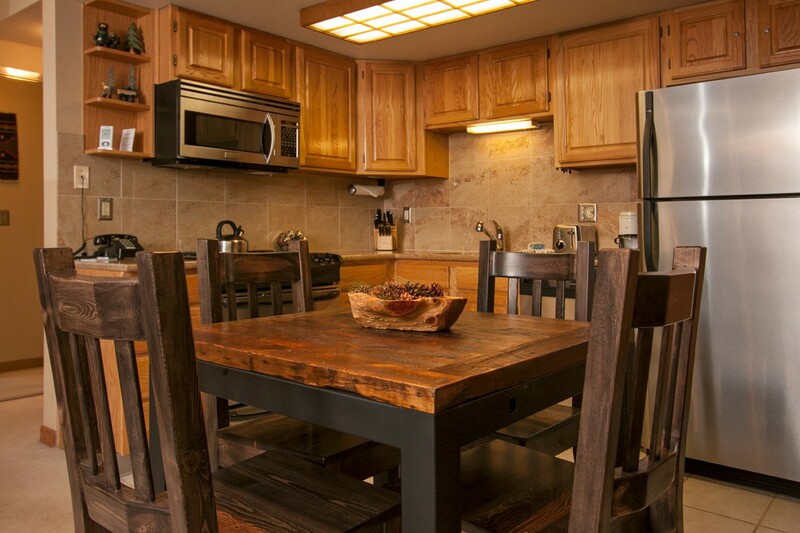 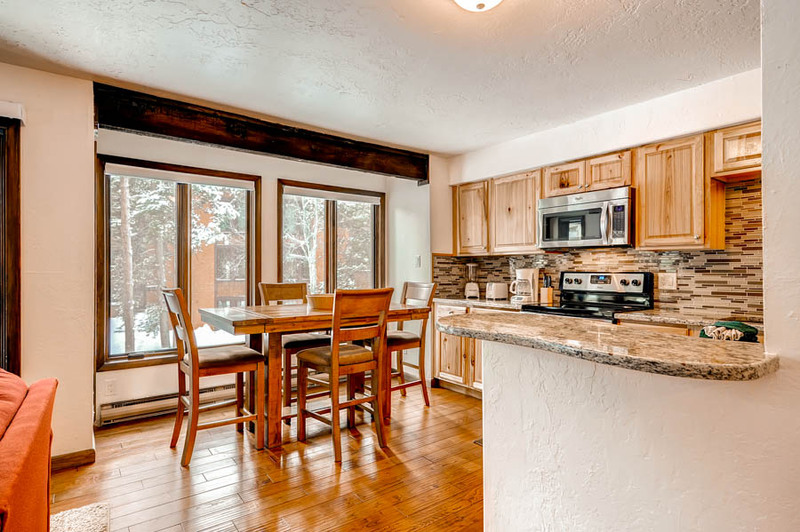 The fully equipped kitchen has everything you need to keep the gang fueled up for the slopes, and plenty of seating: the picnic-style table seats six, and there’s room for five at the counter for breakfast and snacks. 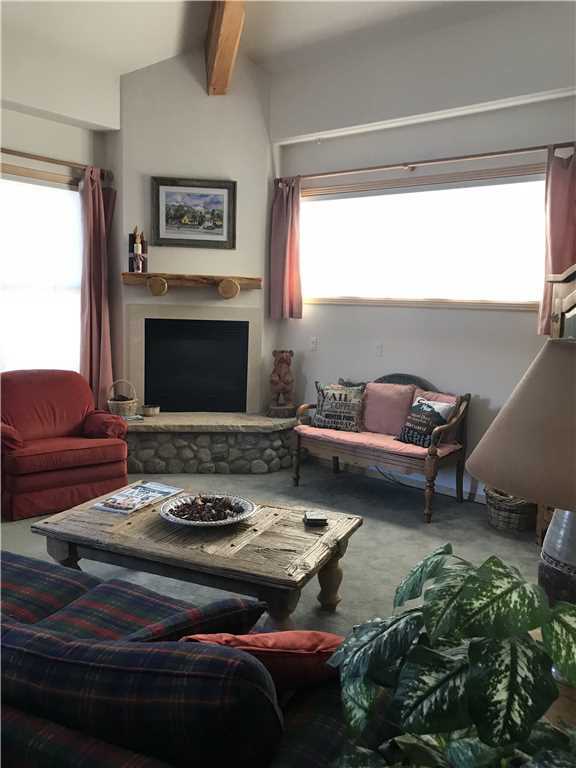 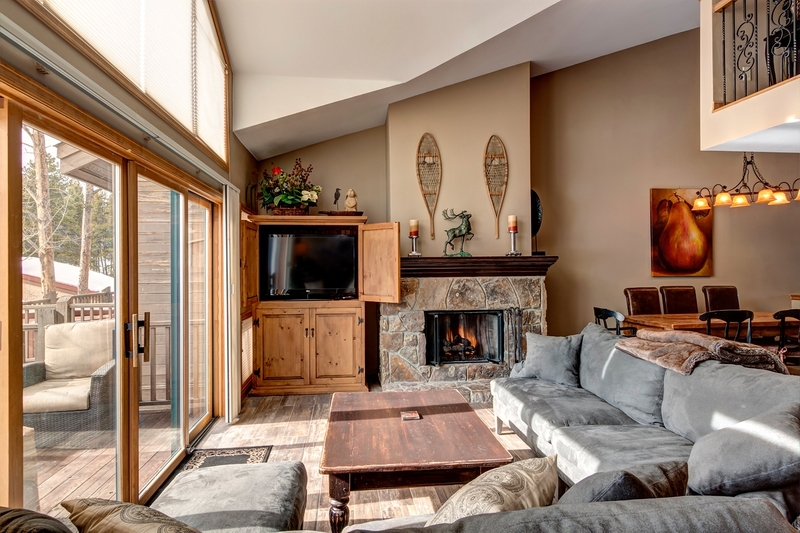 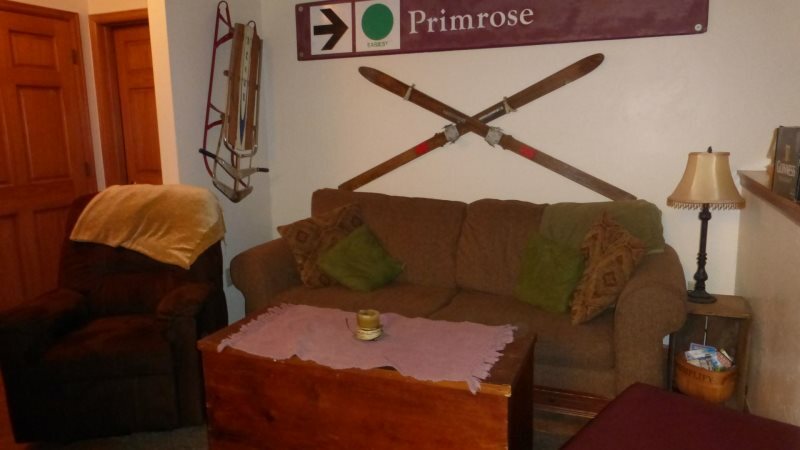 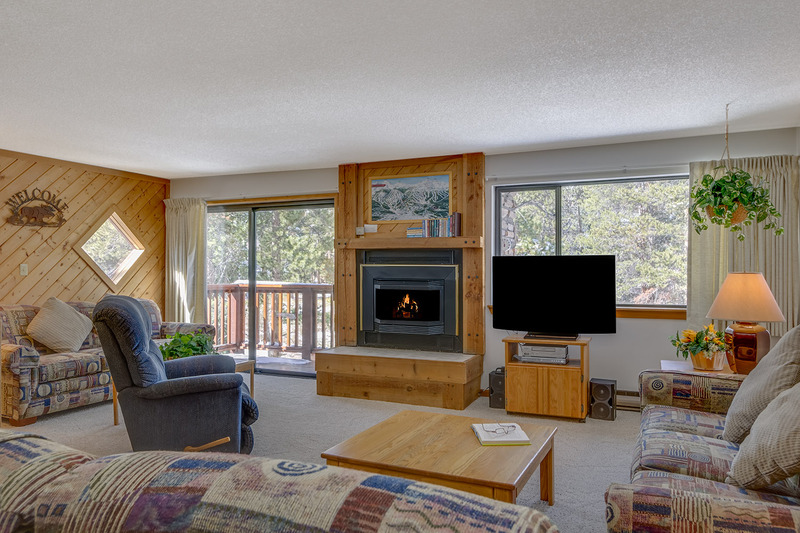 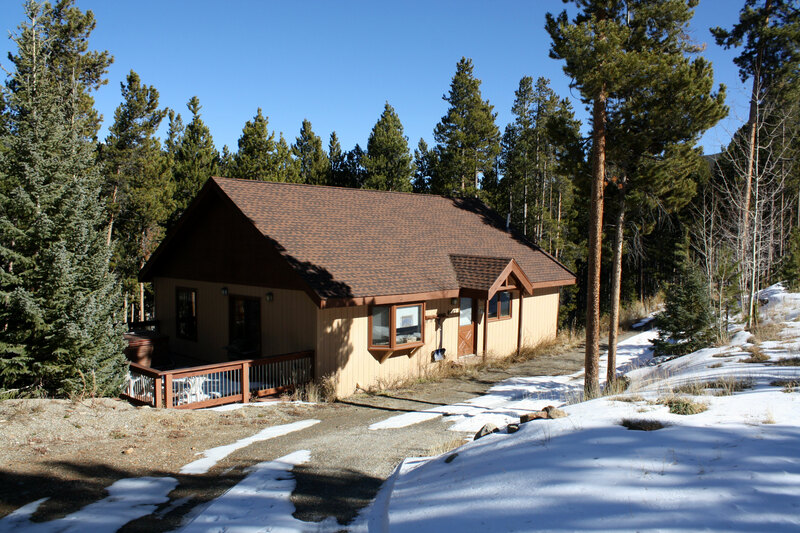 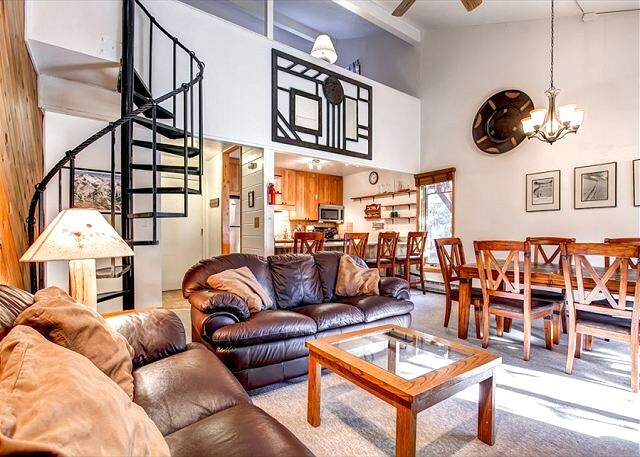 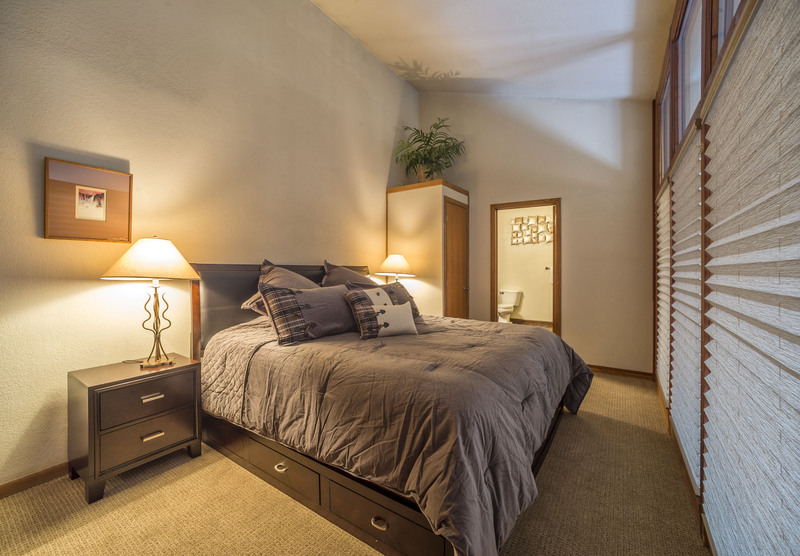 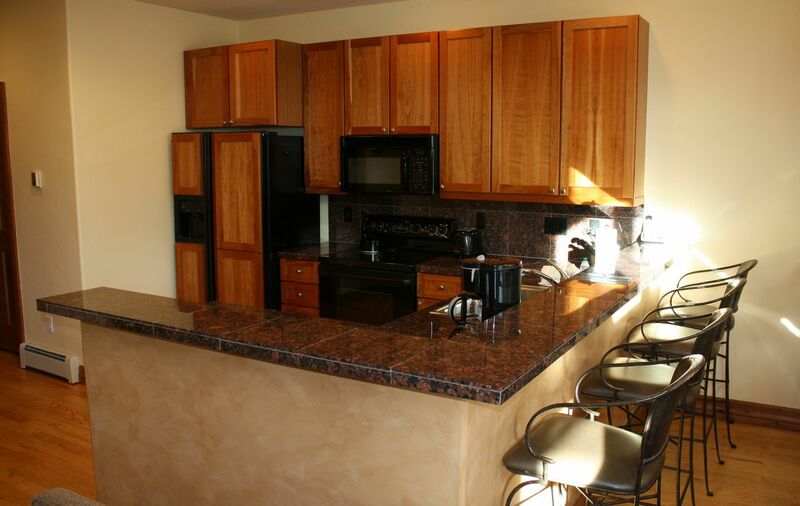 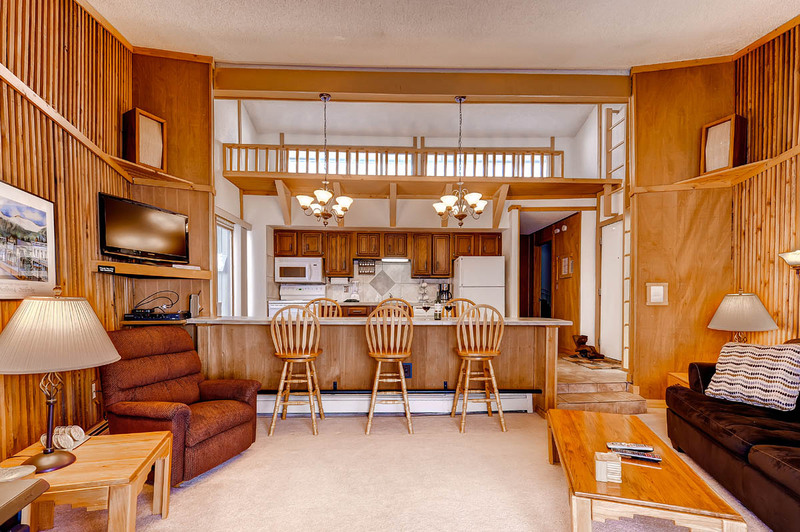 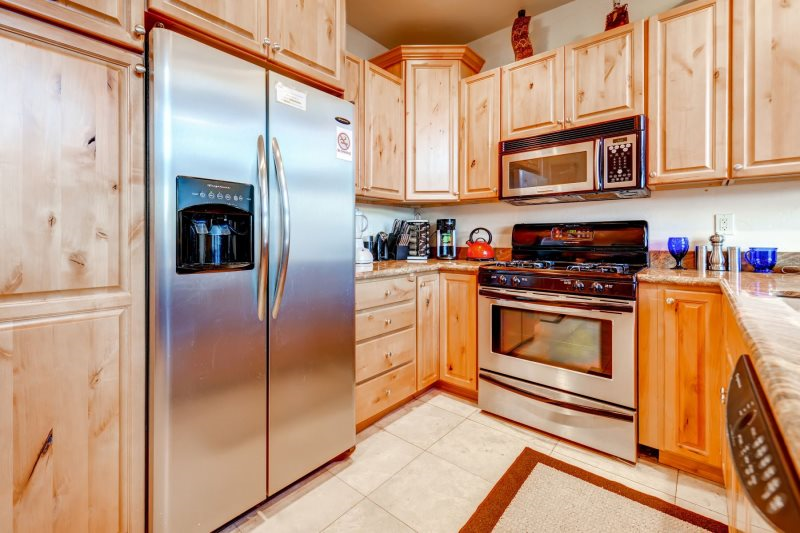 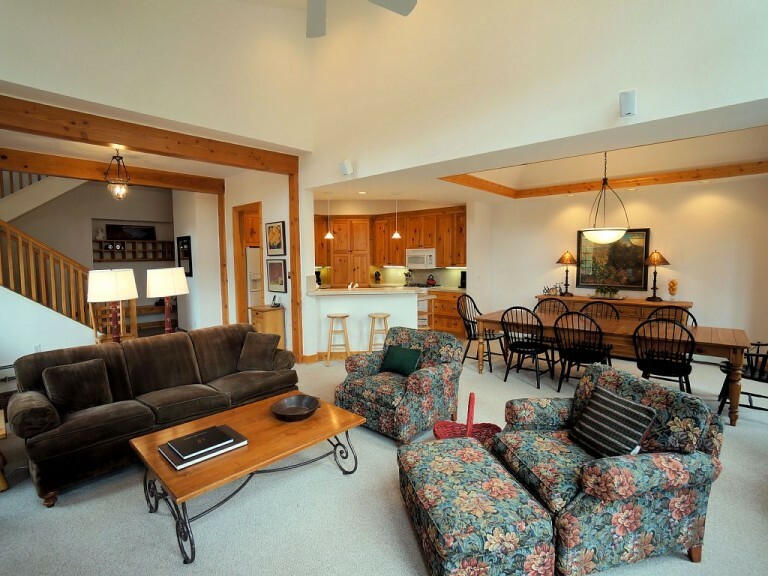 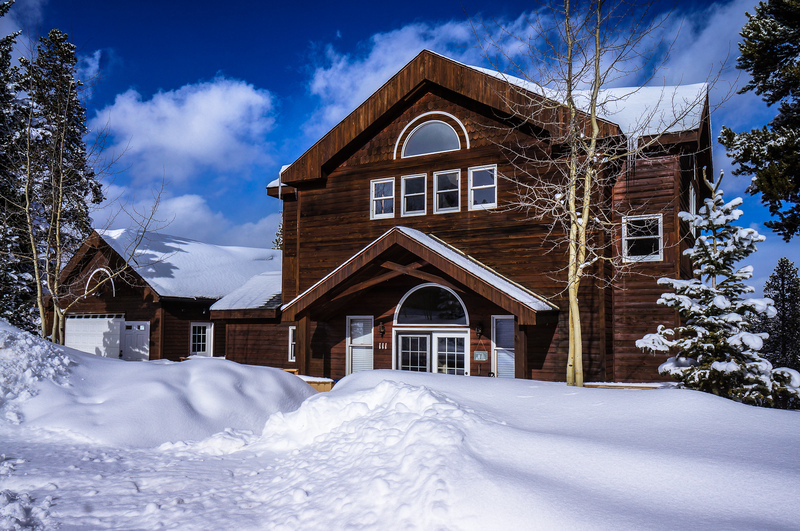 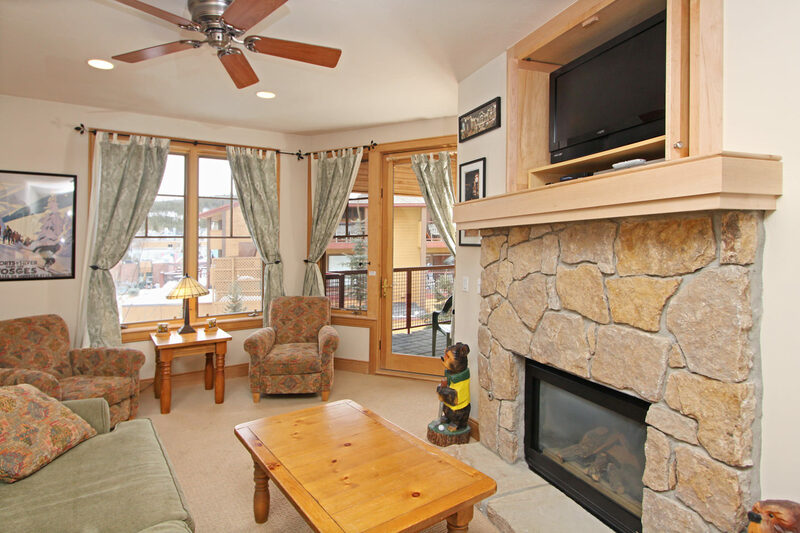 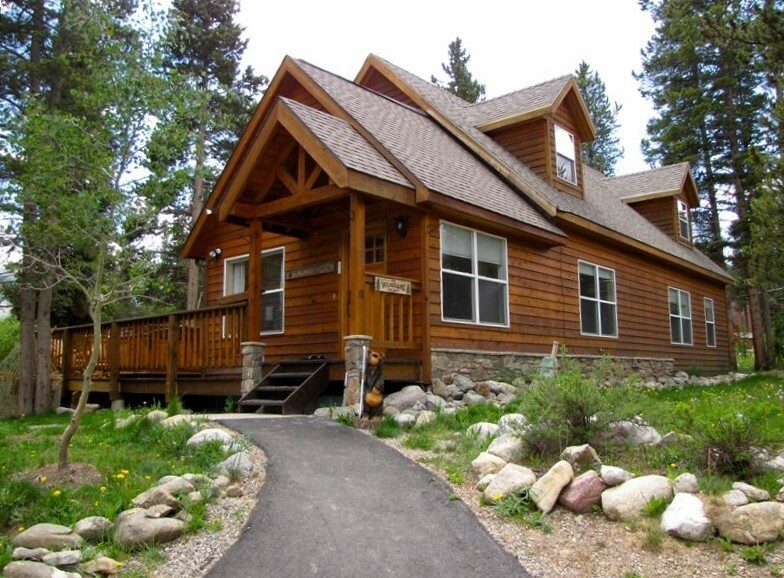 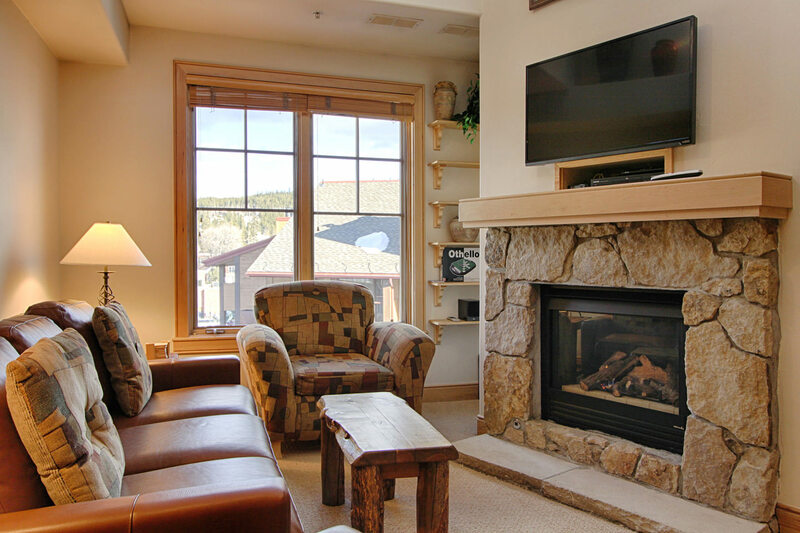 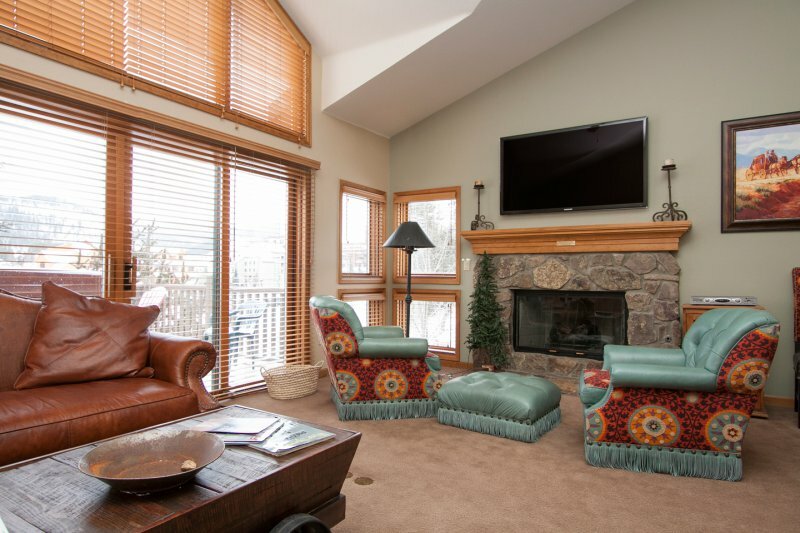 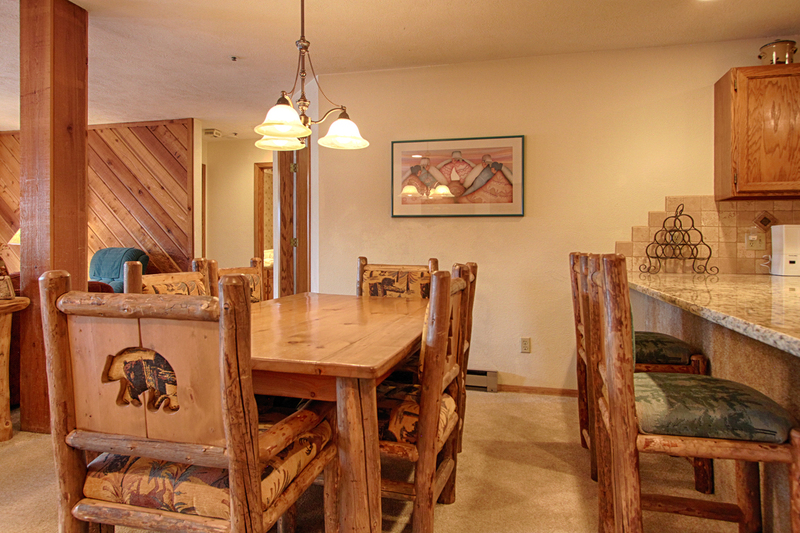 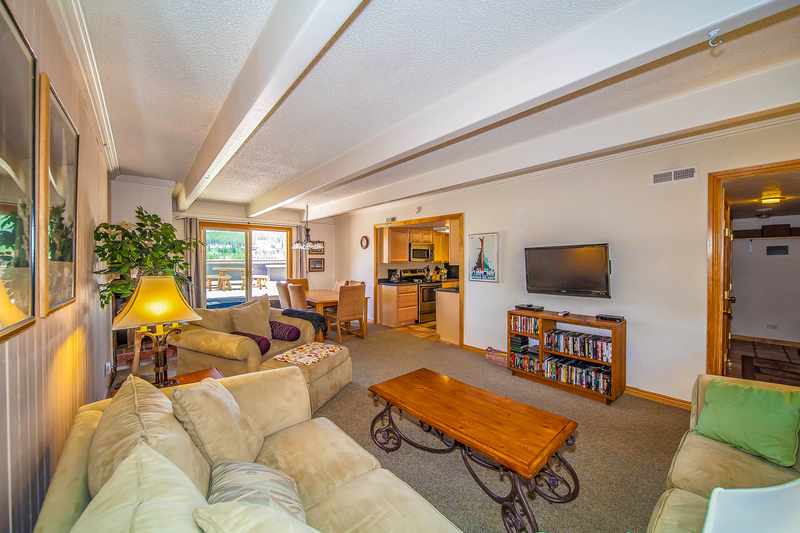 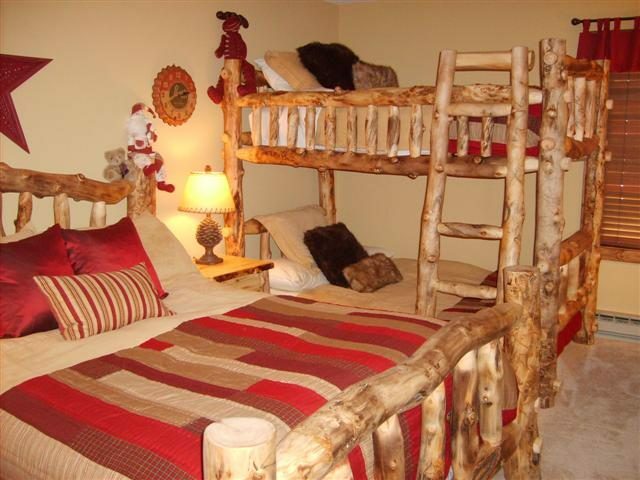 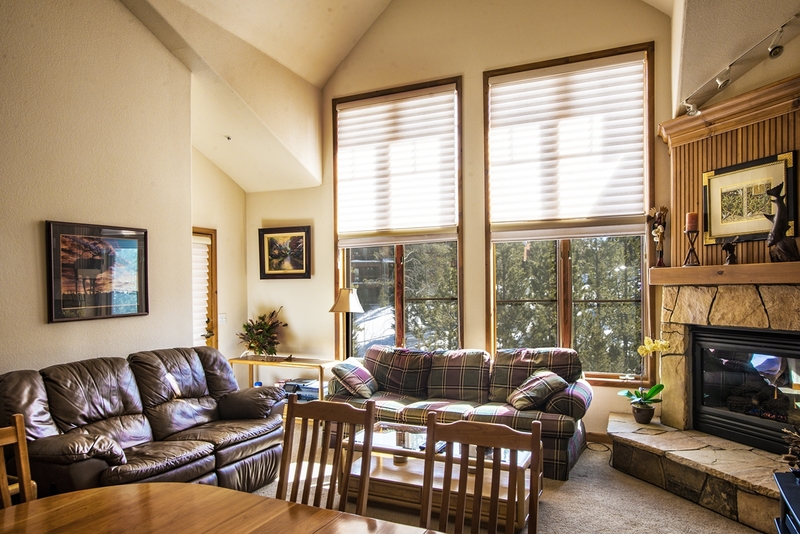 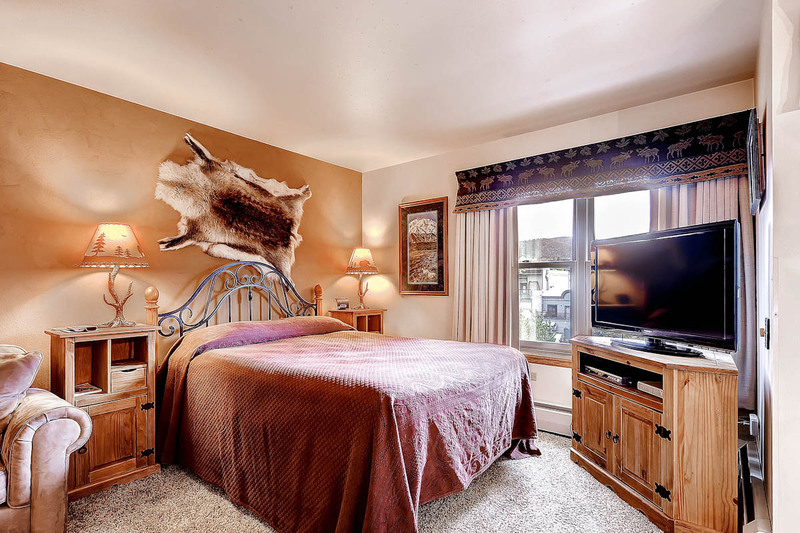 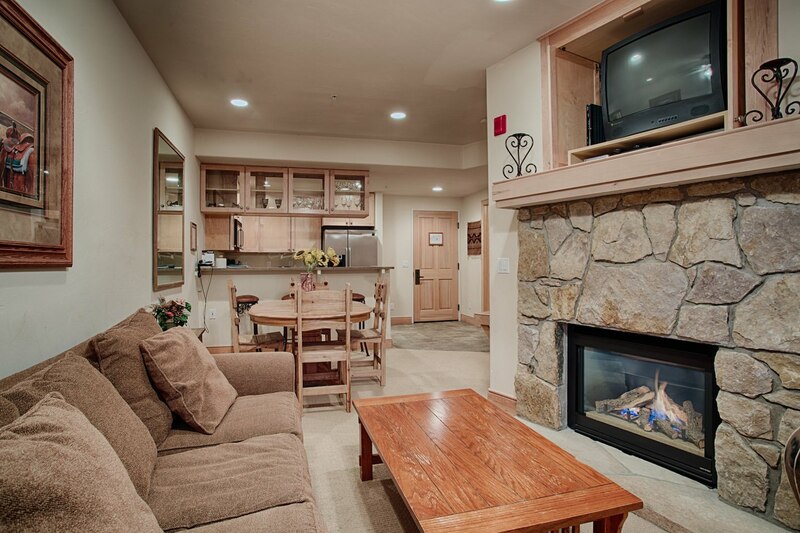 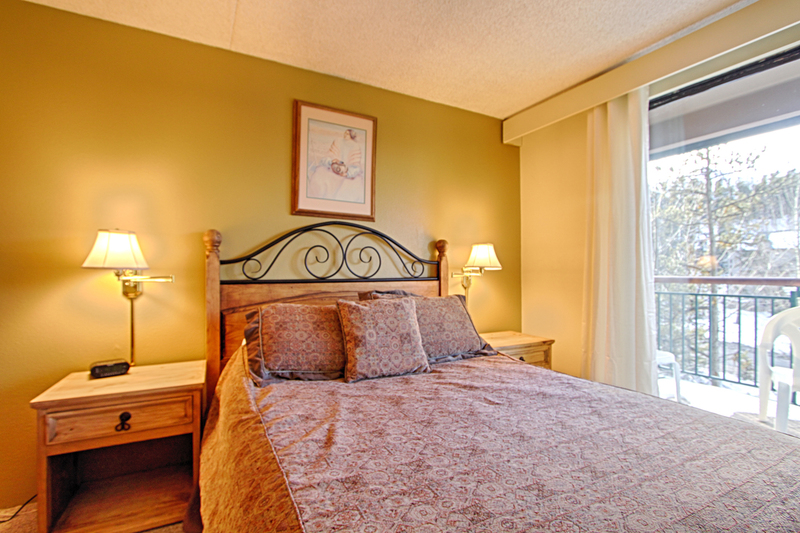 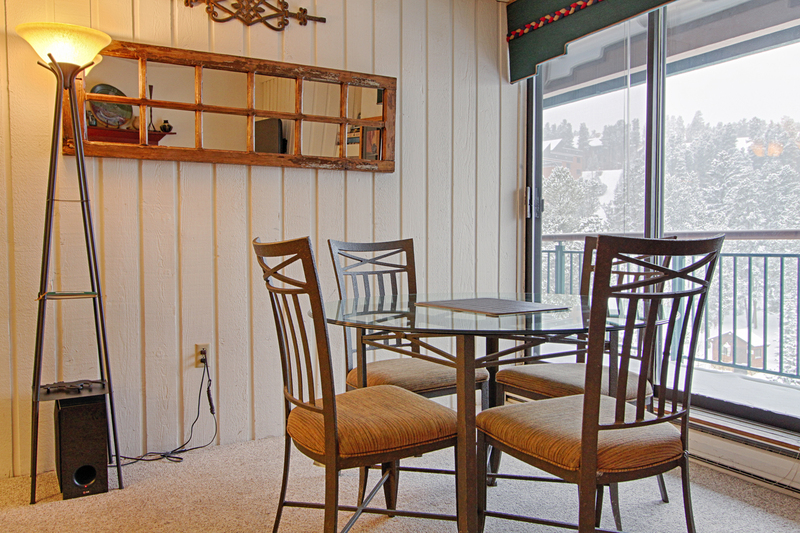 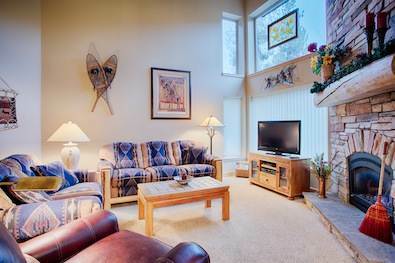 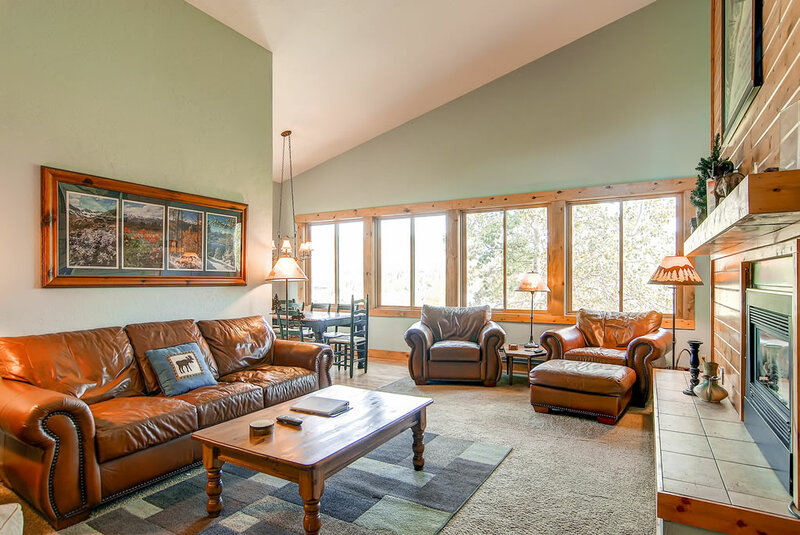 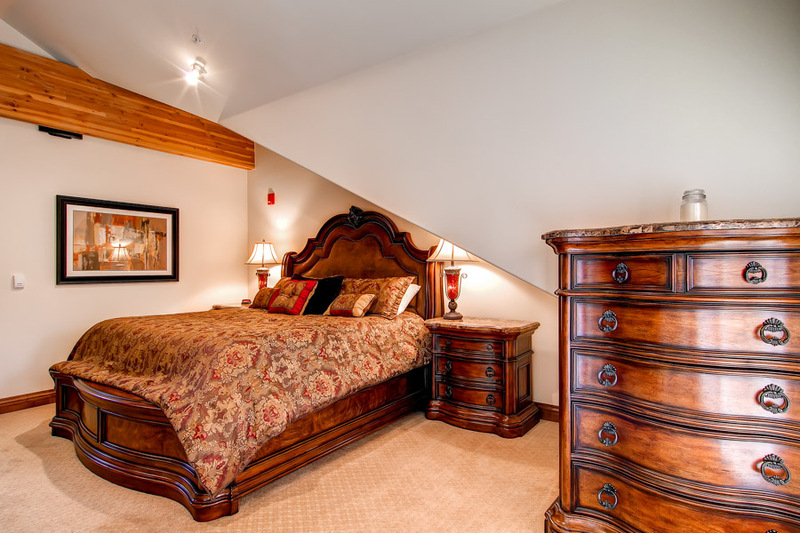 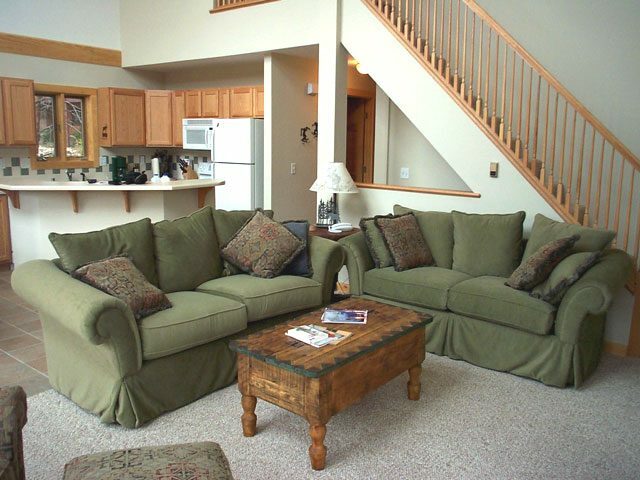 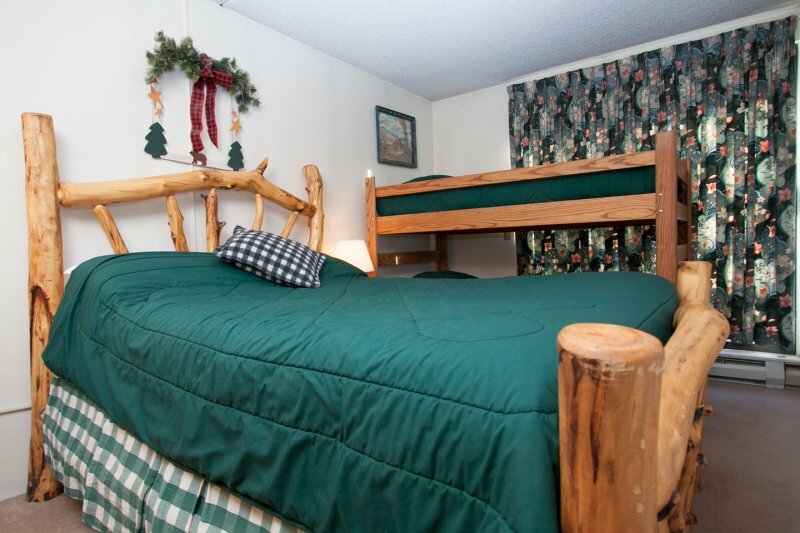 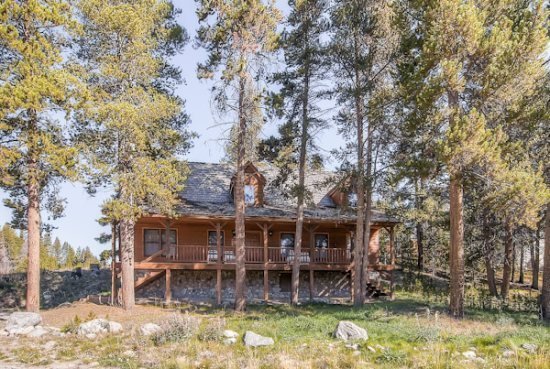 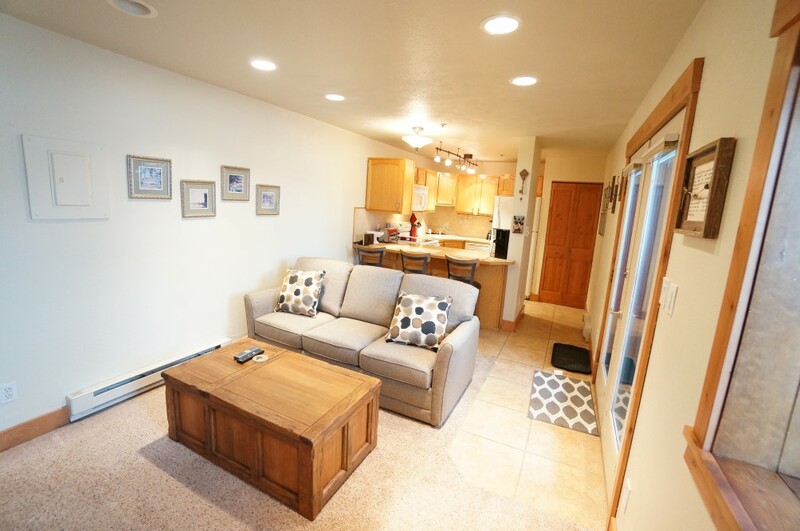 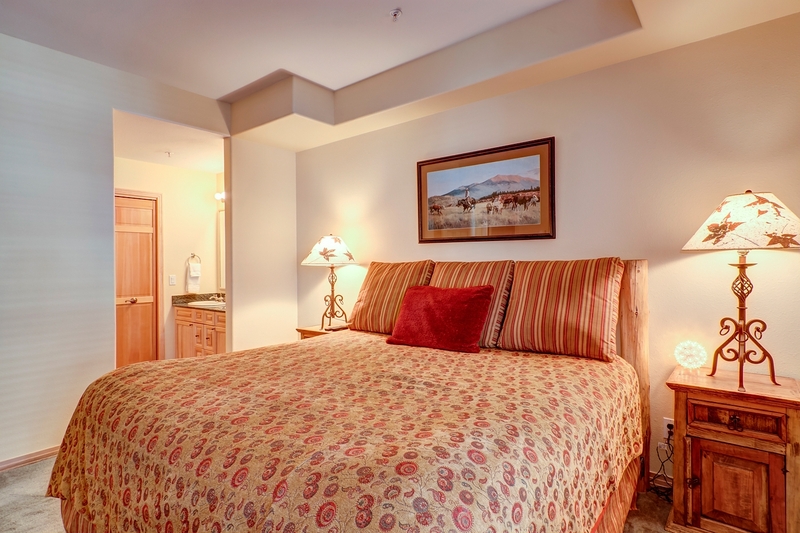 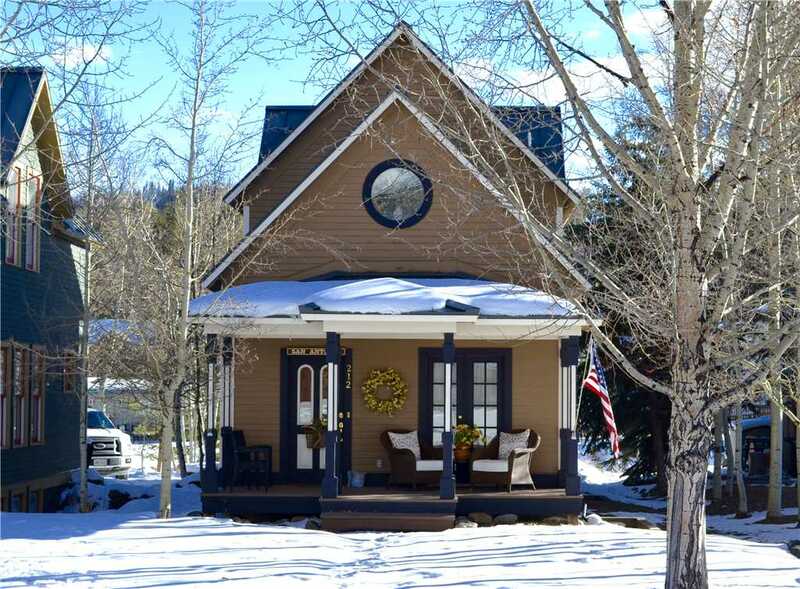 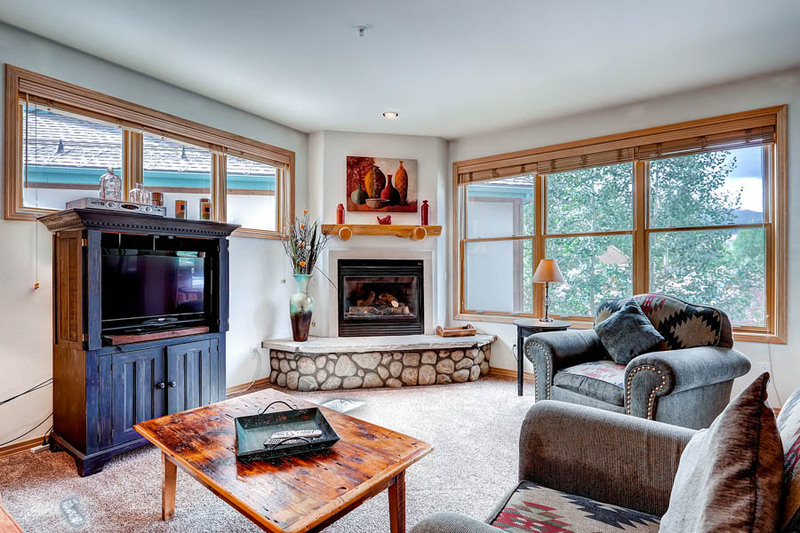 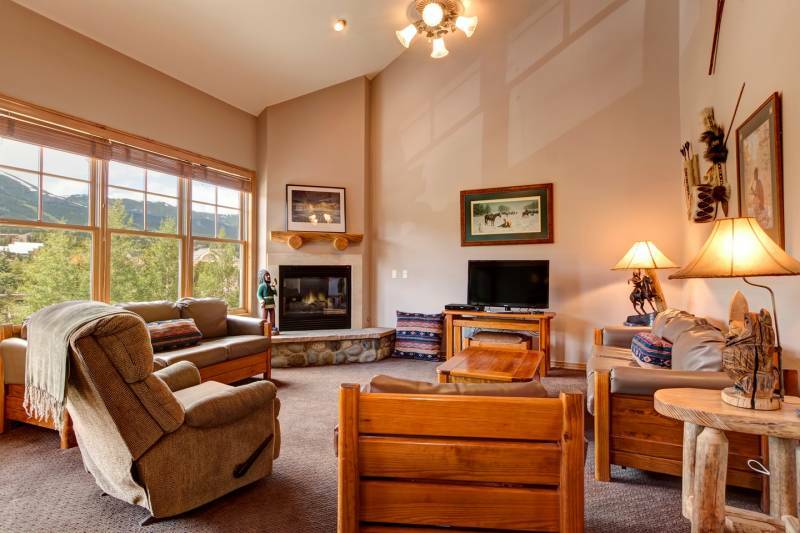 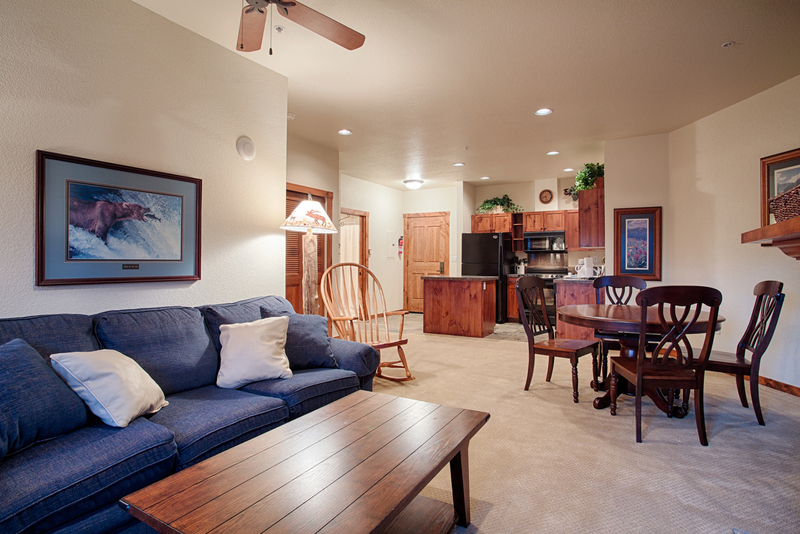 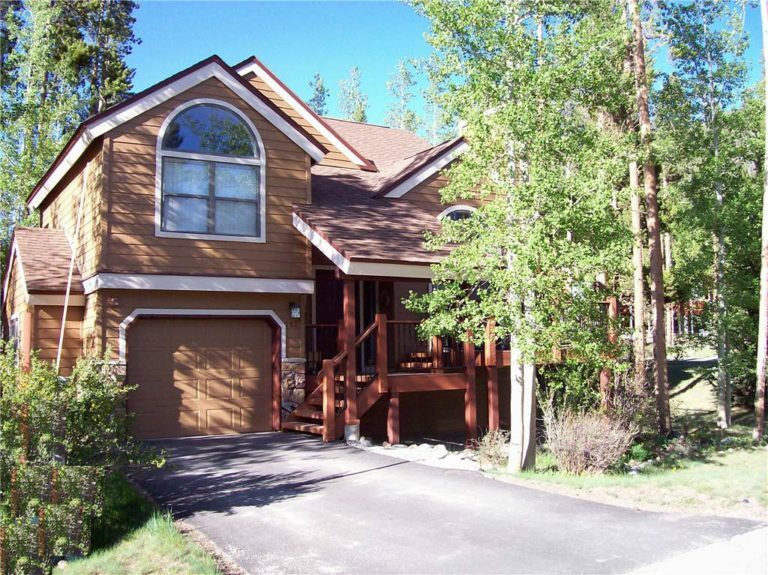 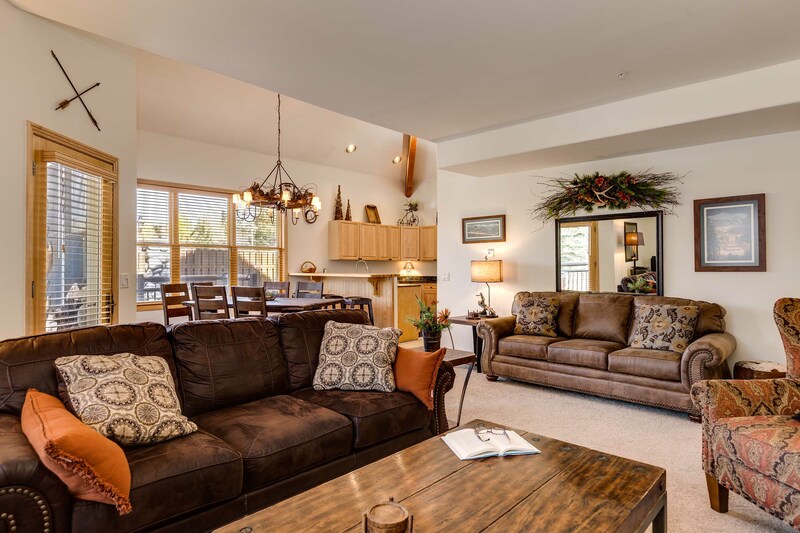 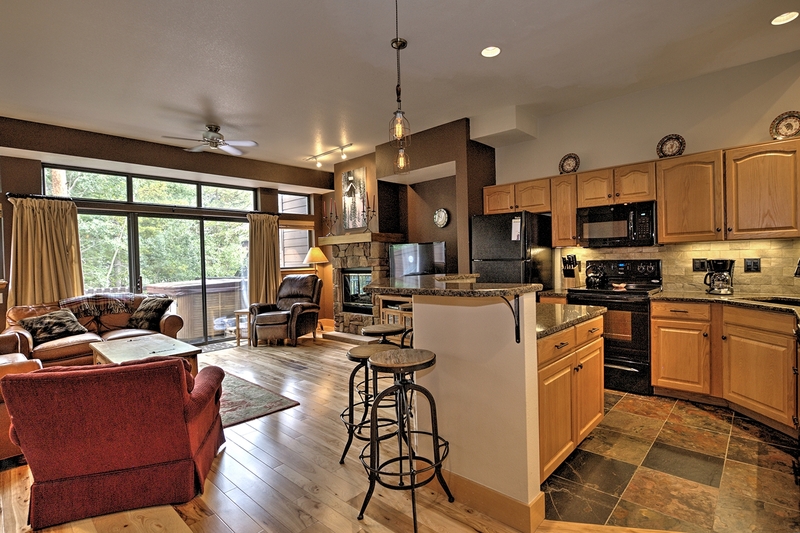 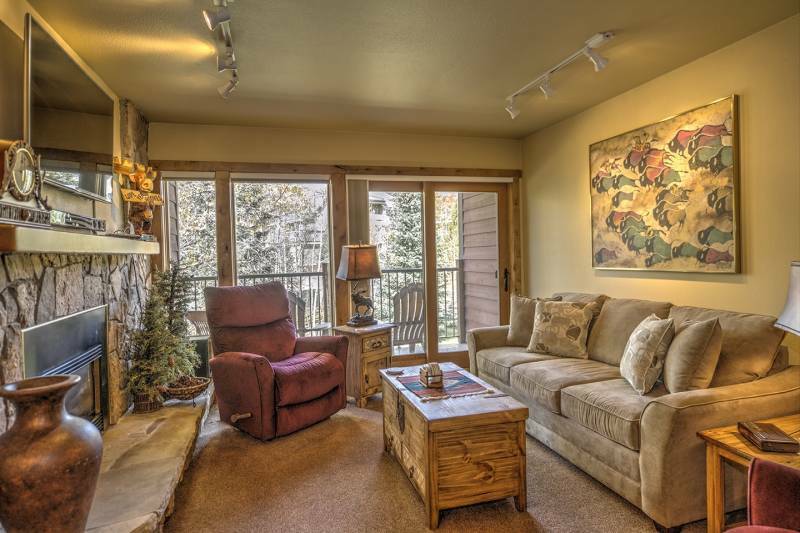 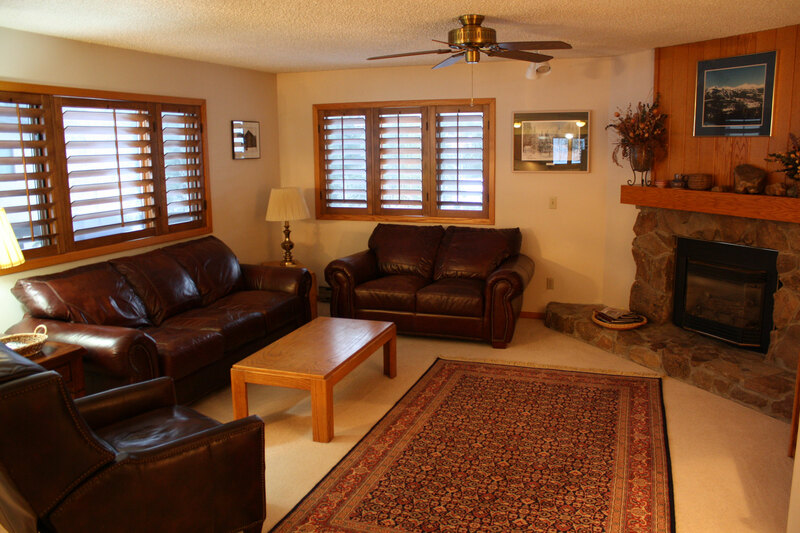 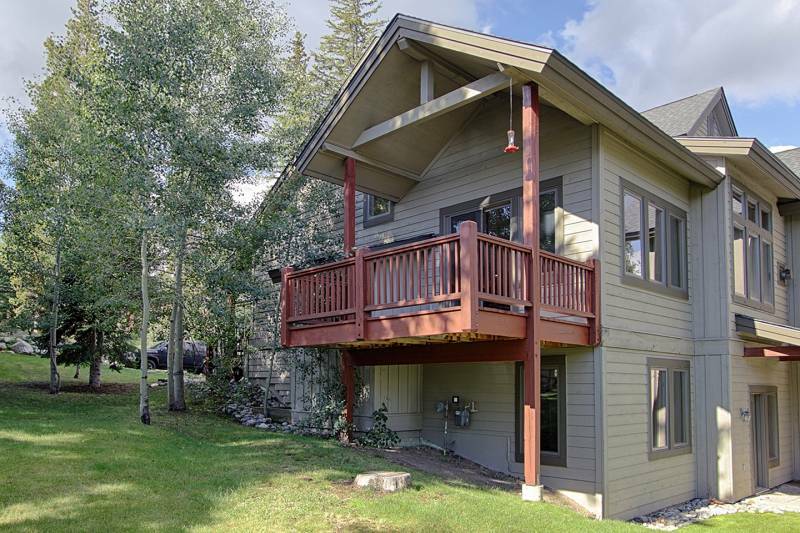 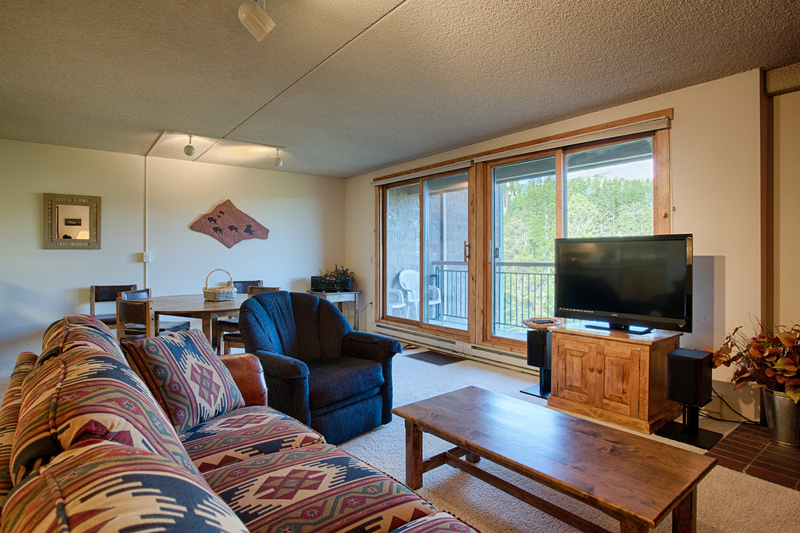 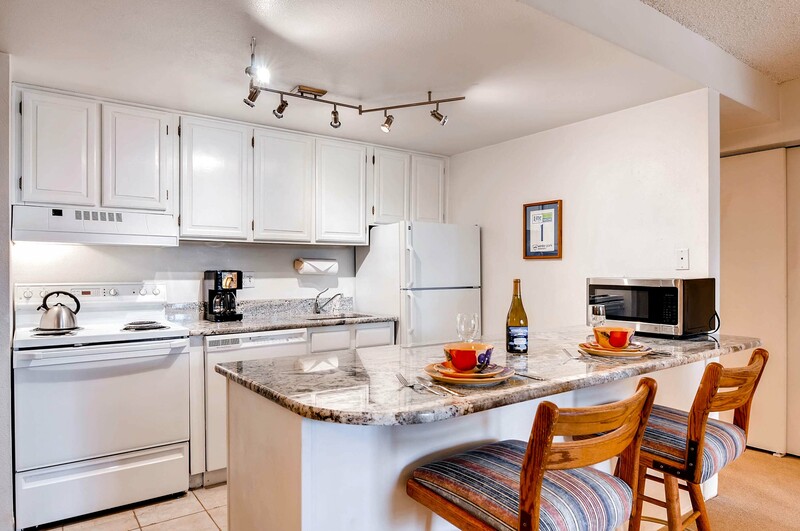 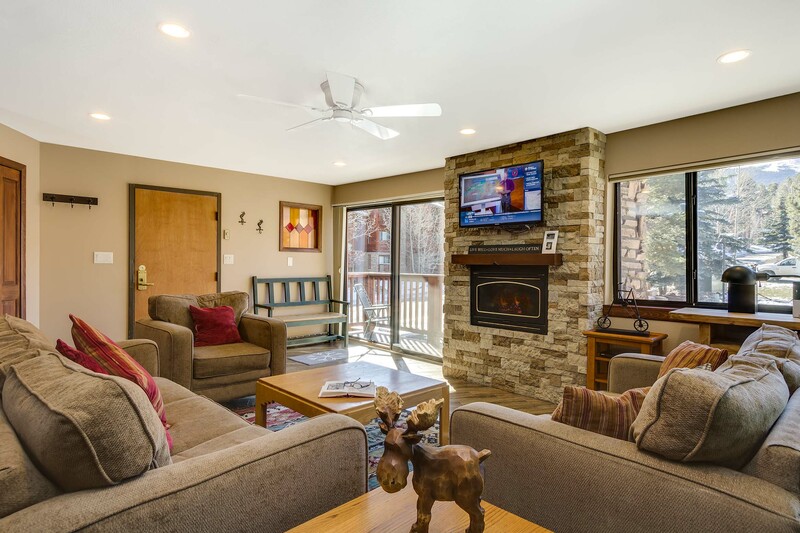 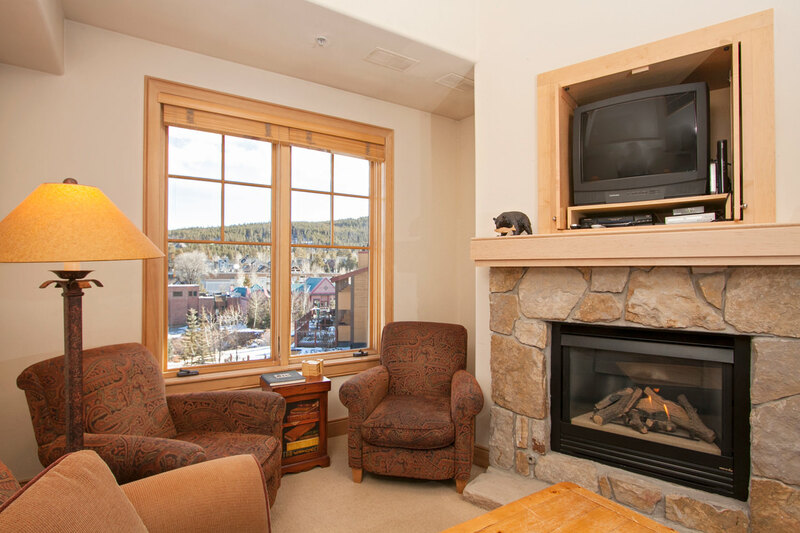 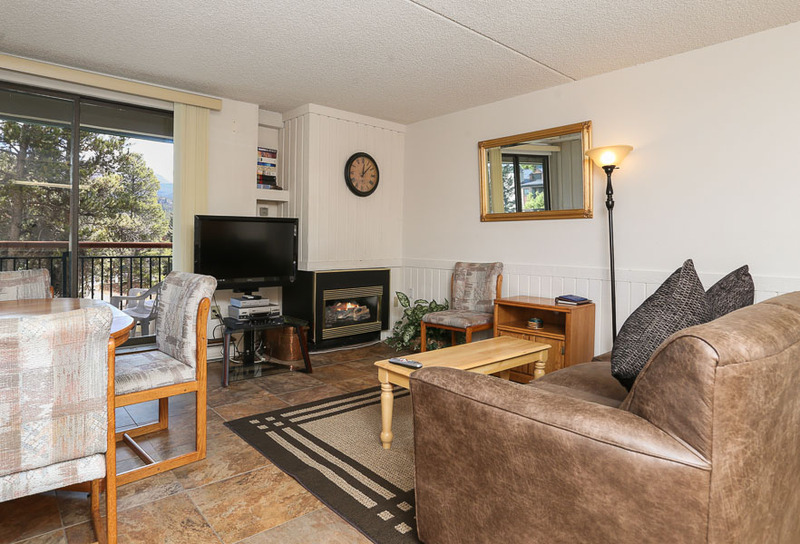 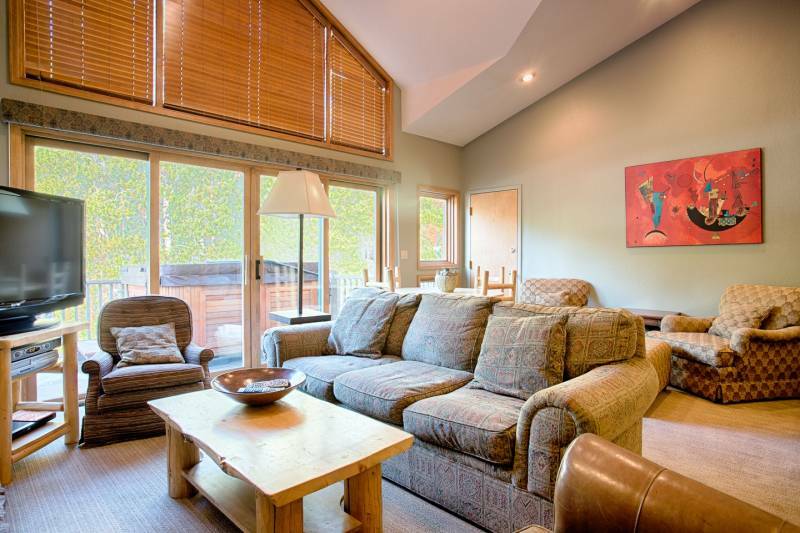 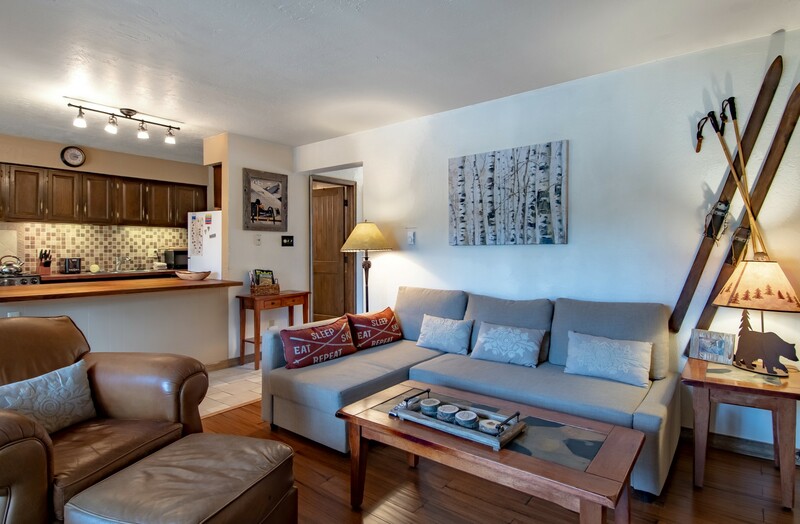 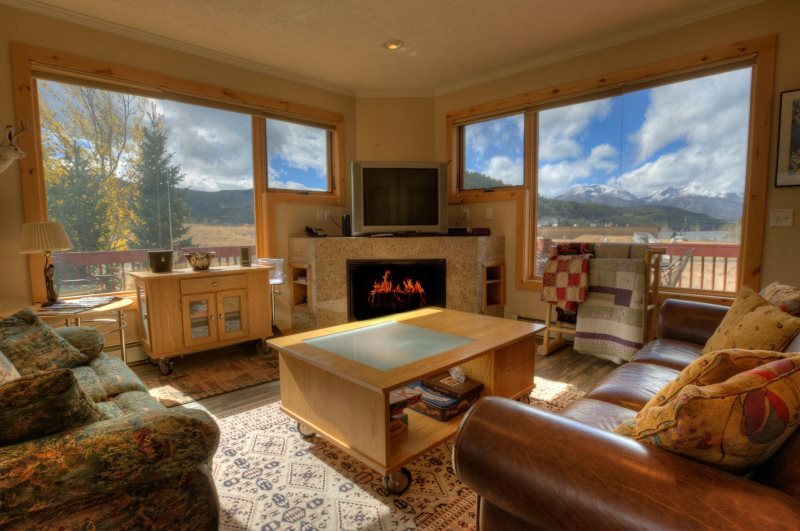 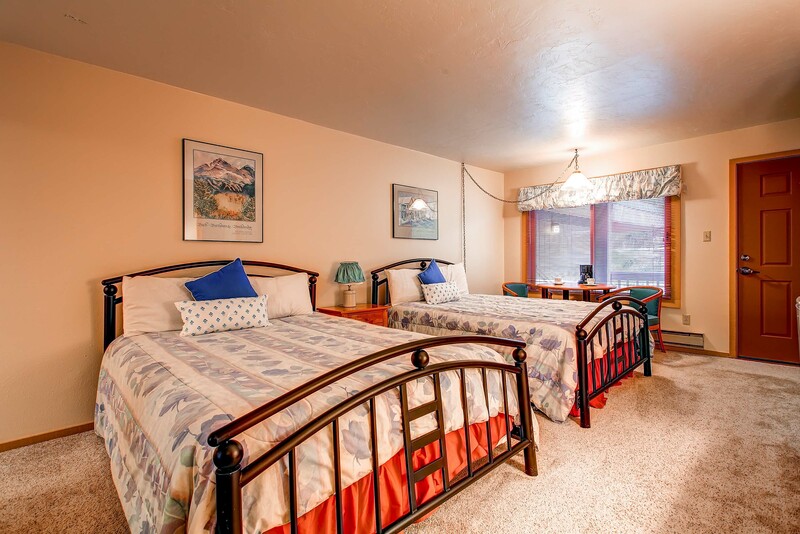 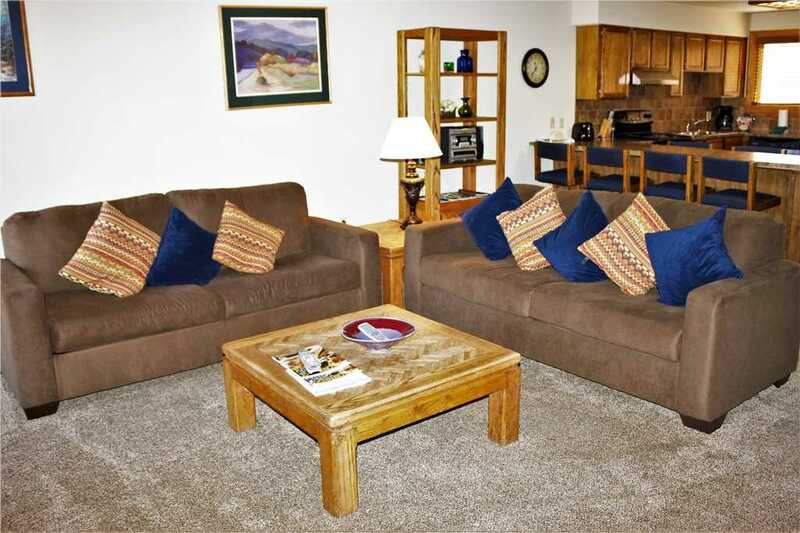 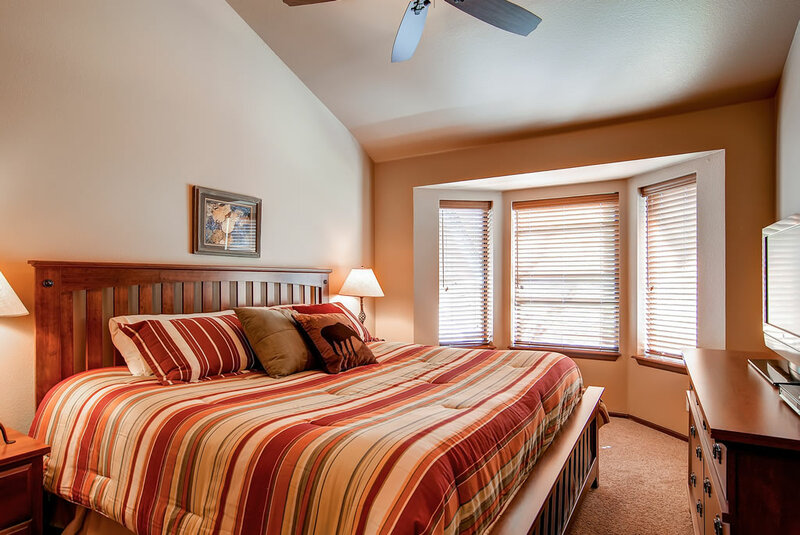 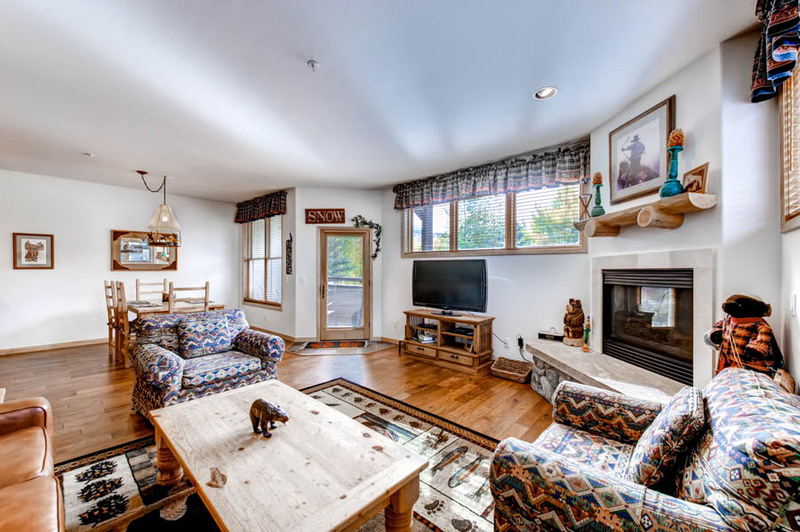 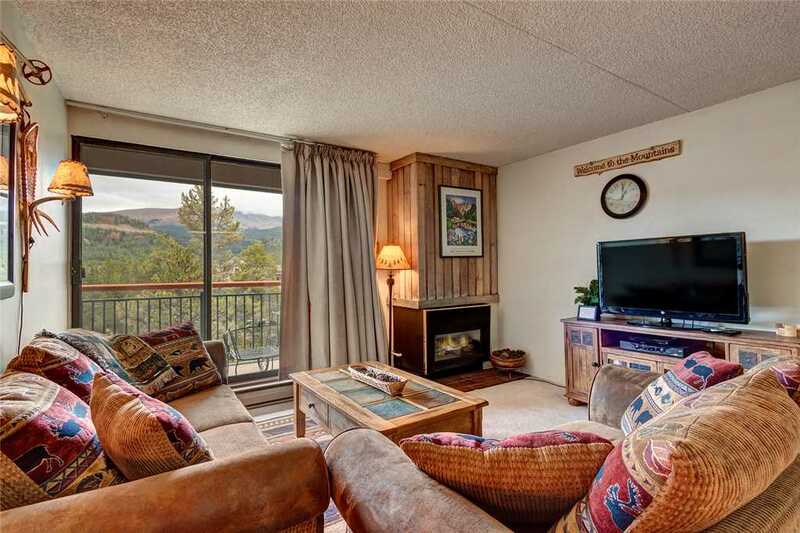 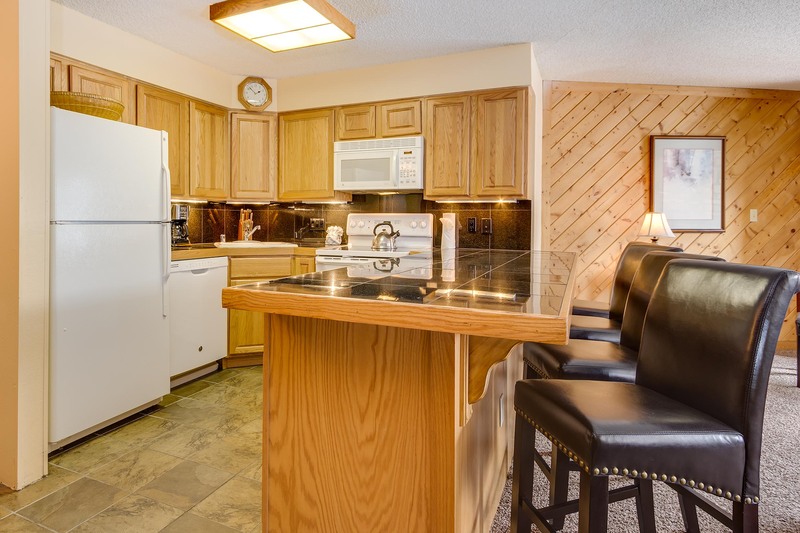 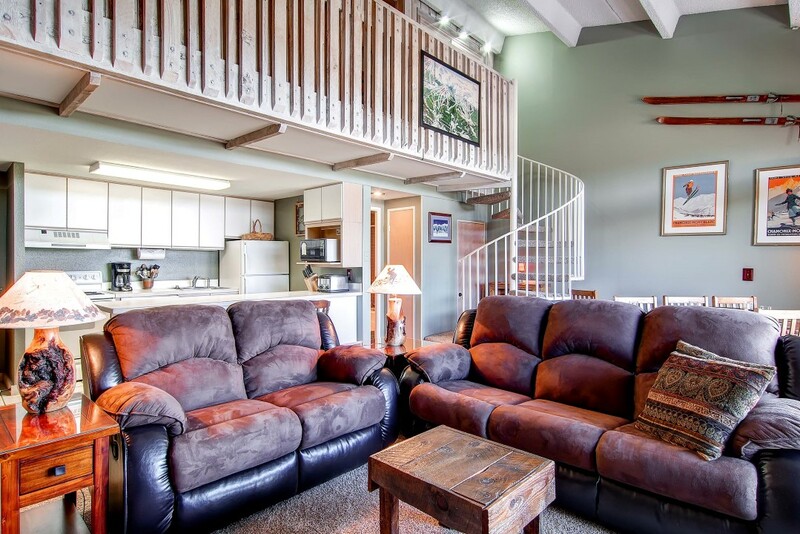 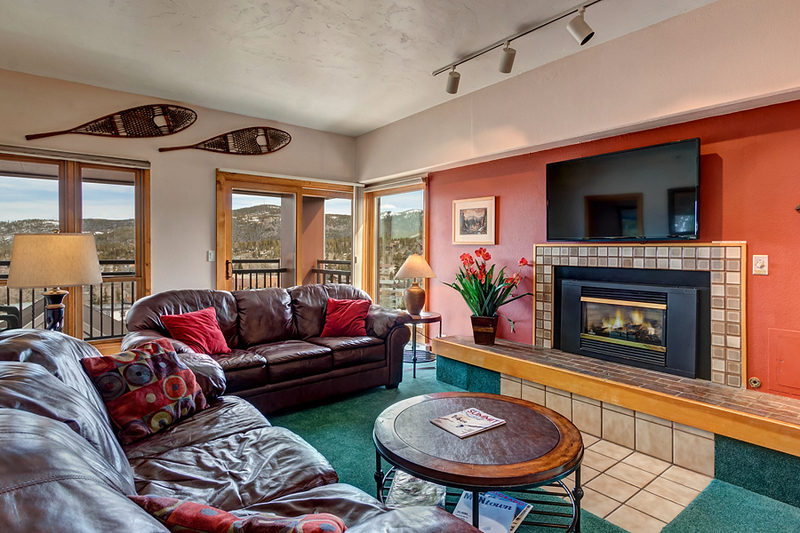 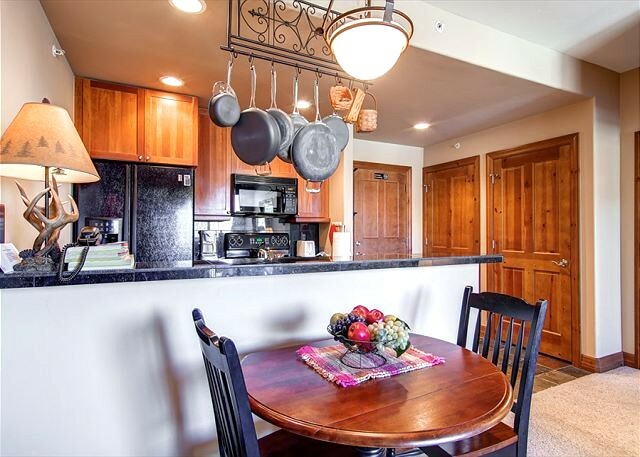 The balcony offers a quiet retreat to enjoy the fresh mountain air Other amenities include complimentary Wi-Fi, central laundry facilities, and parking for two vehicles. 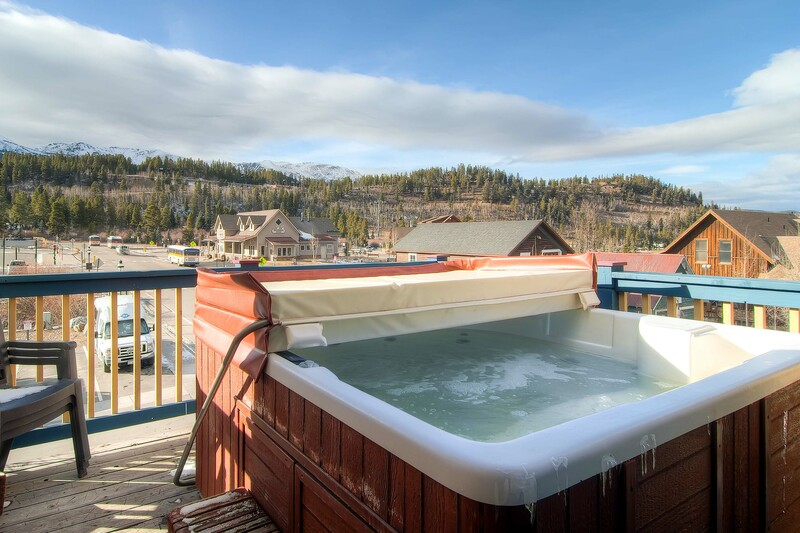 Guests are invited to enjoy the outdoor hot tub on premise and seasonal access to the Upper Village Pool & hot tubs, a short walk away. 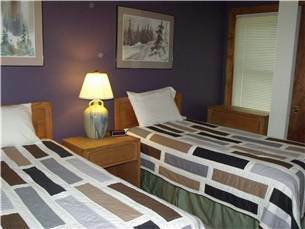 There are central laundry facilities adjacent to the unit. 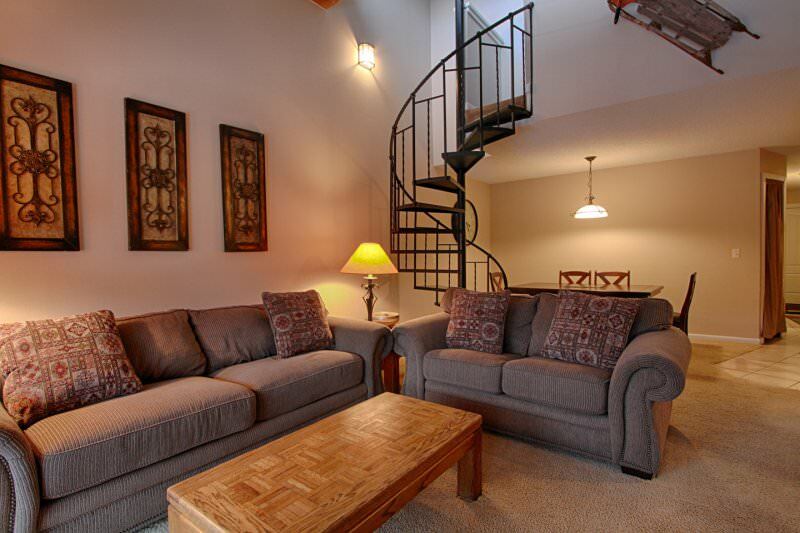 Complimentary WIFI in complex.